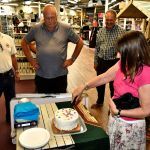 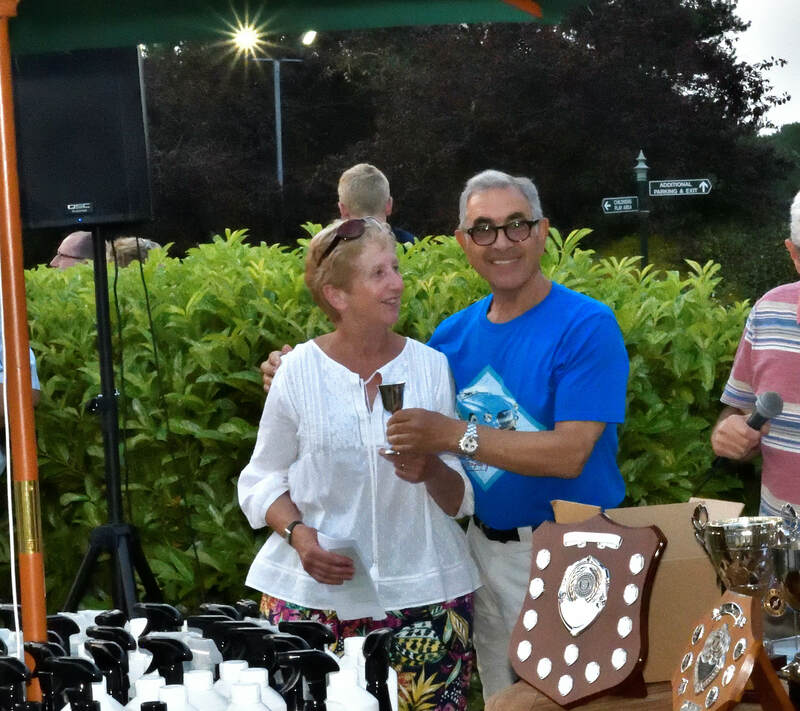 The season is now well underway after celebrating our 25th Club Anniversary. 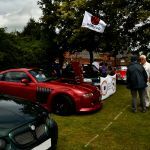 We have a great season planned including new runs and events we intend to attend so check back soon to see what we have been up to and if you want to join our club please see our contact us page. 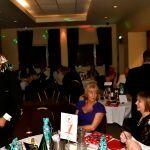 Also please feel free to check out last years event photos page. 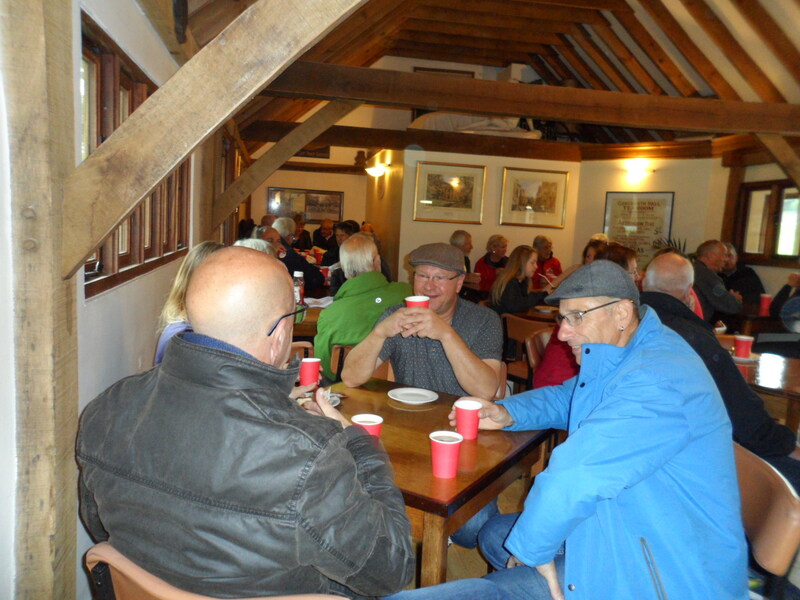 On Saturday 11th March 2017 we celebrated our 25th Anniversary with a race night and hog roast at the Rode Heath Village Hall. 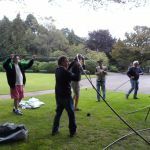 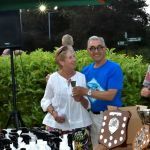 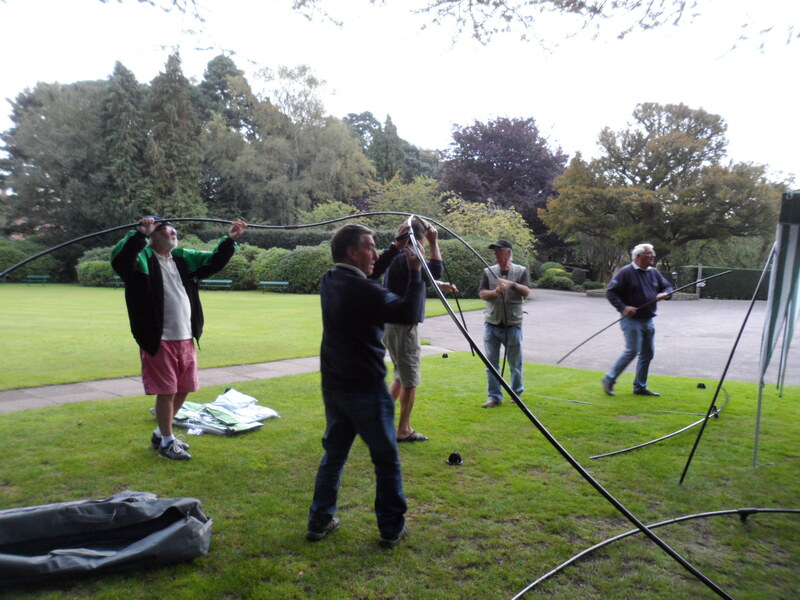 It was a great night, with lots of fun and `competitive spirits !` and there was certainly no shortage on the hog roast. 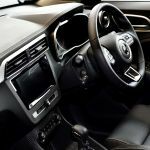 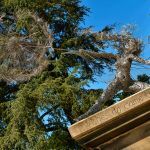 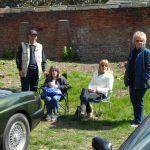 If the support is there perhaps run one again in 2018 – early in the year as a get together. 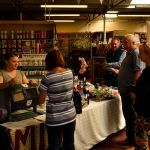 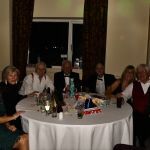 Overall on the evening we made a clear profit of £237, which goes into the Charity fund. 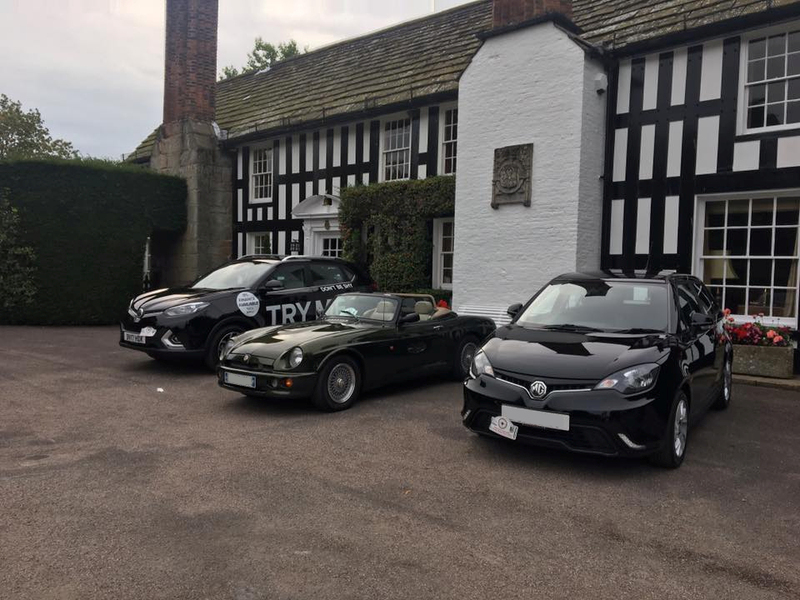 We had a great Sunday run out on a new course planned and organised by Ray and Jenny, we had a nice drive out into Wales with a breakfast stop at Rhug Café and Shop followed by the Evo Run, which most people did two laps of. 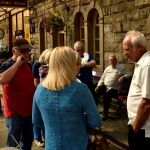 After meeting up afterwards we then had a pub Sunday dinner on the way home. 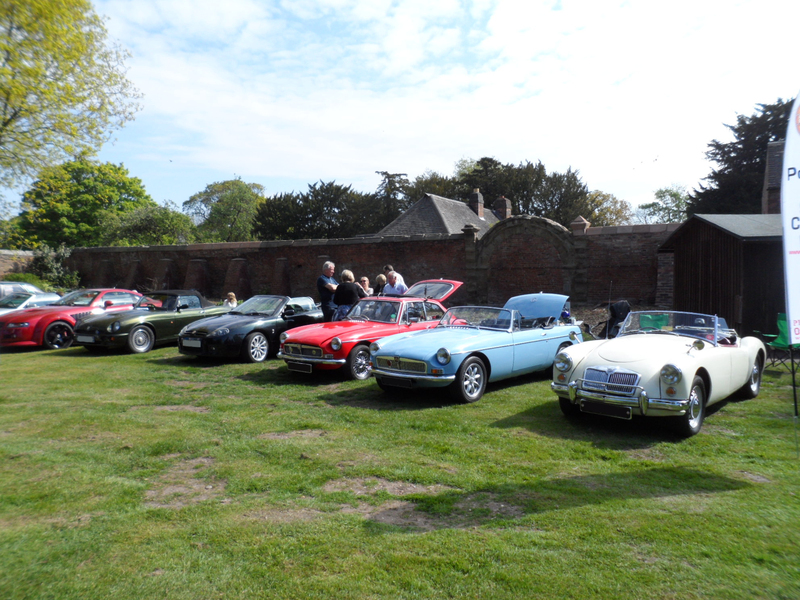 It was a bright but chilly day, however it remained dry so it was top down for the more adventurous of us ! 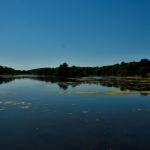 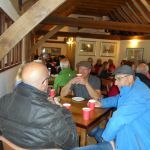 – scenery on the run was outstanding and it was well attended, numbers being limited only by the eating arrangements. 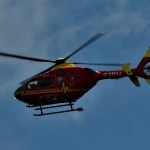 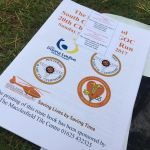 The Air Ambulance is an essential and invaluable emergency service dedicated to saving lives and as a club we donate annually to this good cause as part of our charity events we run. 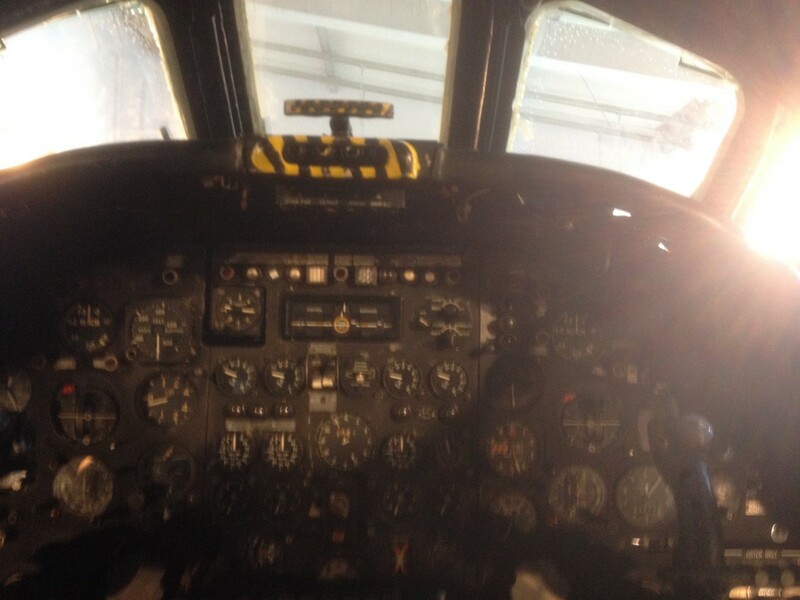 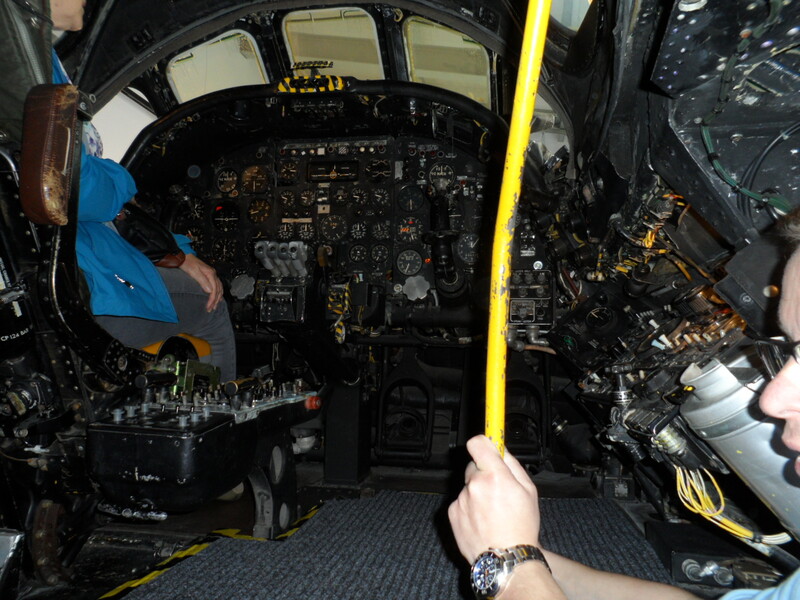 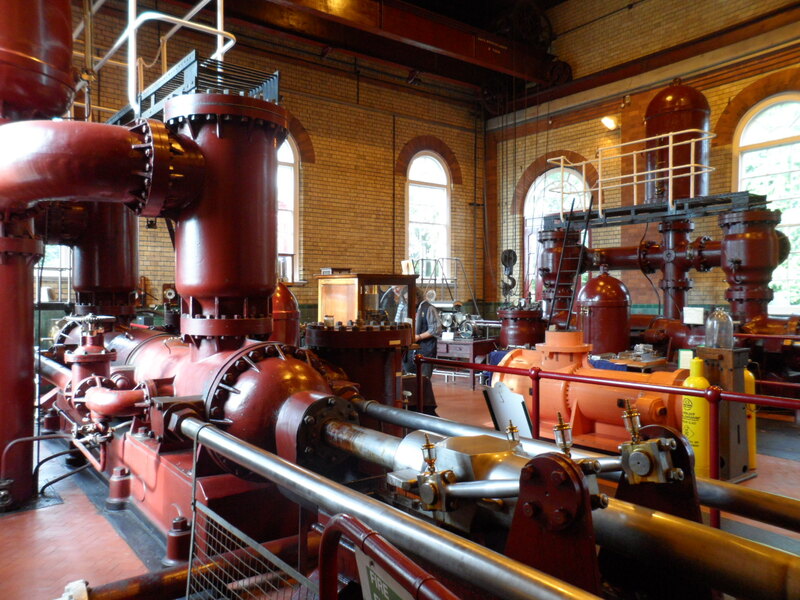 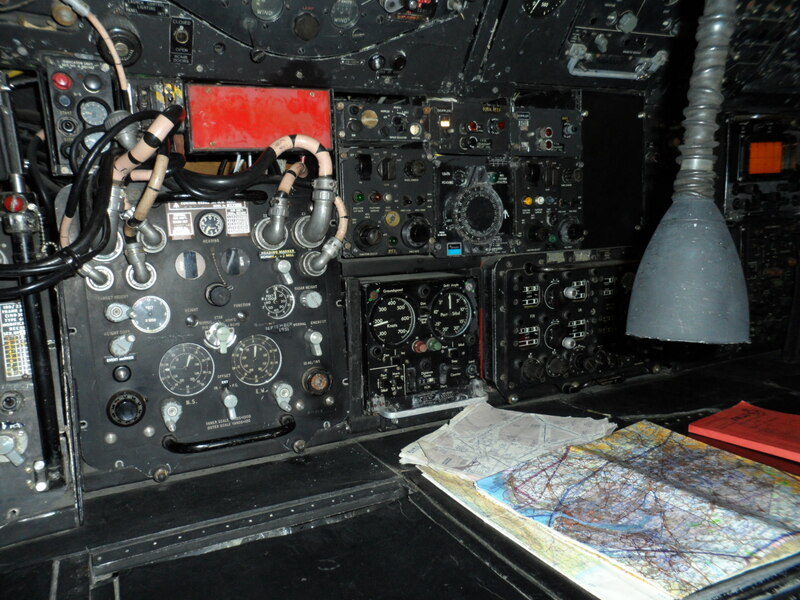 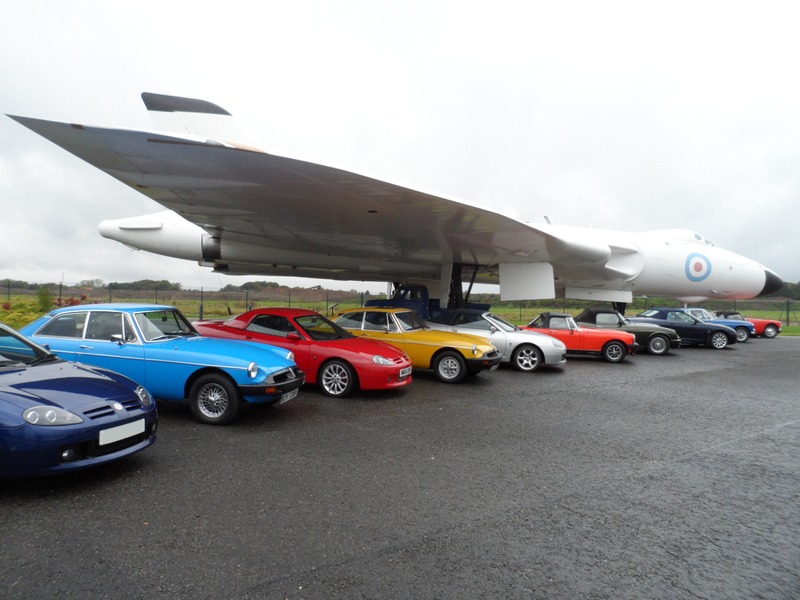 The team made us feel extremely welcome and it was a great and informative day with some great photo opportunities. 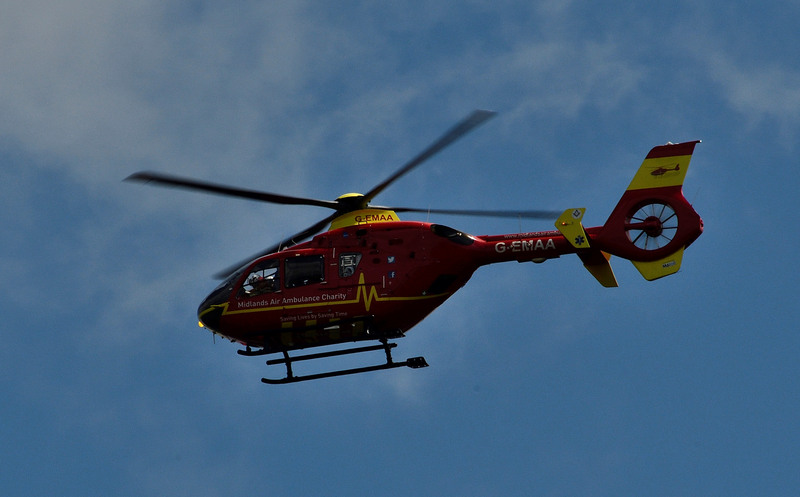 The club would like to thank the entire Air Ambulance team for making us so welcome and sparing the time to make the visit possible. 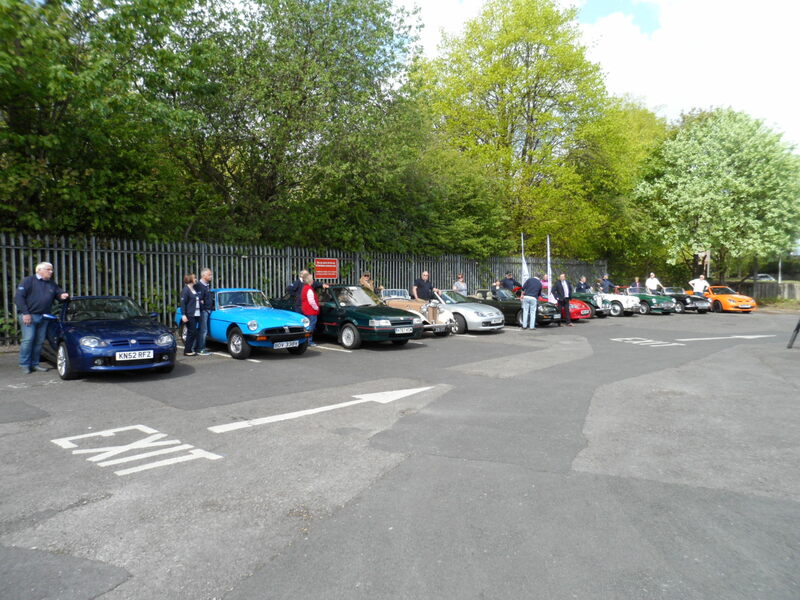 This was the first time the club had attended this event and we turned out in force ! 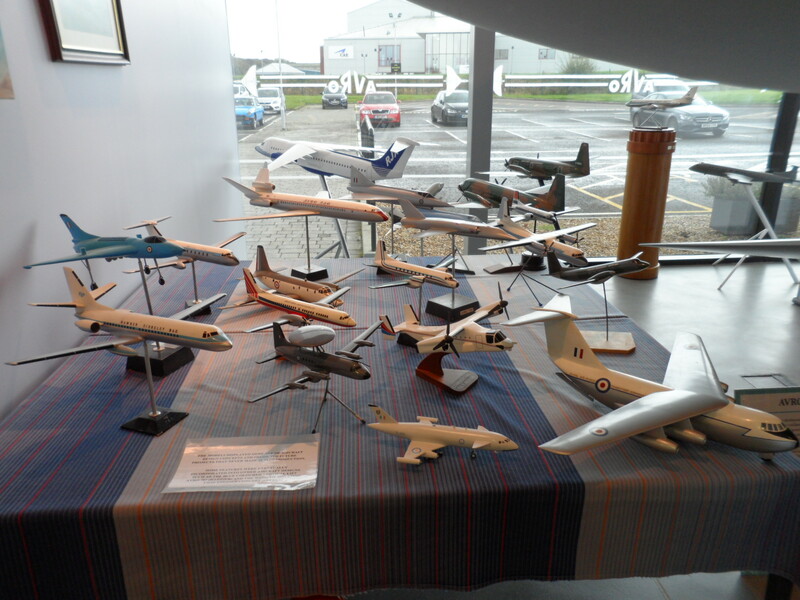 which made us the largest club display. 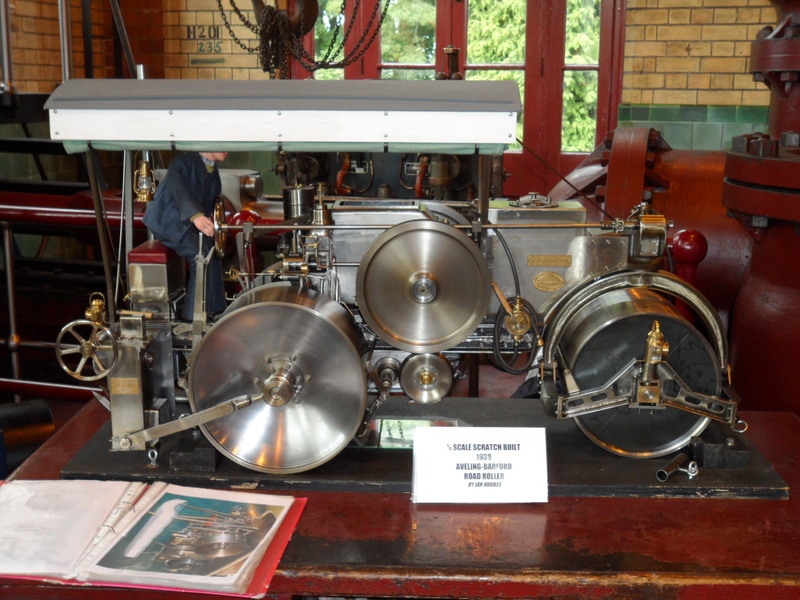 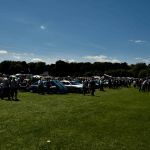 It was a relatively small show but the weather was glorious and it was well attended and a great day was had by all and for the real ale enthusiast’s Titanic beer is served on tap in the bar. 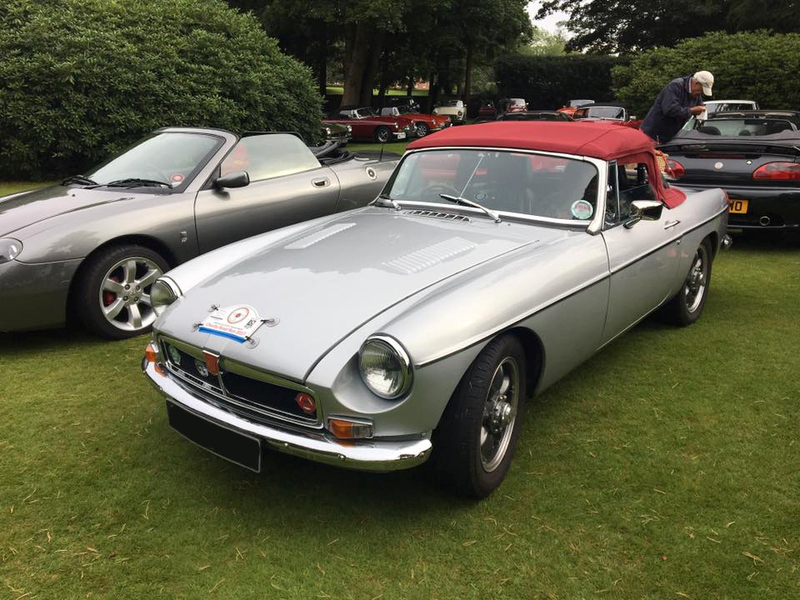 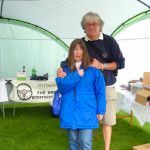 Sadly the weather was a bit of a let down on the day, with rain and drizzle, however the club made the best of the day and Helen and Clive Mollart’s 1962 MGB Roadster ‘Iris Blue’ won ‘Best Vehicle on any Car Club Stand` – well done to the both of you !! 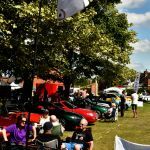 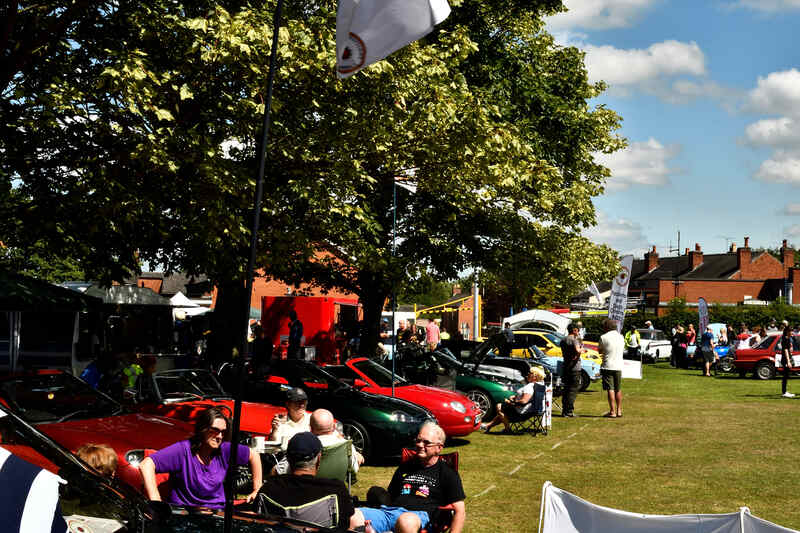 We put on a great club display on the Old Horn car park as part of the Sandbach Transport Festival, the weather was really nice and sunny which brought out the crowds and classic car fans, which made it a highly enjoyable event, with lots going on. 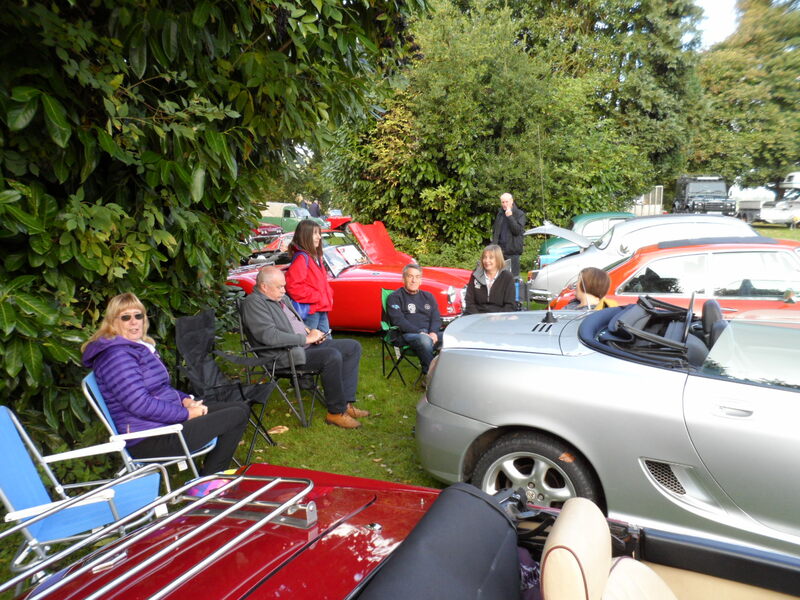 Bit of a blustery day but dry and we had a good turn out from the club, however space was a bit of a premium so we were a little squashed up but this didn’t stop us enjoying the day. 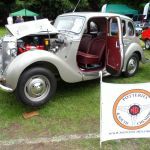 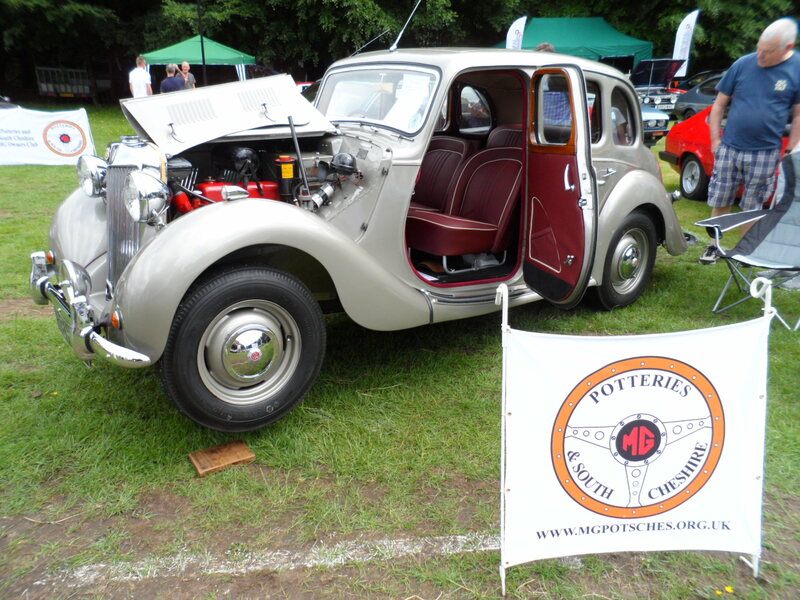 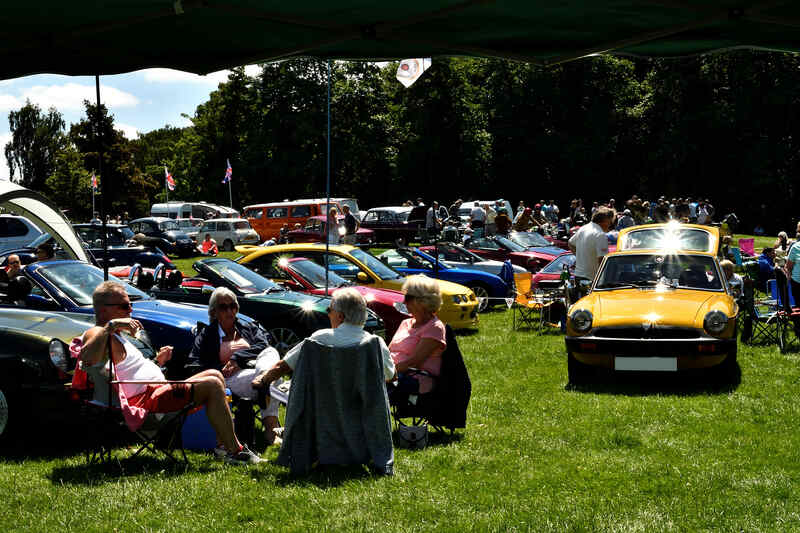 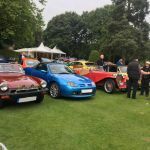 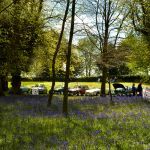 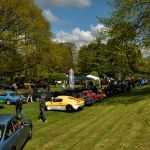 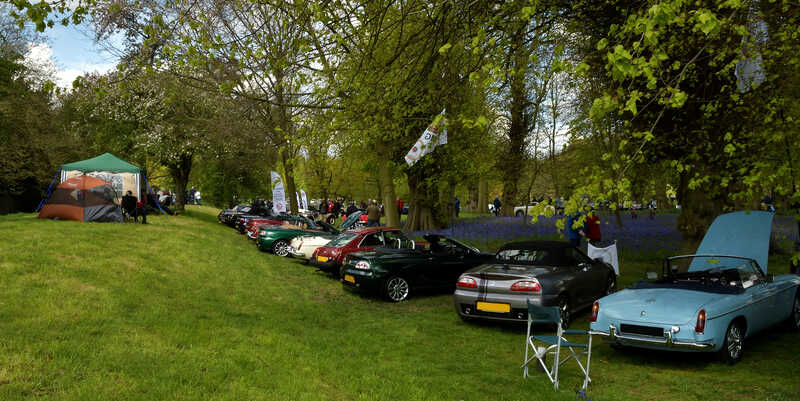 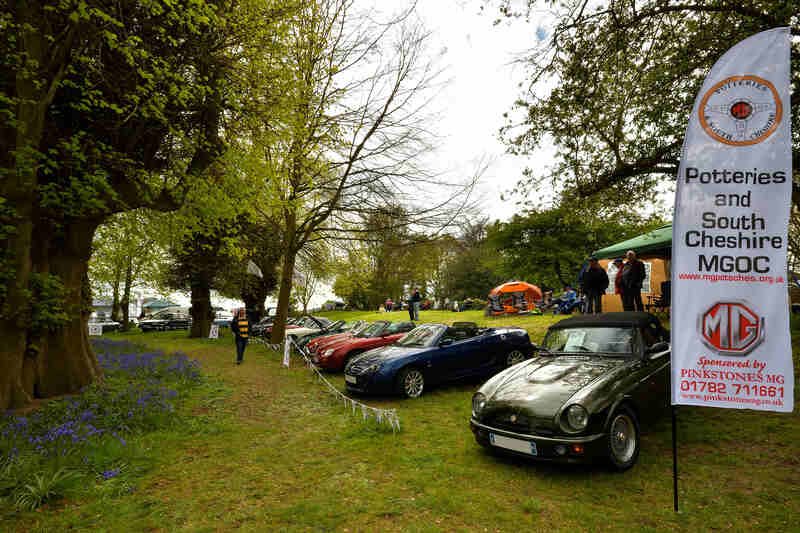 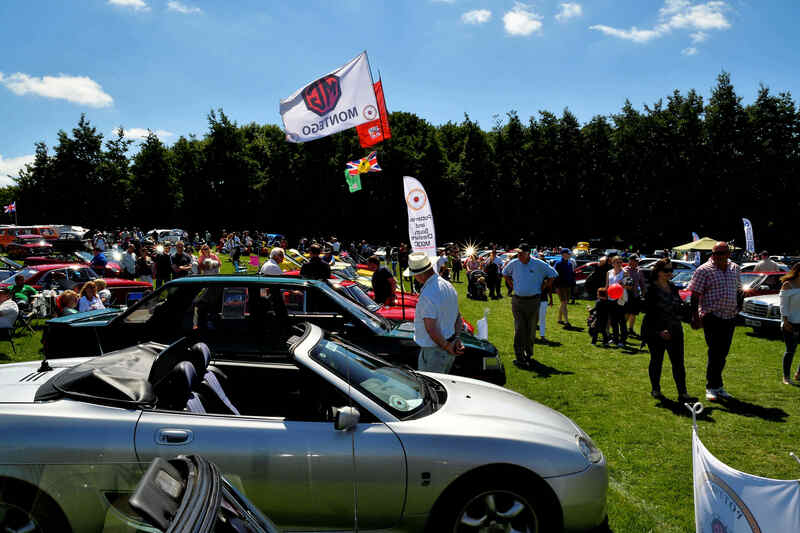 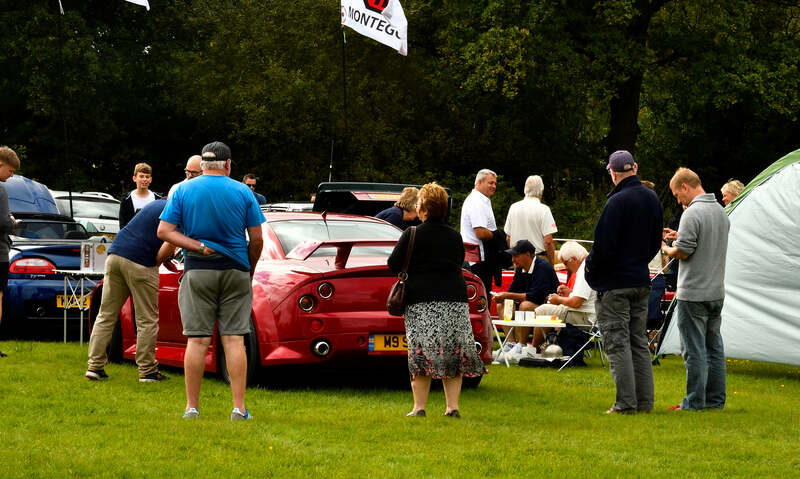 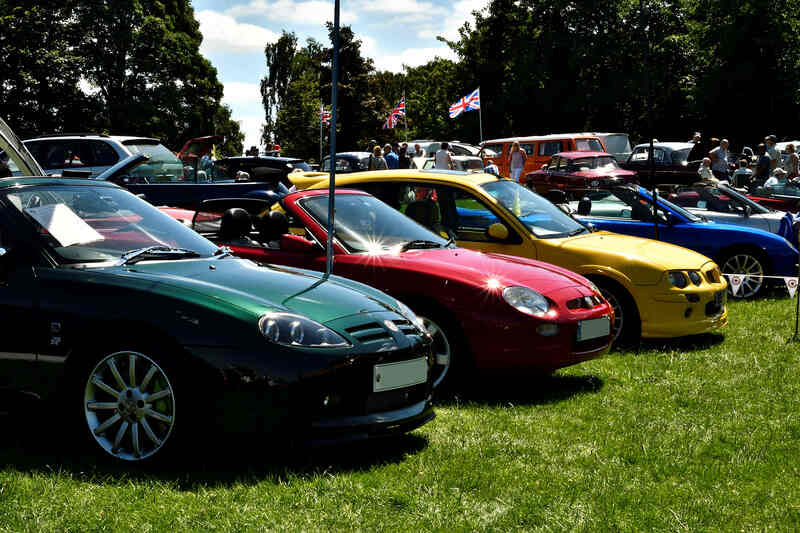 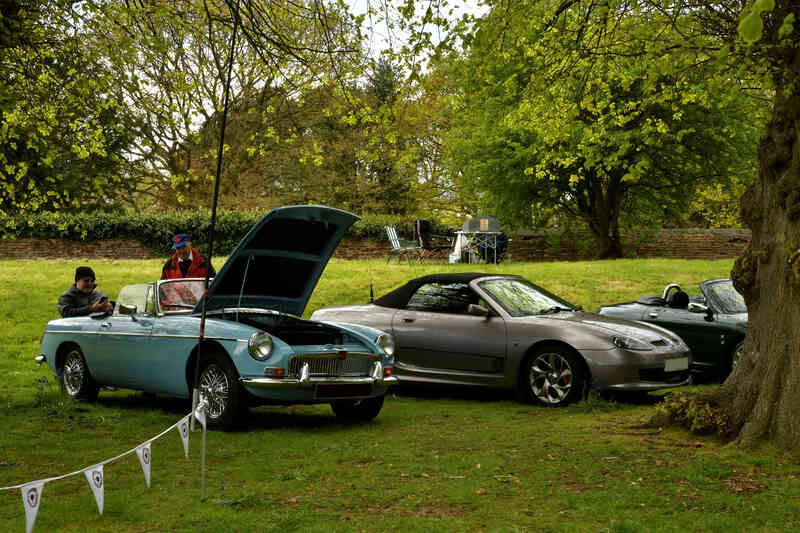 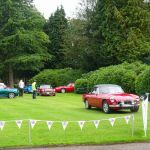 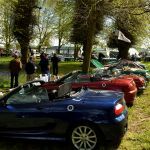 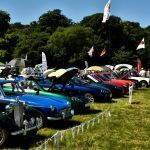 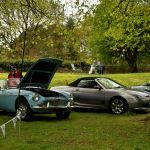 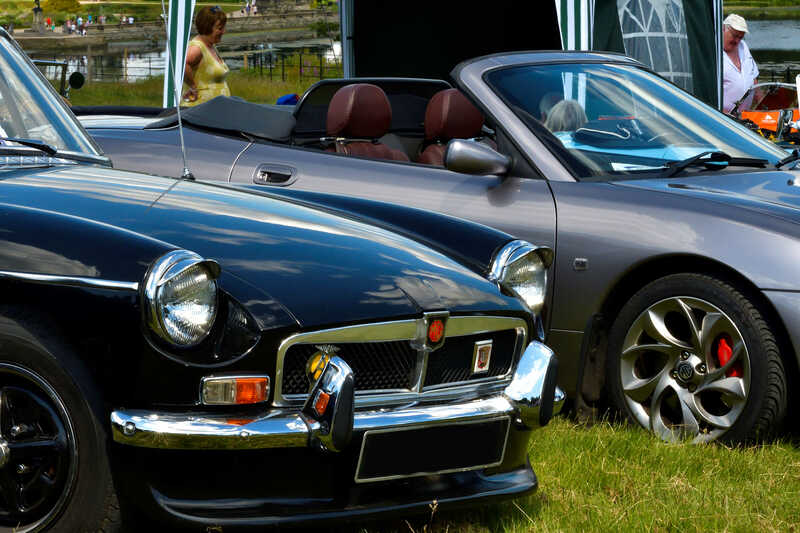 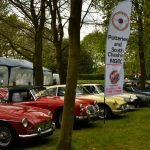 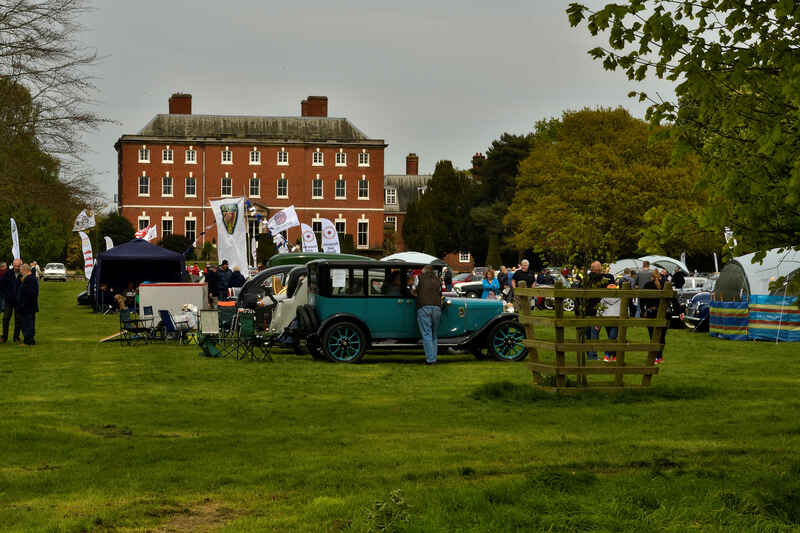 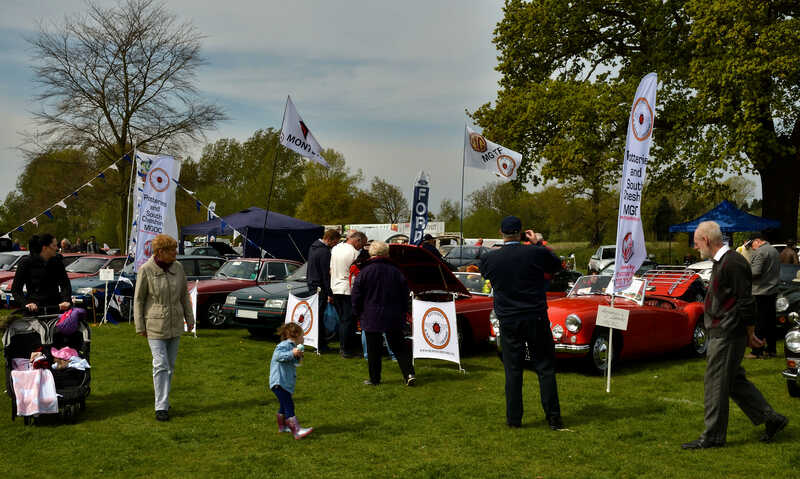 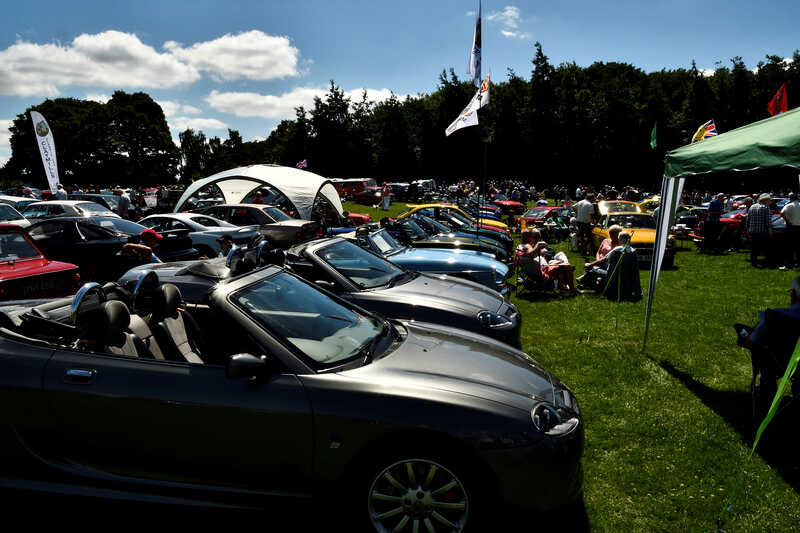 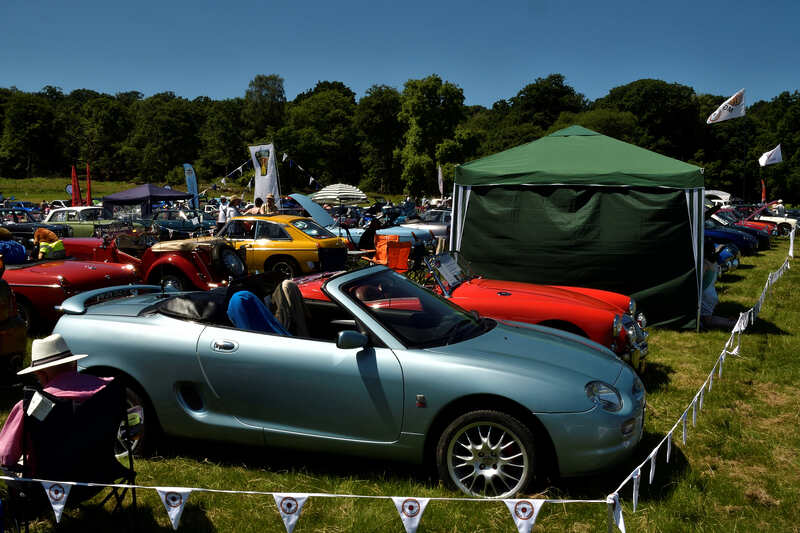 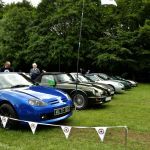 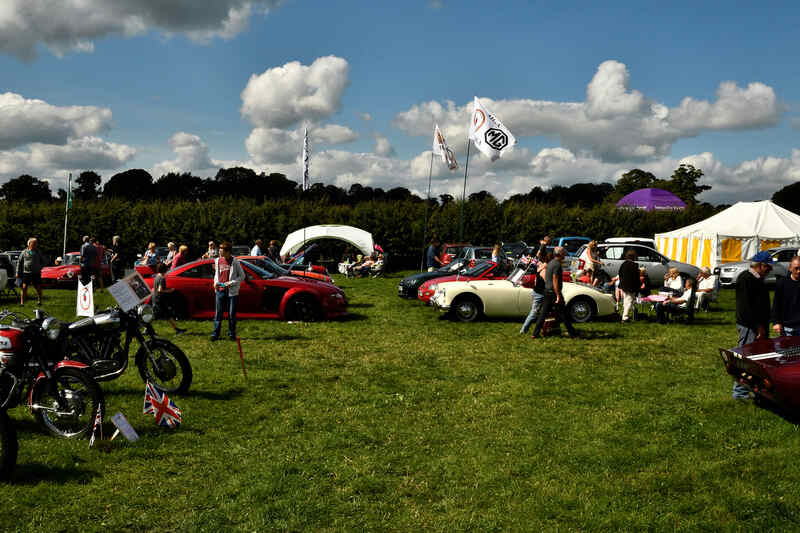 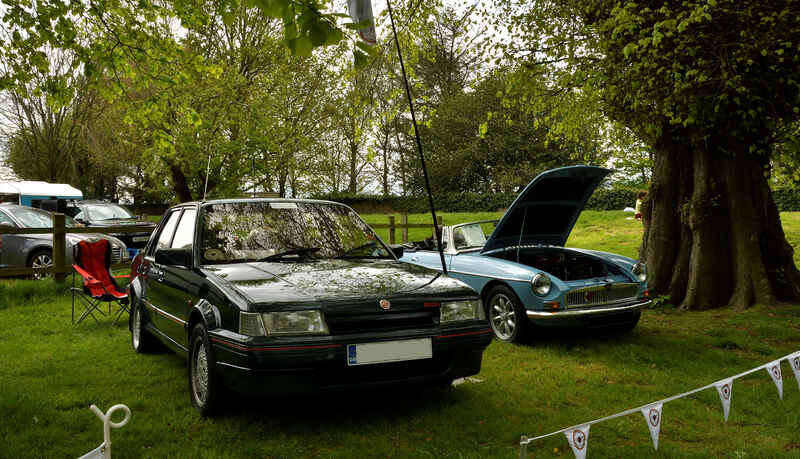 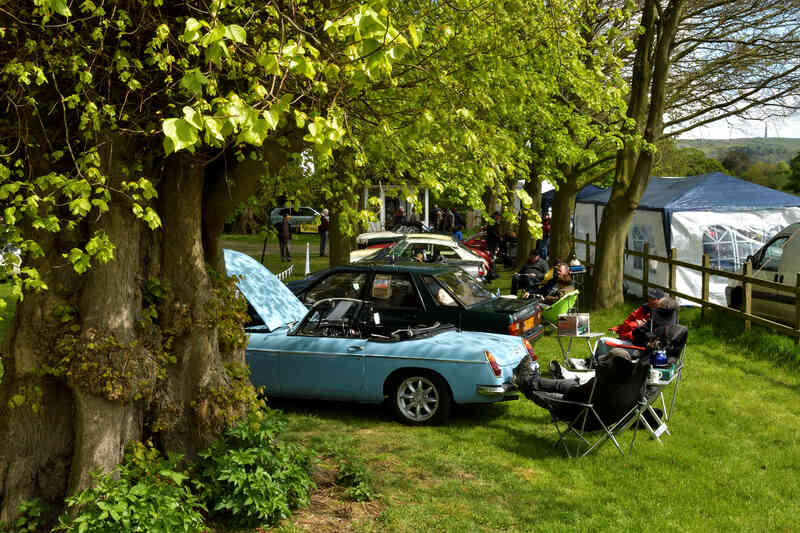 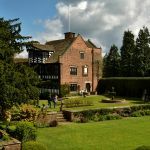 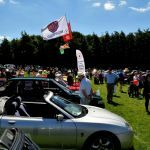 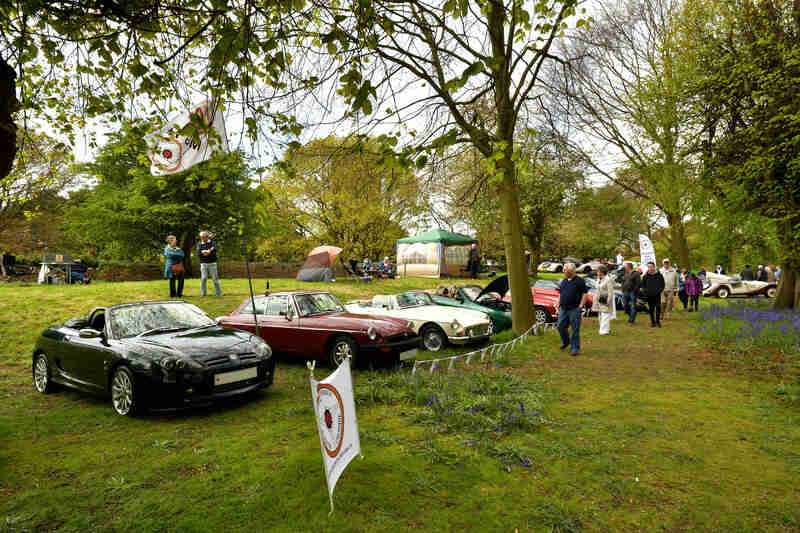 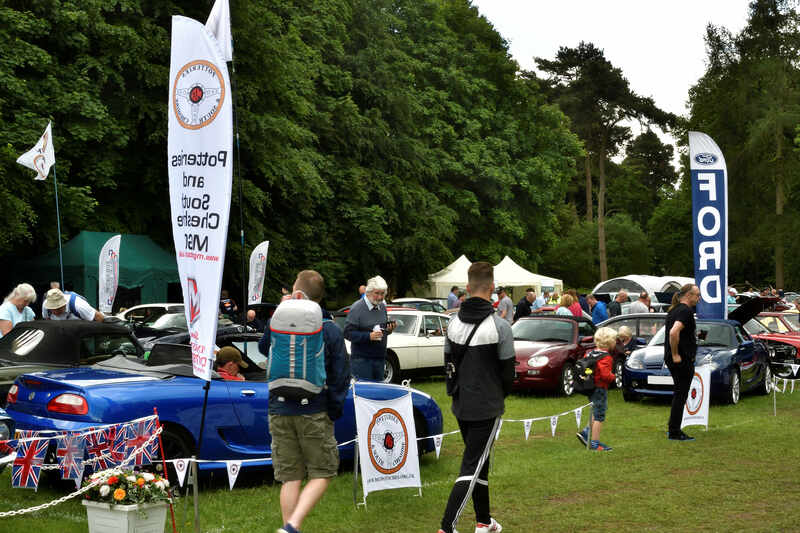 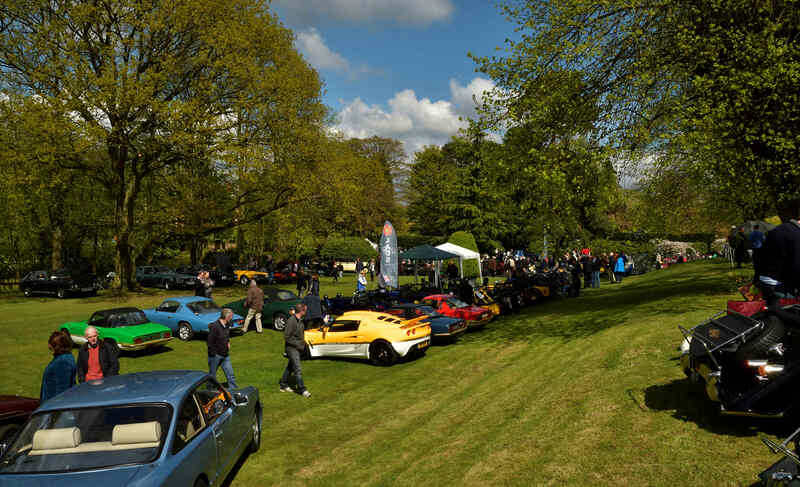 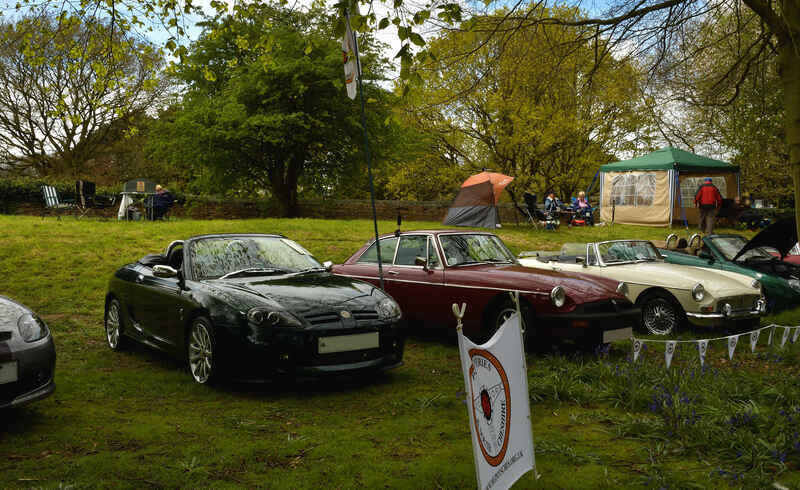 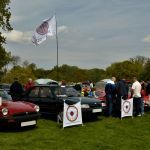 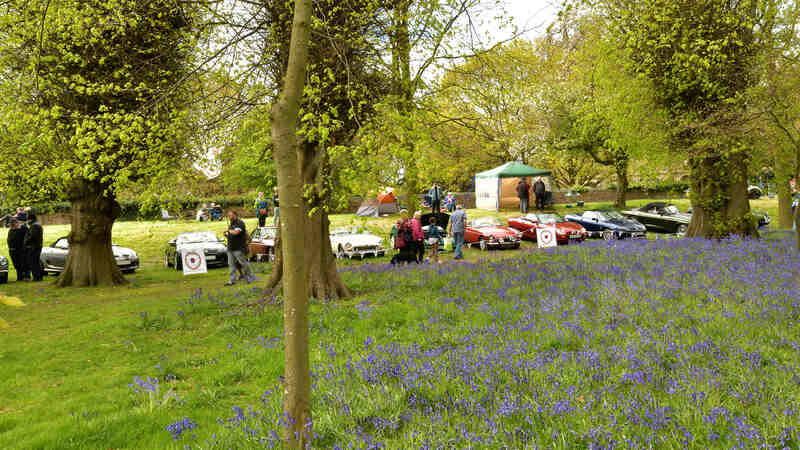 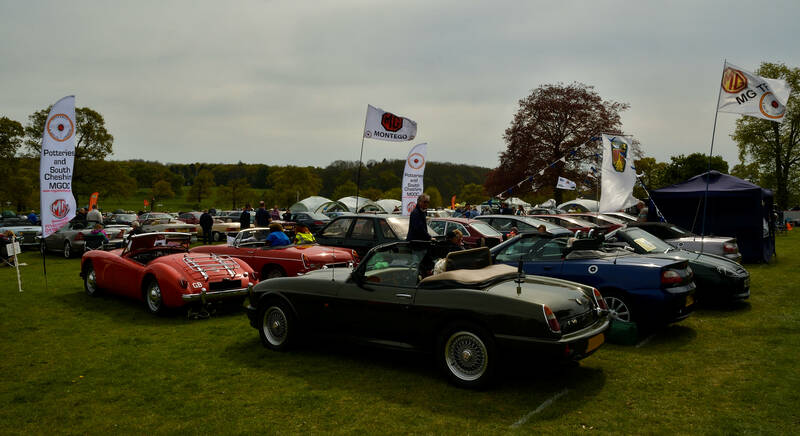 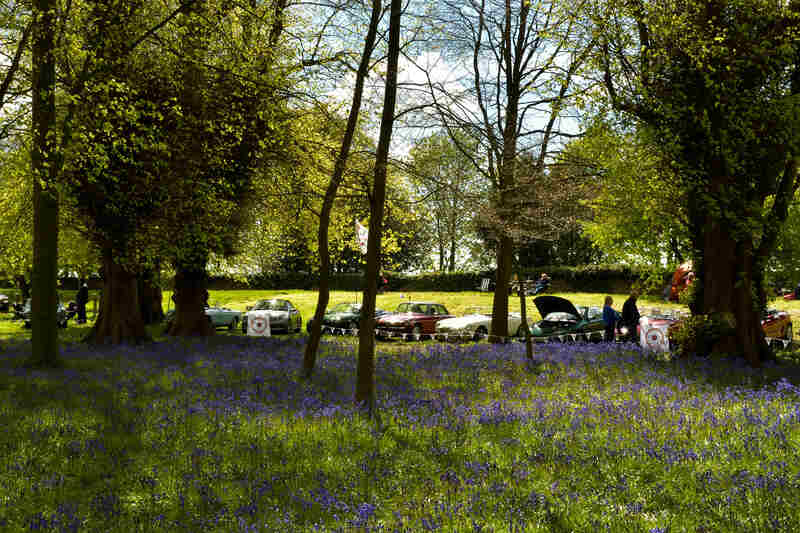 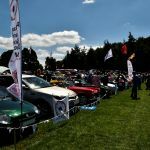 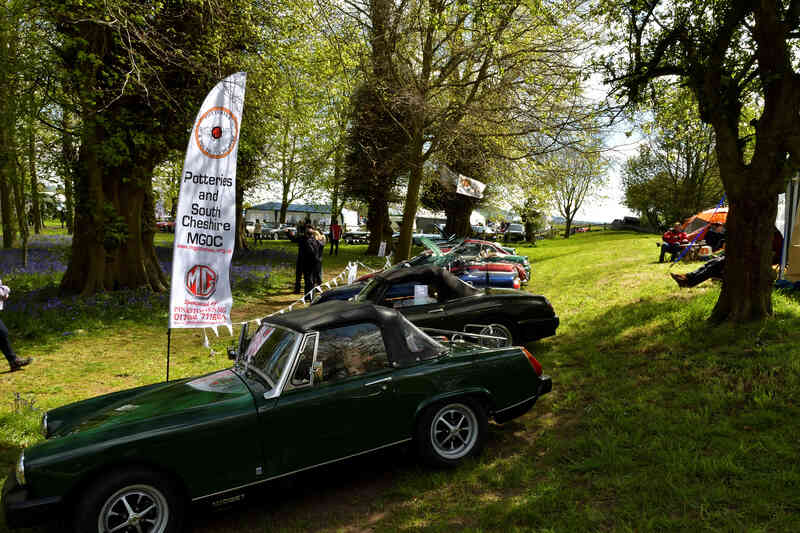 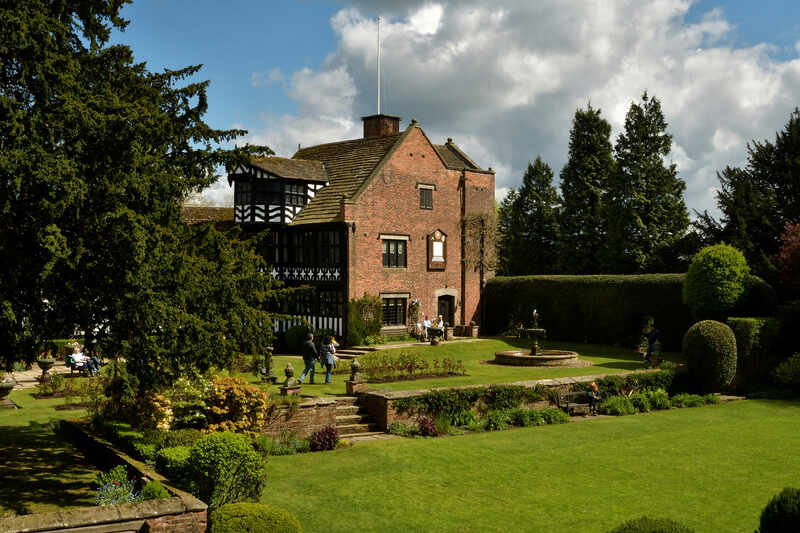 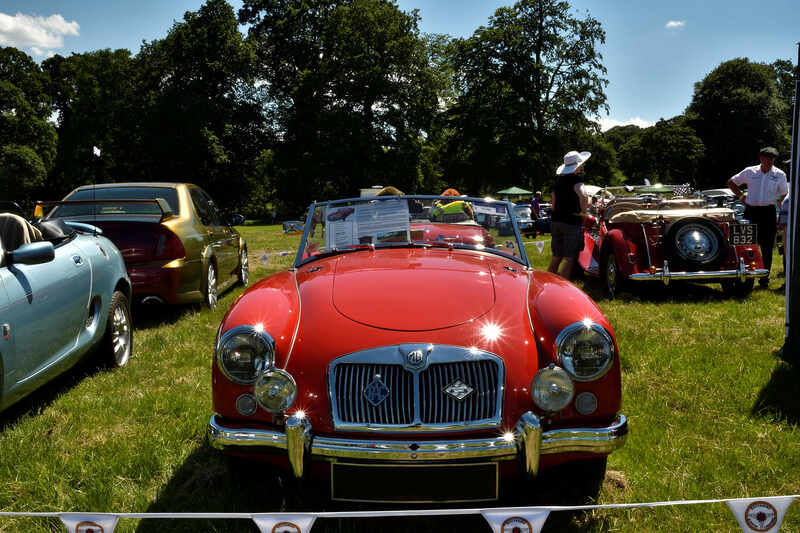 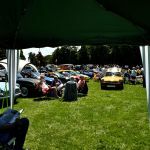 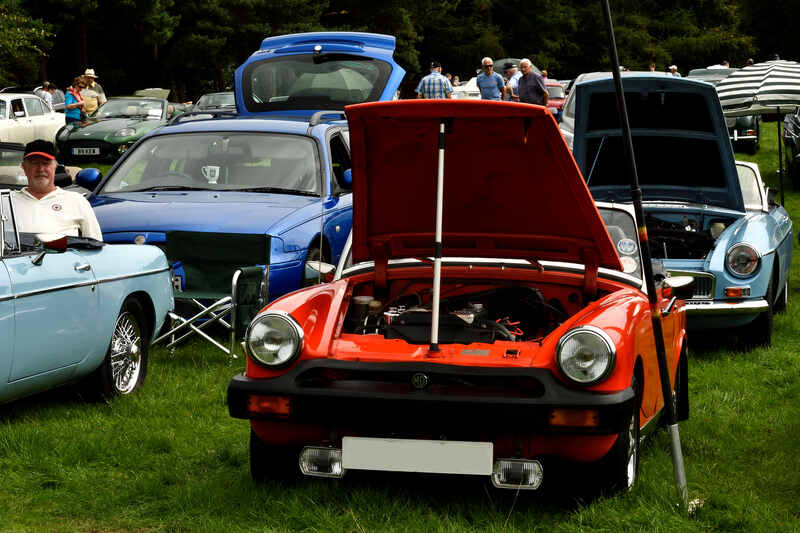 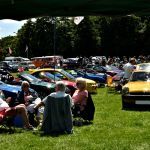 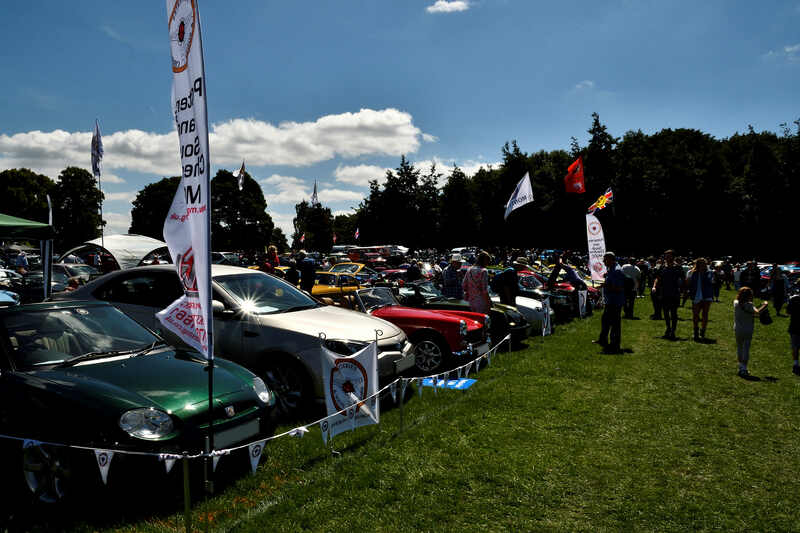 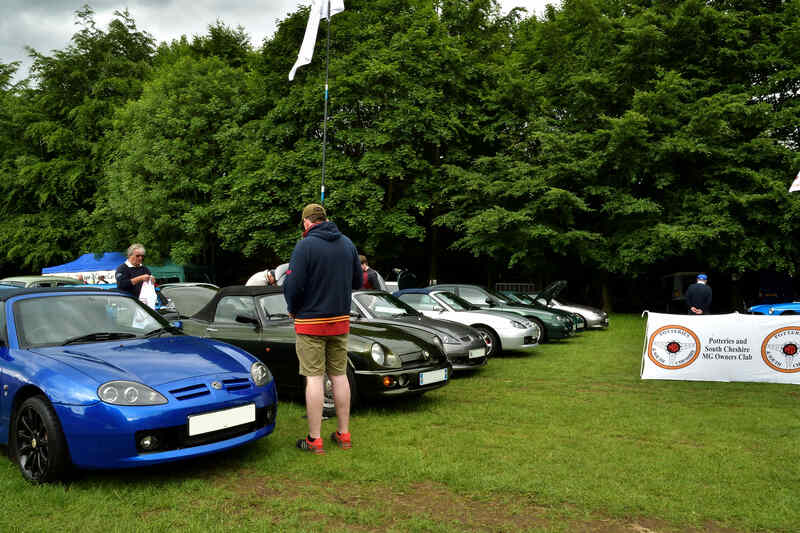 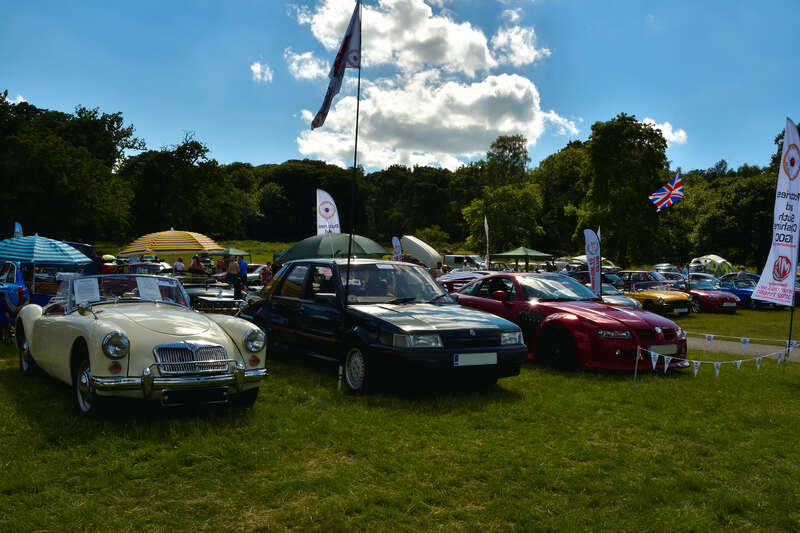 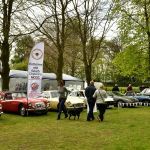 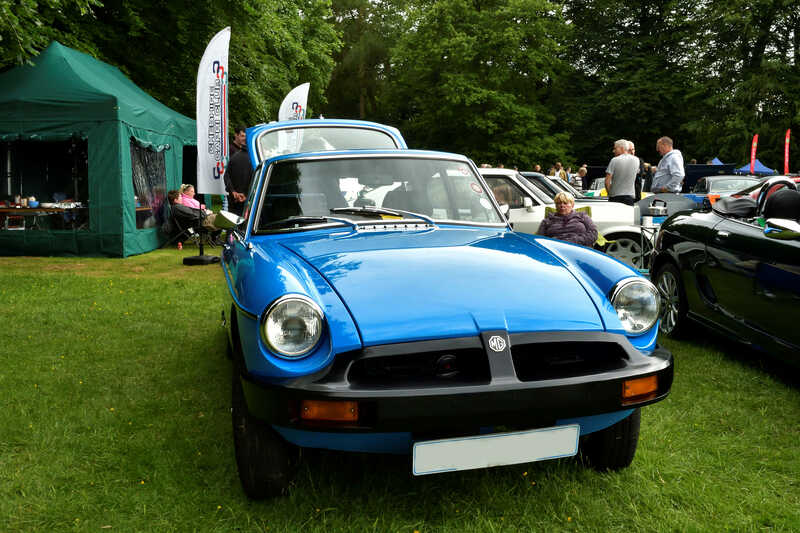 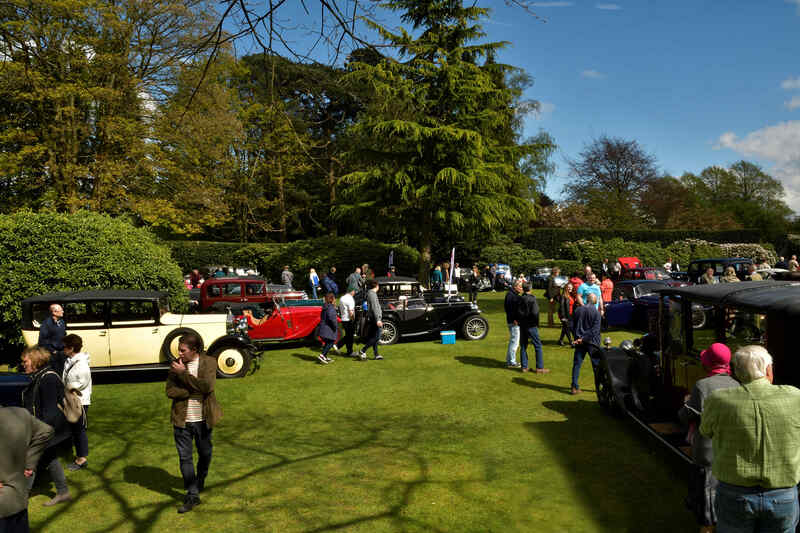 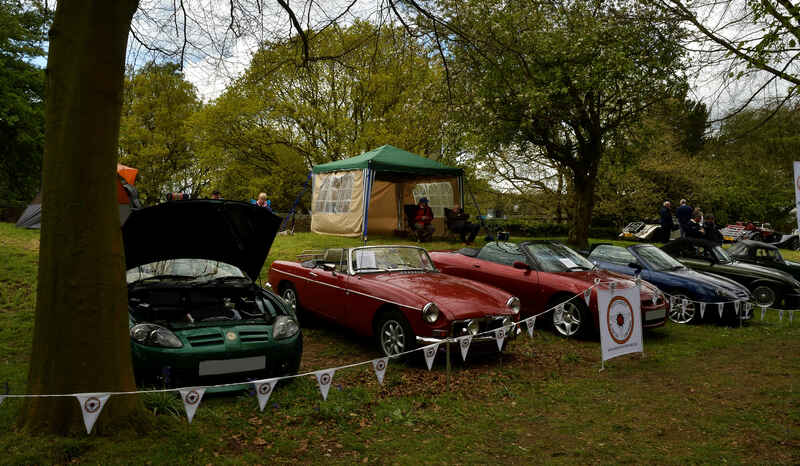 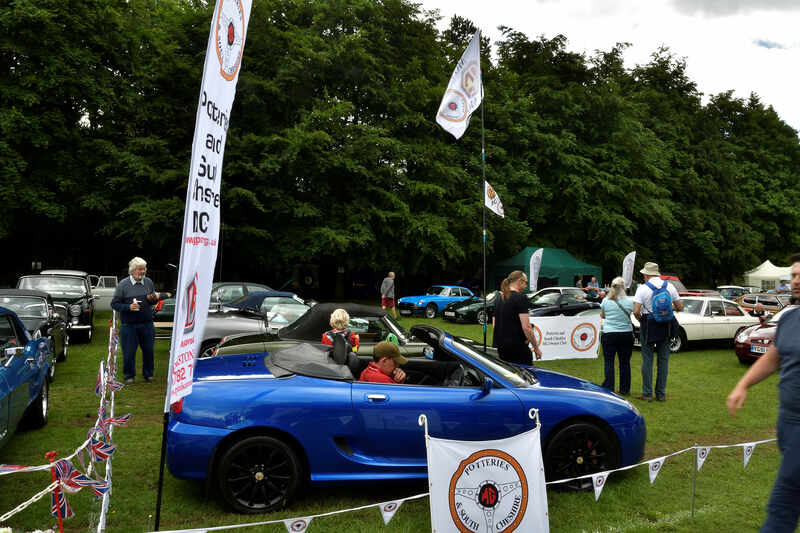 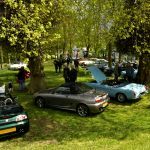 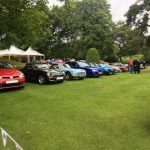 We had a fantastic day at Gawsworth on the Bank Holiday Monday, with a large turn out from the club, parking in the bluebell woods which is a beautiful location for the club display. 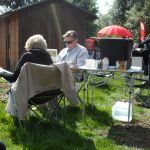 The weather started off overcast chilly with drizzle but soon went to a bright warm sunny day (typical British weather !). 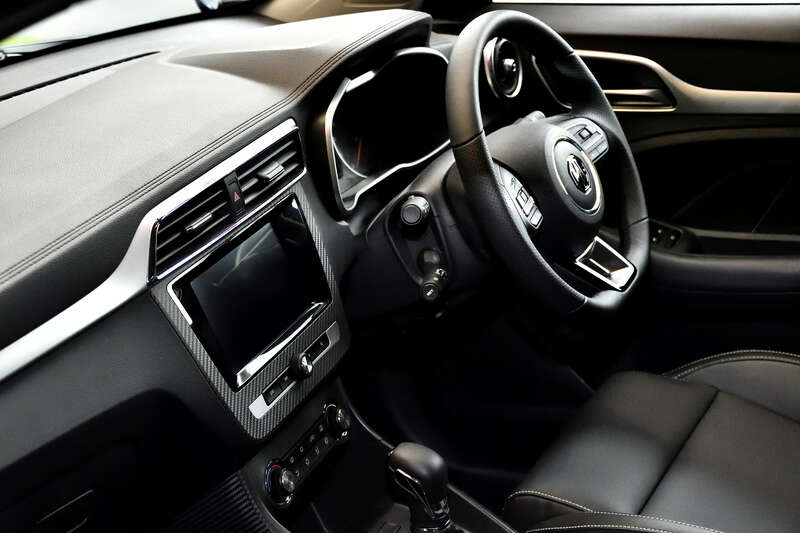 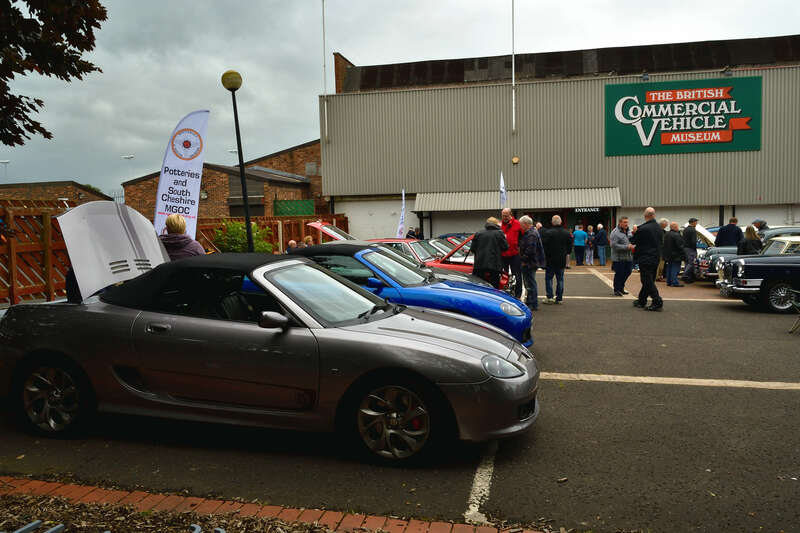 It was very busy with a large number of visitors turning out to see the wide range of superb vehicles on display. 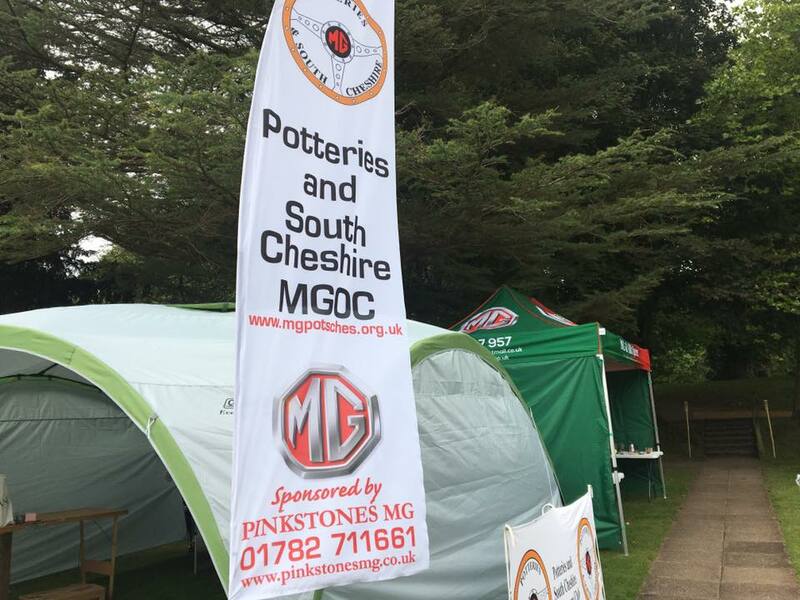 Over recent years Pinkstones have been very supportive of this club, this year they have kindly continued this sponsorship by buying 2 sail flags for use at events by the club. 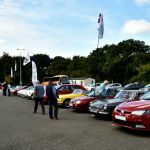 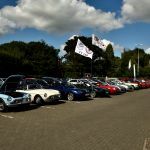 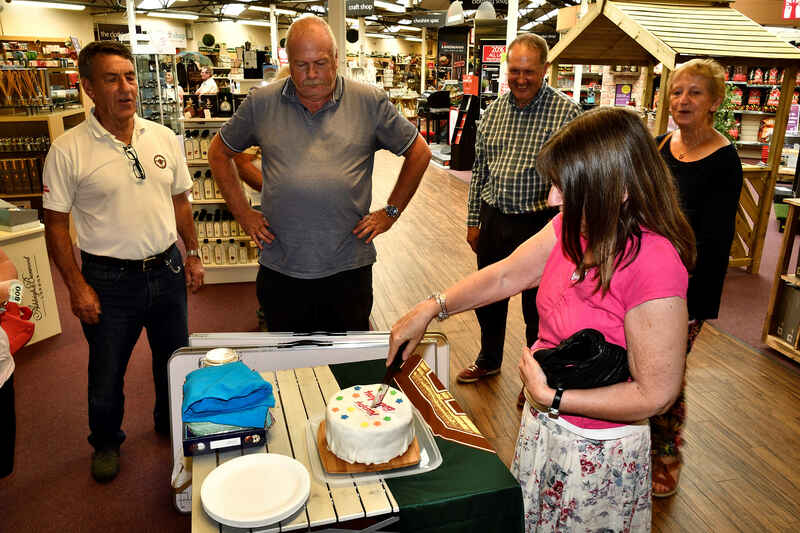 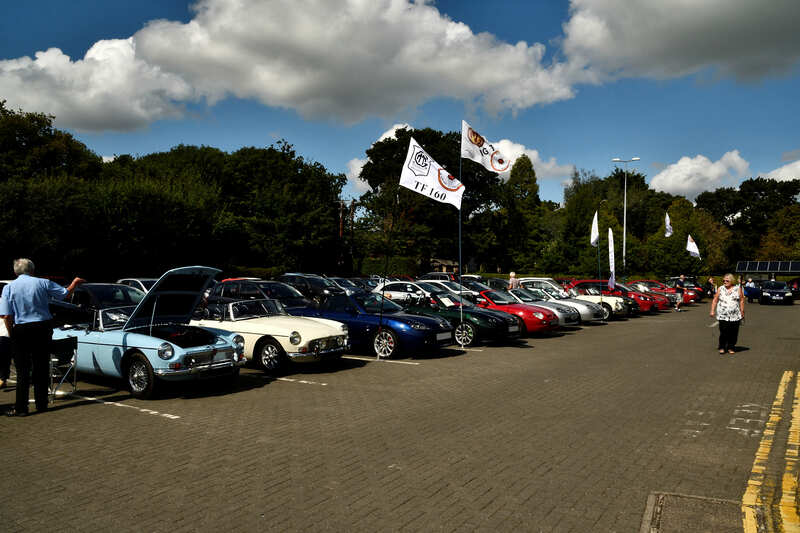 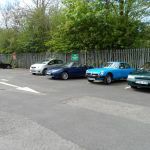 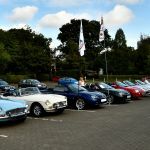 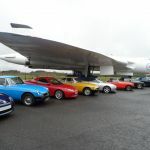 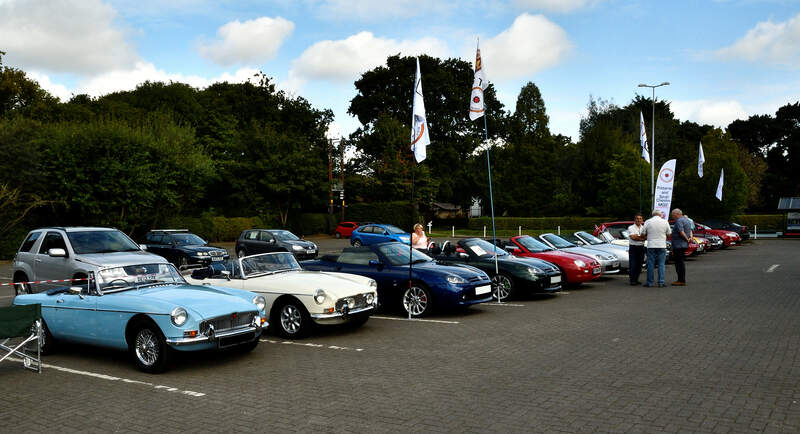 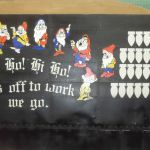 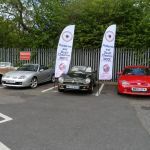 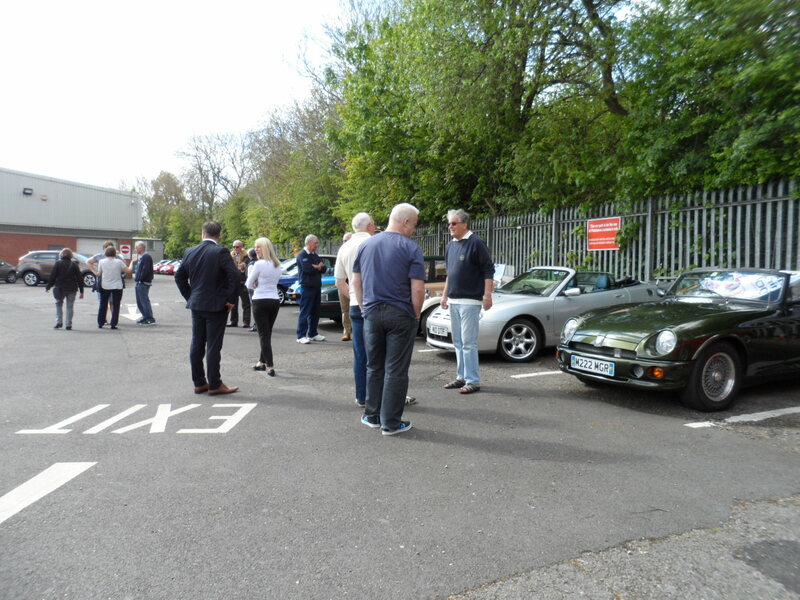 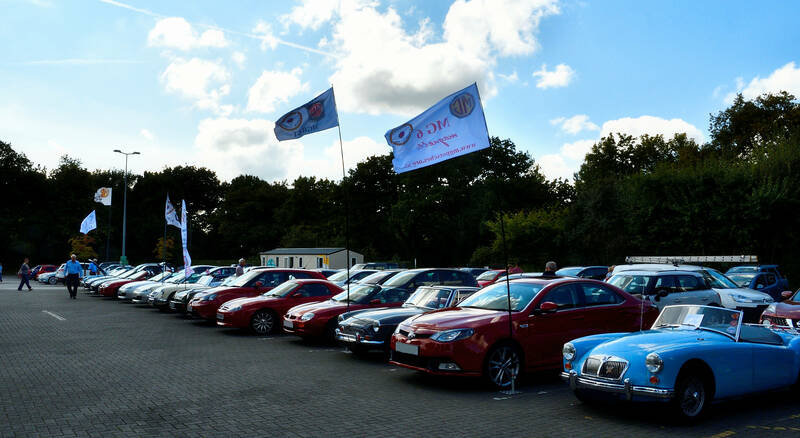 A splendid turnout by members of this club were assembled at Pinkstones MG on the A34 for the 2 sailflags to be presented to us by Richard Crookes Sales Manager at Pinkstones. 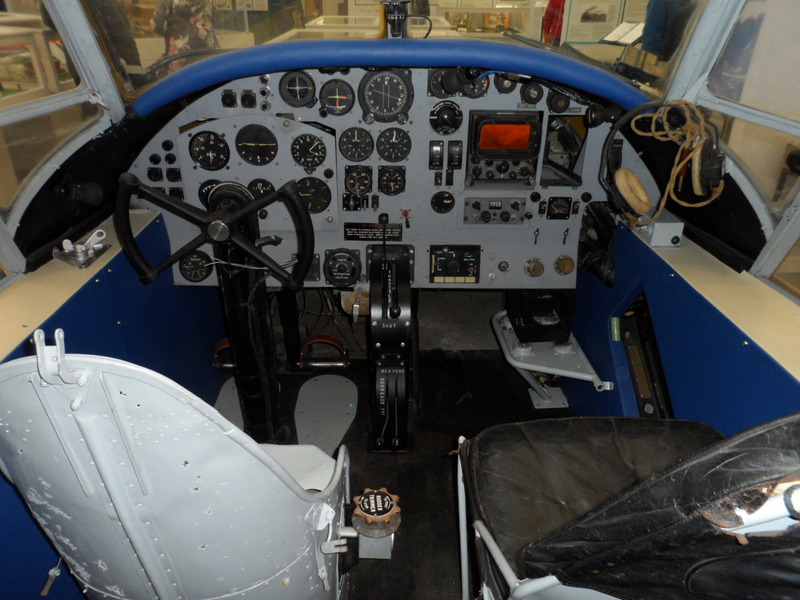 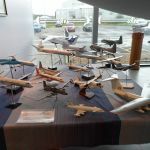 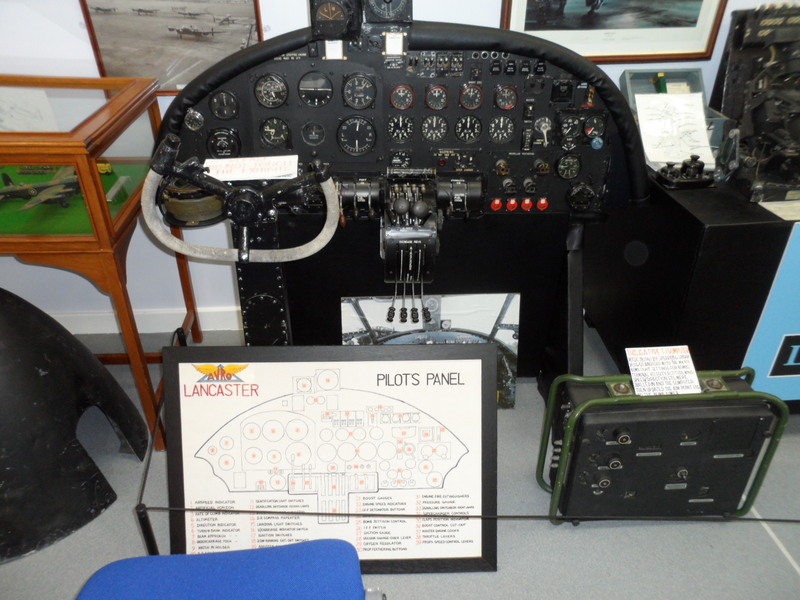 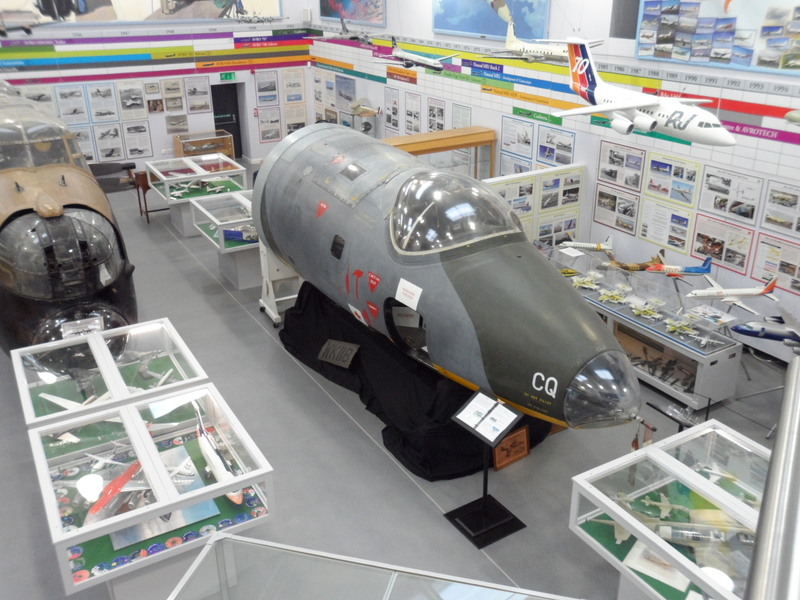 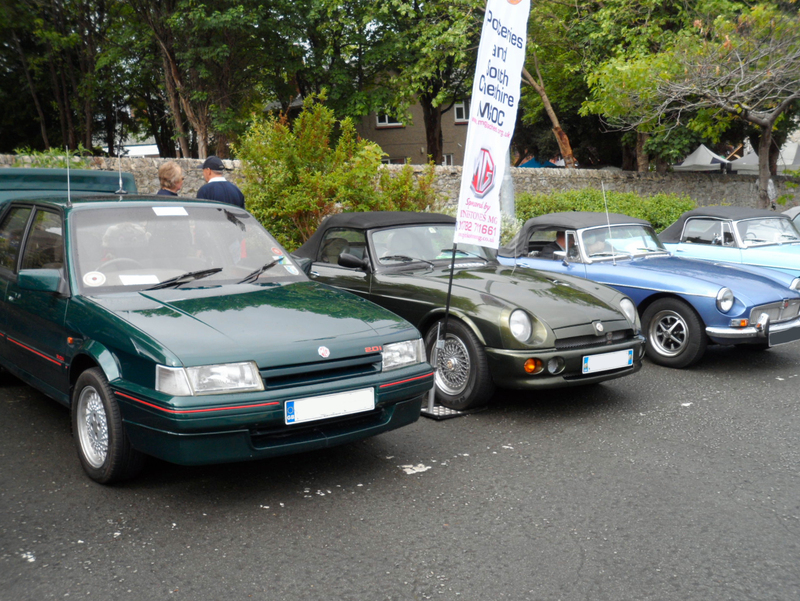 The display included TD’s – B’s – TF’s – RV8 – A – and a now rare Montego. 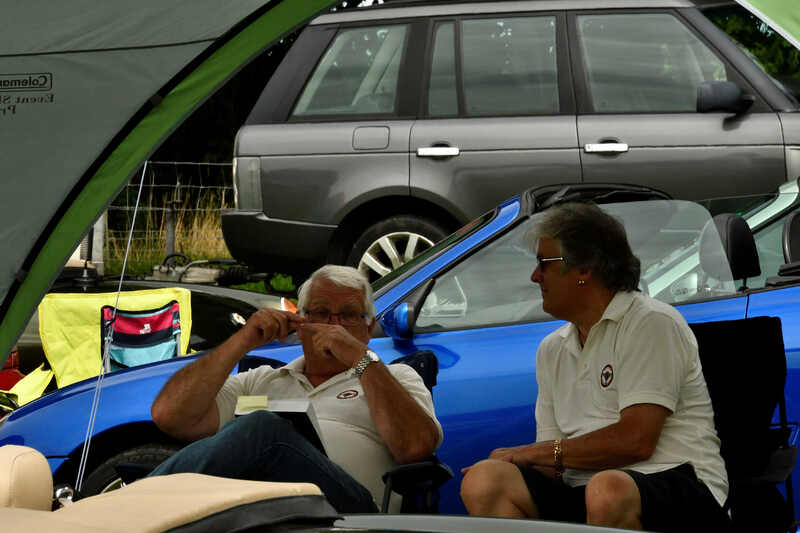 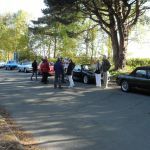 The club had a fantastic day out in the Lake District, after meeting up we traveled in convoy, making pit stop en route for some well needed nourishment as it was an early start ! . 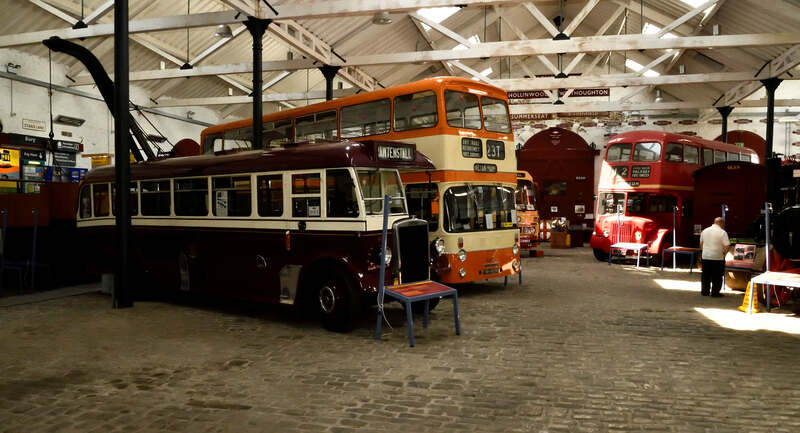 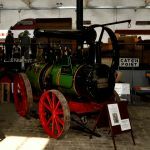 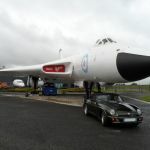 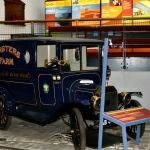 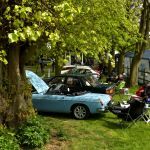 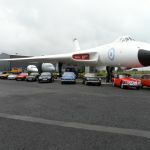 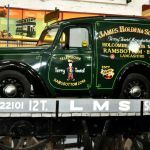 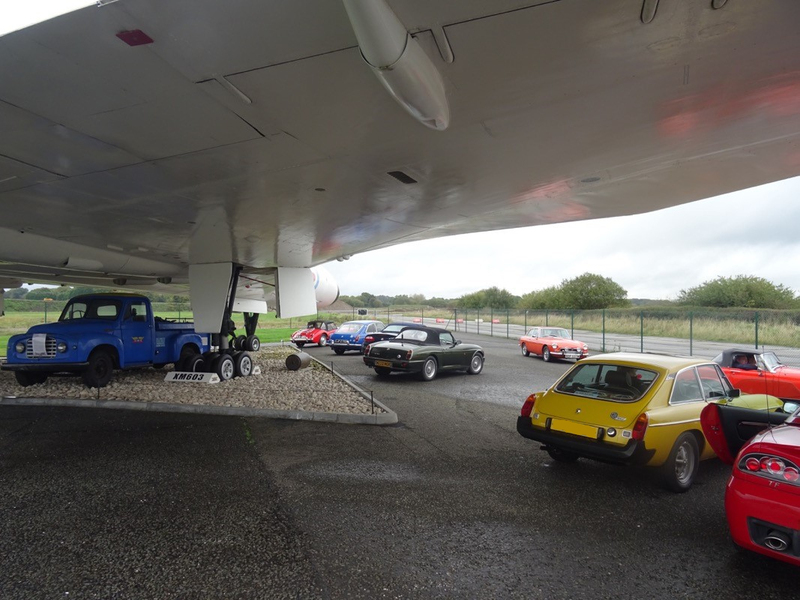 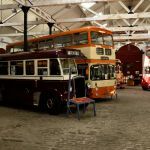 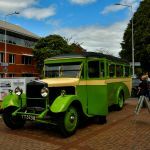 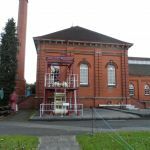 On arriving at the Lakeland Car Museum we put on a static display in the courtyard, then after visiting the museum we traveled by bus to the steam train at Lakeside, where we enjoyed a round trip. 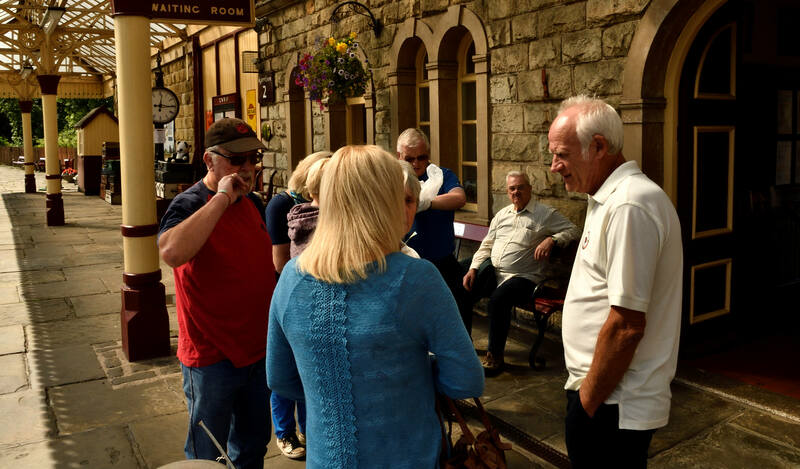 Afterwards we caught the boat from Lakeside to Bowness where had time for a nice browse around, then after catching the boat back we all traveled back home after what was a highly enjoyable full day out. 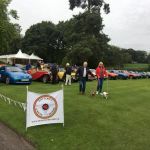 We had a great turn out from the club for the Capesthorne Hall Classic Car Show, weather was a bit drizzly to start with but dried up later so we and the vistors could all enjoy the day. 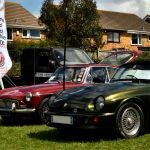 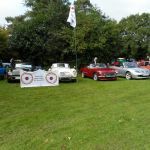 On Bank Holiday Monday we drove down to Prestatyn to put on a club display at the ever popular Prestatyn Classic Car show. 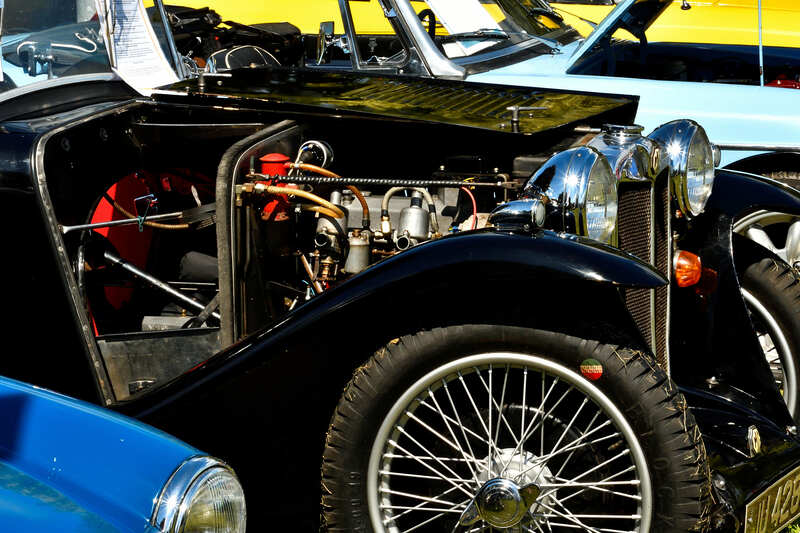 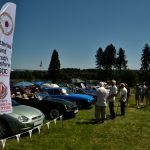 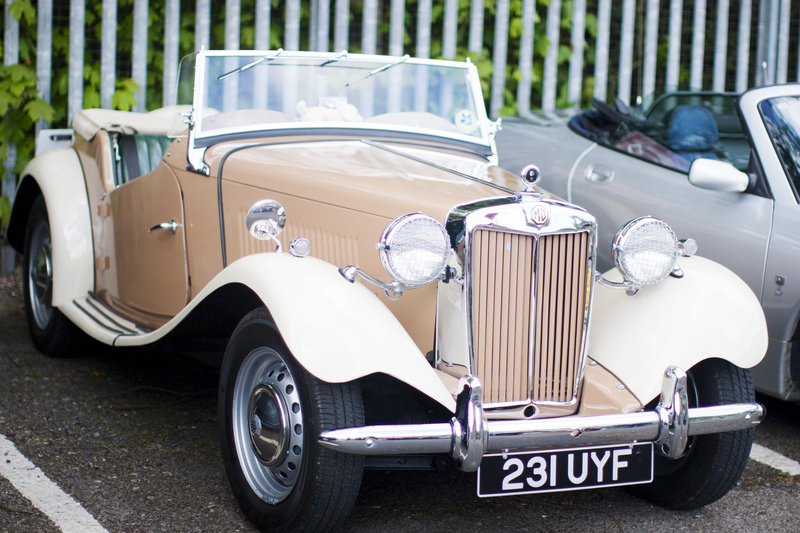 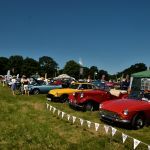 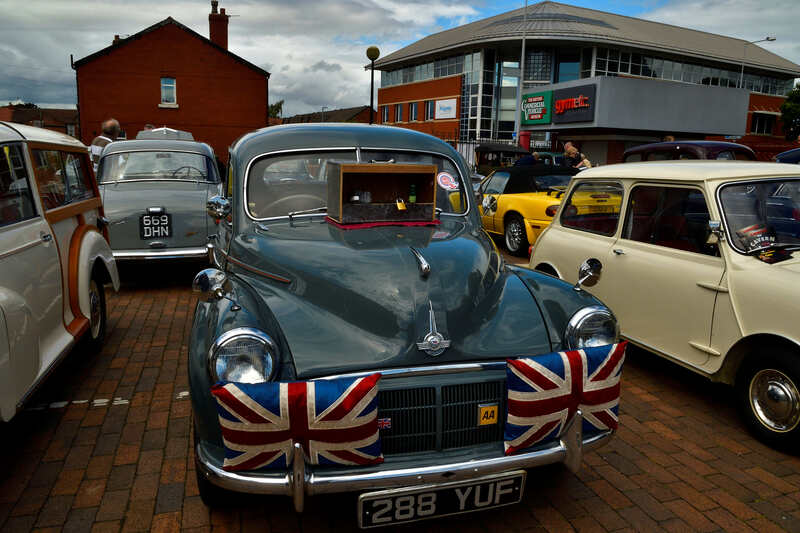 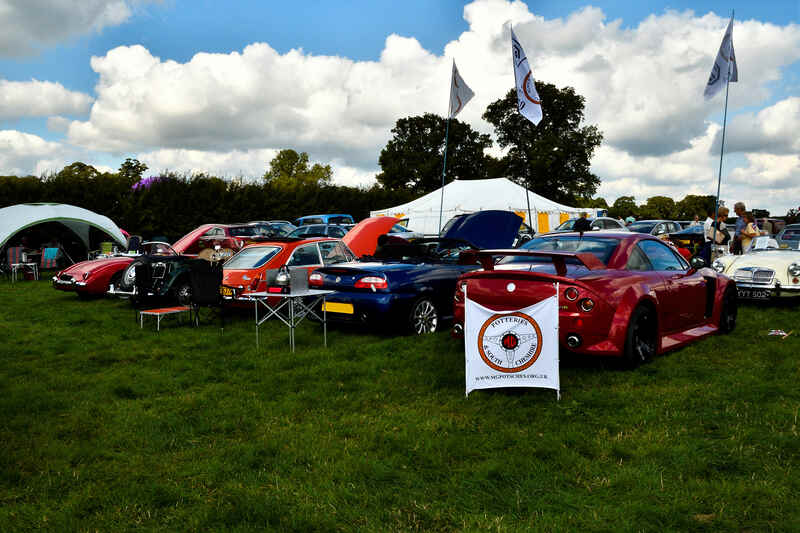 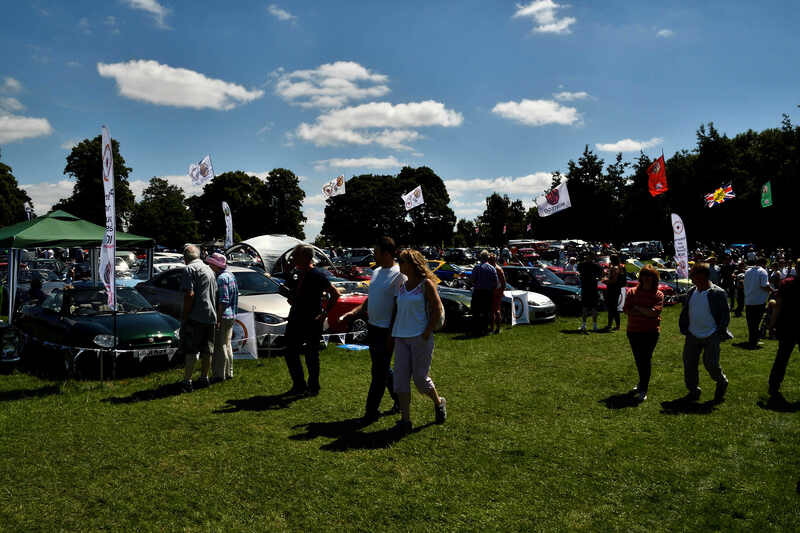 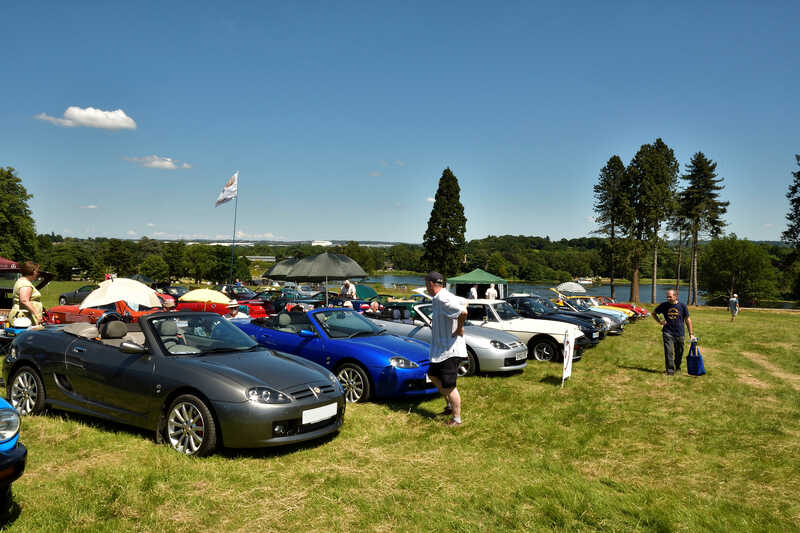 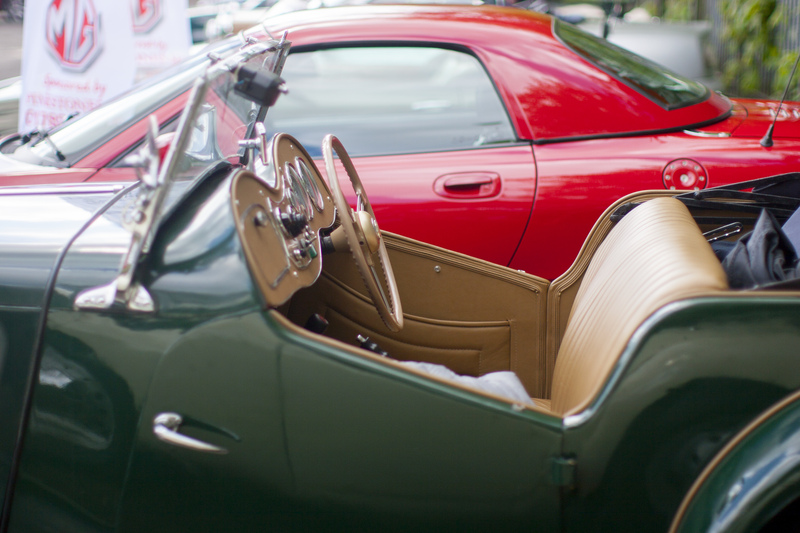 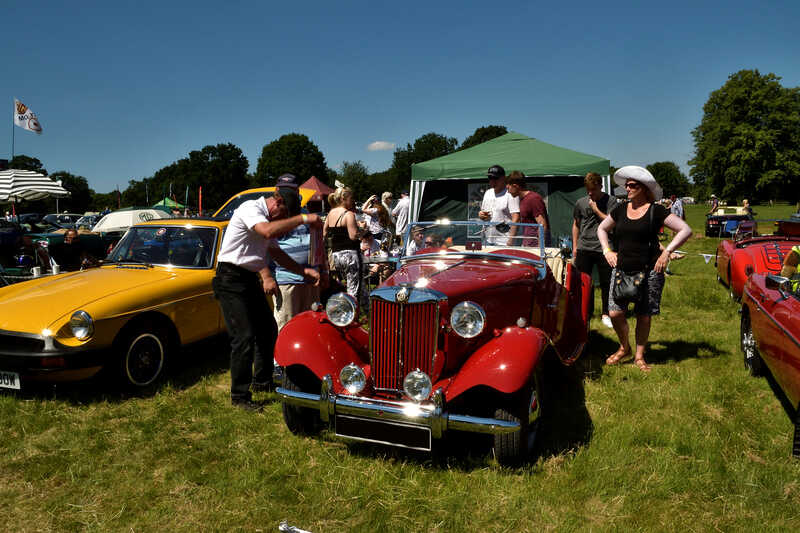 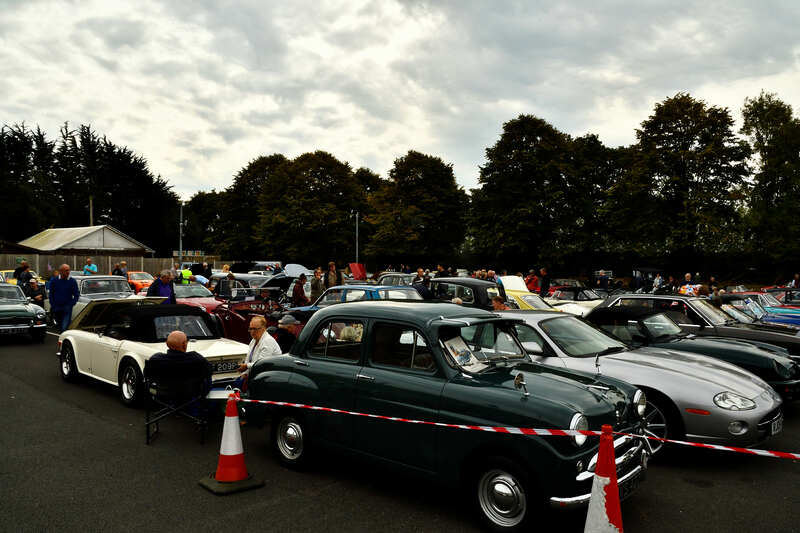 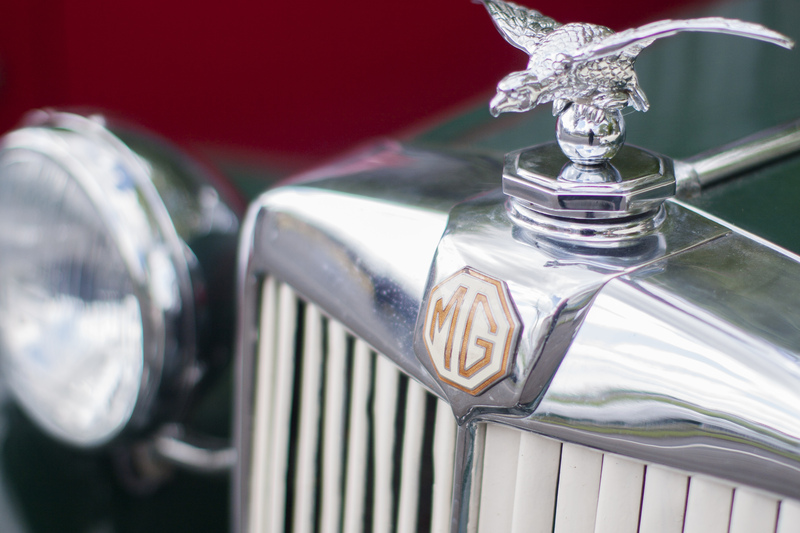 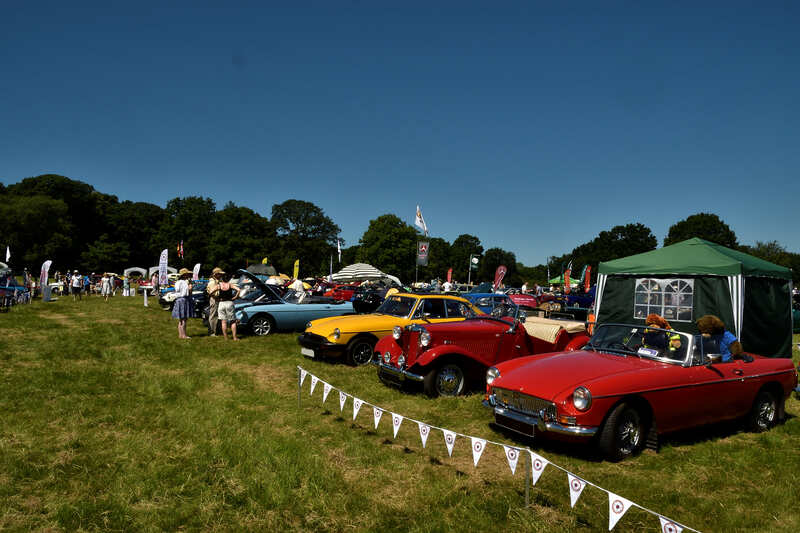 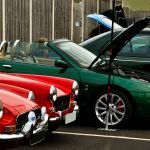 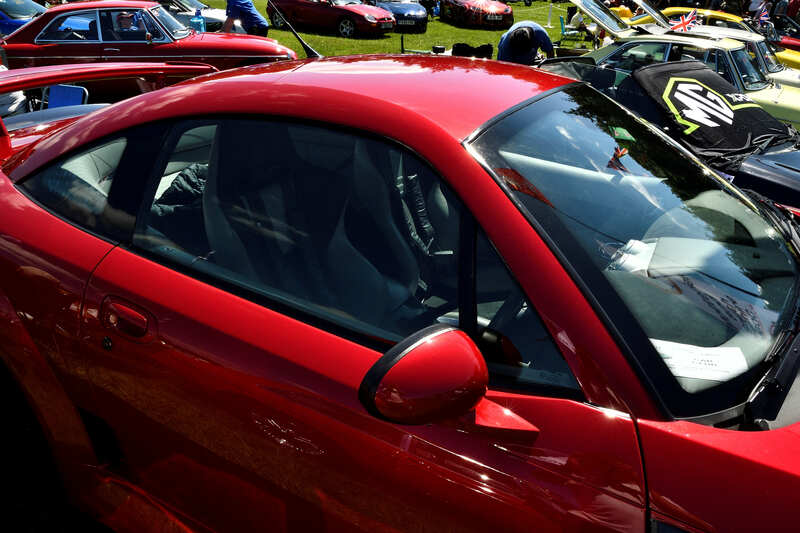 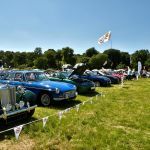 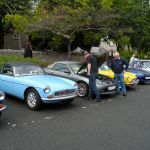 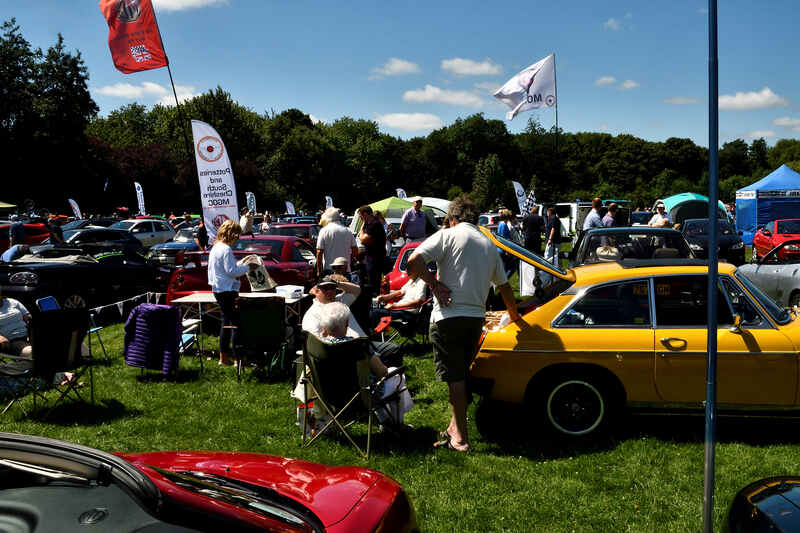 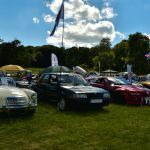 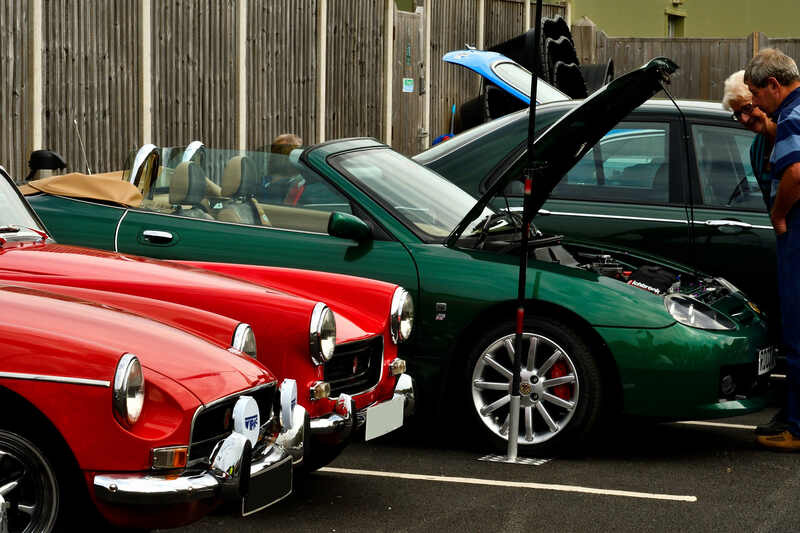 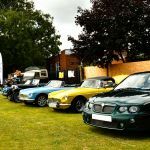 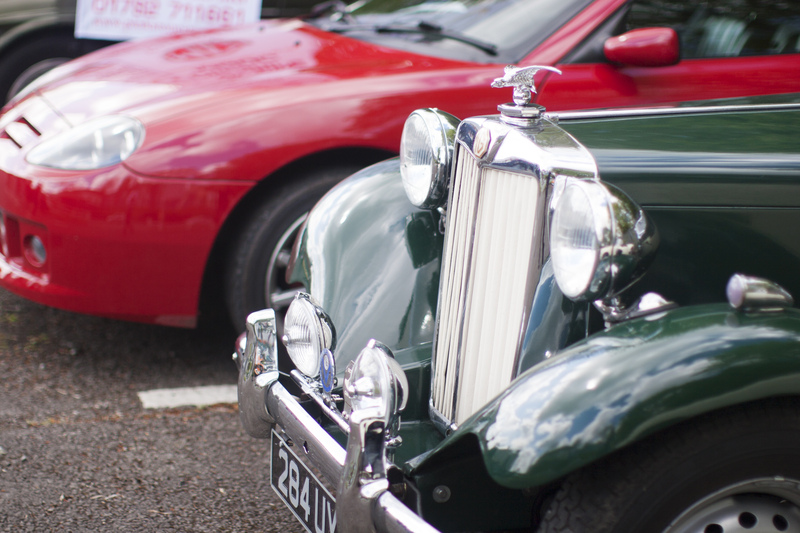 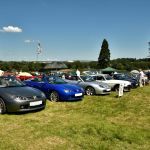 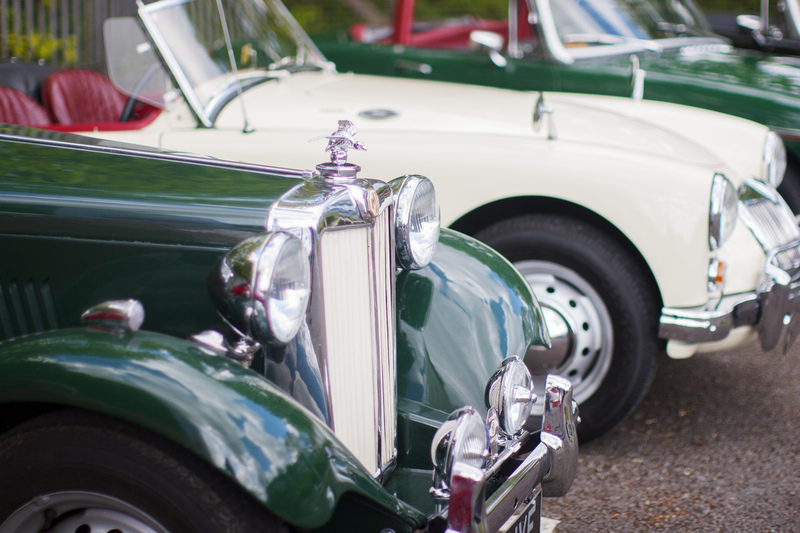 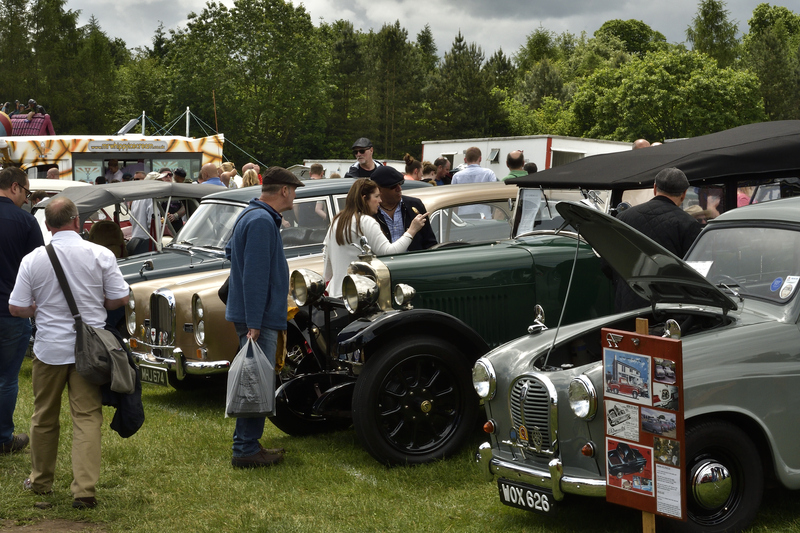 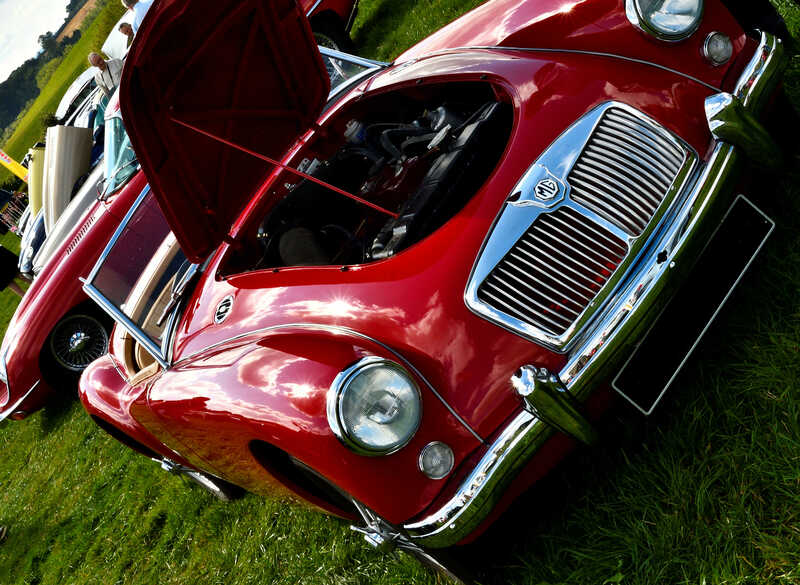 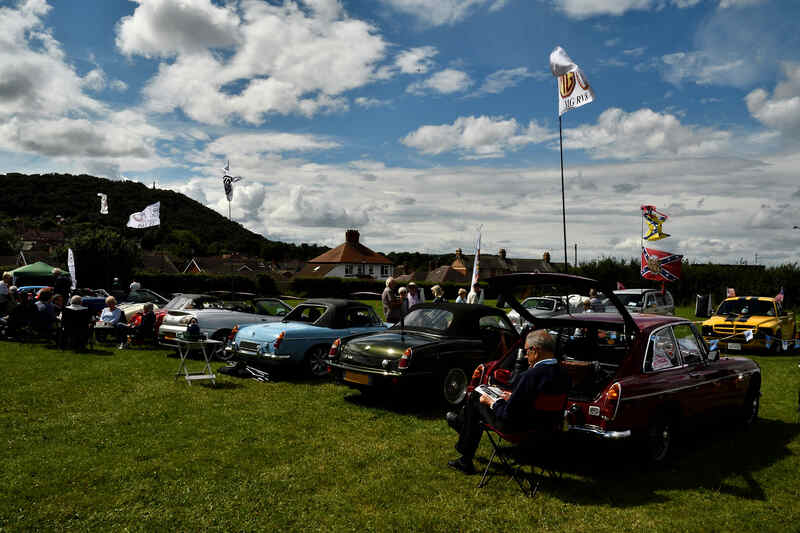 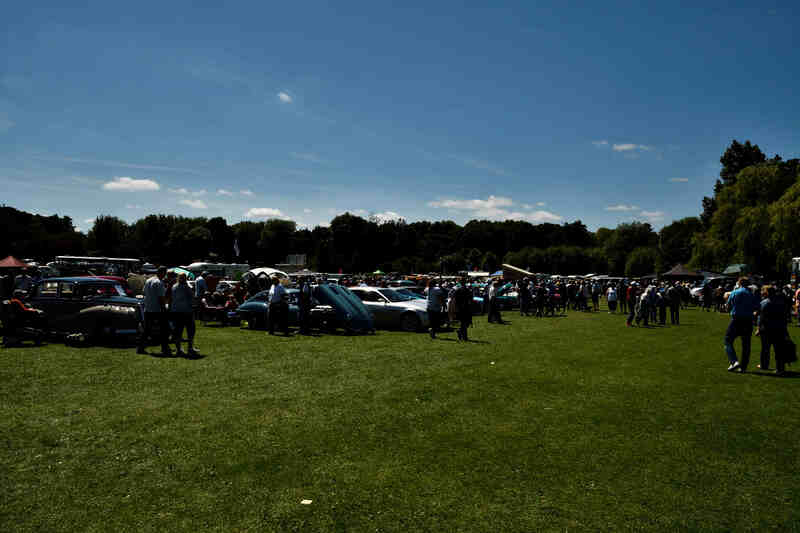 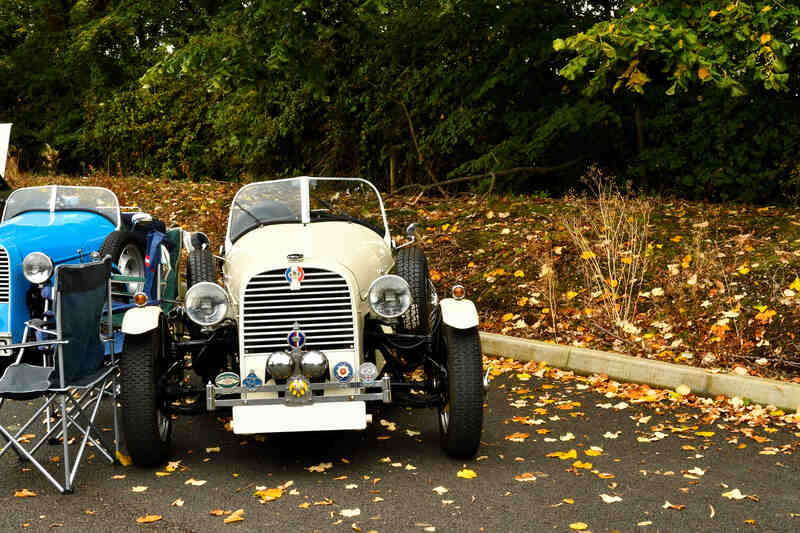 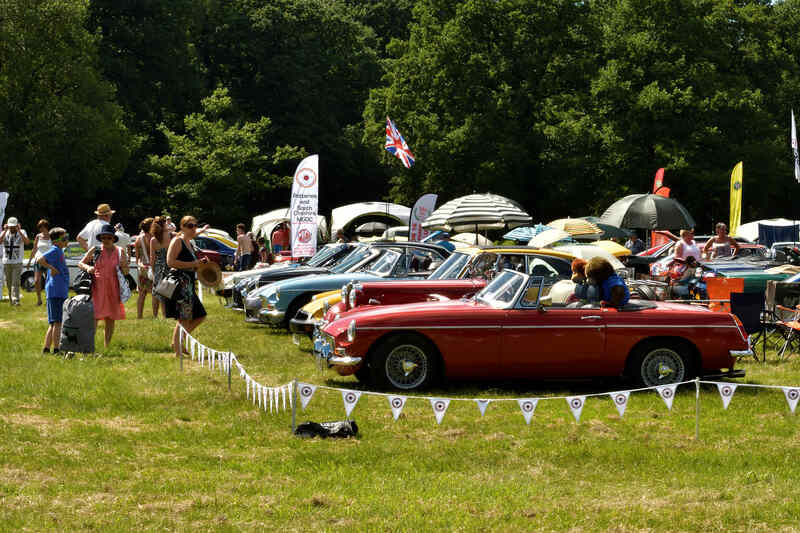 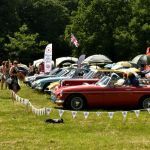 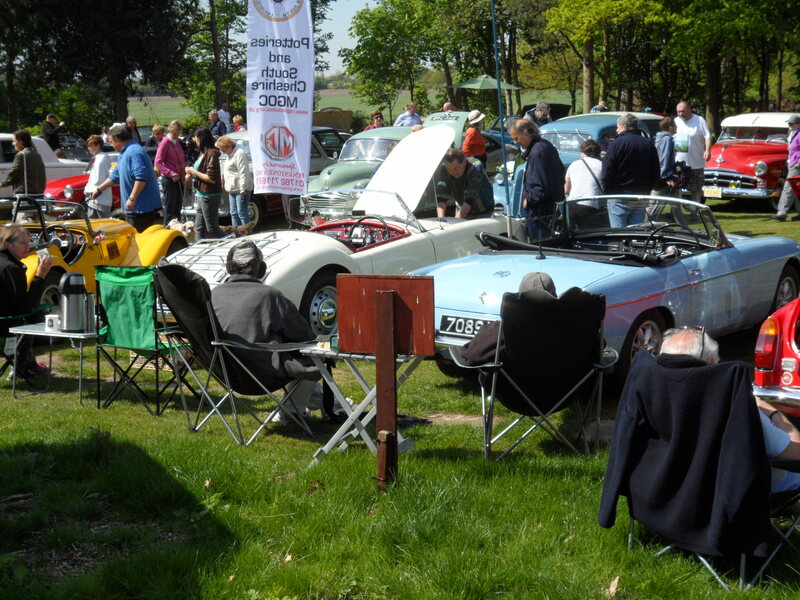 This is a busy event and always fills up early with a wide range of classic cars on display. 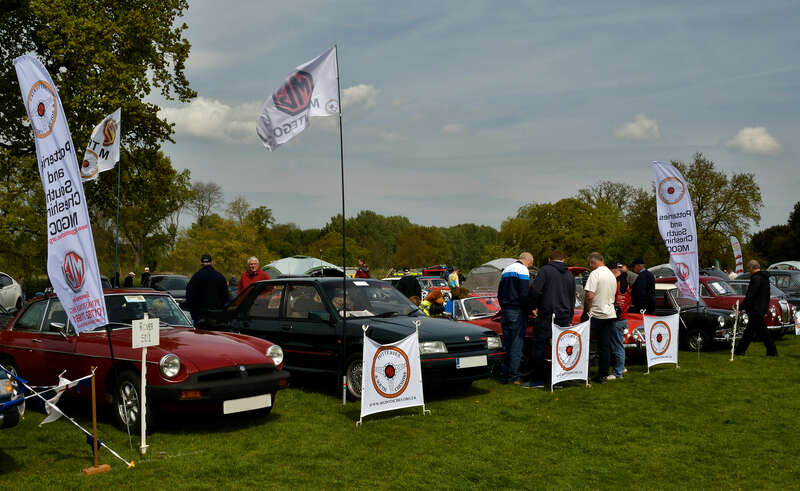 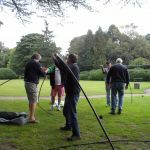 Not quite the weather we had last year, however it was still a highly enjoyable day for the club and the enthusiasts attending. 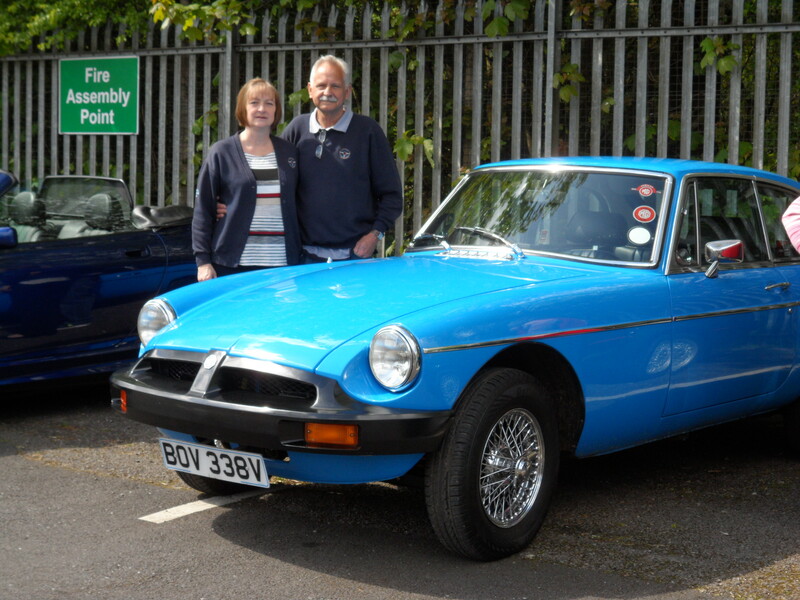 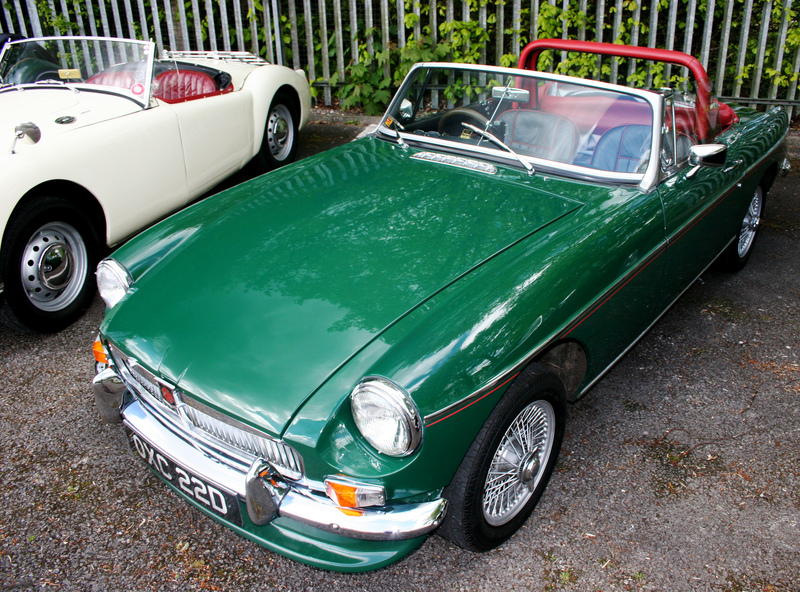 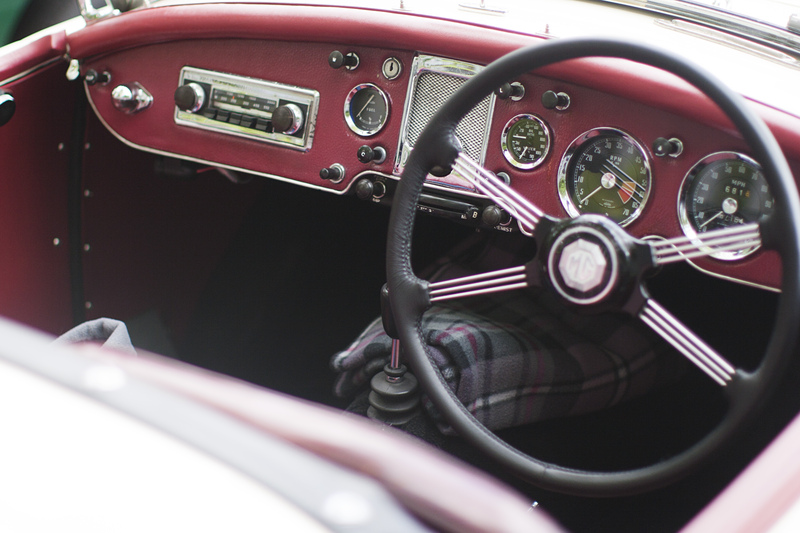 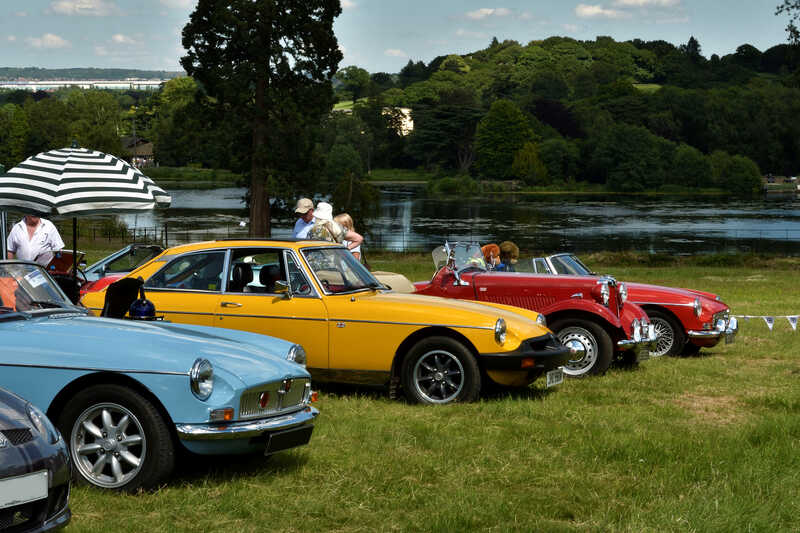 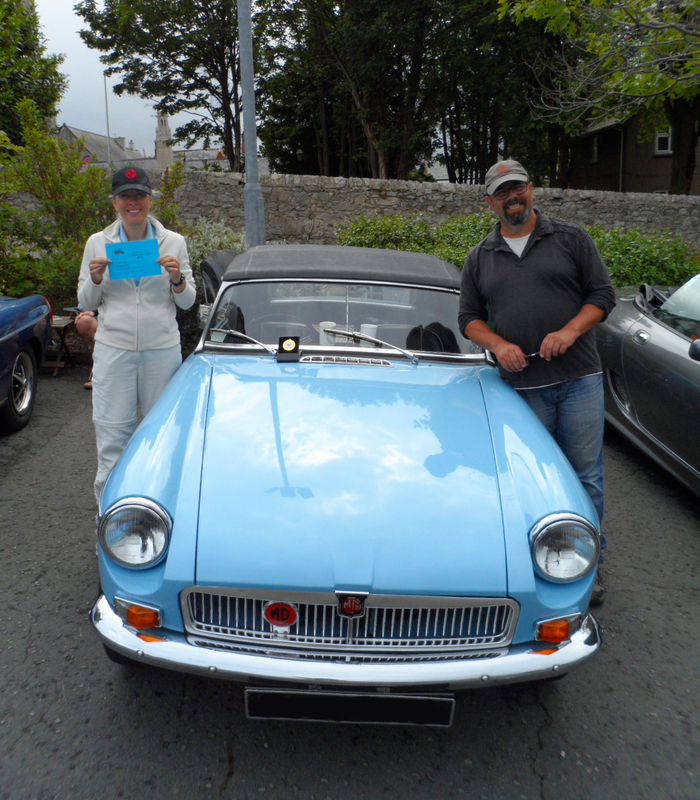 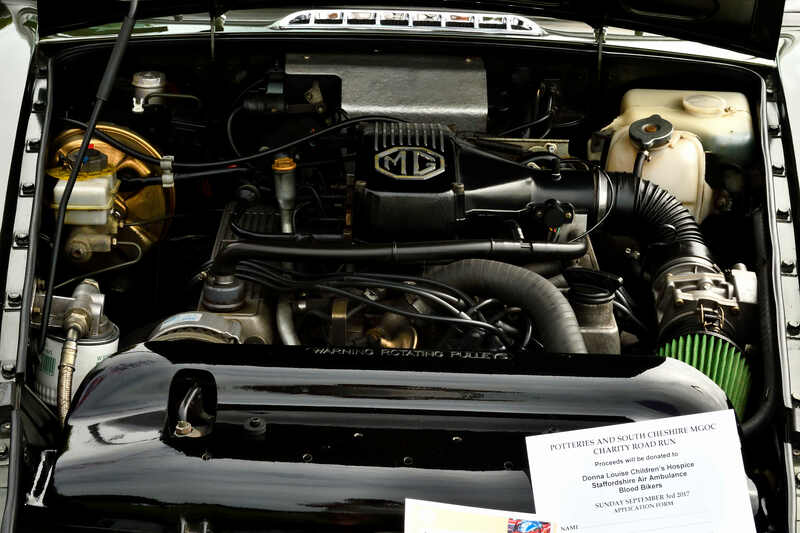 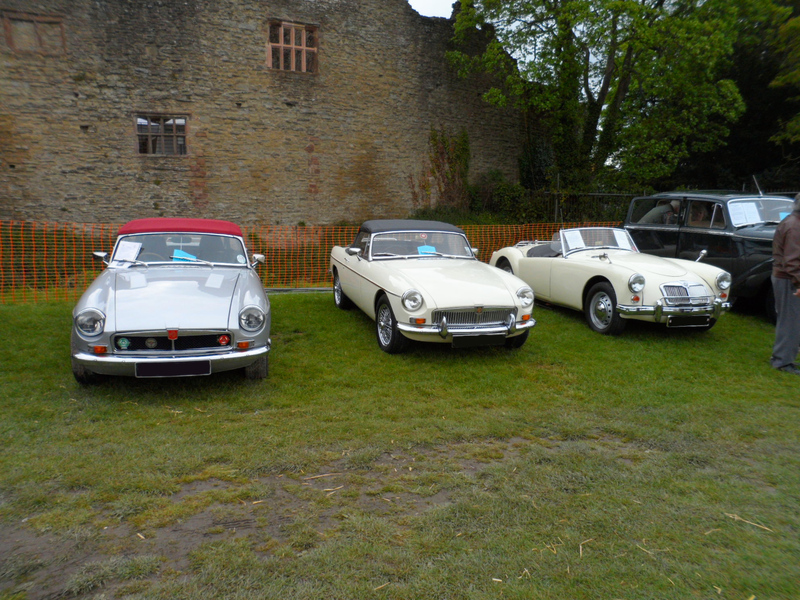 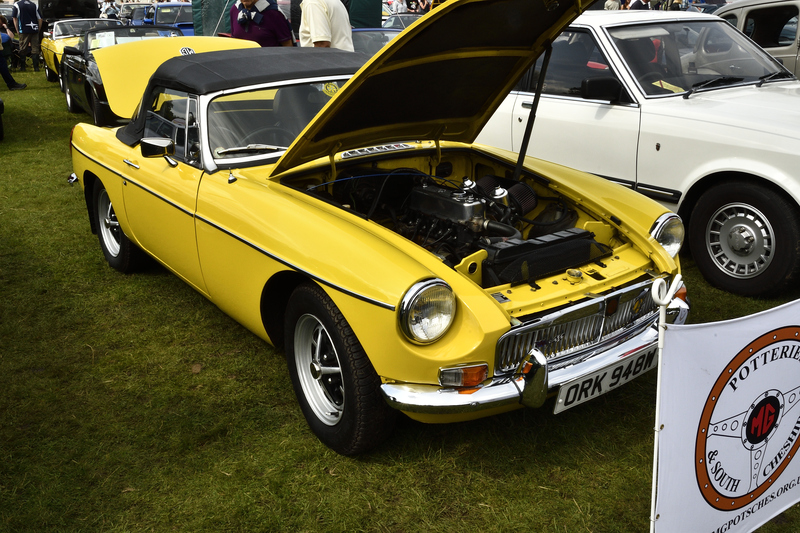 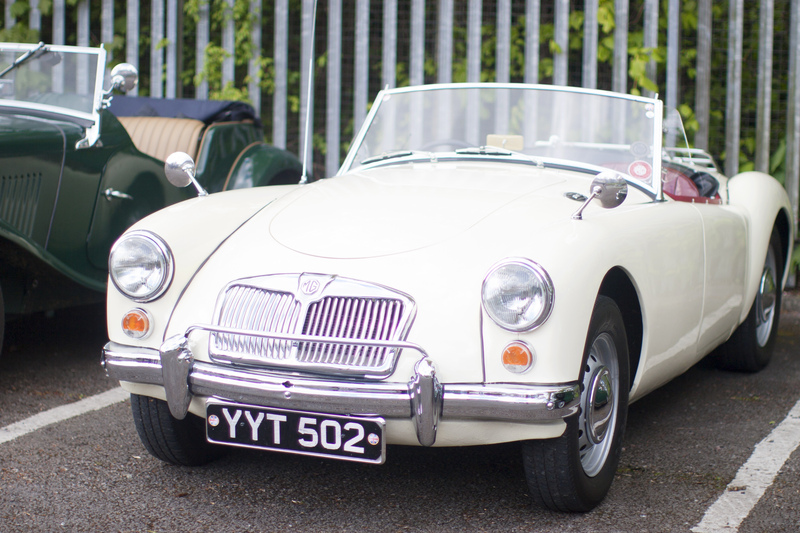 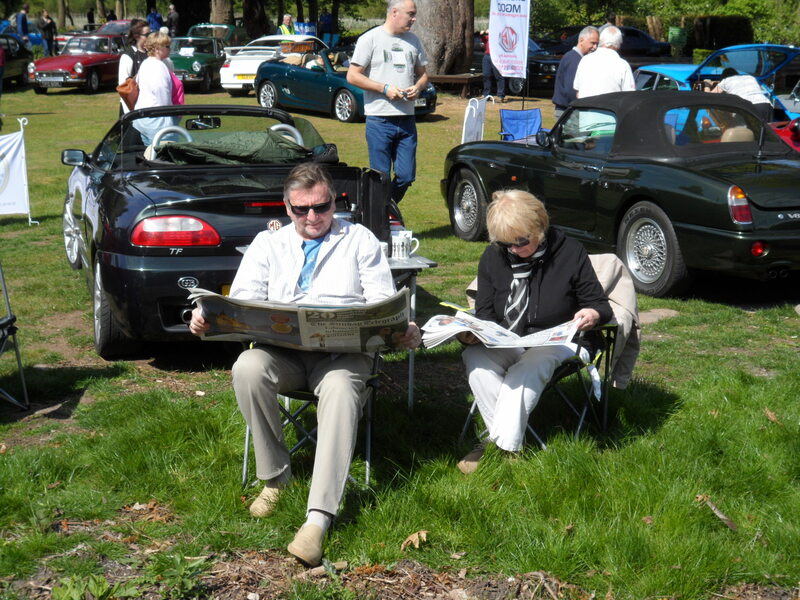 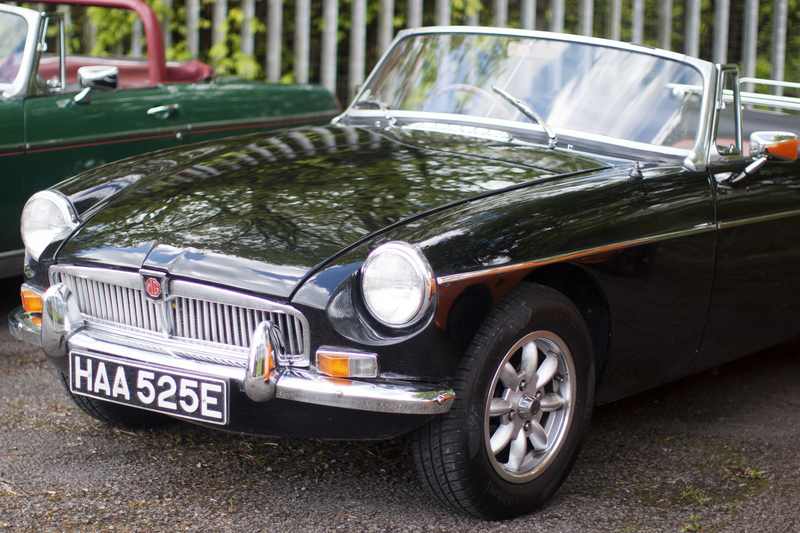 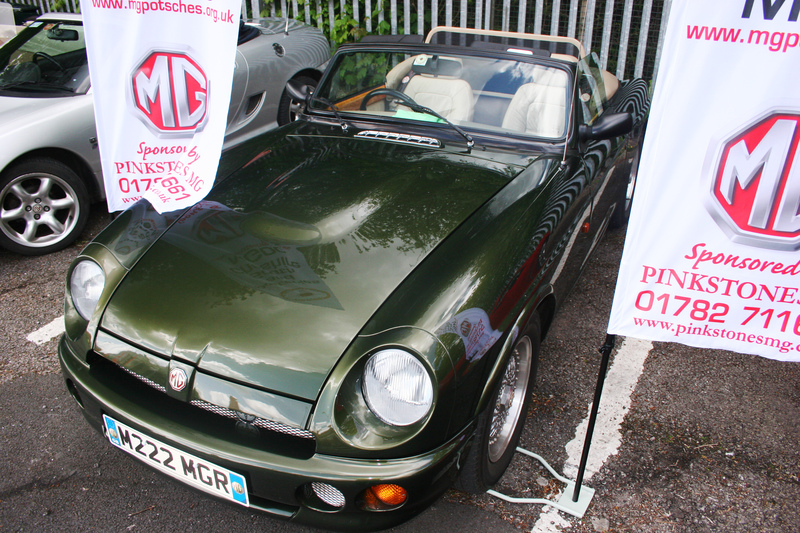 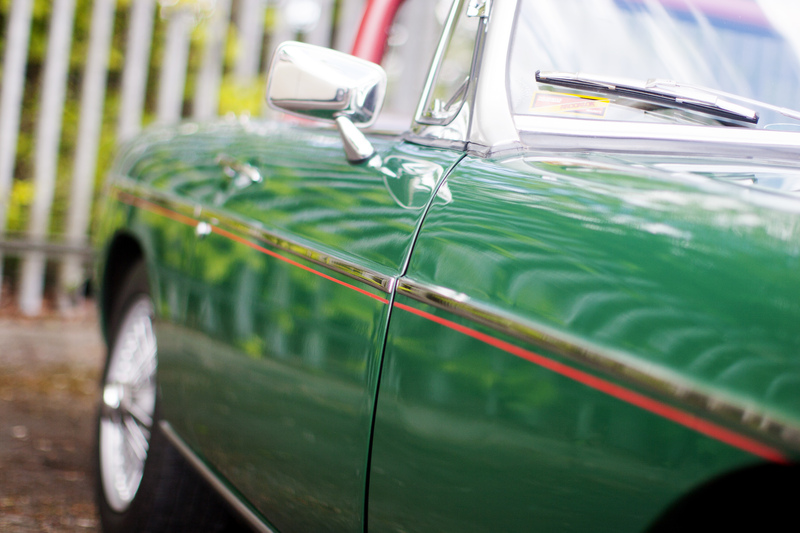 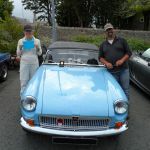 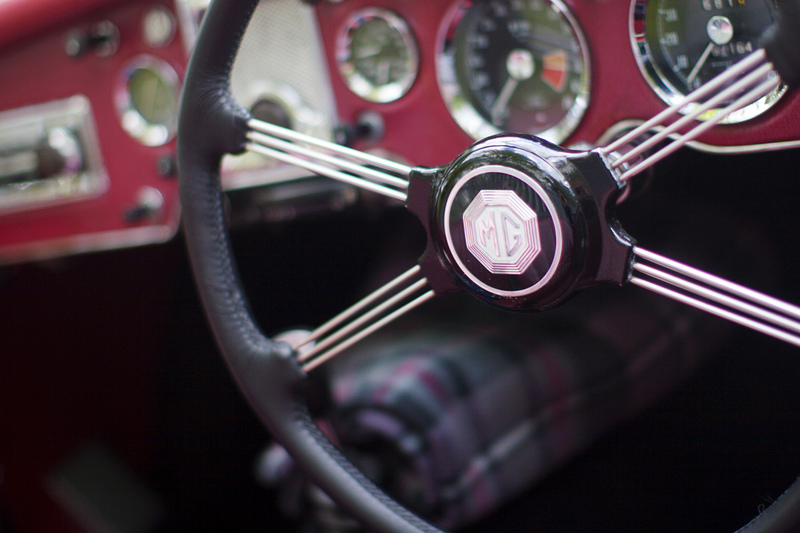 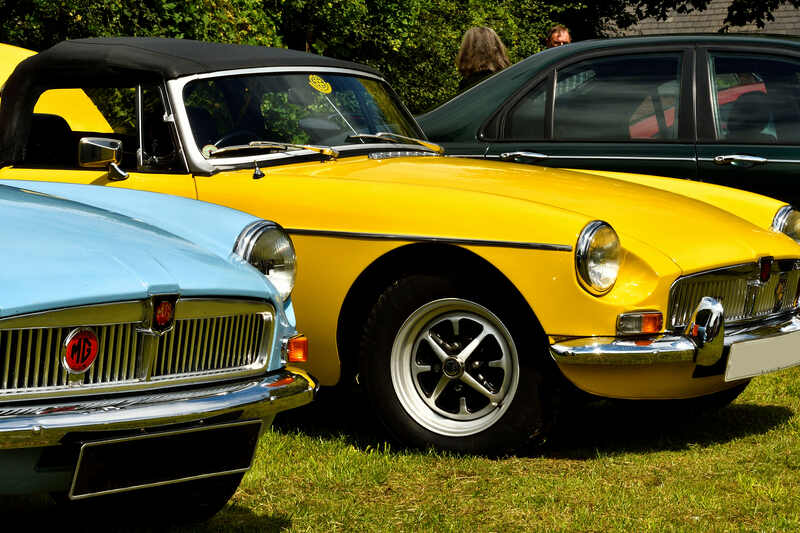 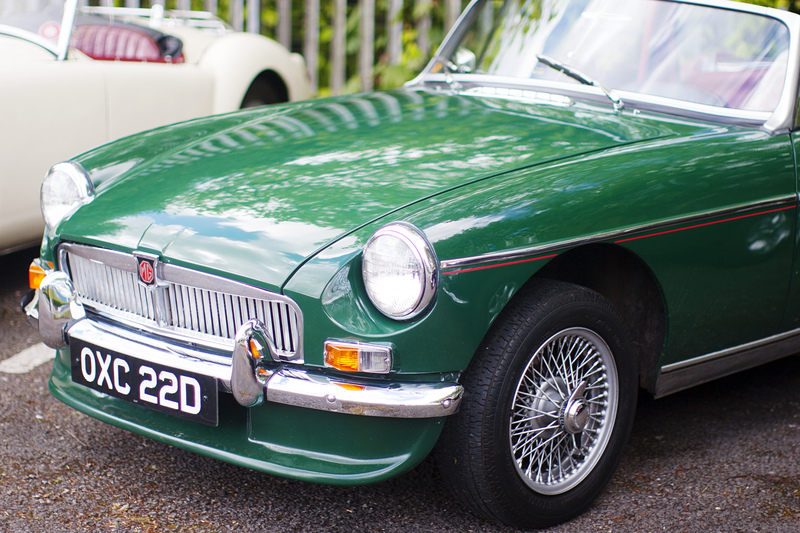 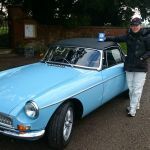 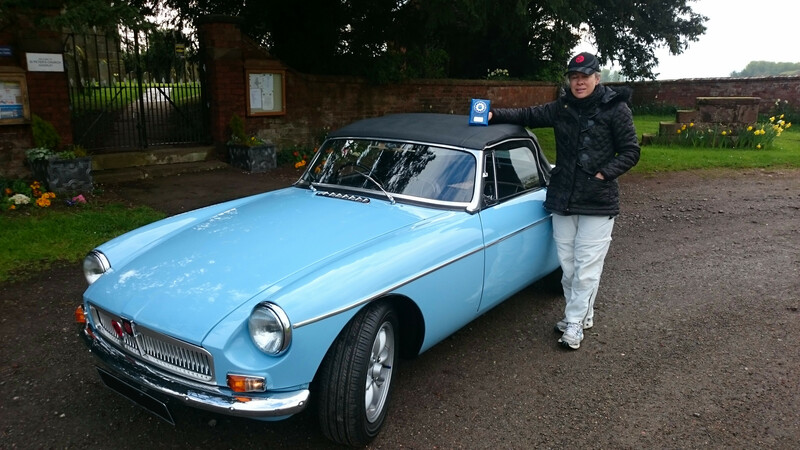 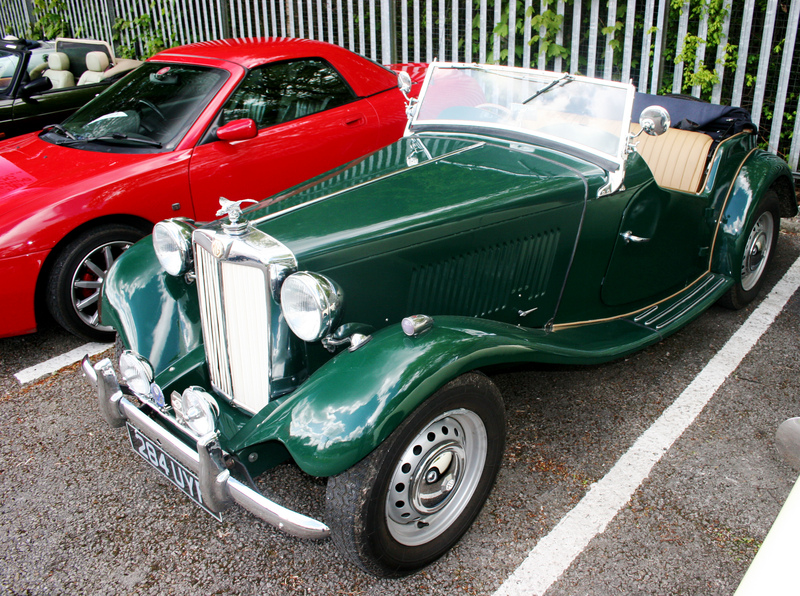 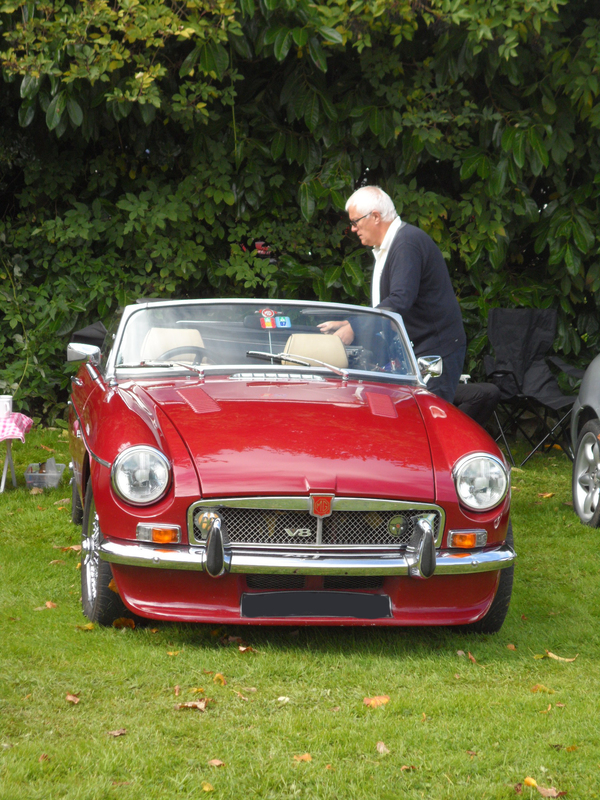 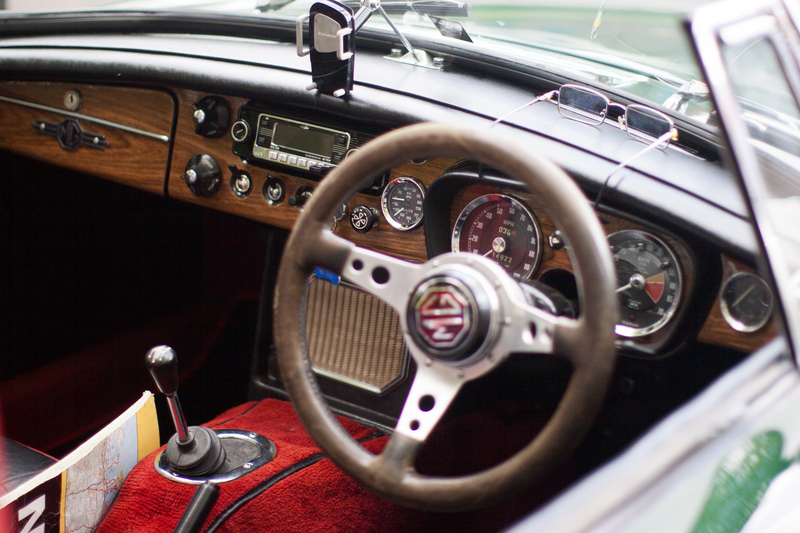 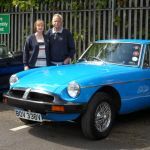 Also congratulations to Helen and Clive Mollart who won a show prize for their beautiful MGB – well done !! 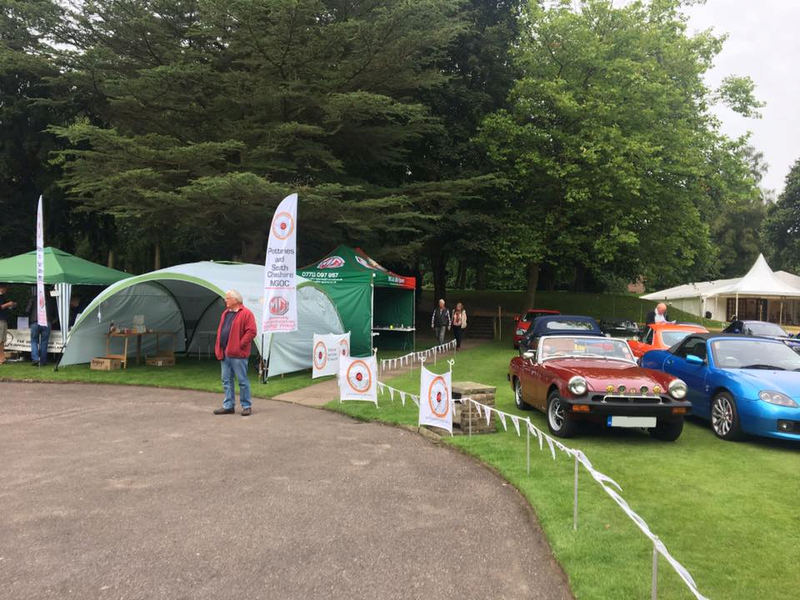 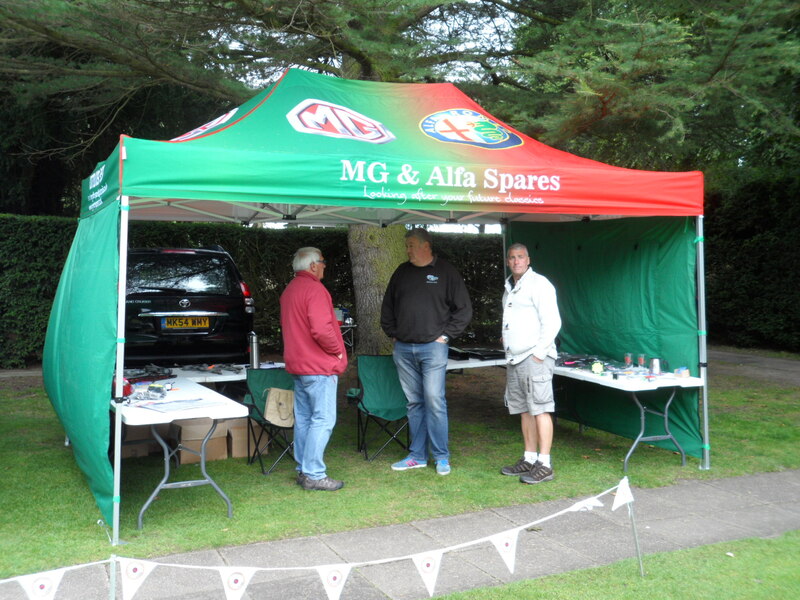 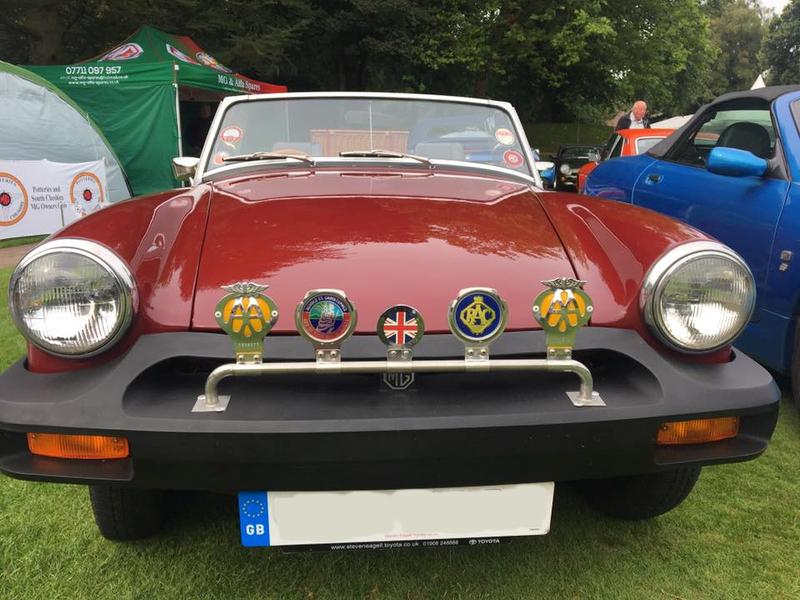 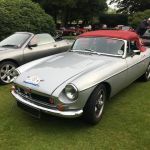 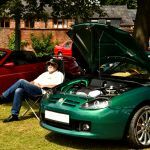 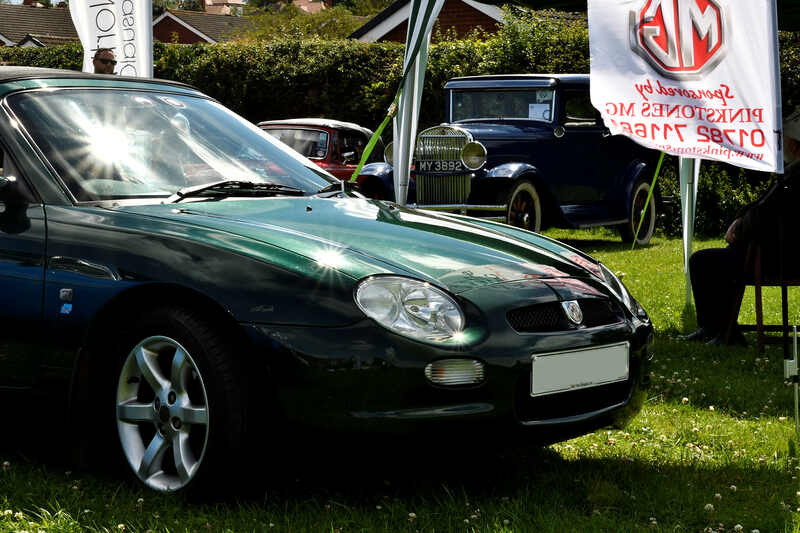 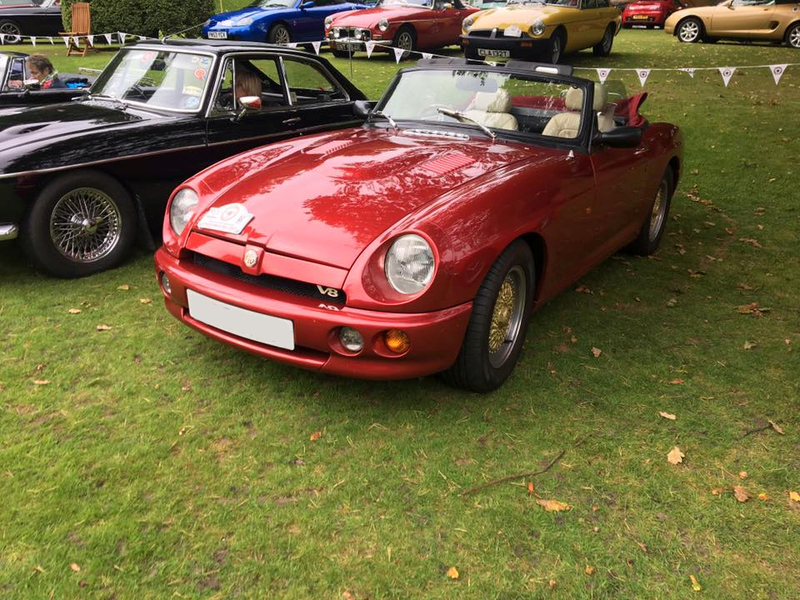 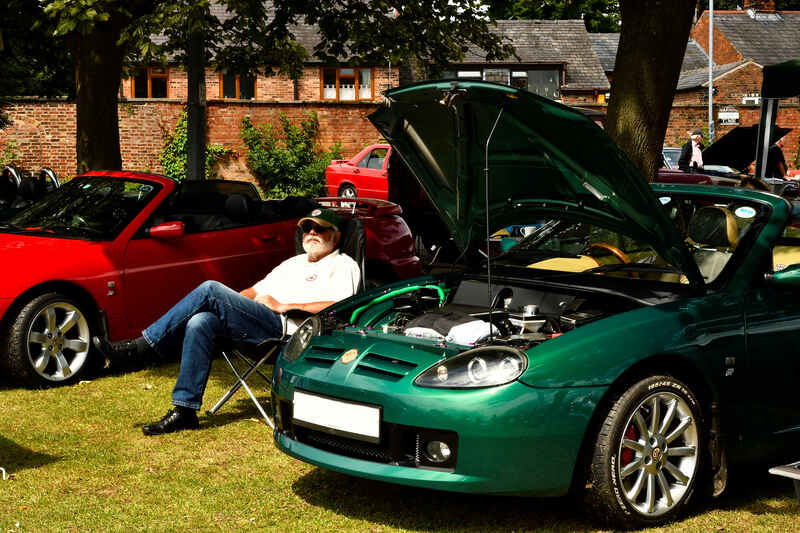 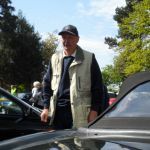 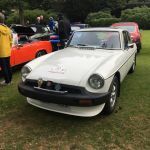 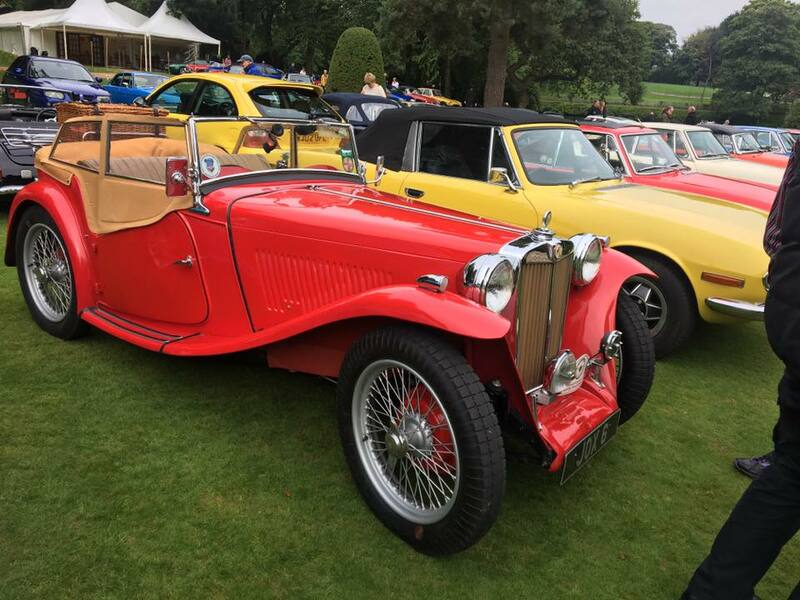 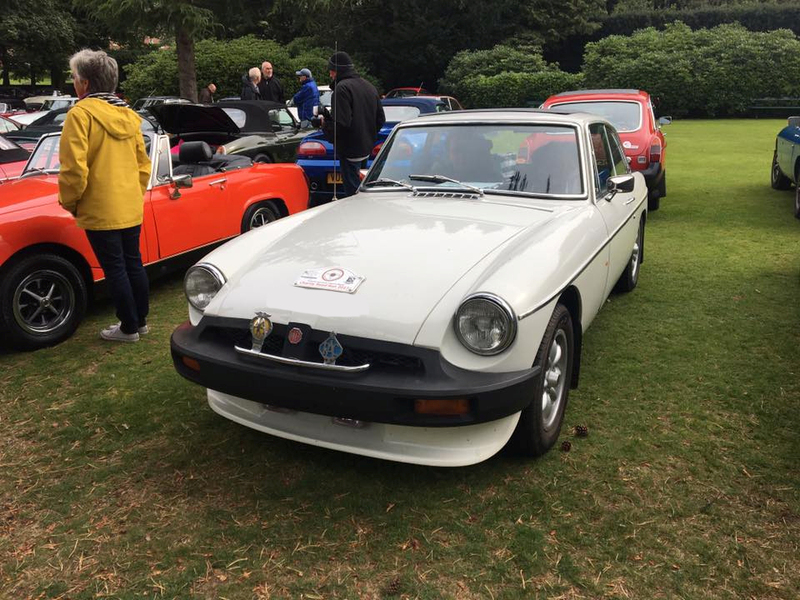 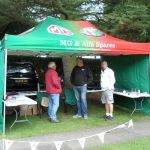 Another fantastic car show at Tatton with a massive variety of cars and autotjumble, we had a great two days putting on display a wide range of MG`s including a rare MG YB owned by Keith who won a show award for his superb example. 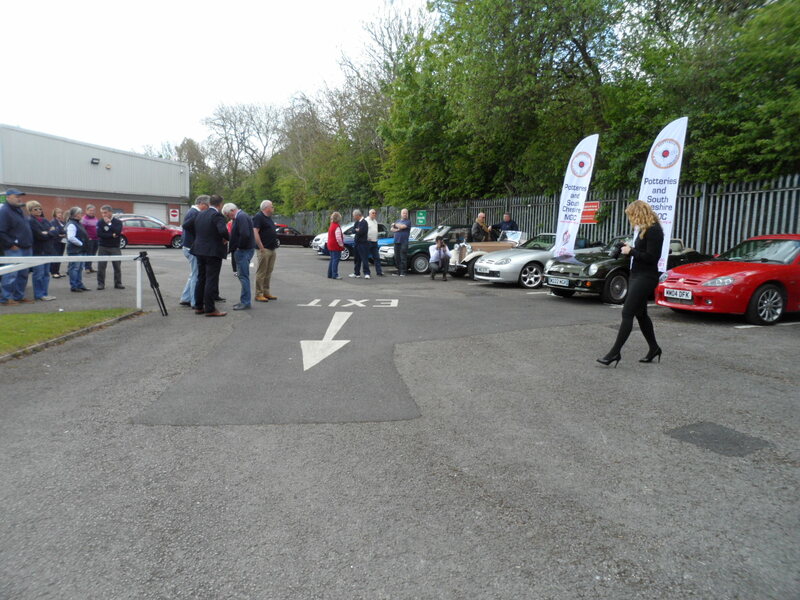 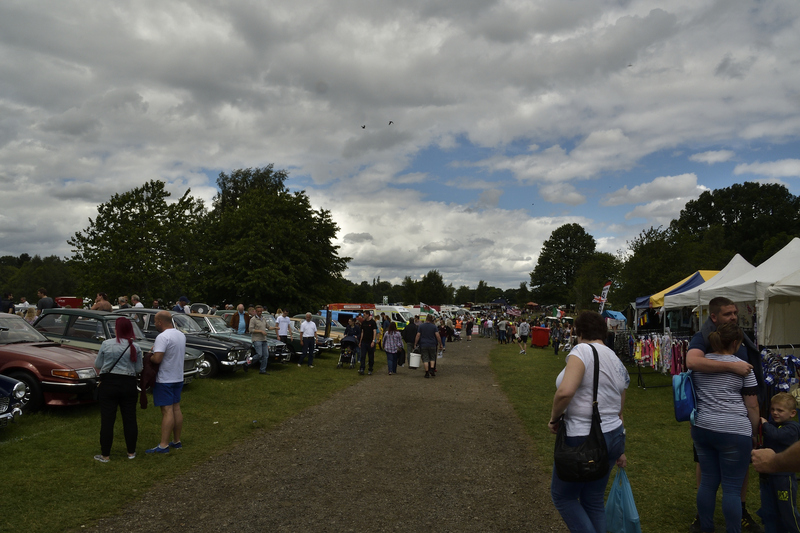 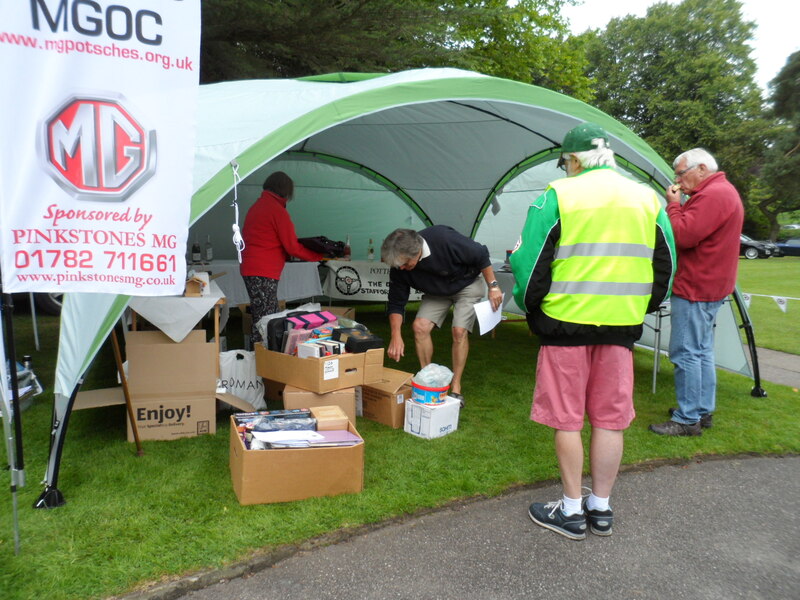 Weather was a bit hit and miss on the Sunday but the crowds turned out on both days and great time was had by all, although its fair to say most members wallets were a little lighter going home thanks to the autojumble !!! 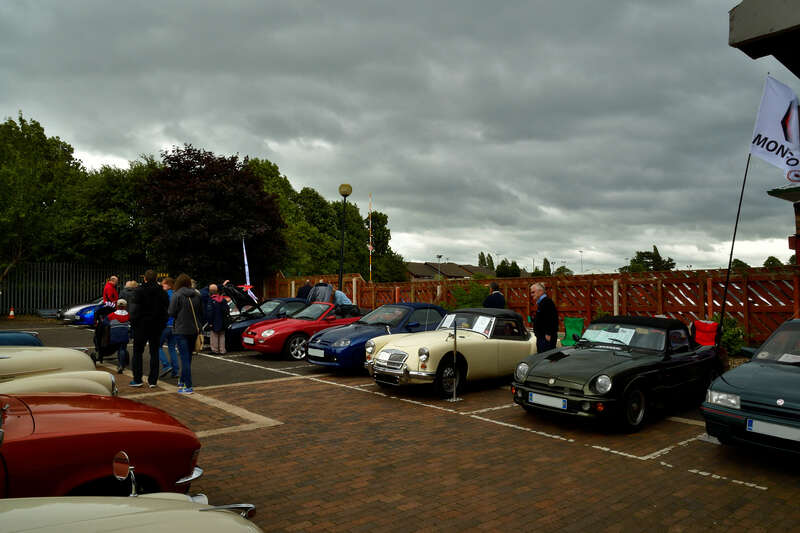 The club put on a display at a great little car show run by the The British Commercial Vehicle Museum, Leyland, it was well organised and very friendly, there was a great turn out of visitors despite the weather not being the best. 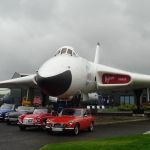 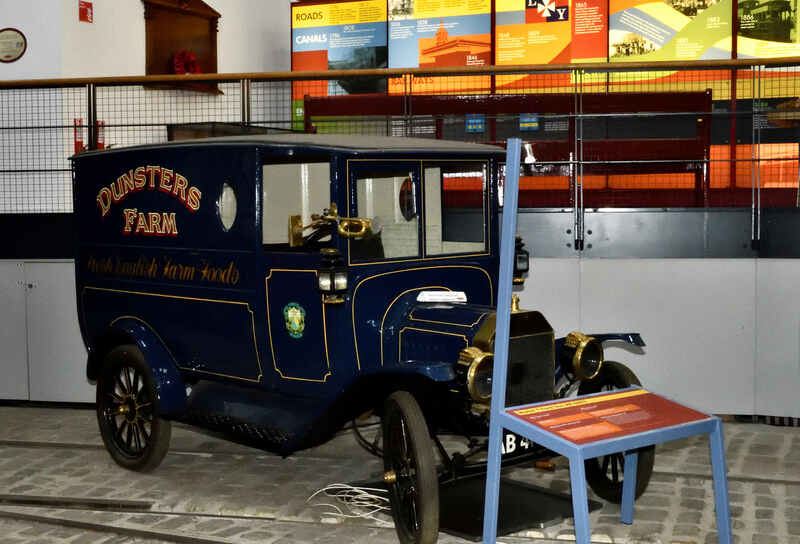 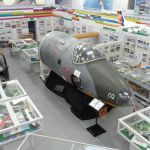 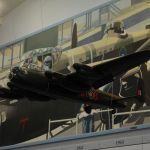 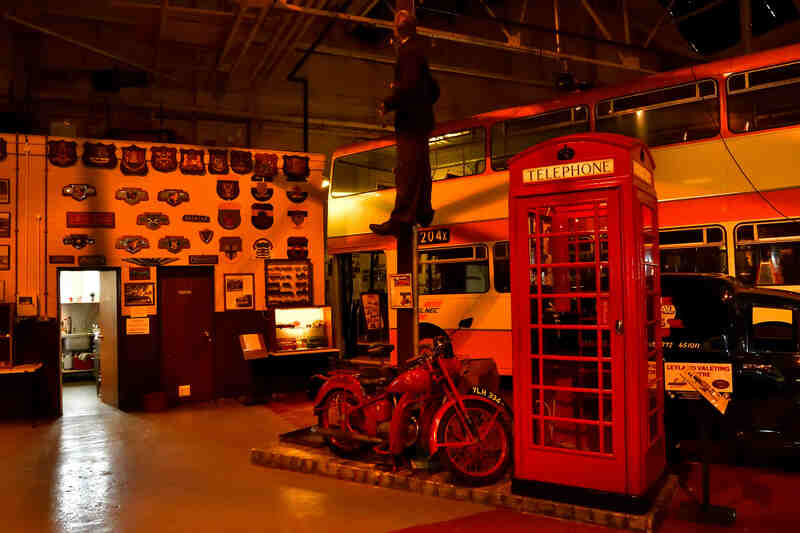 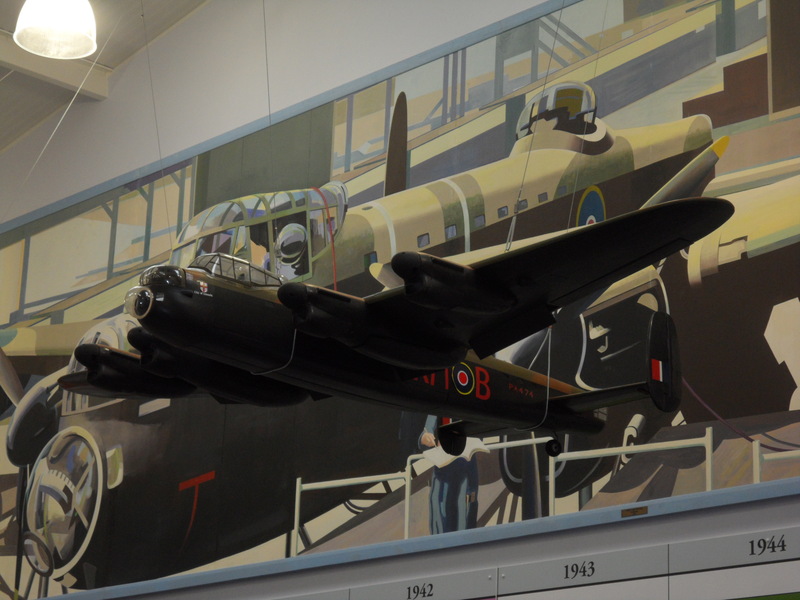 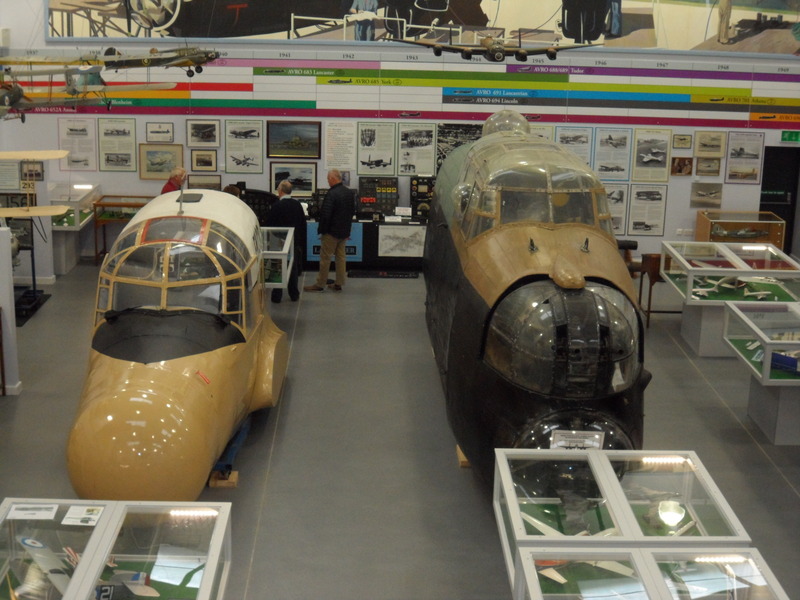 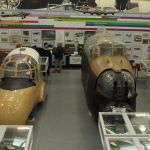 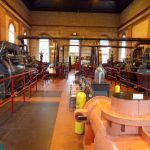 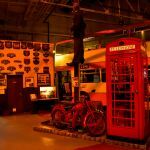 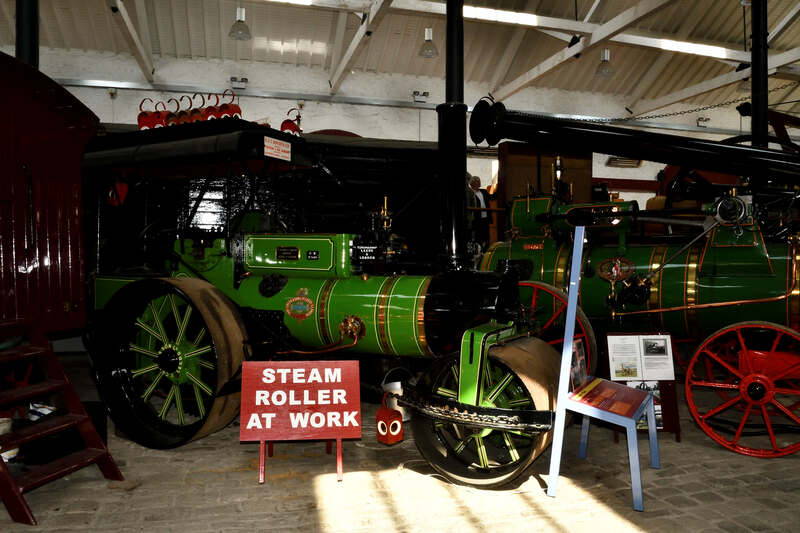 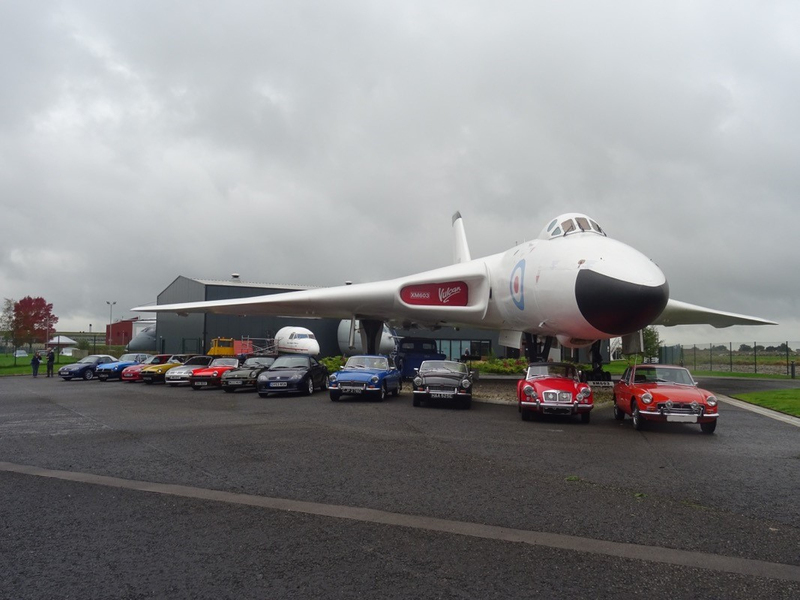 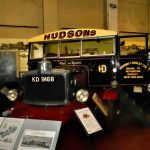 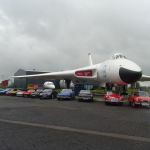 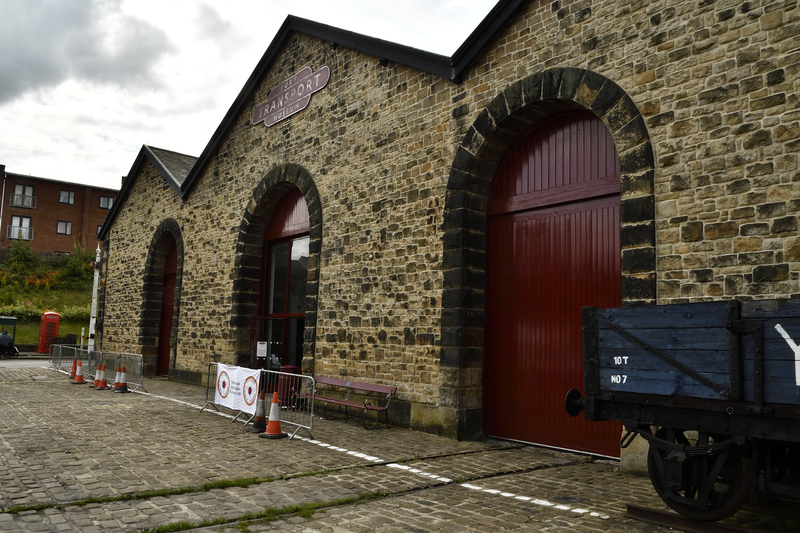 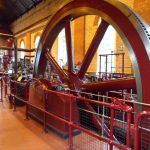 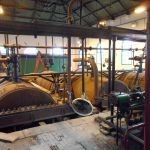 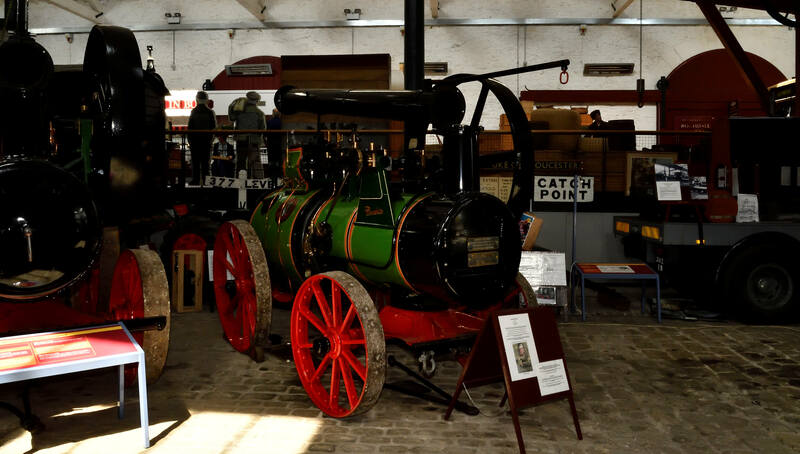 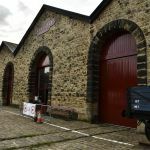 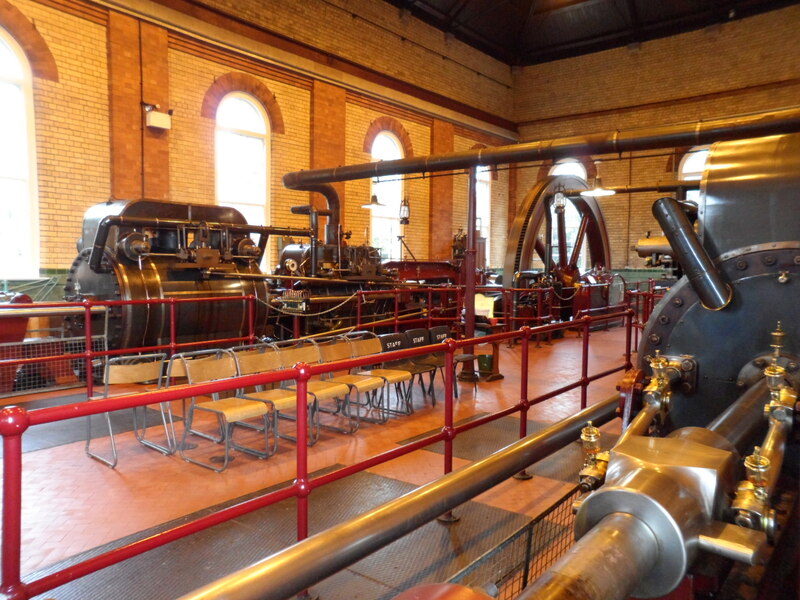 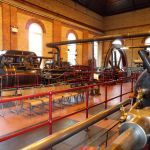 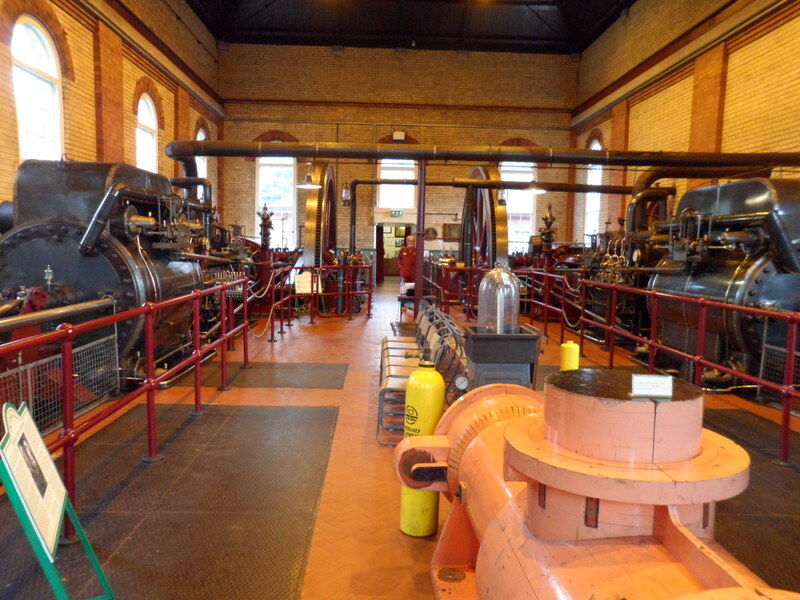 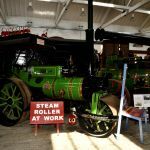 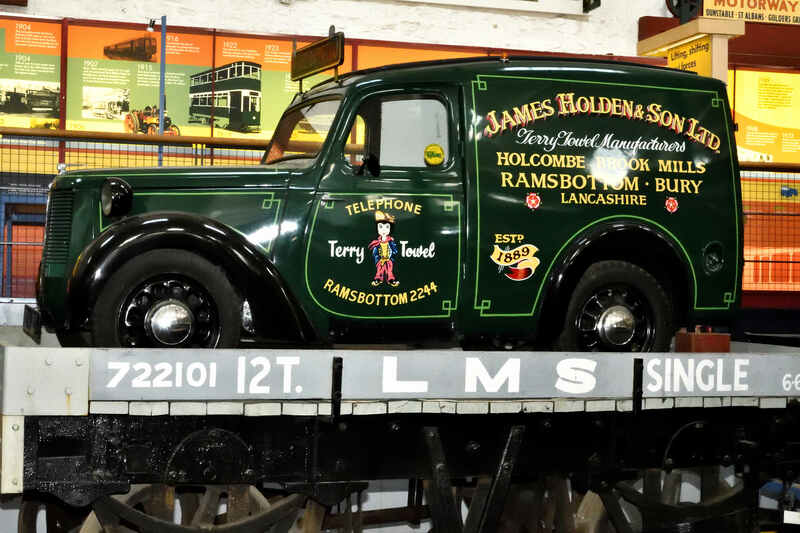 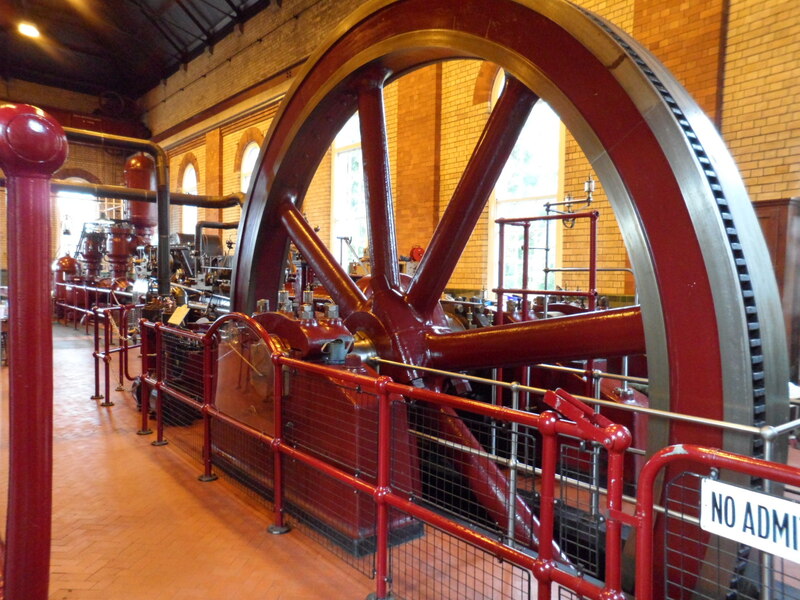 Its cracking museum with a nice little cafe and a fantastic display of vehicles and well worth a visit to see British vehicle manufacturing heritage. 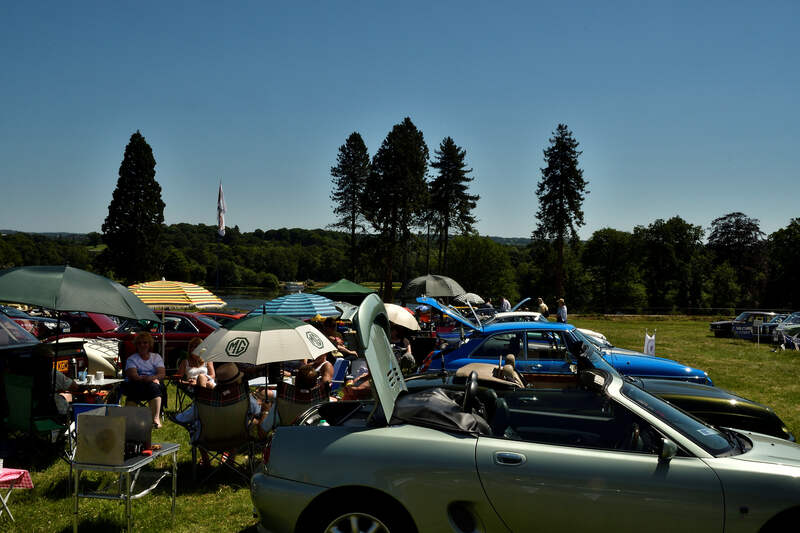 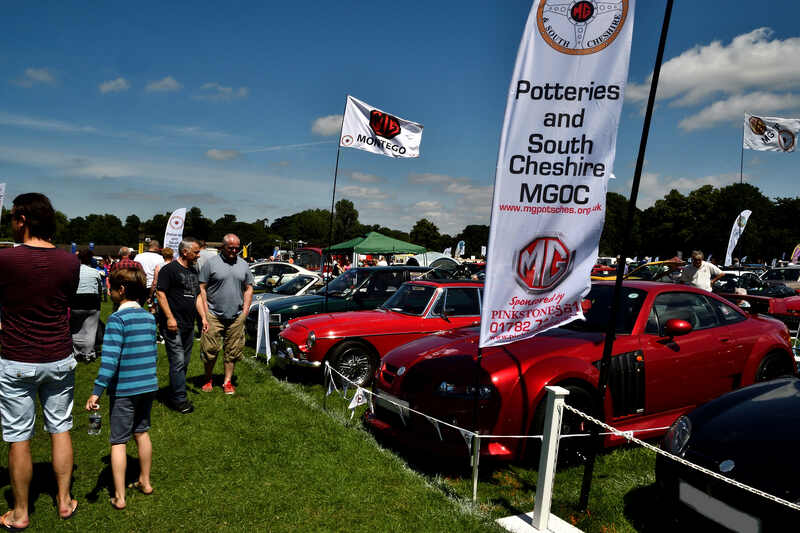 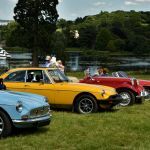 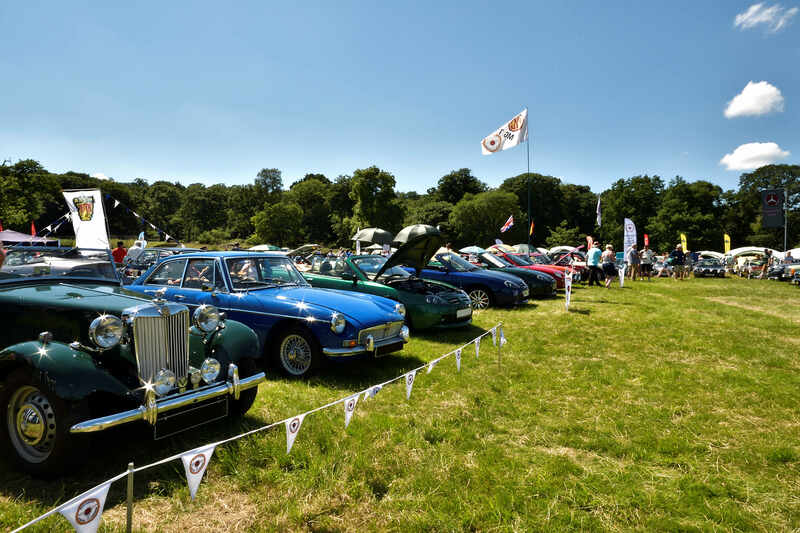 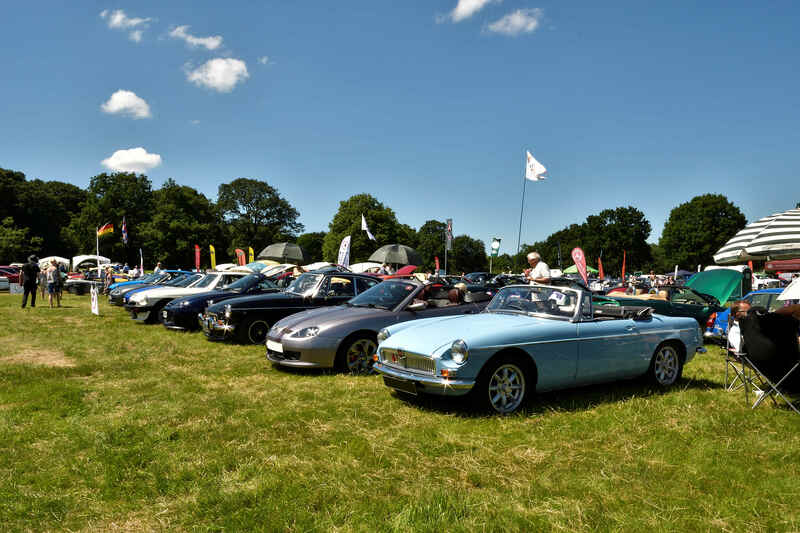 Fantastic display by the club at Trentham Gardens featuring cars from all eras of the MG marque history, weather was fantastic but very very hot !! 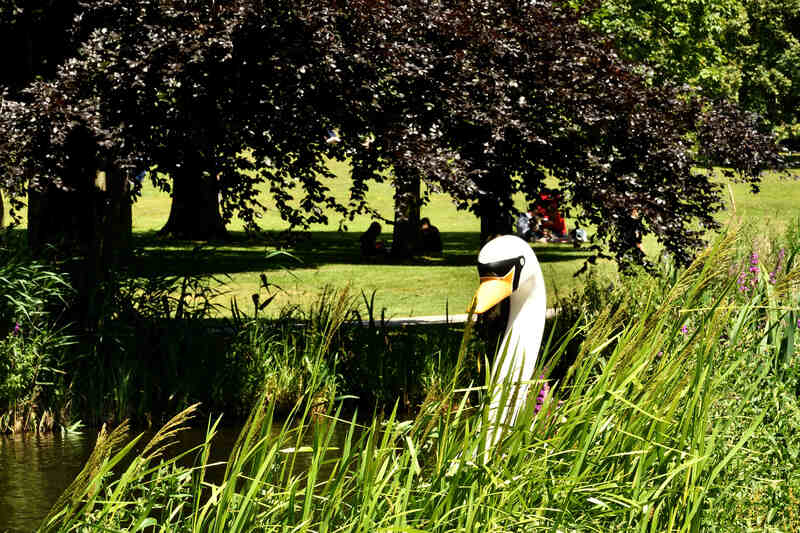 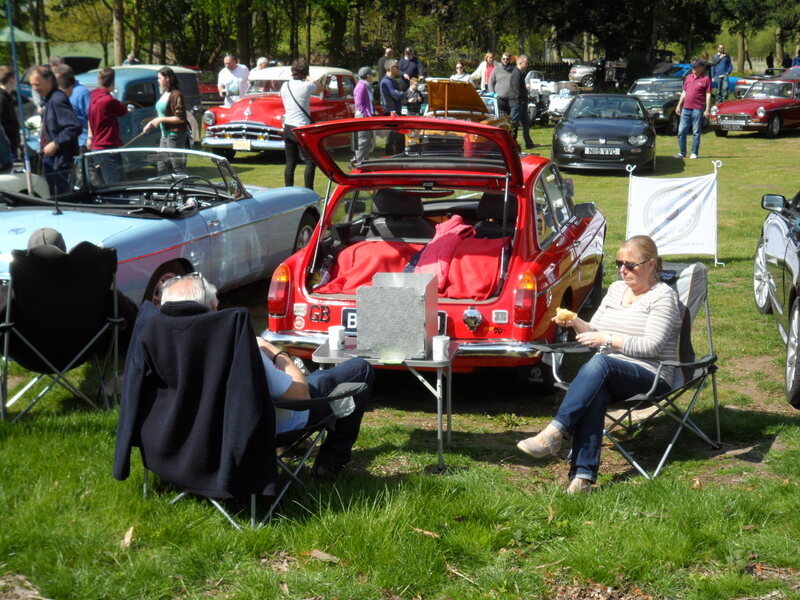 so sun lotion and shades was a must– the crowds turned out and a superb day was had by all. 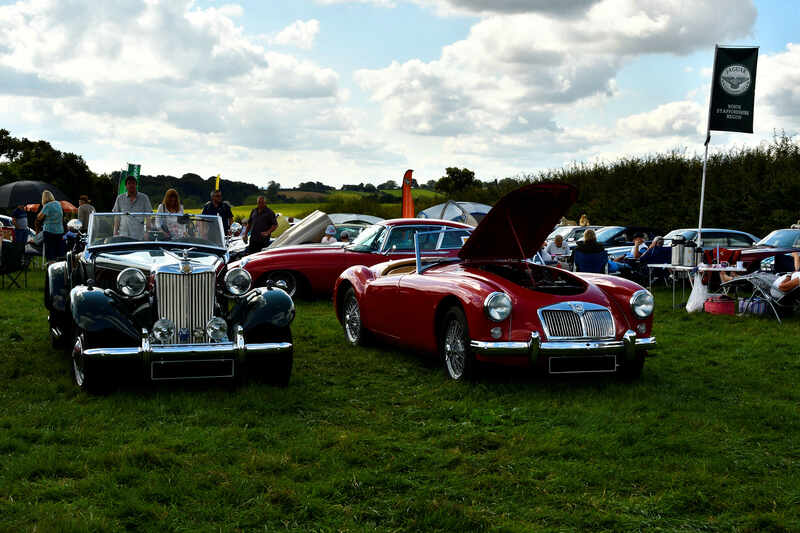 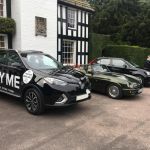 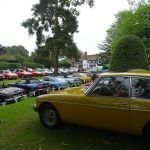 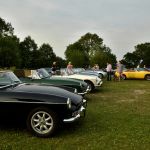 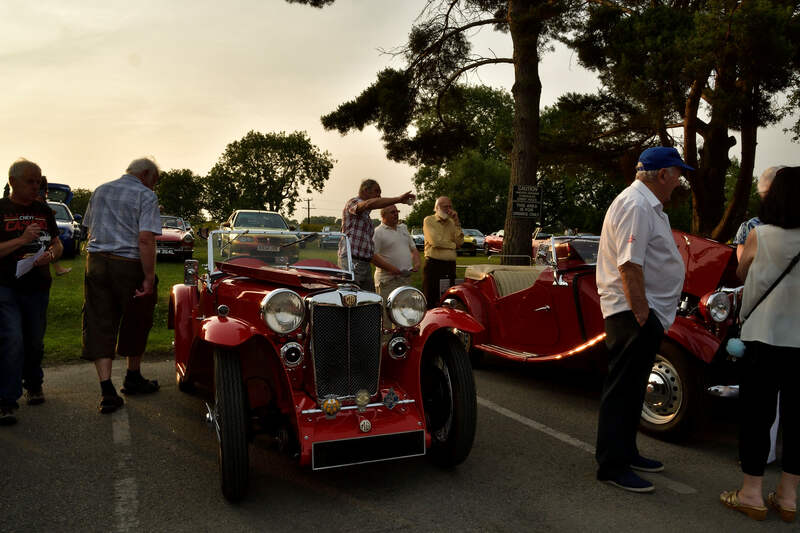 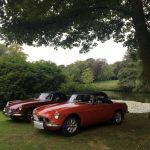 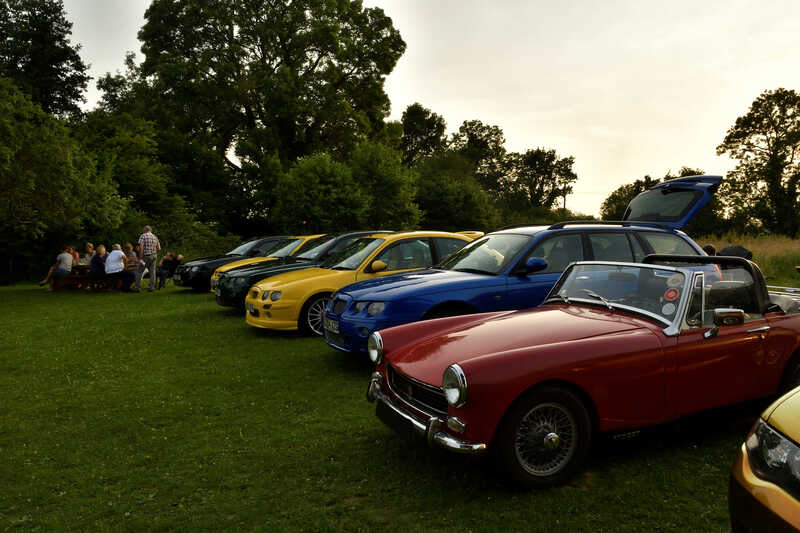 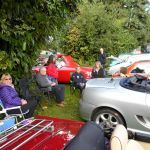 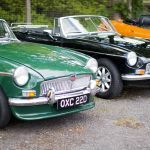 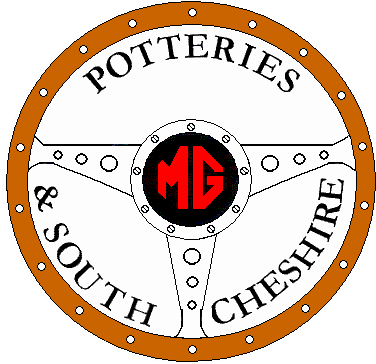 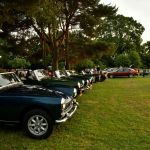 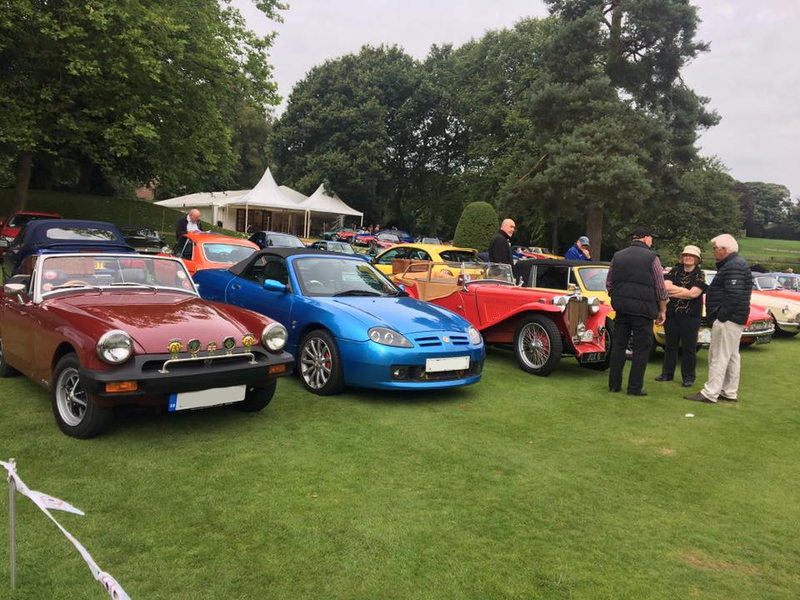 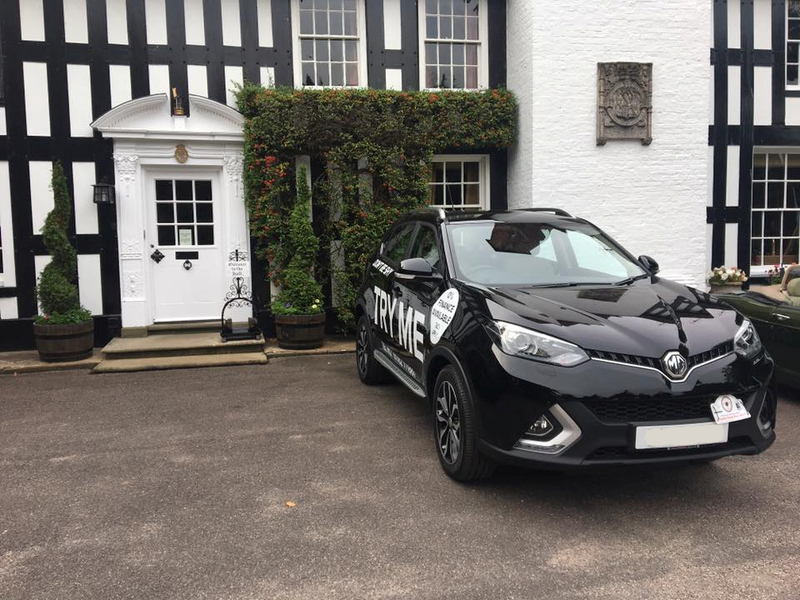 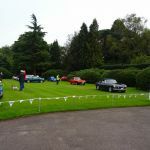 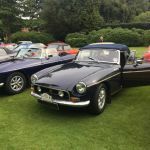 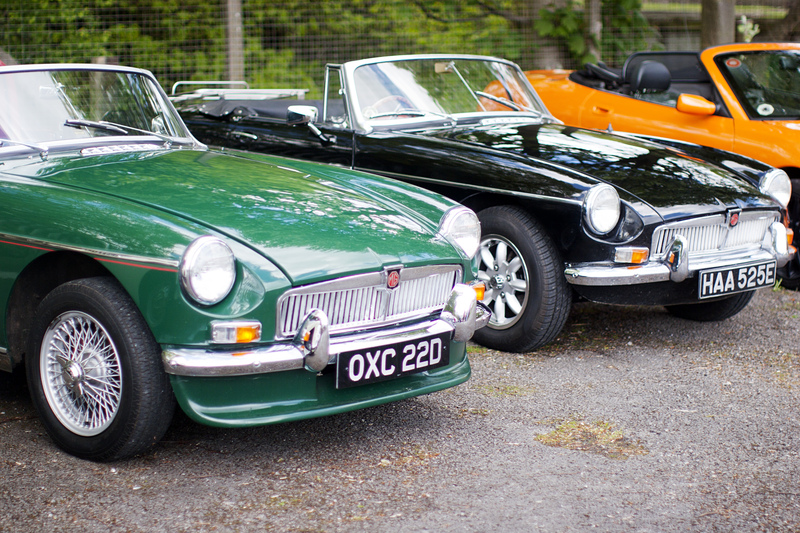 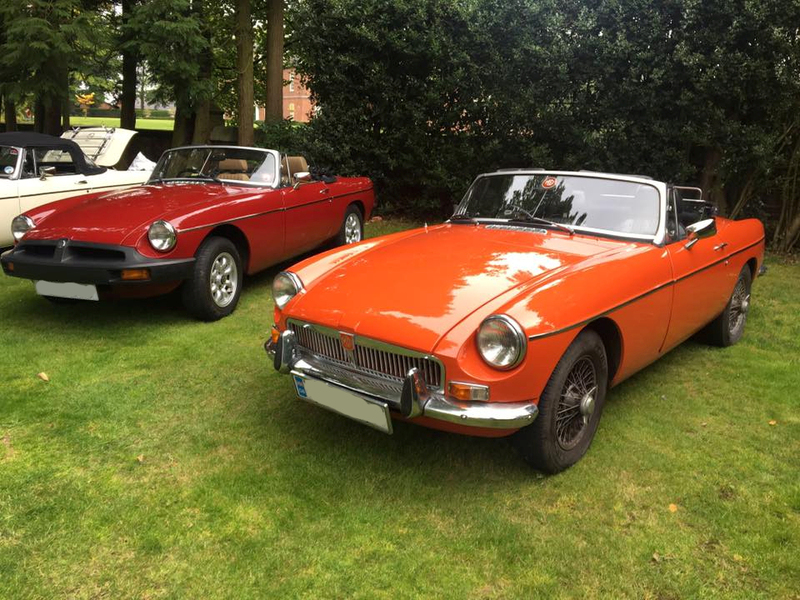 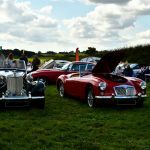 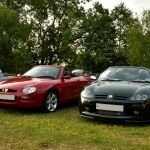 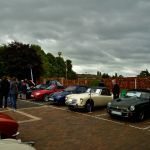 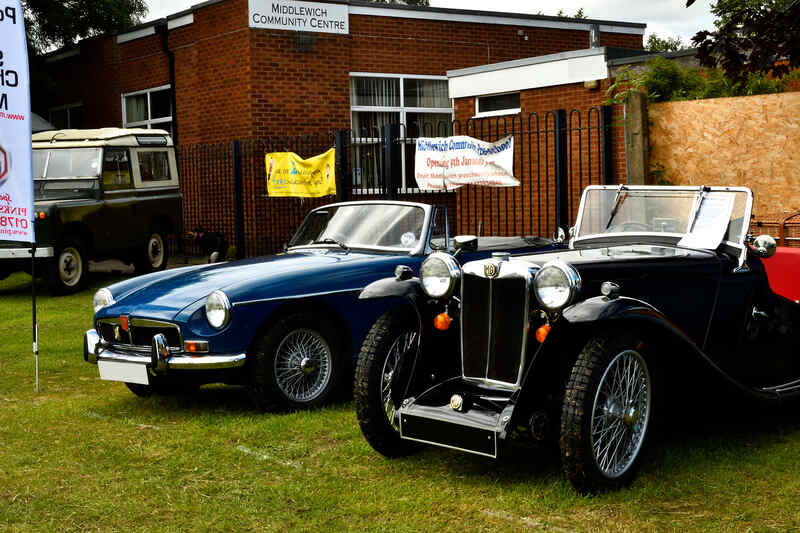 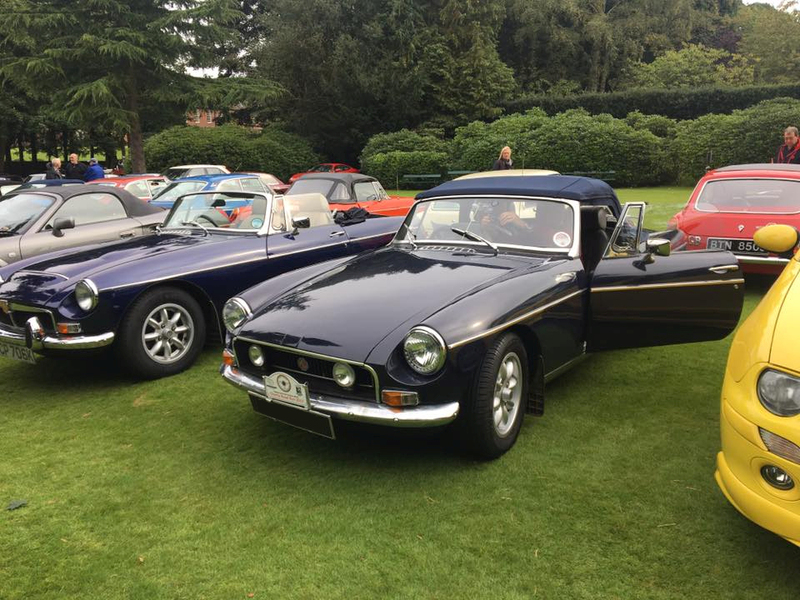 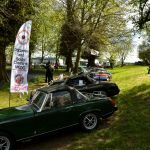 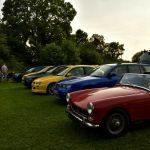 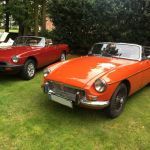 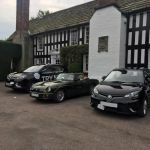 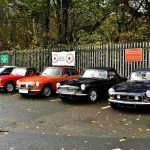 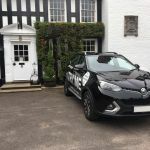 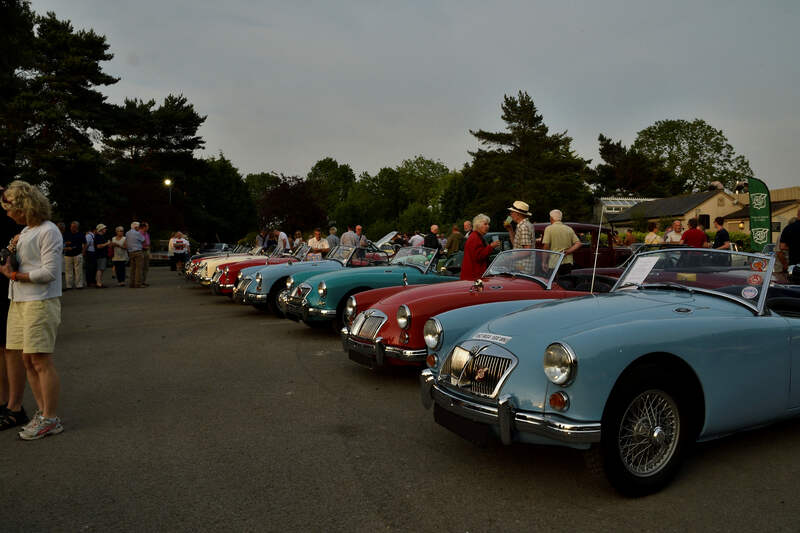 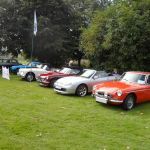 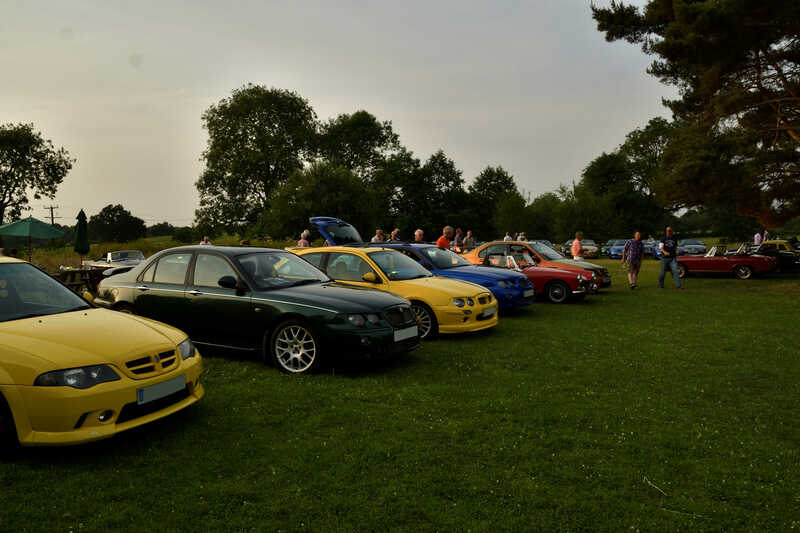 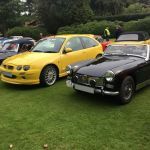 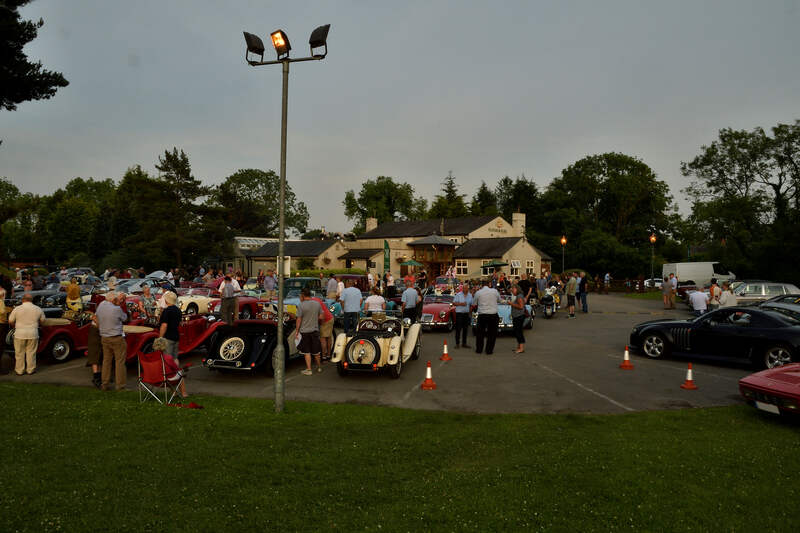 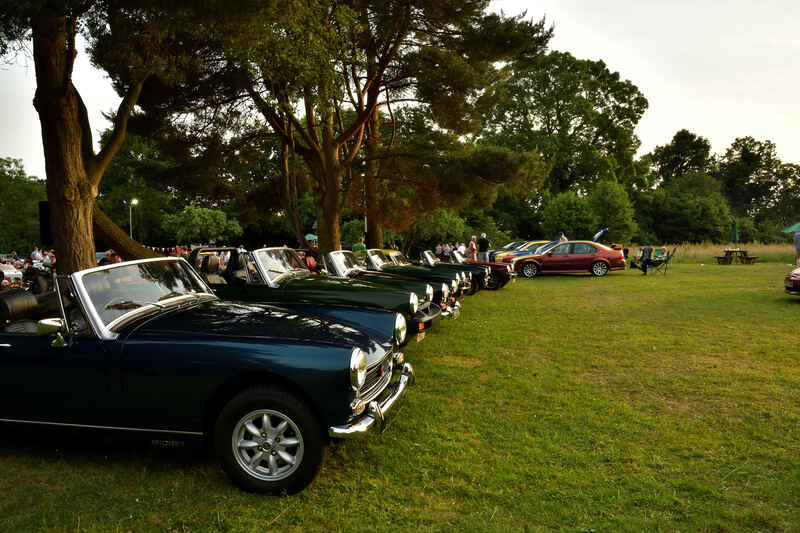 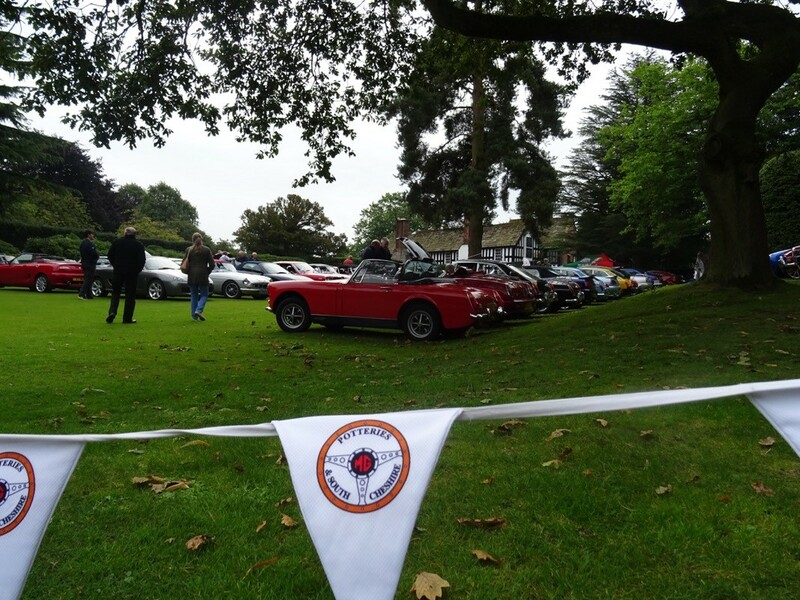 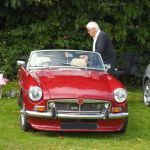 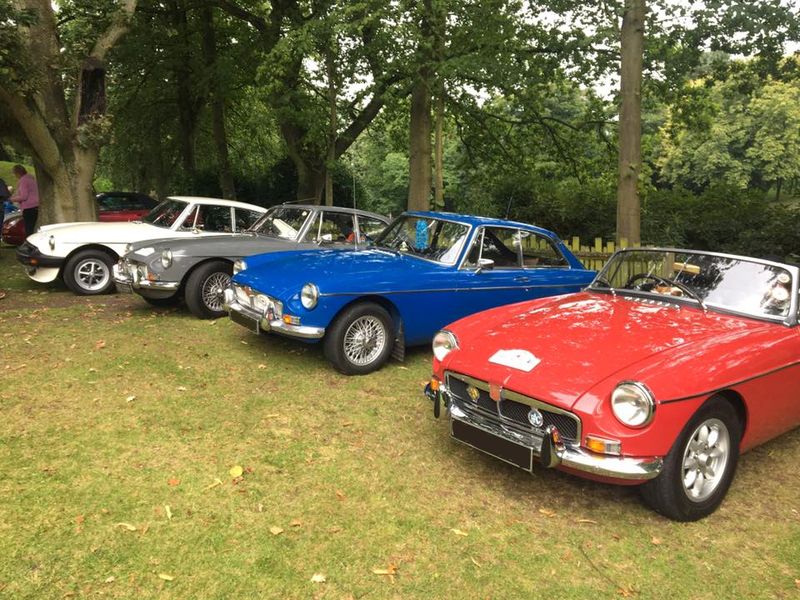 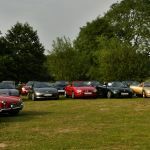 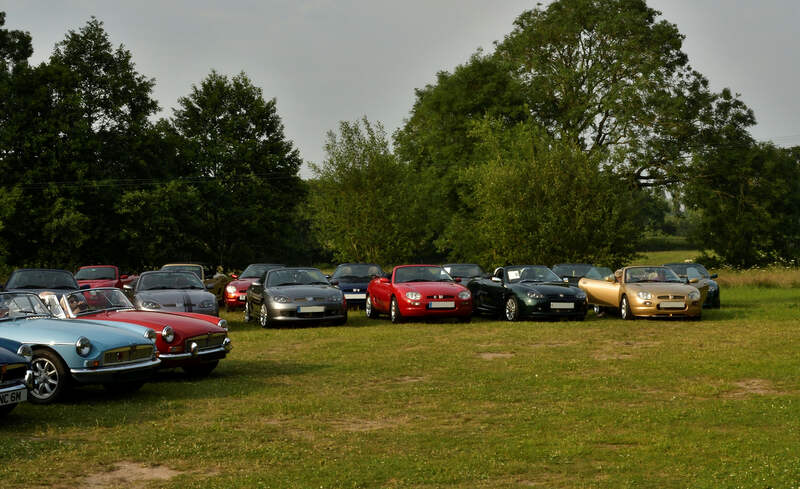 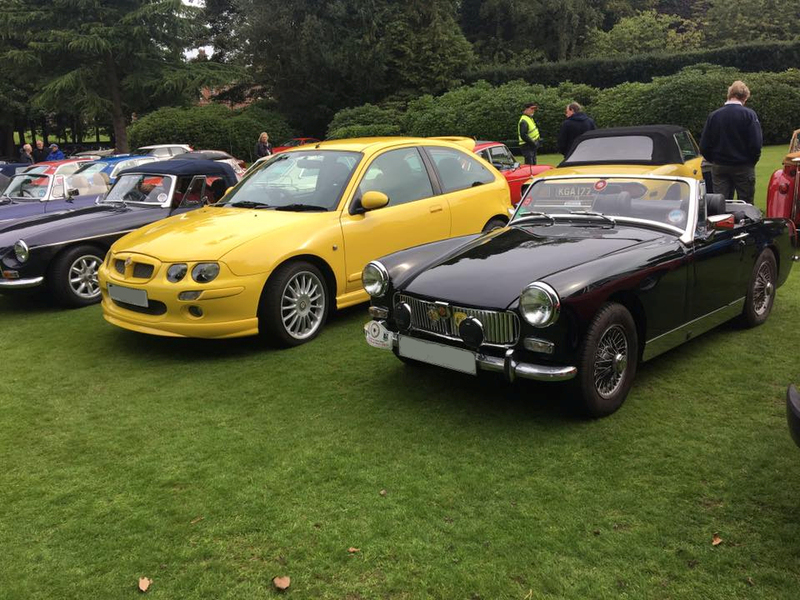 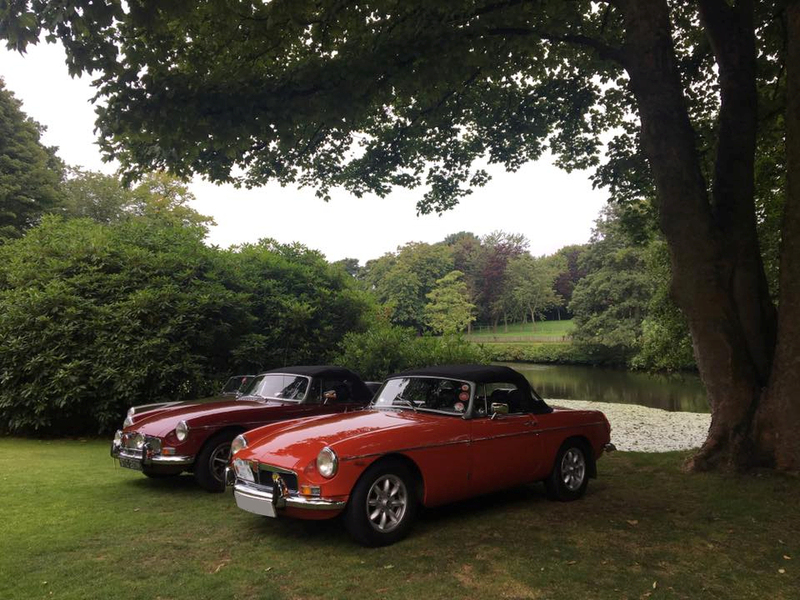 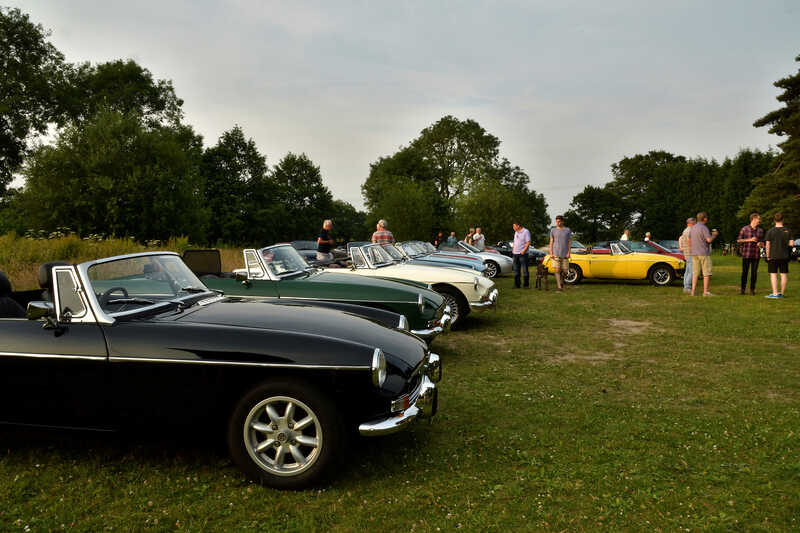 The club attended the annual classic car evening run by the North West MG Car Club at the Plough and Flail in Mobberley. 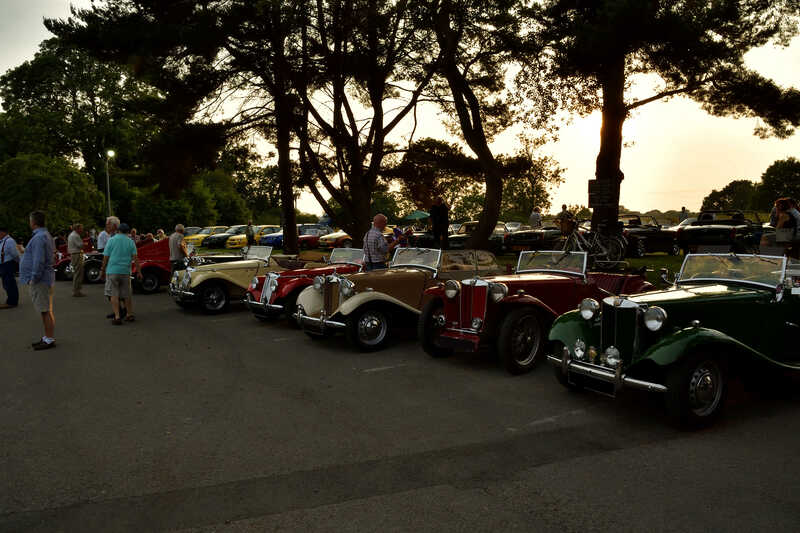 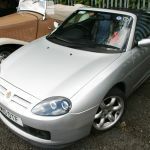 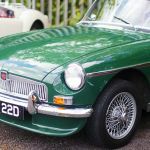 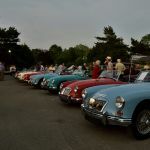 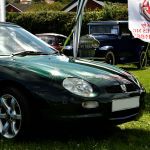 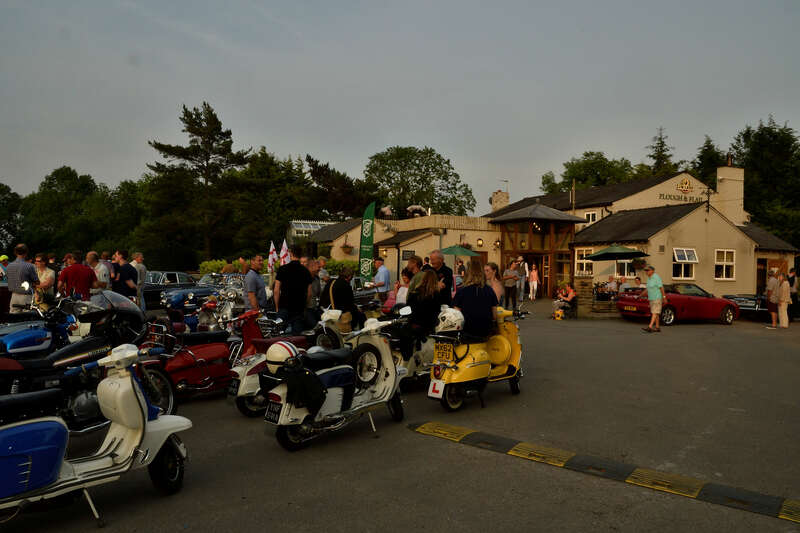 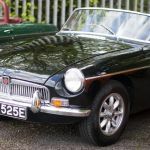 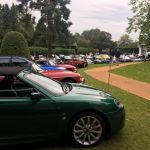 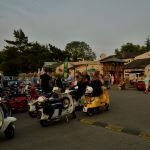 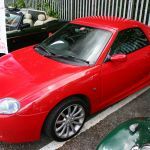 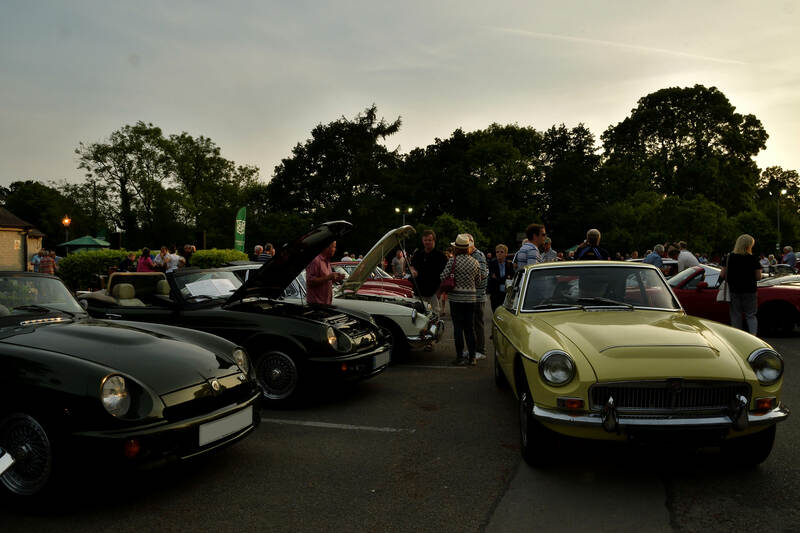 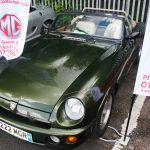 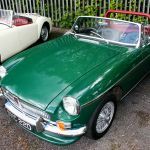 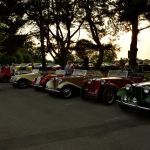 It was a beautiful balmy summer evening and there was a spectacular turn out of MG`s from all eras along with some superb examples of other marques and a good turnout of classic mopeds. 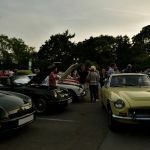 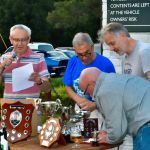 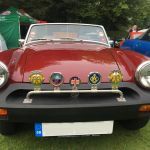 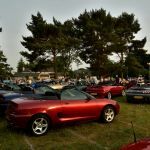 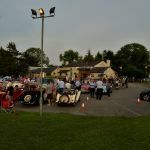 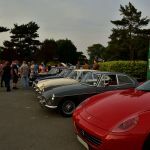 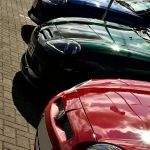 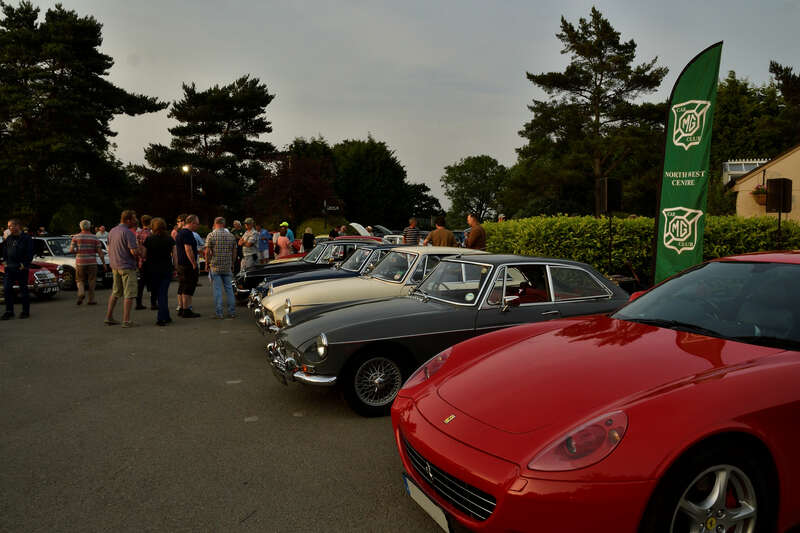 It was a fantastic evening with food, including a barbeque and some nicely crafted ales on tap, it was also very well attended by enthusiasts who turned out to see the cars. 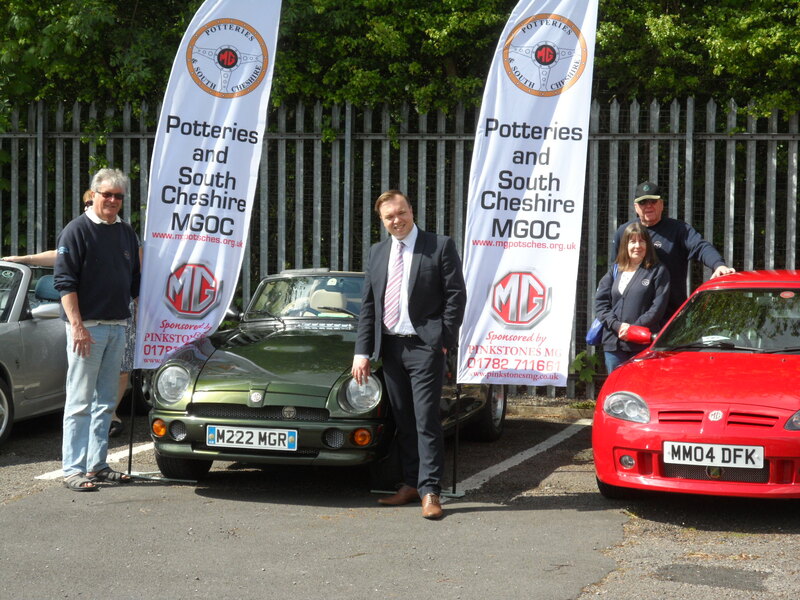 Many thanks to the North West MGCC and the Plough and Flail for making this event possible. 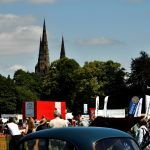 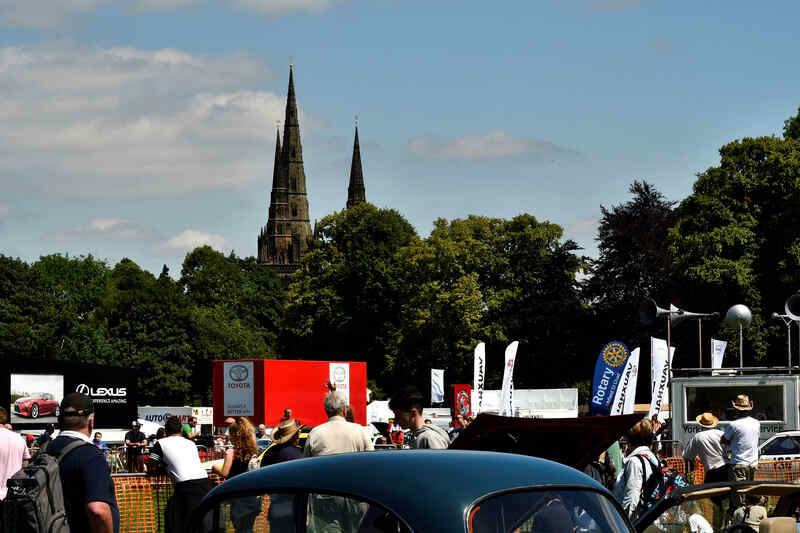 A good day at Lichfield Cars in the Park, weather was fantastic and it was very busy with a big turnout of visitors. 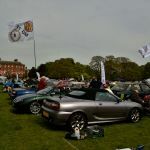 Great day for the club it was a bit cramped for room as there was a huge number of cars this year, still this didn’t stop the club making the best of the day and the weather ! 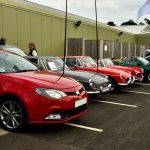 As well s the car display there were a fair number of car stalls and we had a fly over from the Air Ambulance which is one of the charities we sponsor. 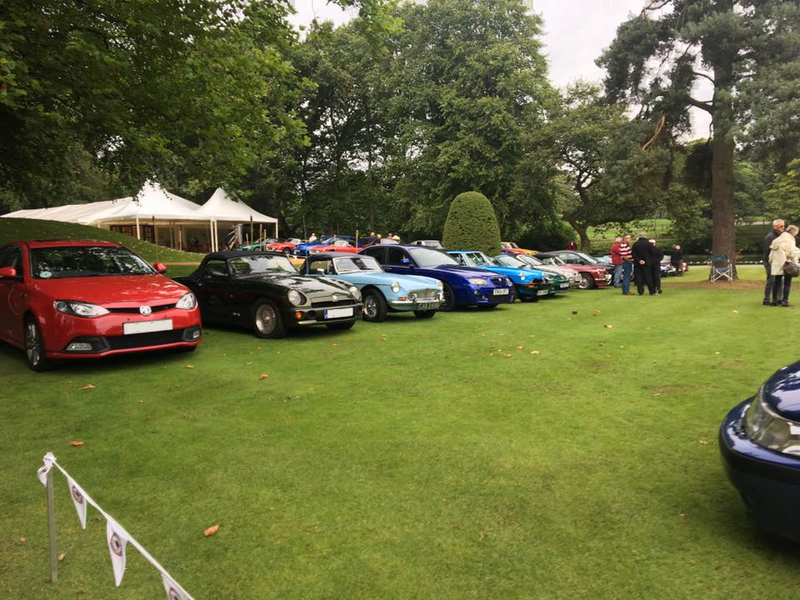 Another great Evo Run organised by Ray and Jenny our second of the season, weather started off a bit murky but soon brightened up. 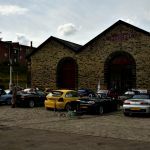 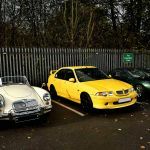 We had a nice drive out into Wales with a breakfast stop at Rhug Café and Shop followed by the Evo Run, which most people did two laps of. 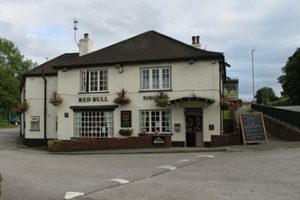 After meeting up afterwards we then had a pub Sunday dinner on the way home. 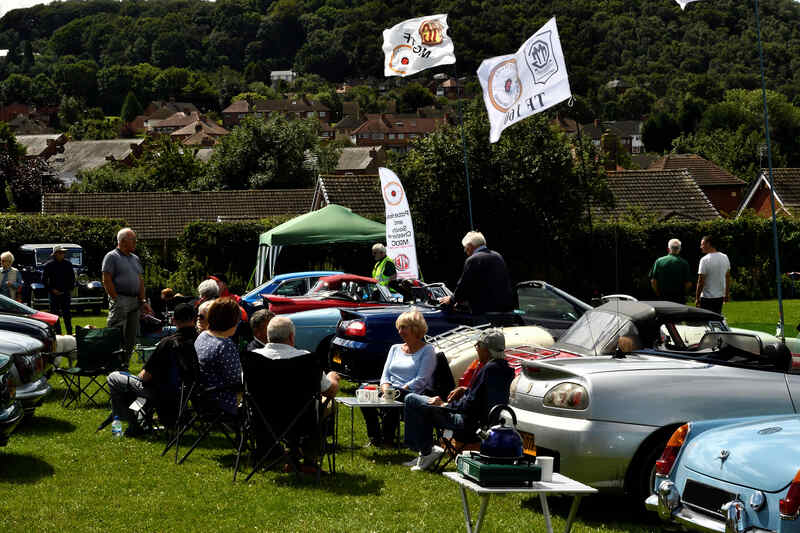 On Saturday 15th July the club put on a small display organised by Mark in support of the community Over Grown Allotments open day. 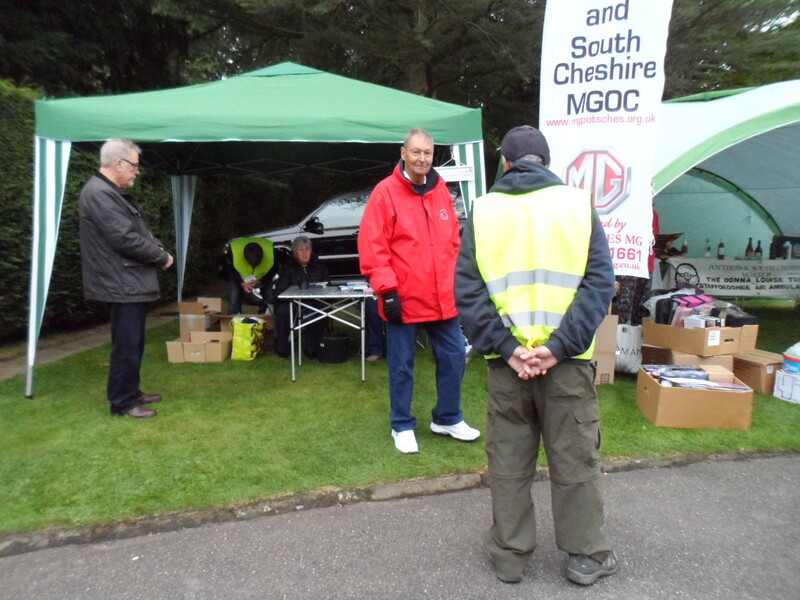 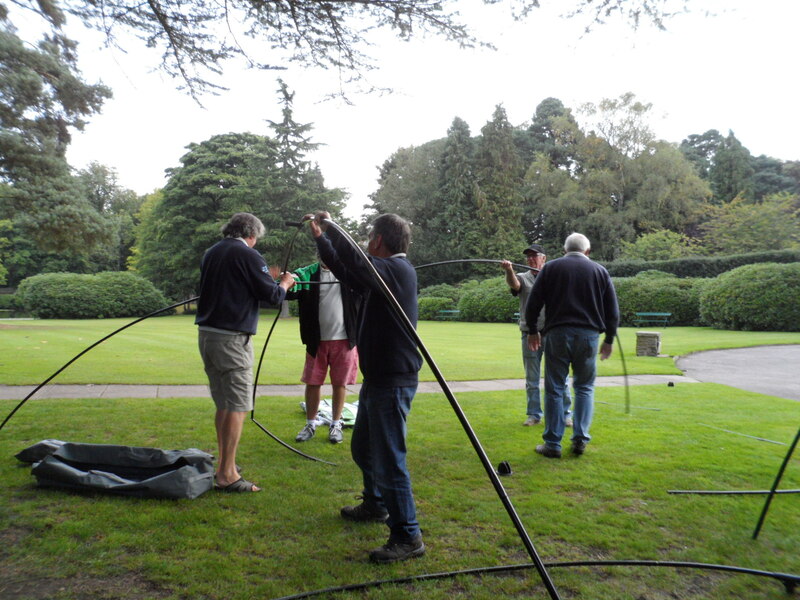 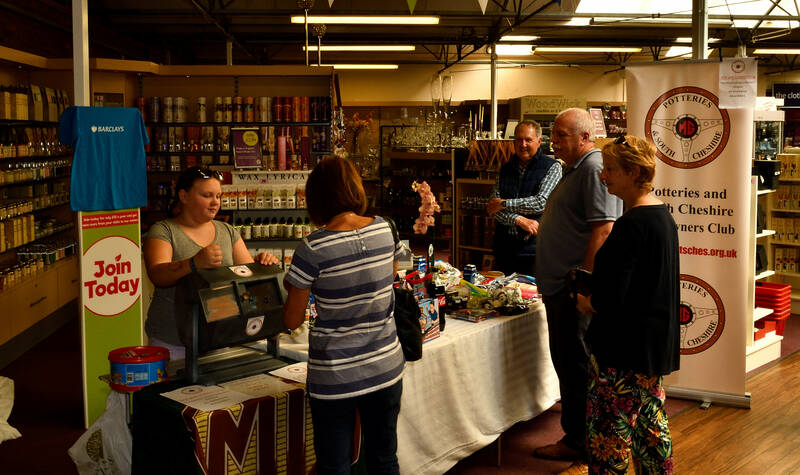 Our club members were made to feel extremely welcome and good day was had by all who attended. 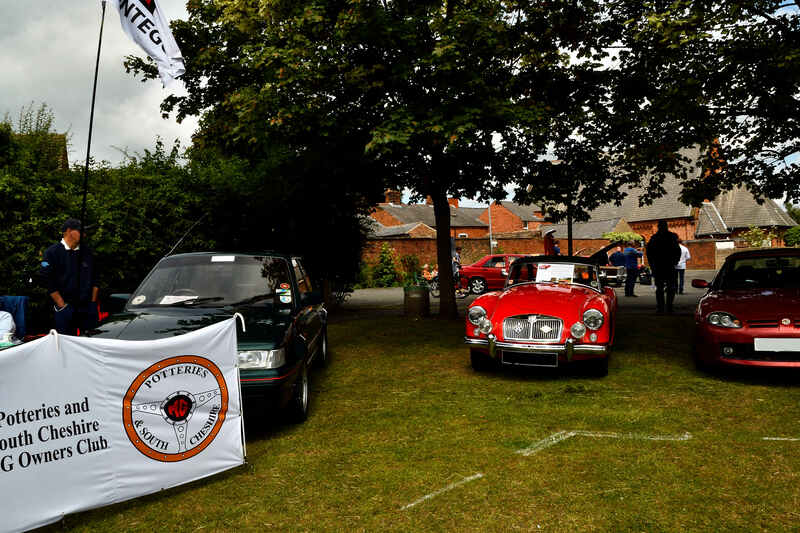 The club attended both days at the car show in Middlewich and on the Sunday despite the early weather we really turned out on in force with a large number of quality cars on display covering a wide range of MG models from Stan`s MG SV-R Supercar all the way to the what is now the oldest car in the club Mike`s classic 1934 MG PA Midget. 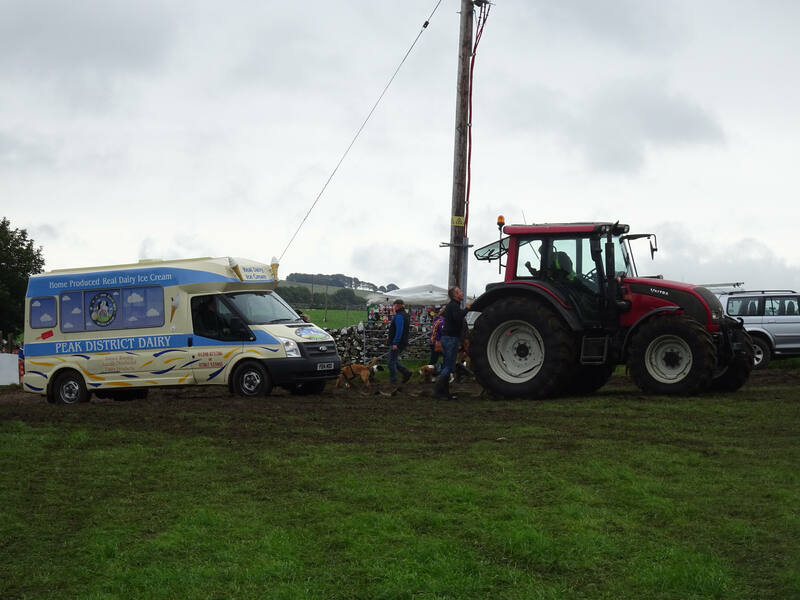 The weather started off wet and miserable but as with any typical British summers day then turned into a real scorcher bringing out the crowds and keeping the ice cream van busy !!. 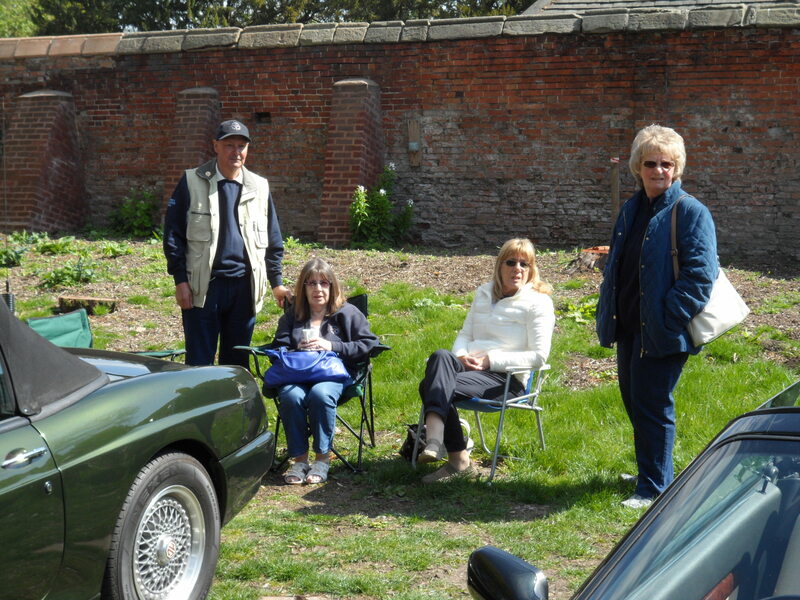 Great and relaxing day had by all. 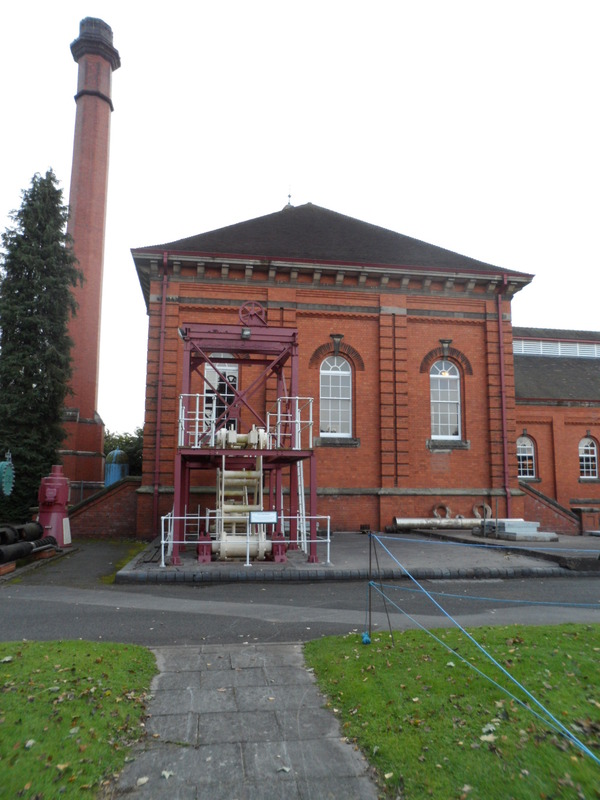 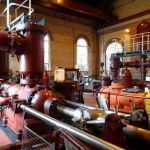 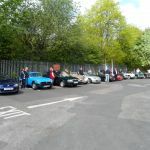 The club had a great scenic run up to Port Sunlight, stopping on the way for a coffee pit stop, followed by a visit to a WWII submarine then heading to Crosby Beach and a bite to eat before making our way back. 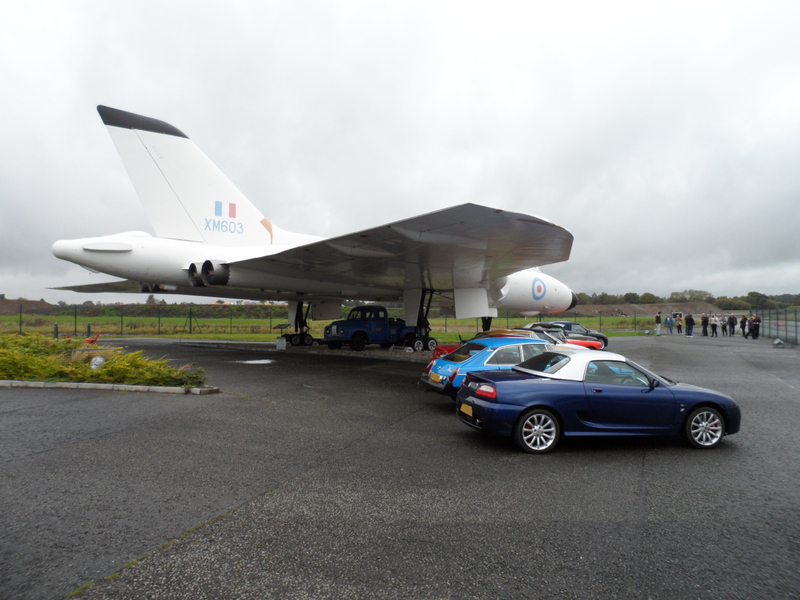 Really good day out !! 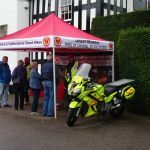 We had a good attendance by the club at the Helsby and Frodsham Show, weather started off really cloudy but then turned really bright but very windy !! . 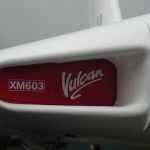 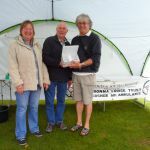 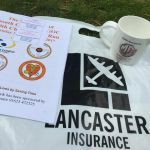 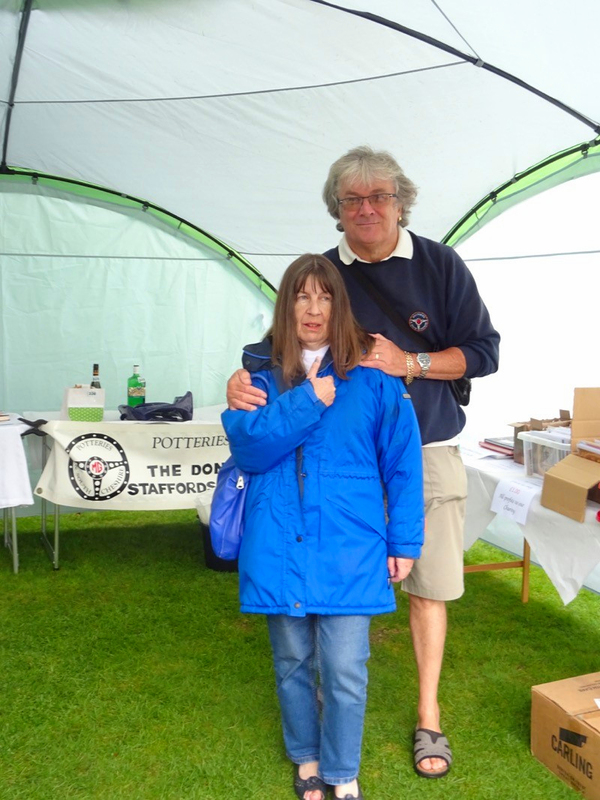 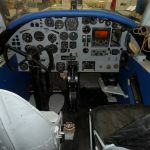 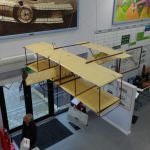 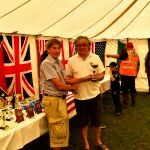 This was a great little show with lost to do and see also Bob the club secretary won a prize for his RV8- well done !!. 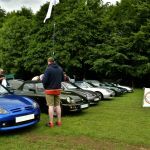 The finale to the show was the monsoon that occurred just as everybody was about to leave thankfully we all managed to get back to our cars. 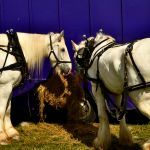 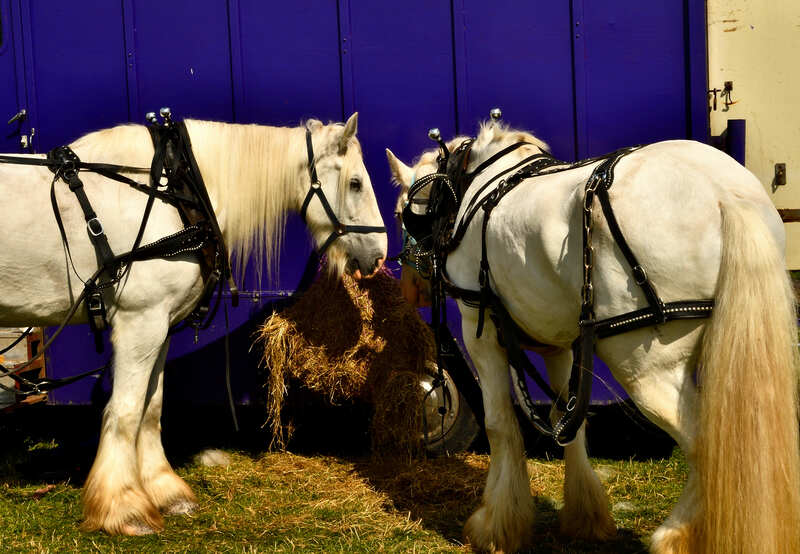 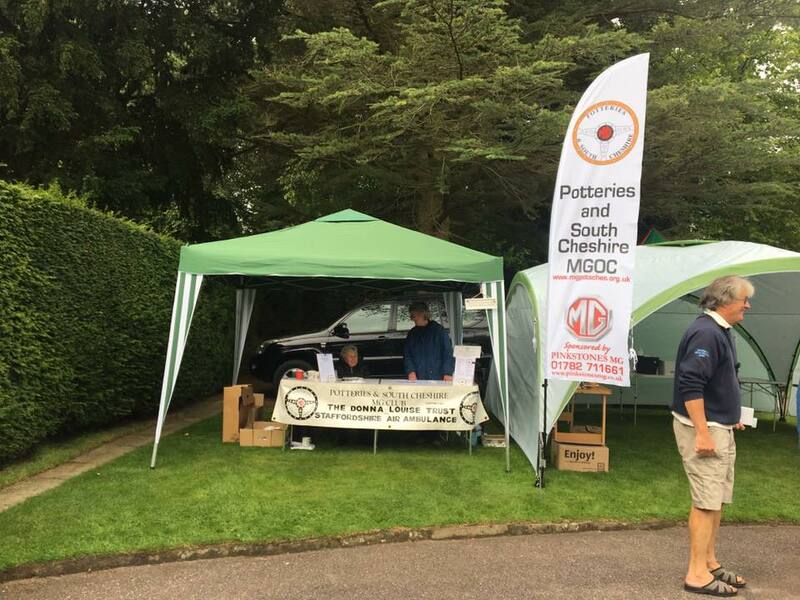 On Sunday 6th August we attended the Cromford Steam Rally, this was a new show for the club and we had a good turn out and thankfully the weather stayed mostly dry. 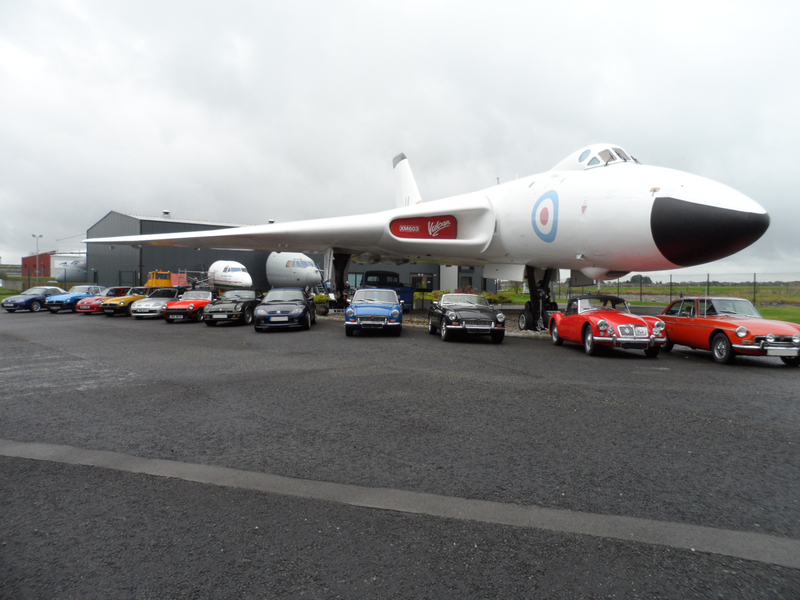 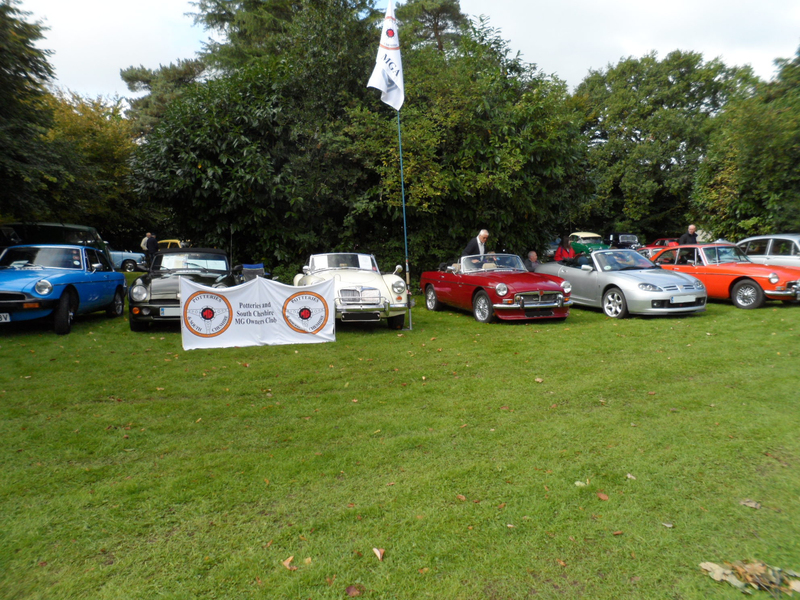 There was a great range of vehicles on display and lots to see. 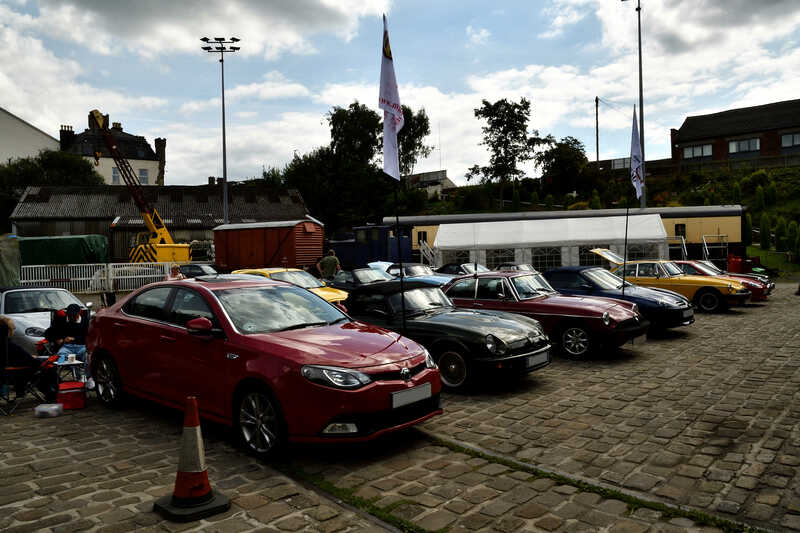 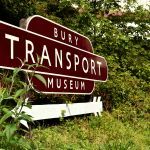 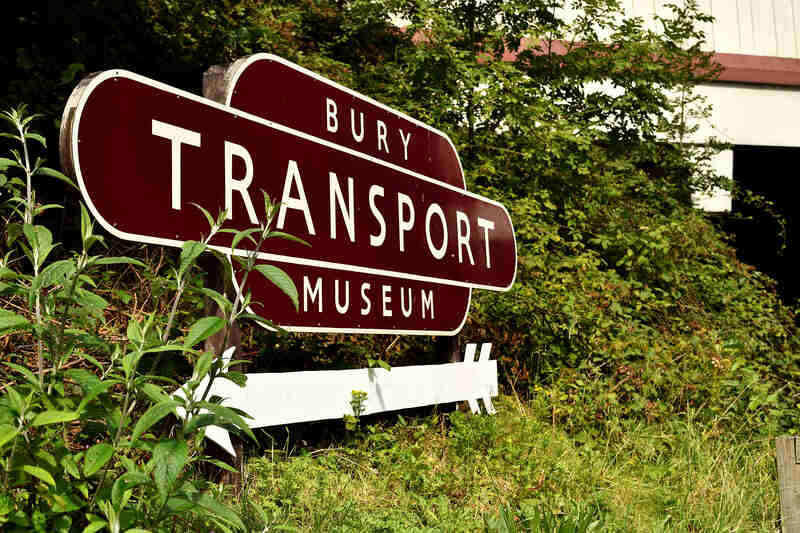 On Sunday 13th August we had a drive up to East Lancashire Railway where we put on a display outside the Bury Transport Museum. 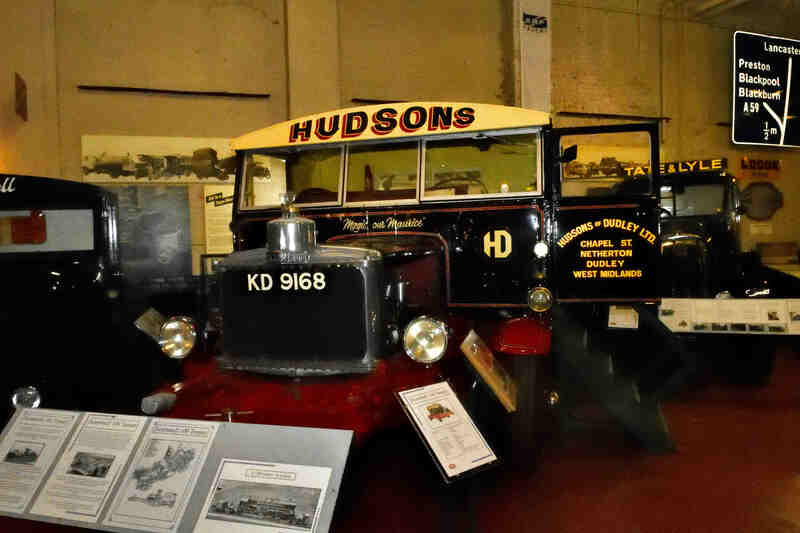 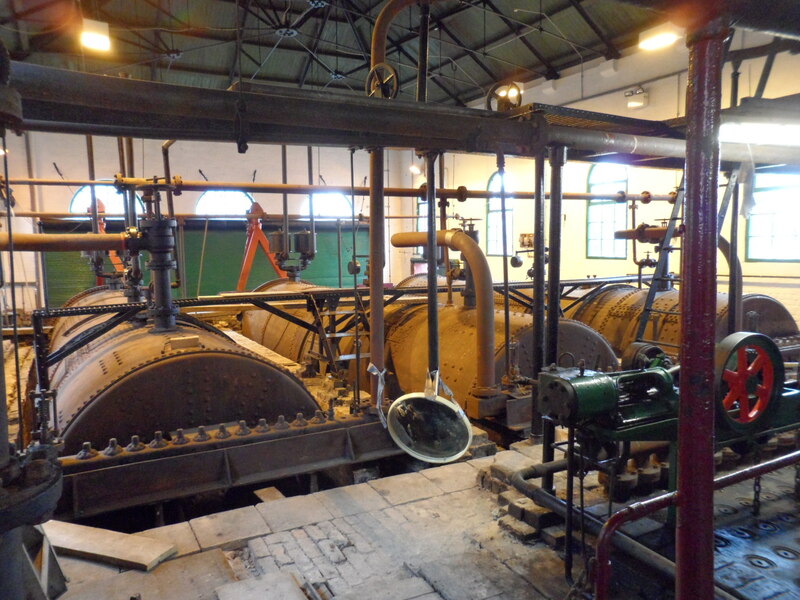 Once we got there everybody did their own thing which included having a wander around the museum and having a trip on the steam train, getting off at any of the locations that took your fancy. 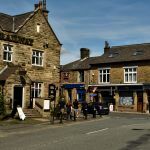 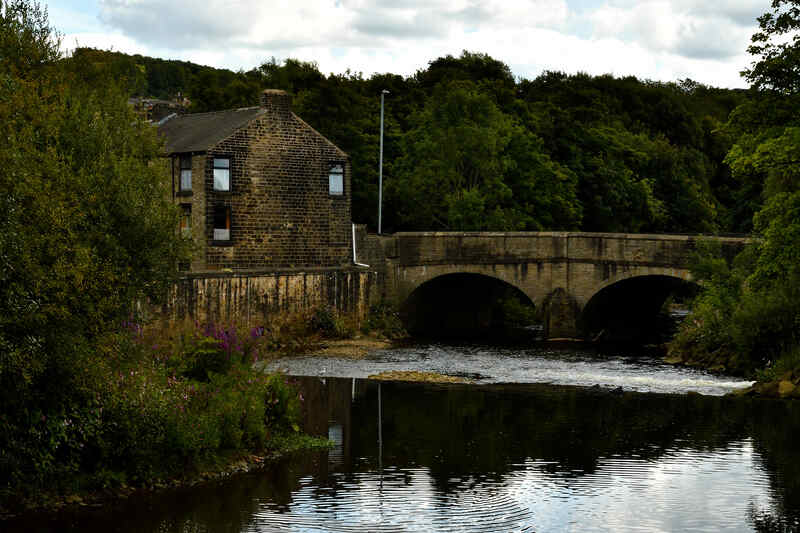 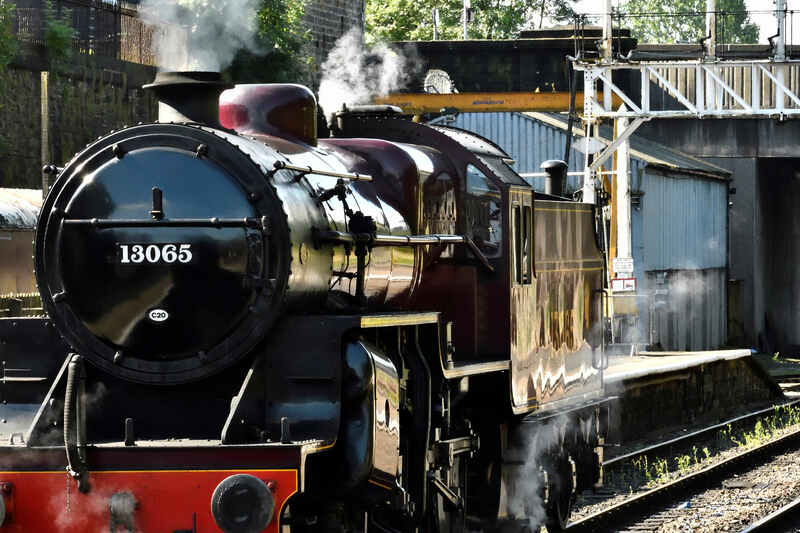 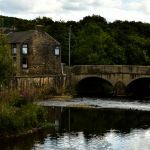 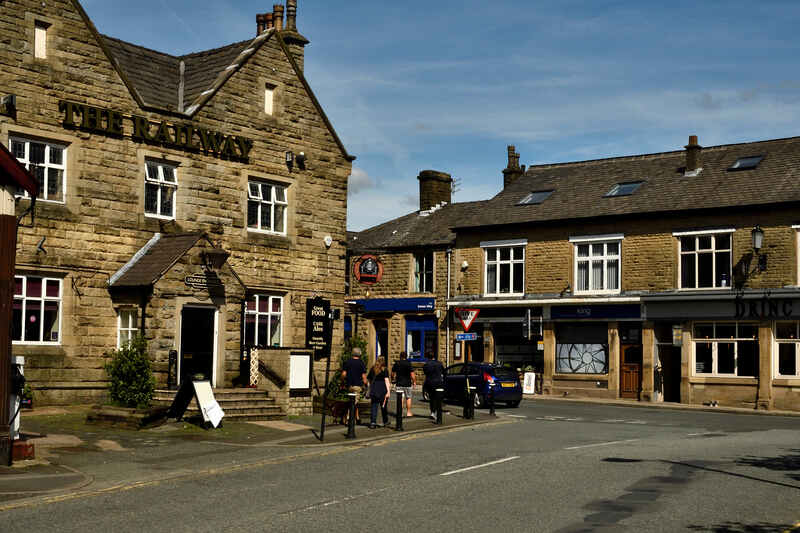 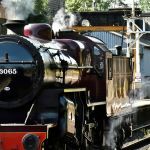 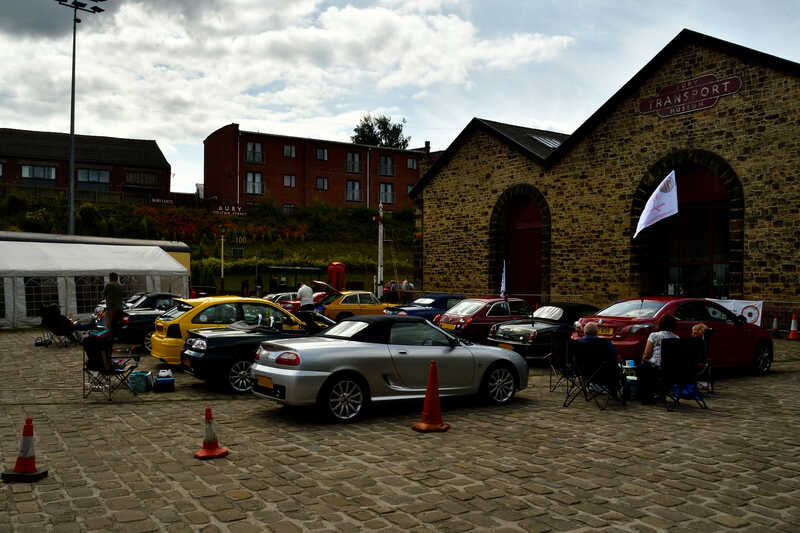 Ramsbottom was one of the stops, with its park, quaint shops and cafes. 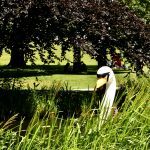 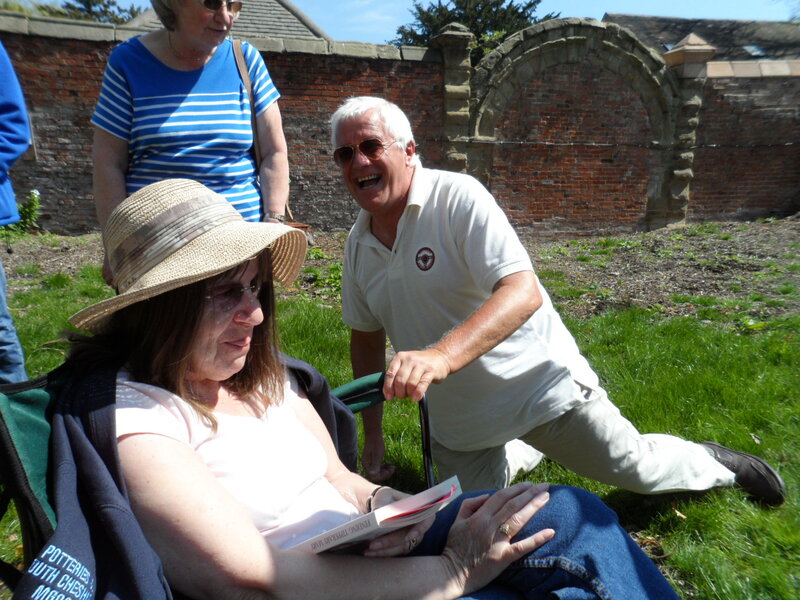 So there were lots of things to do, places to visit and some great eating spots making it a brilliant day. 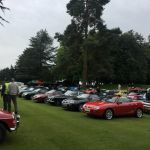 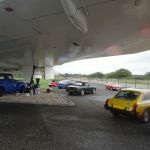 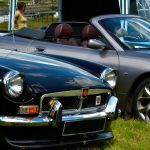 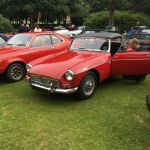 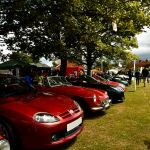 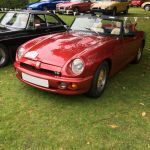 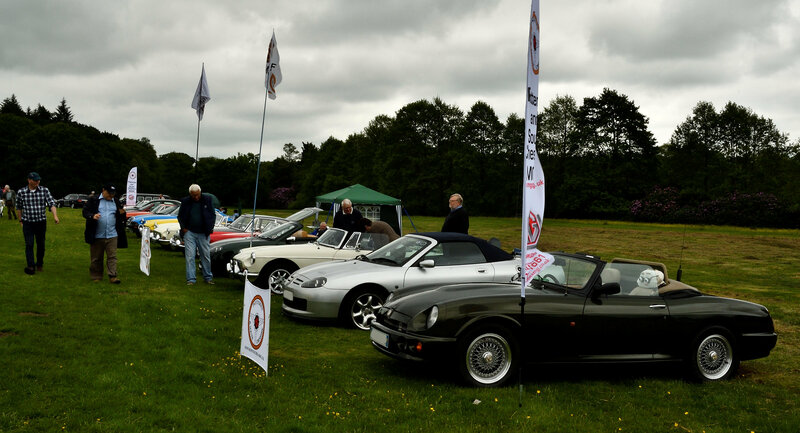 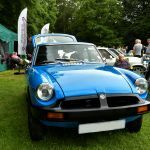 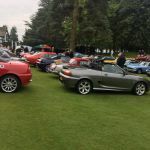 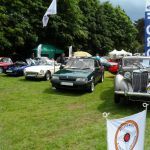 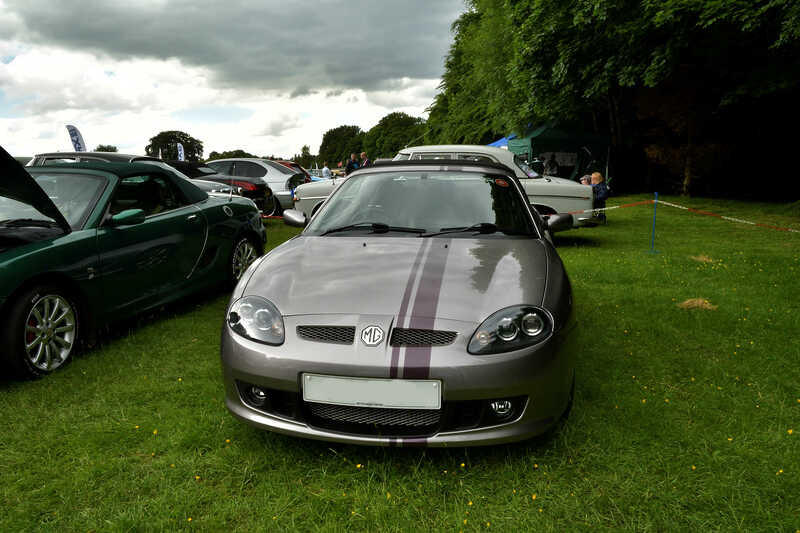 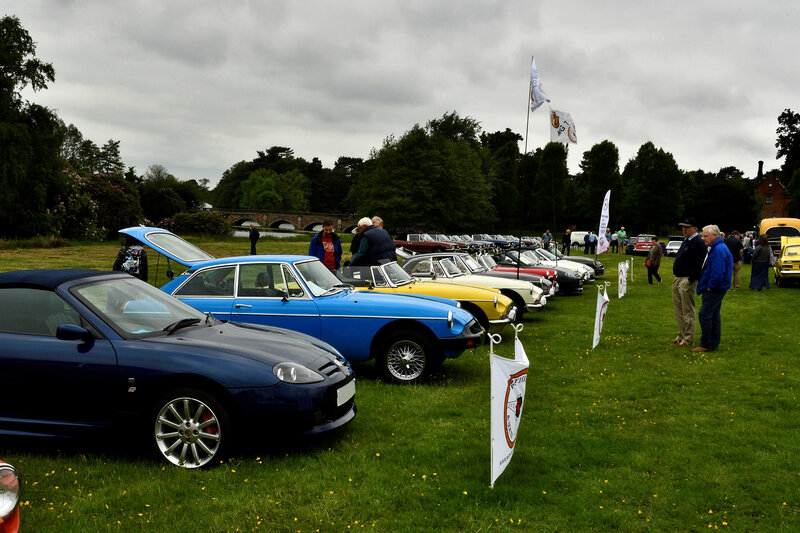 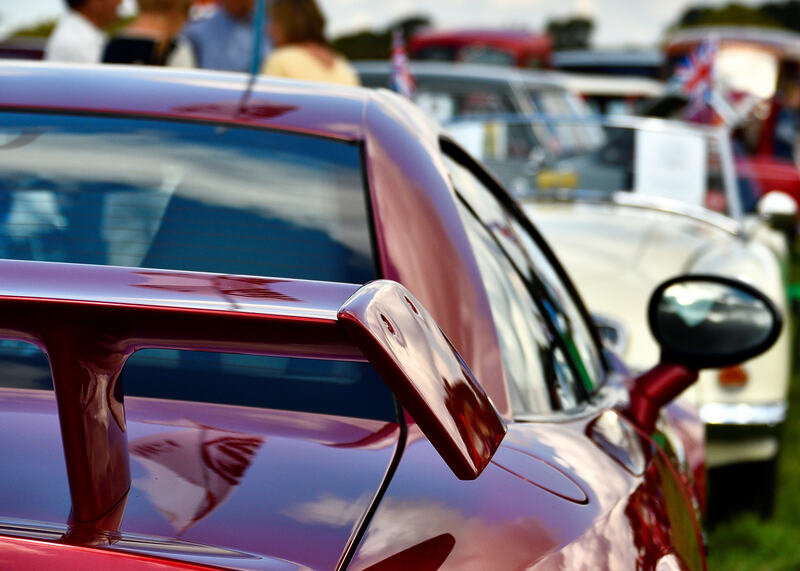 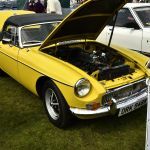 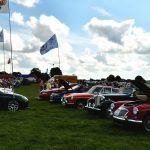 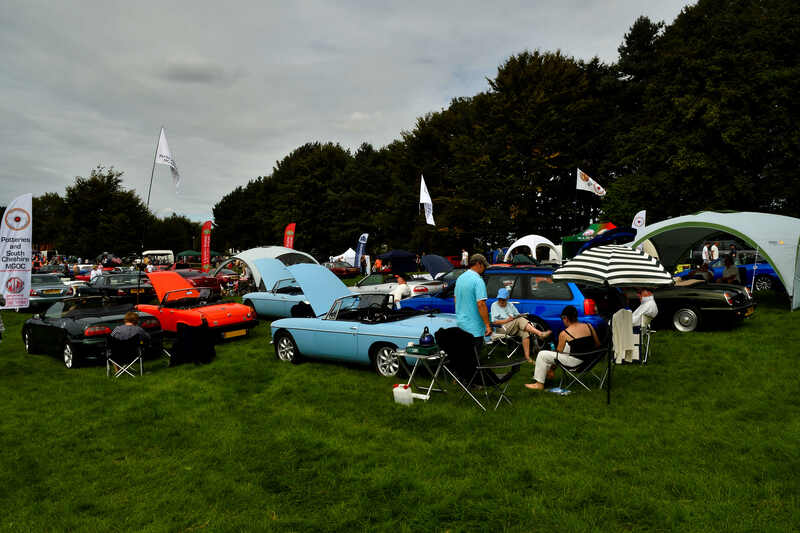 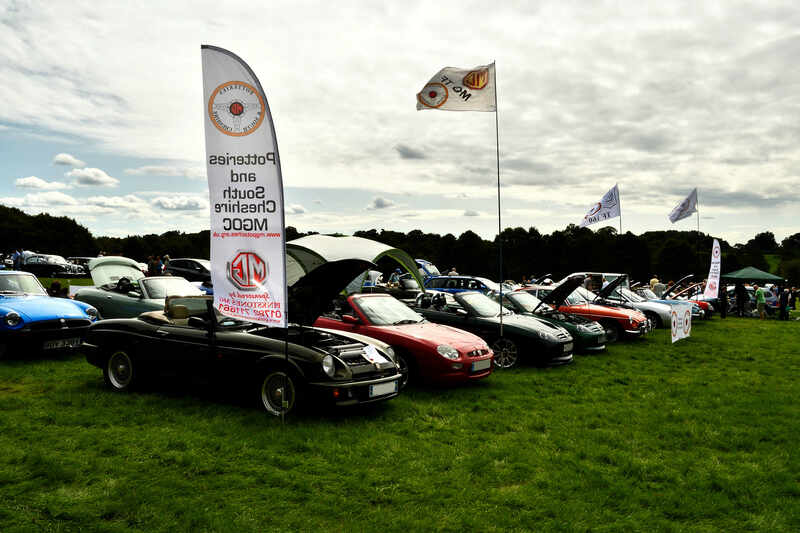 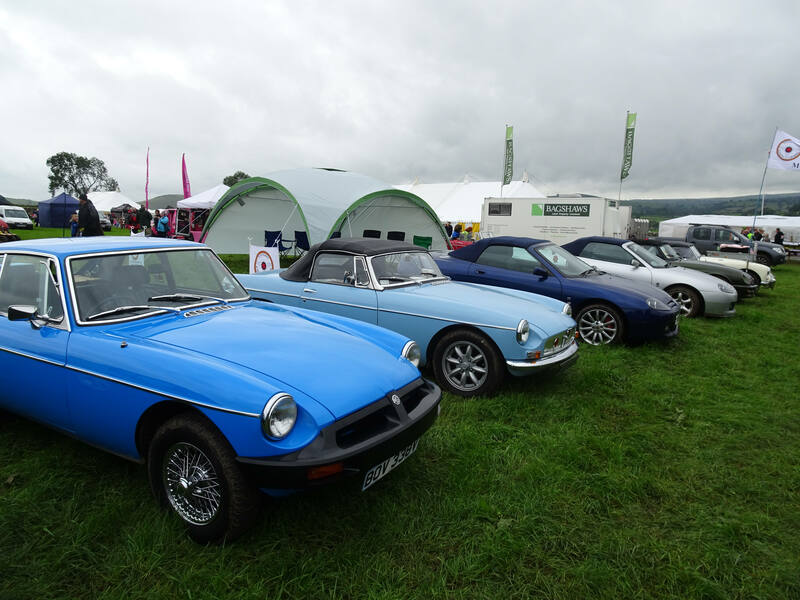 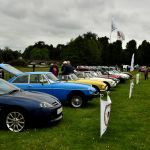 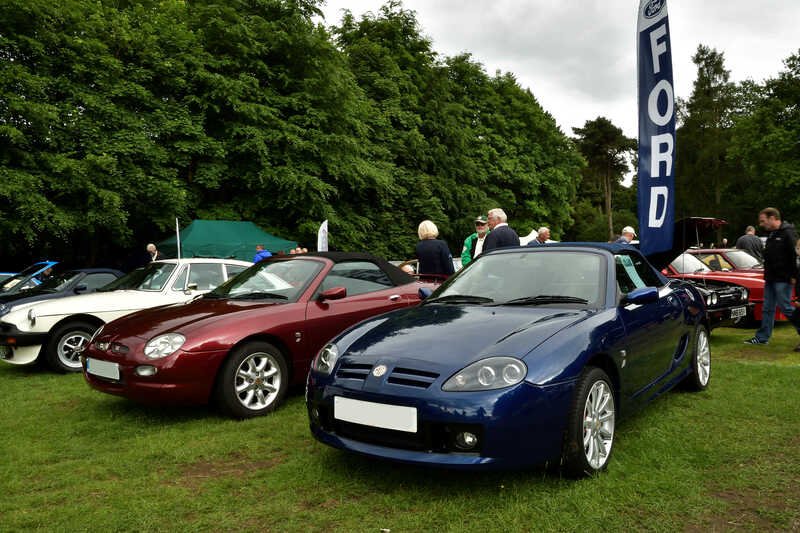 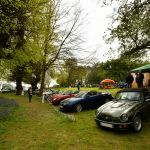 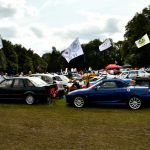 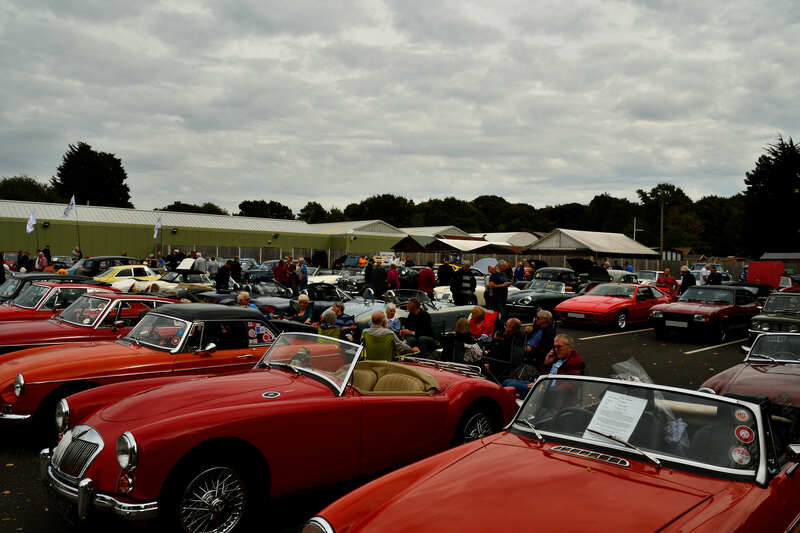 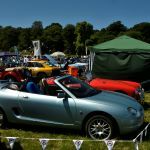 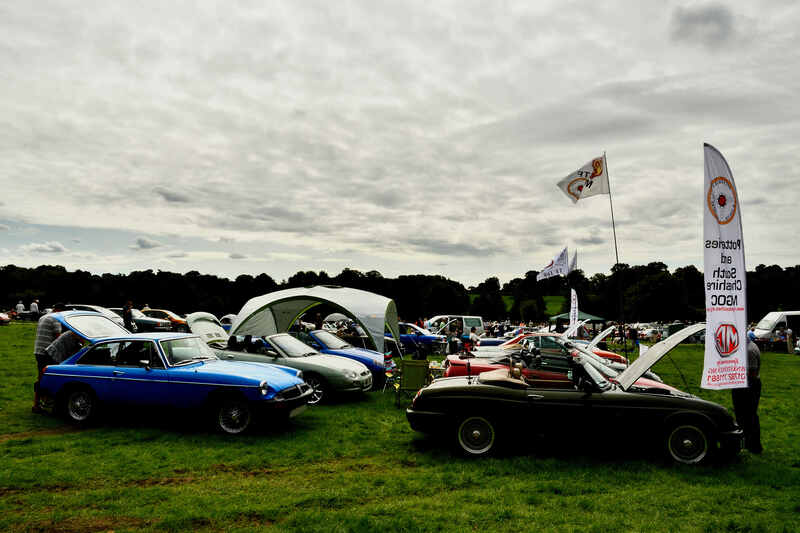 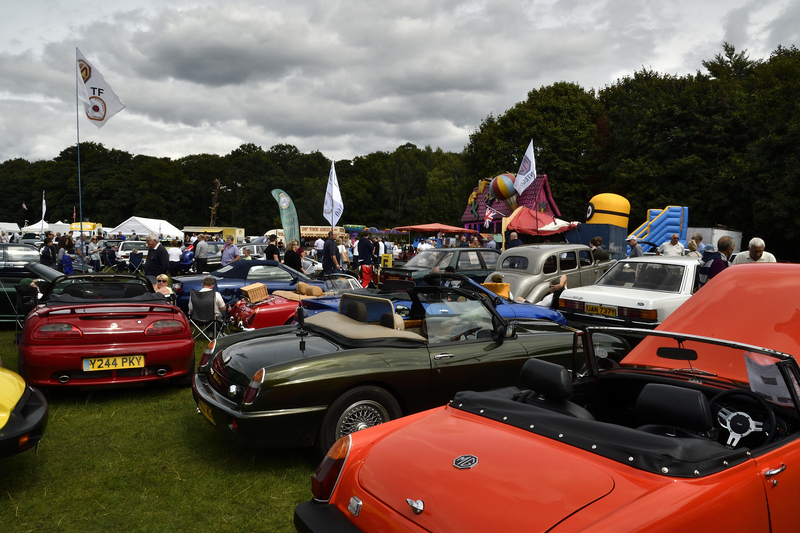 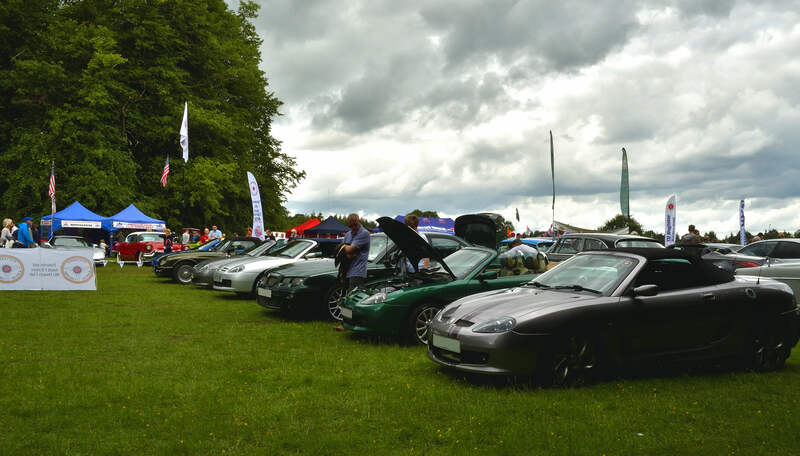 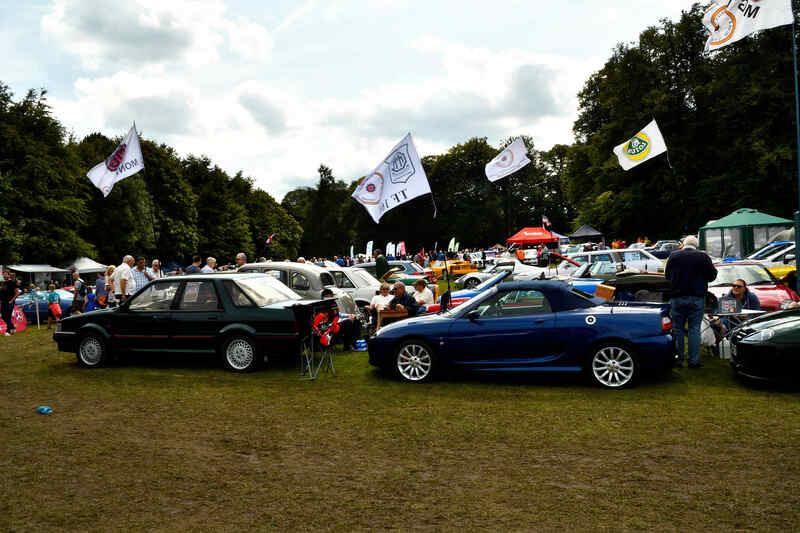 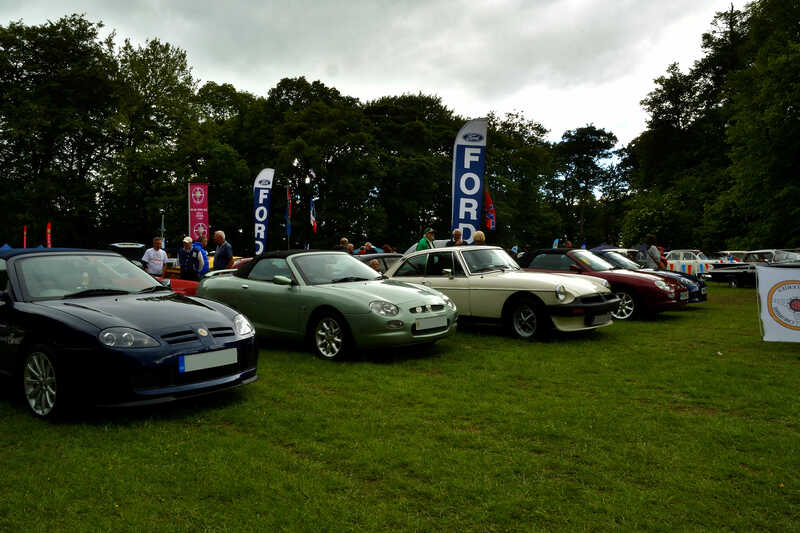 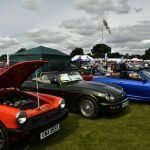 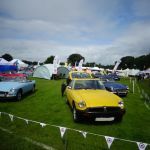 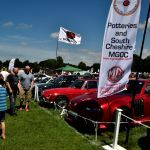 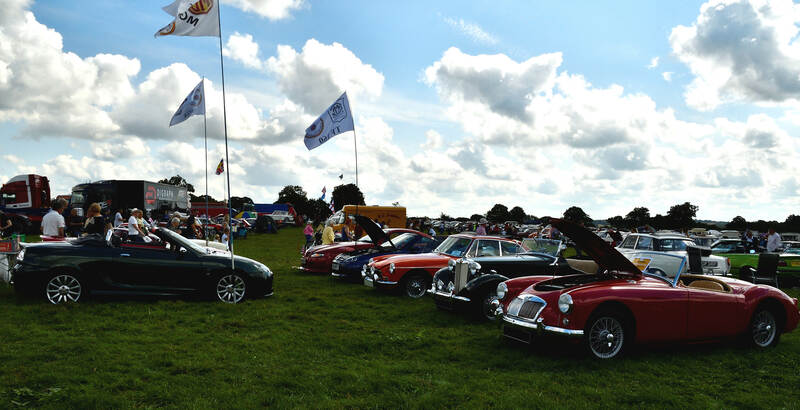 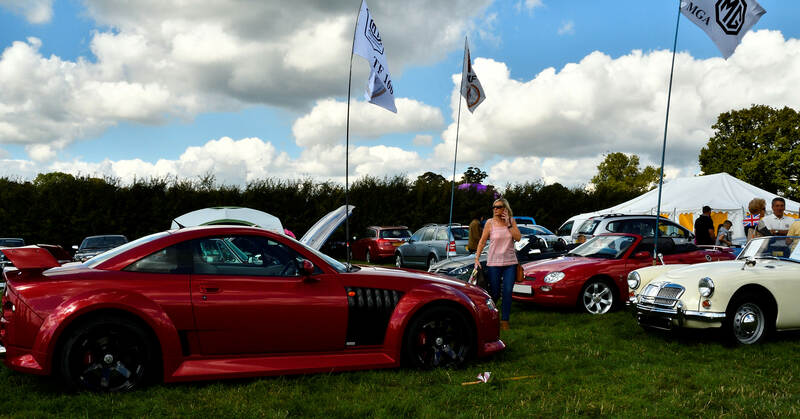 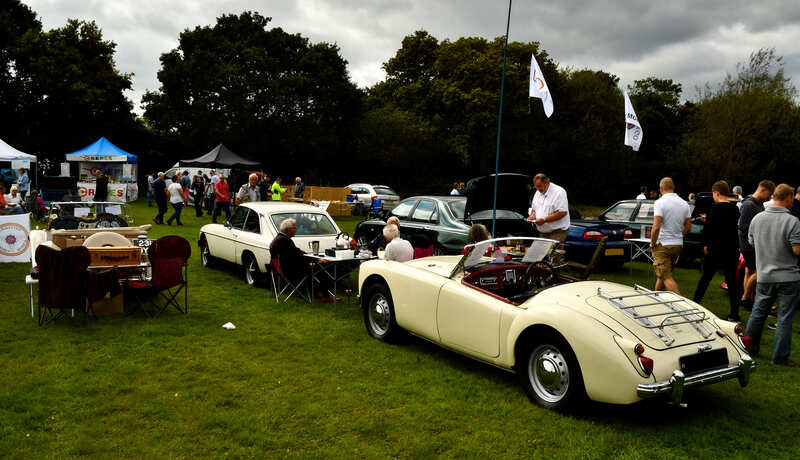 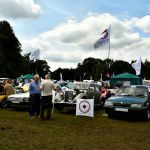 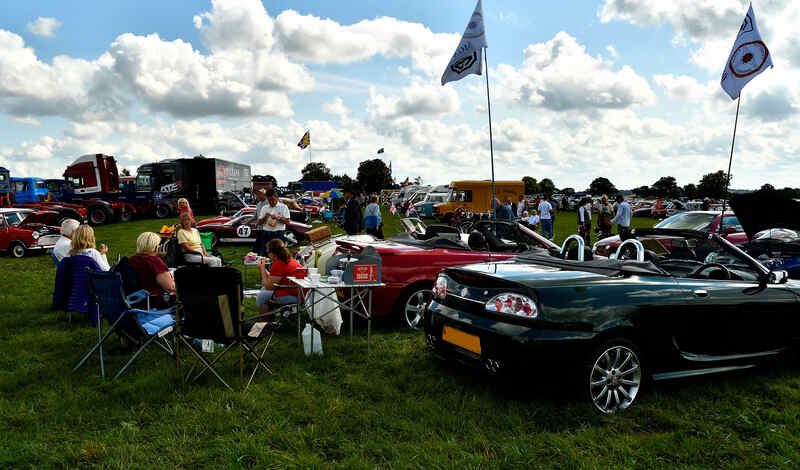 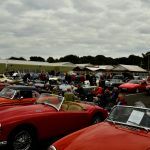 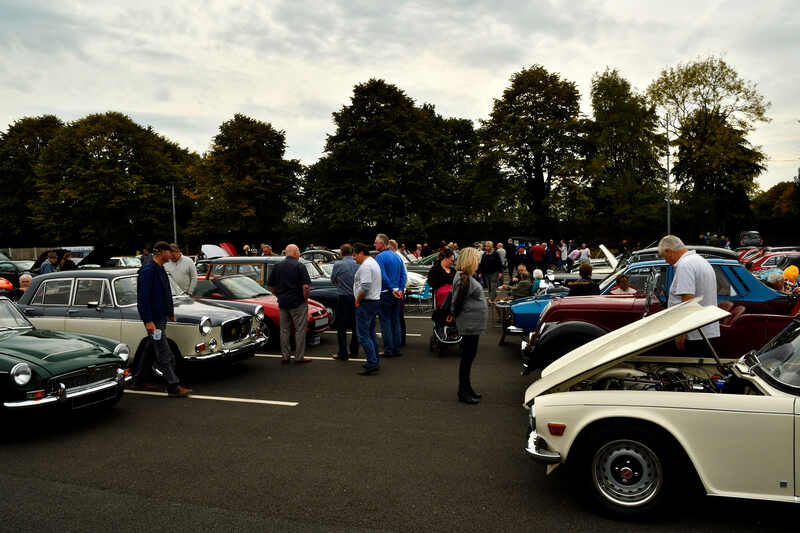 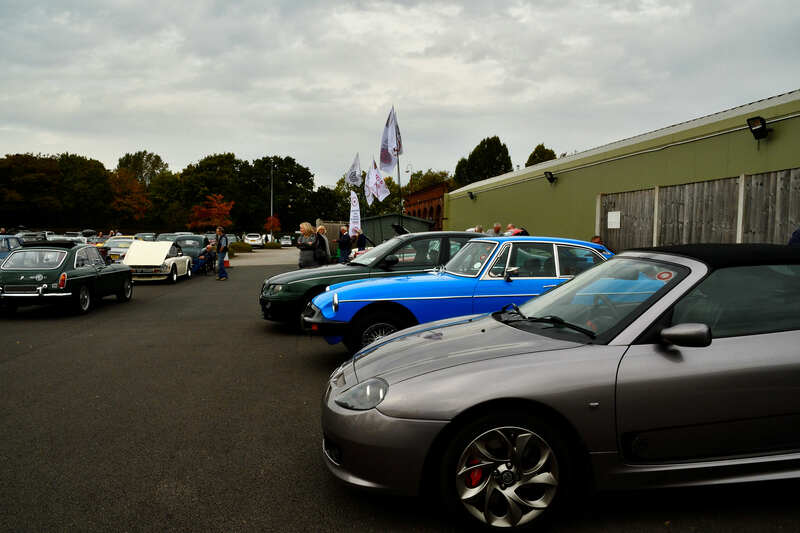 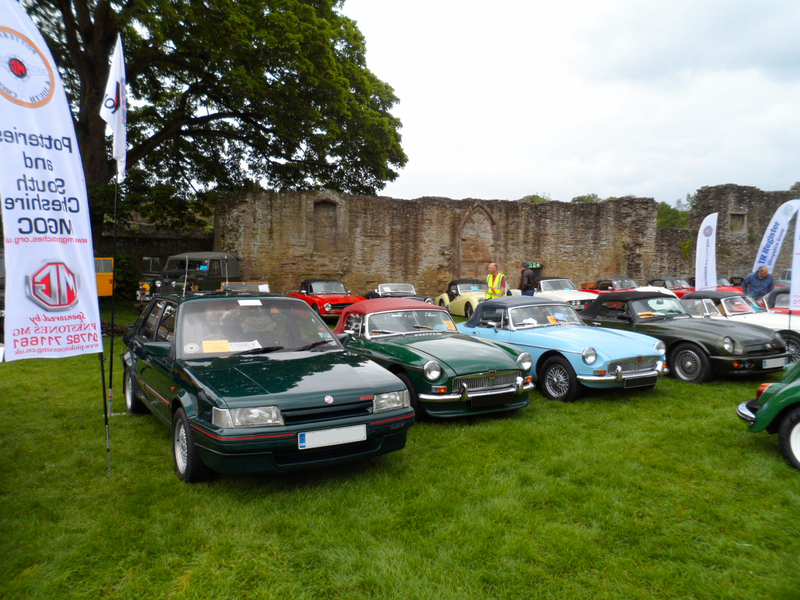 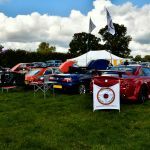 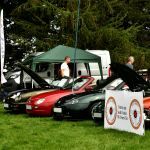 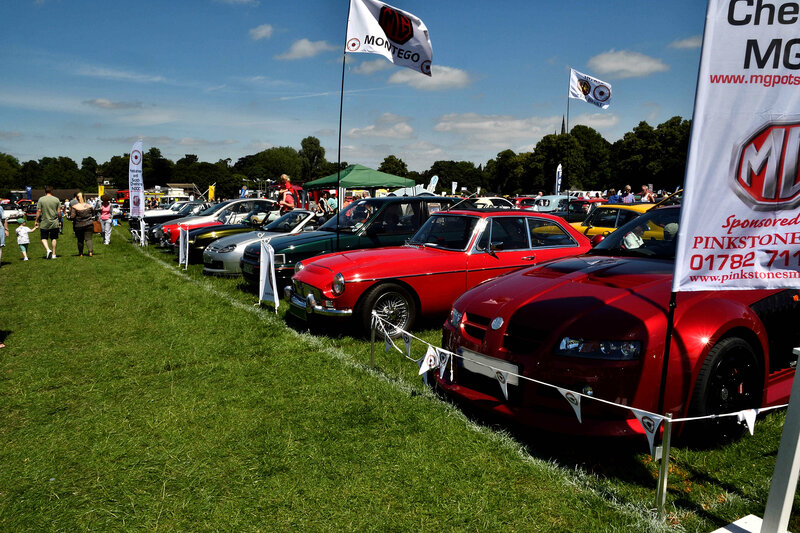 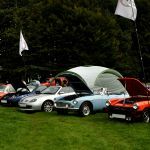 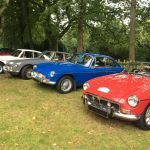 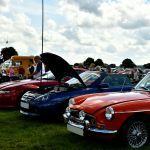 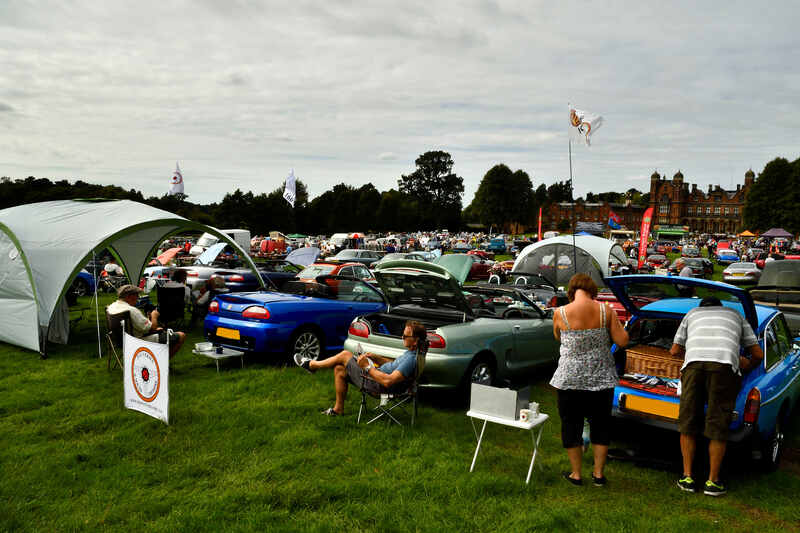 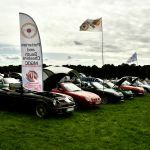 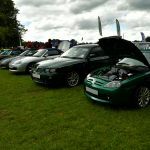 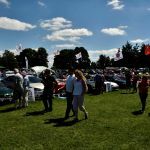 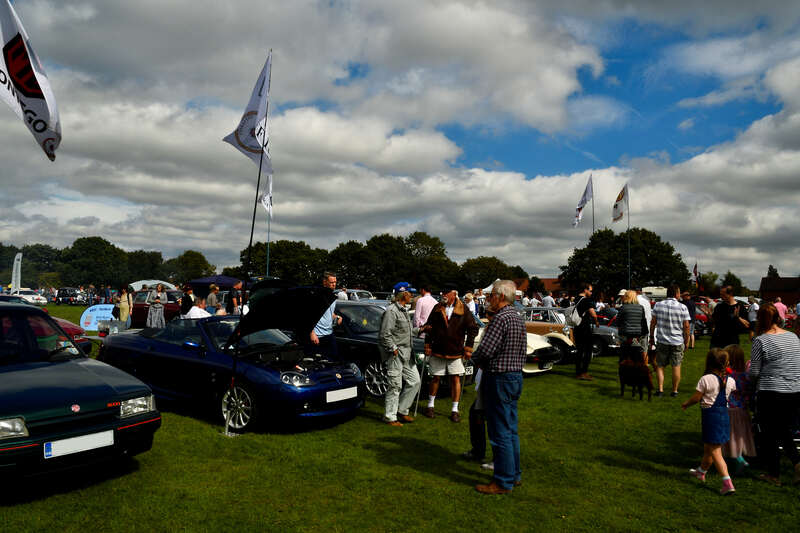 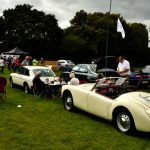 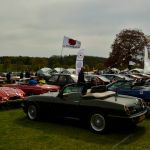 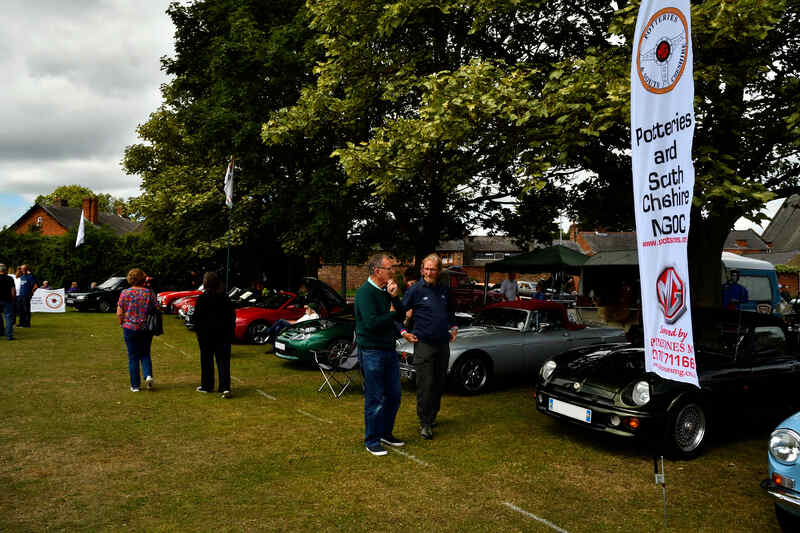 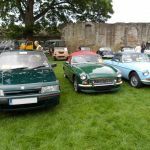 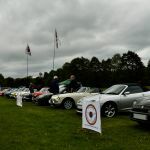 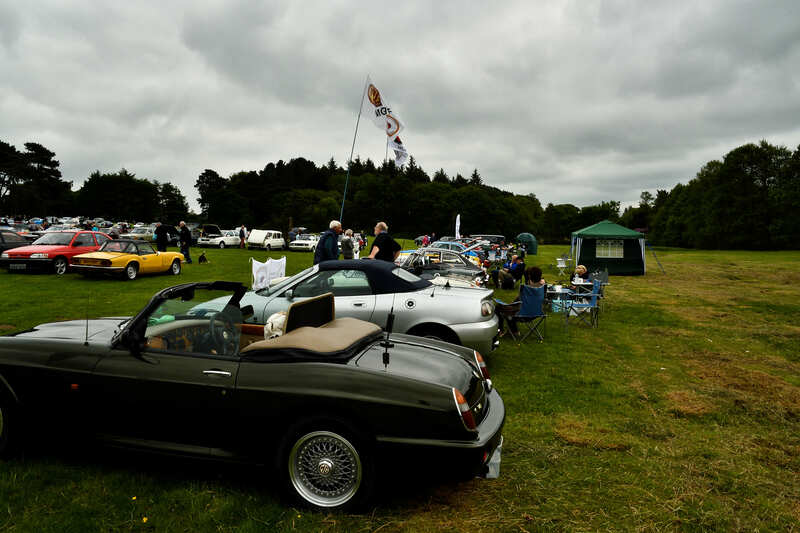 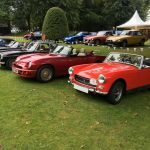 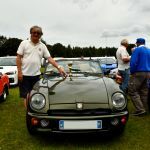 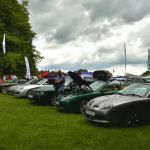 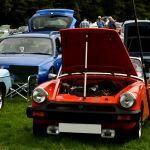 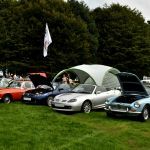 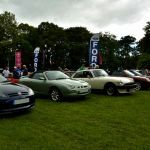 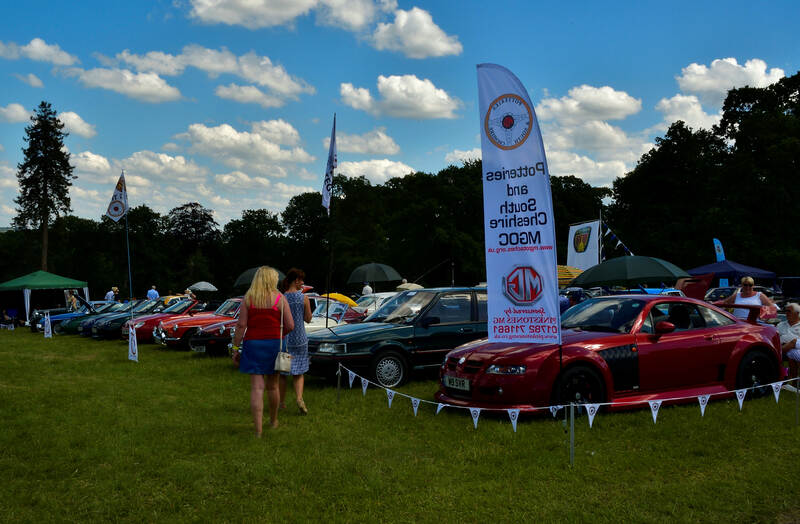 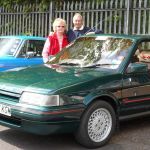 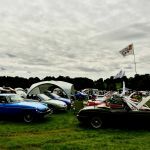 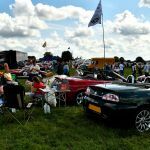 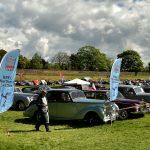 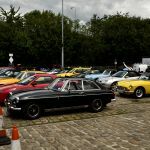 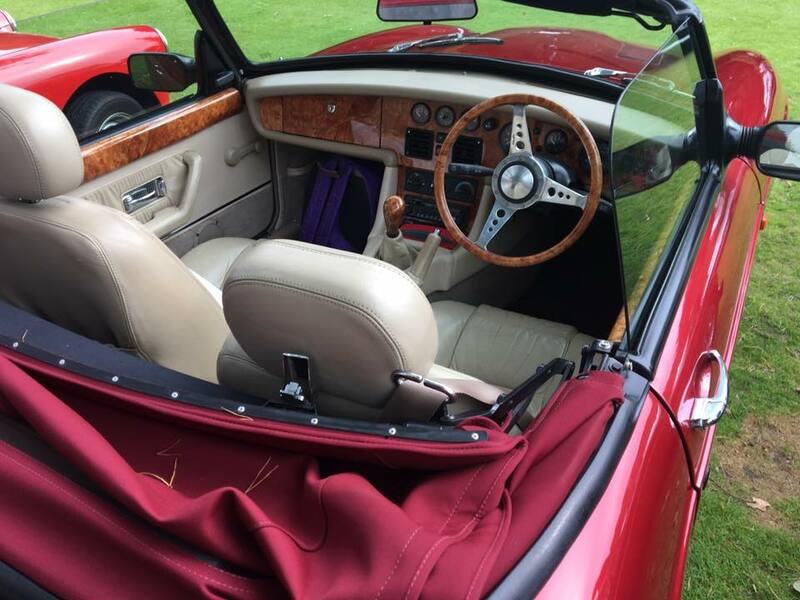 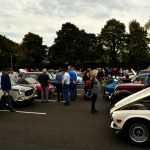 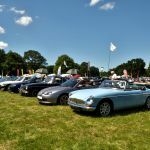 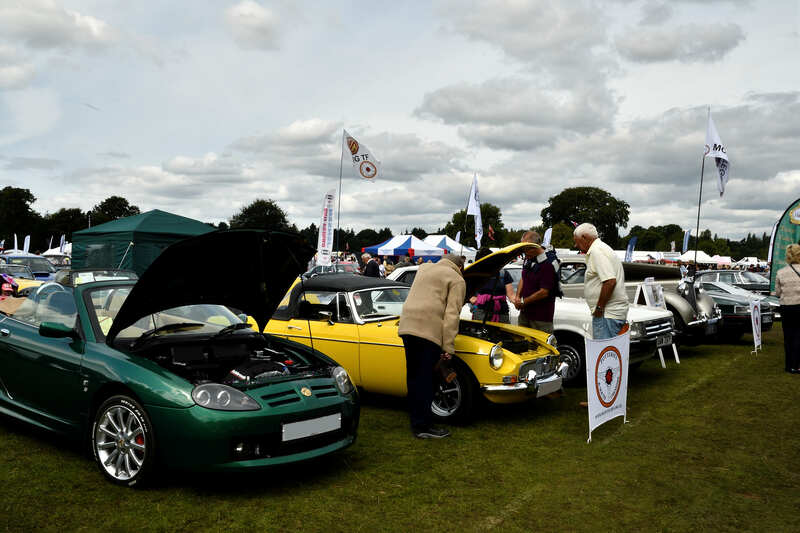 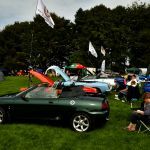 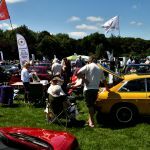 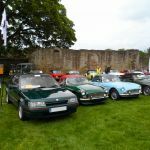 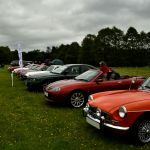 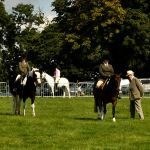 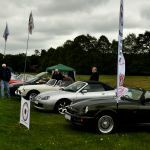 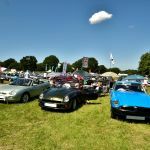 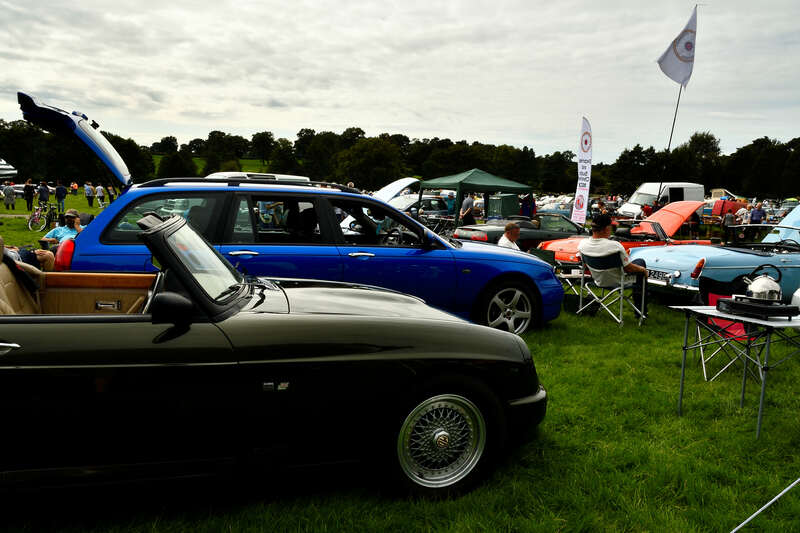 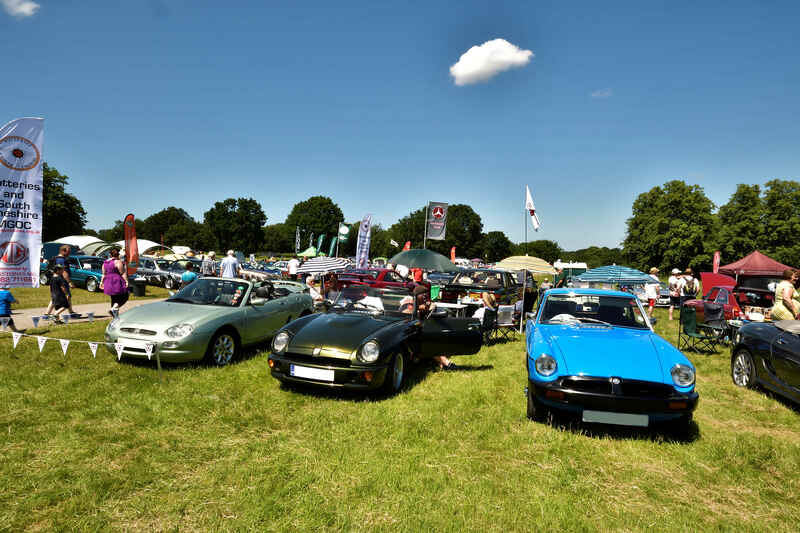 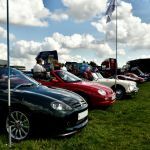 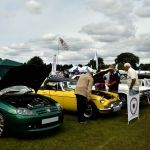 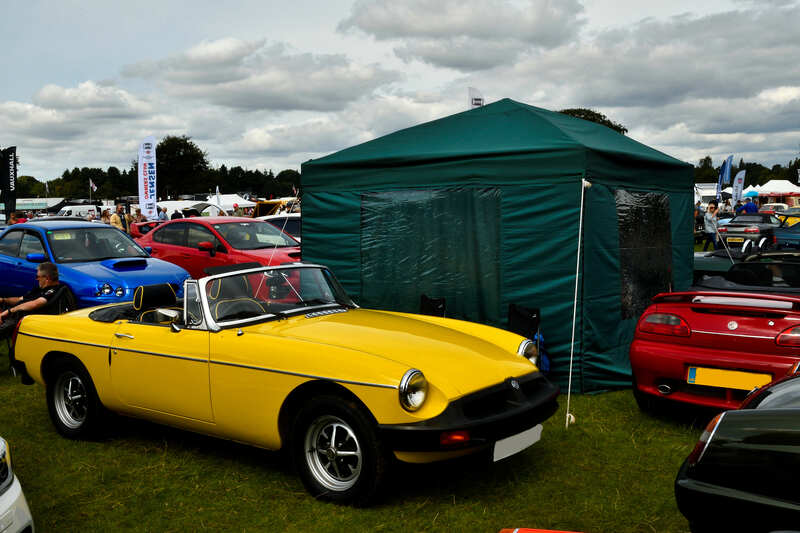 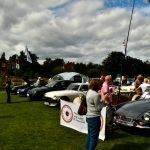 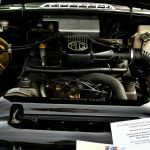 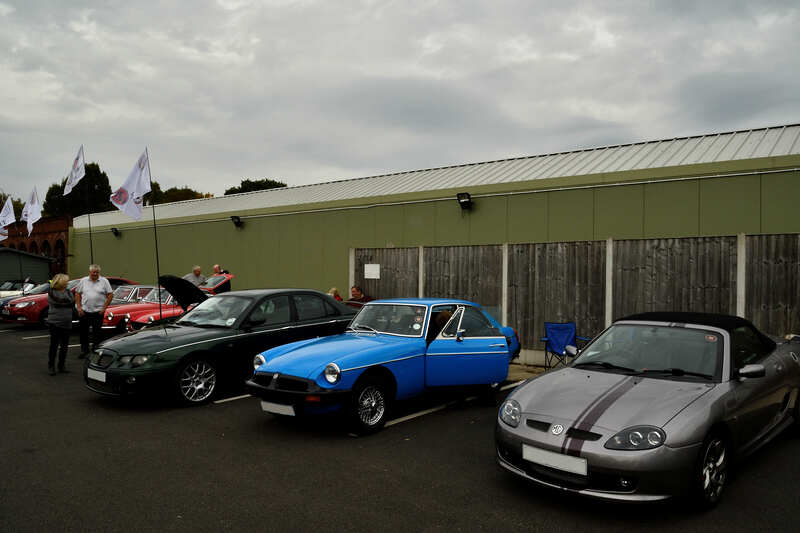 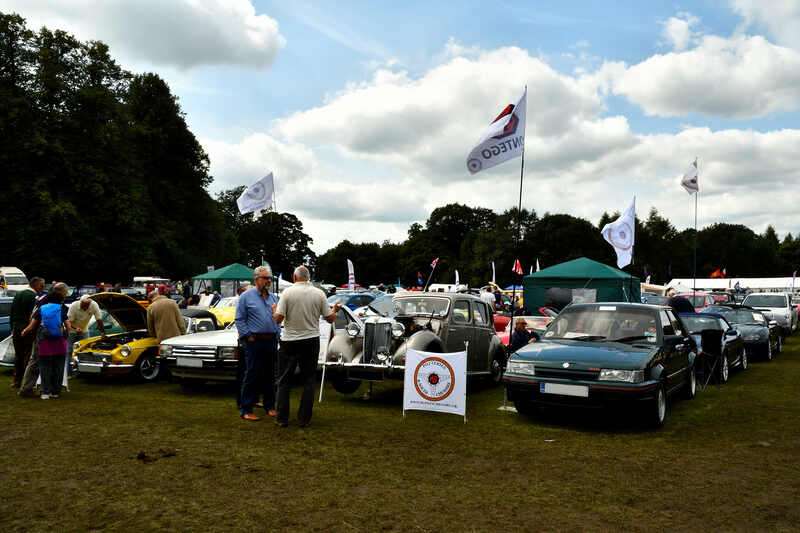 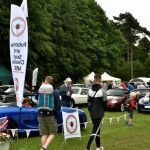 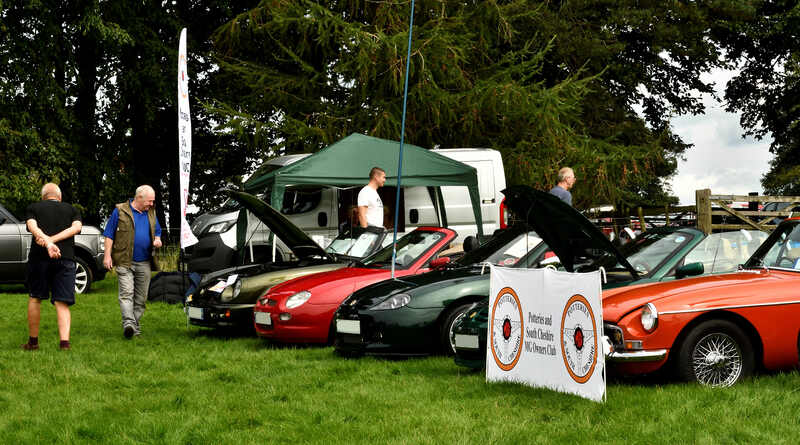 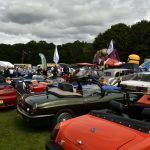 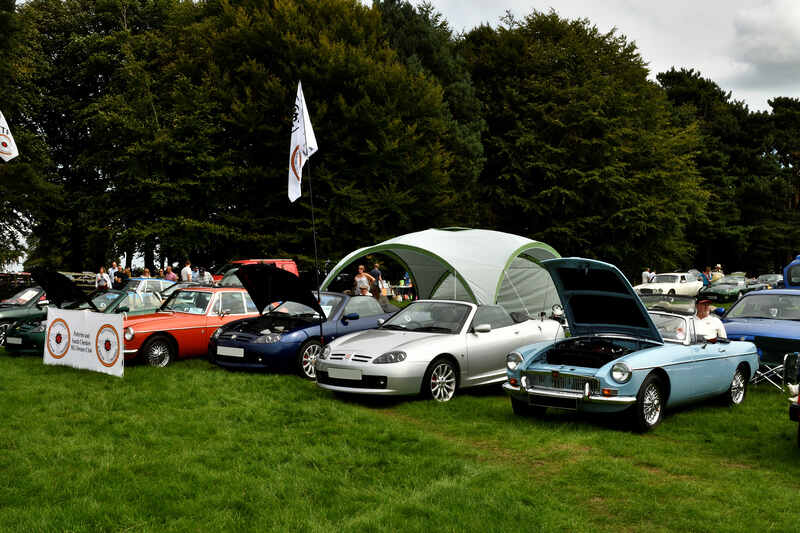 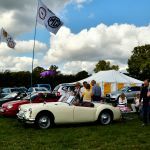 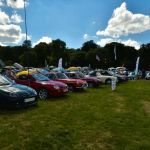 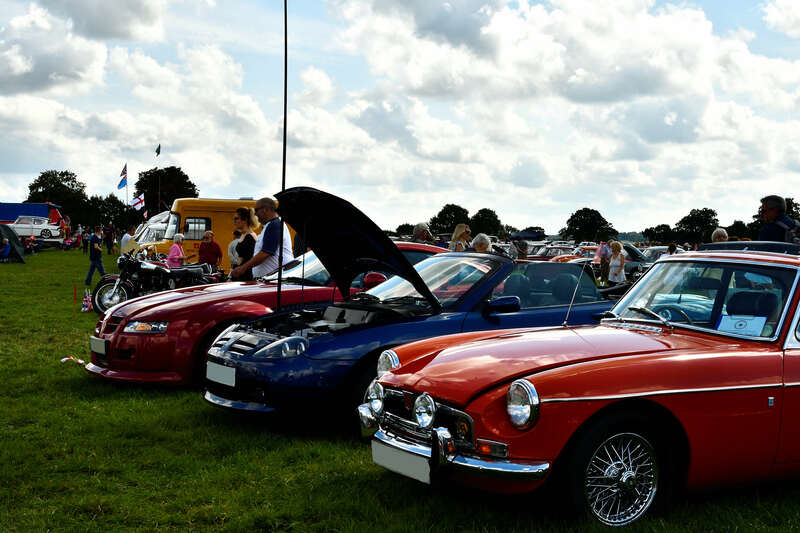 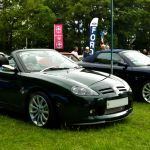 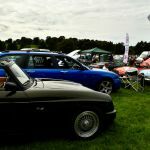 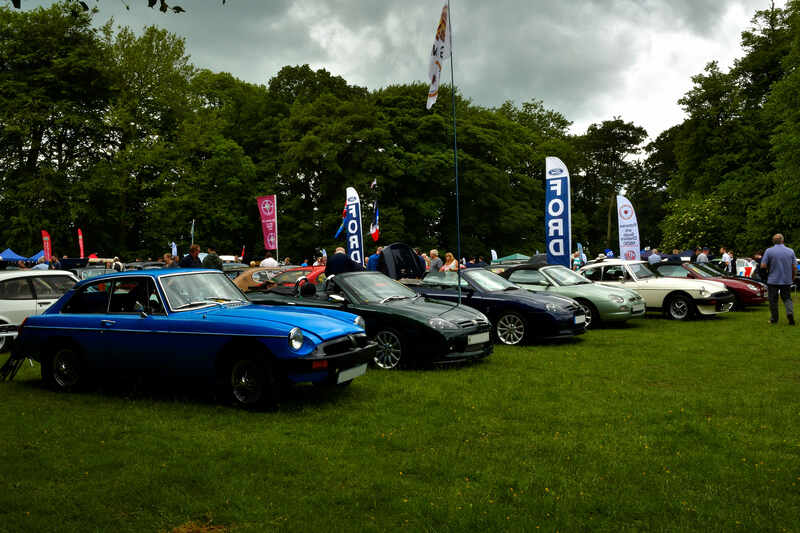 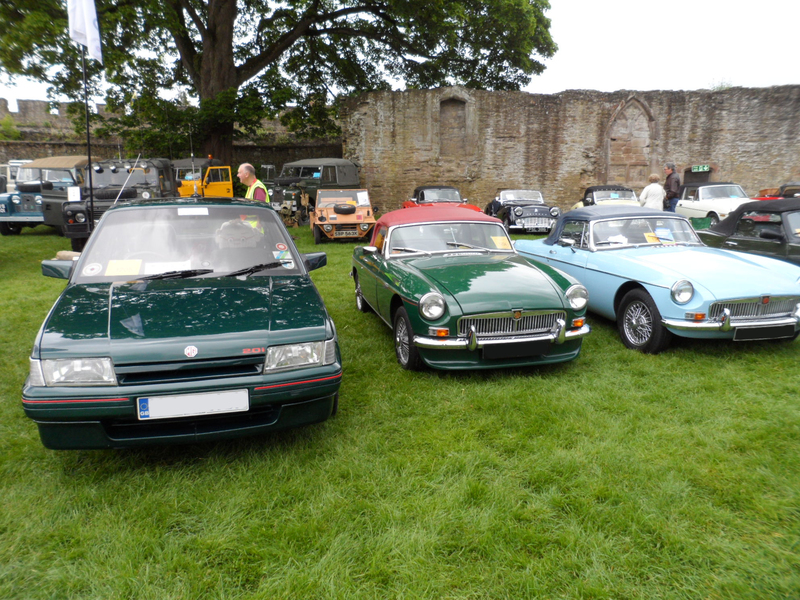 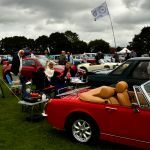 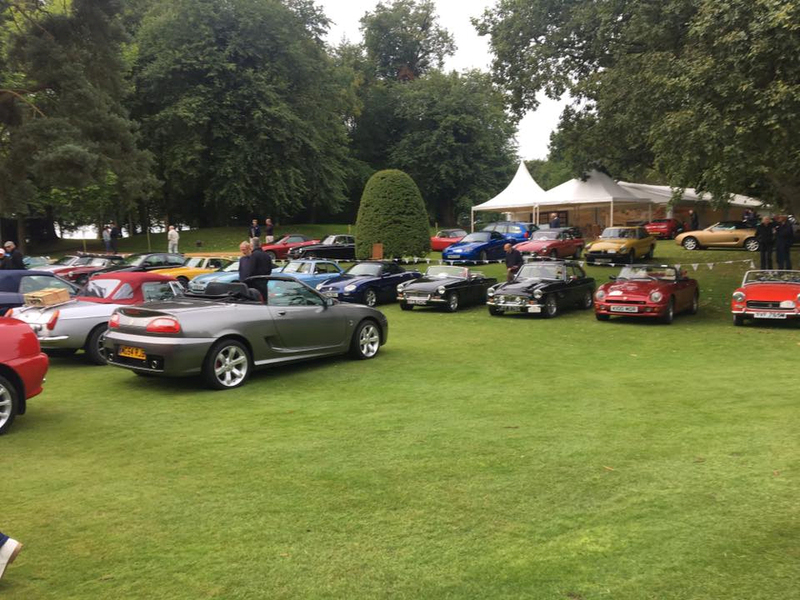 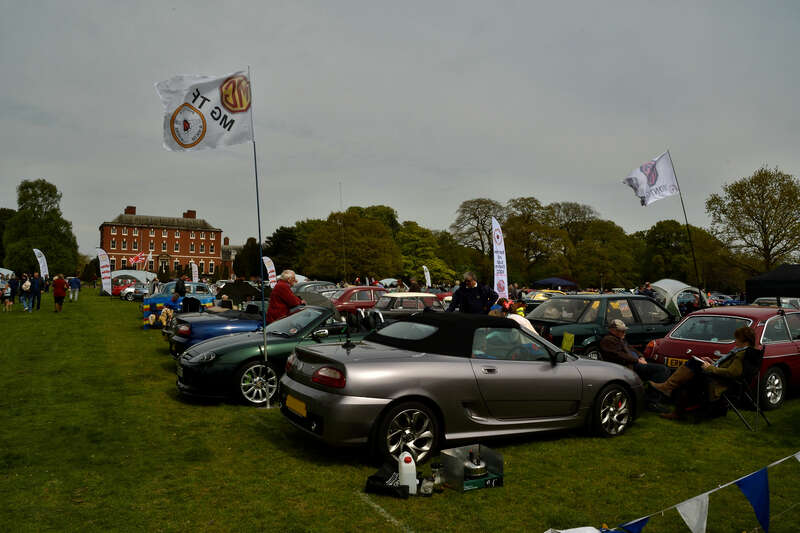 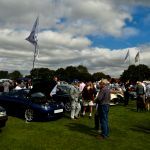 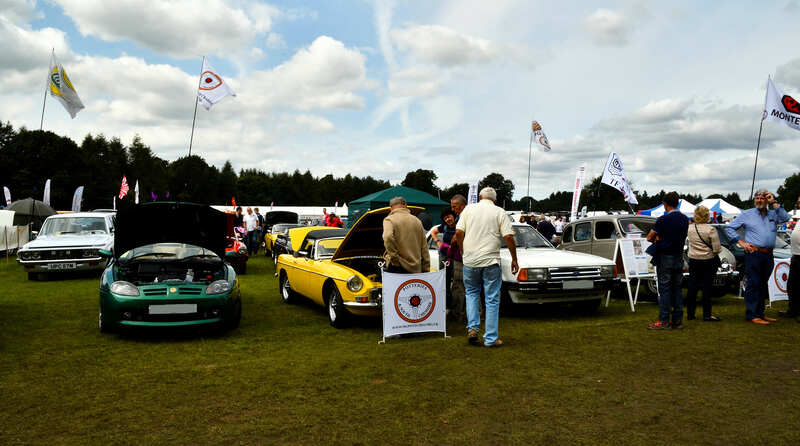 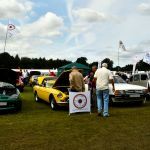 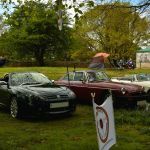 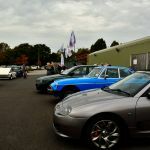 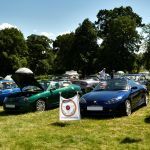 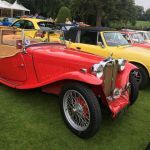 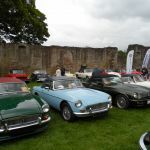 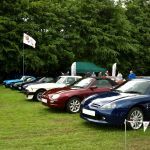 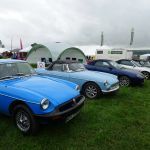 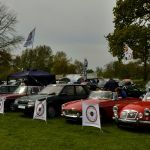 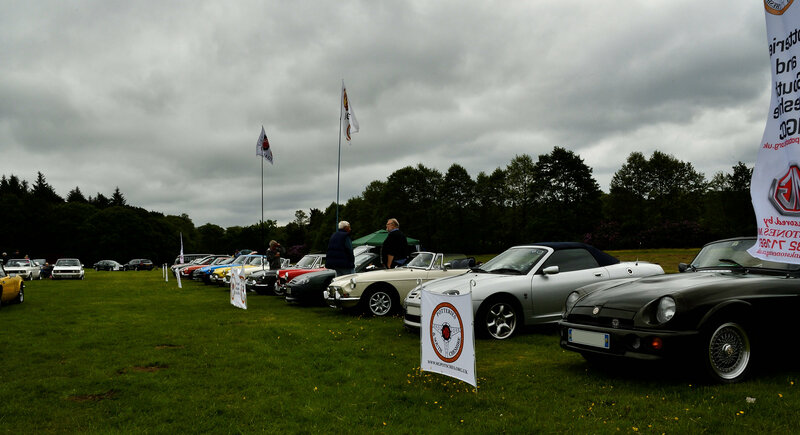 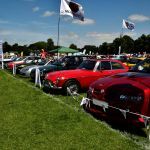 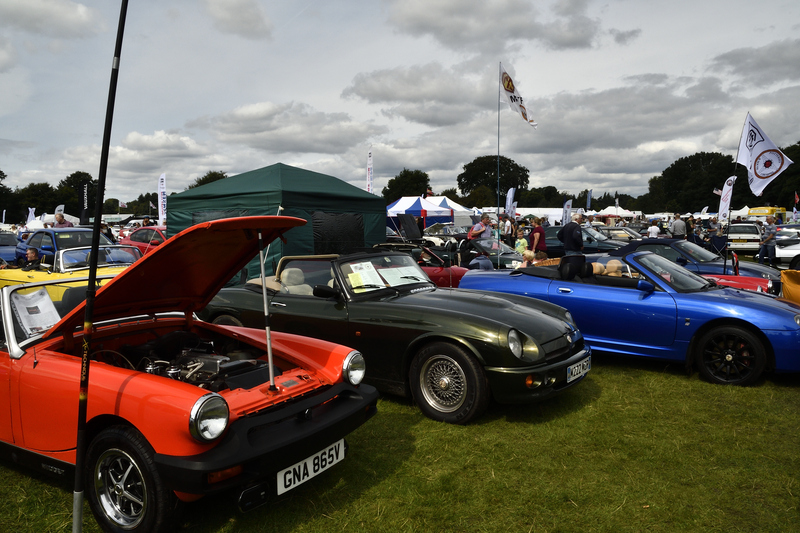 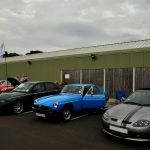 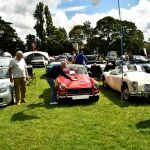 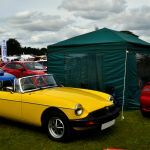 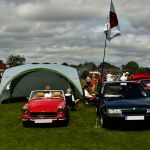 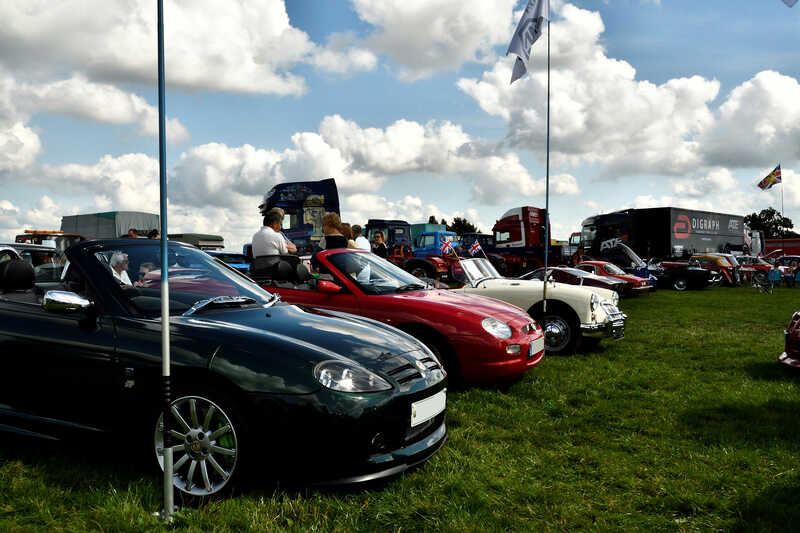 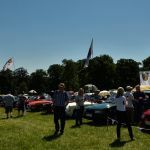 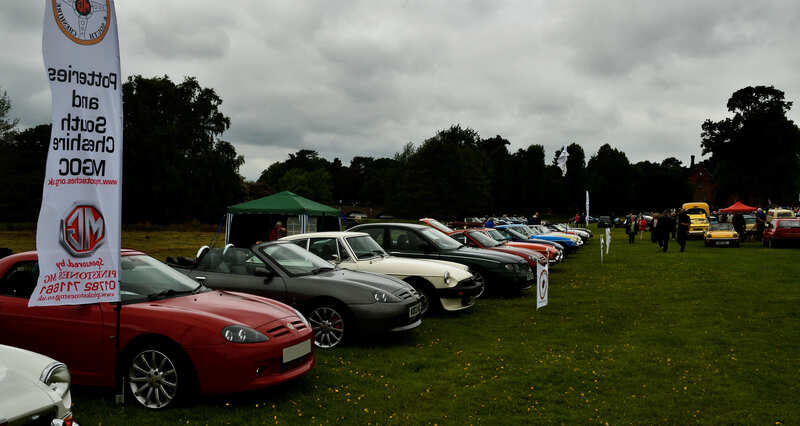 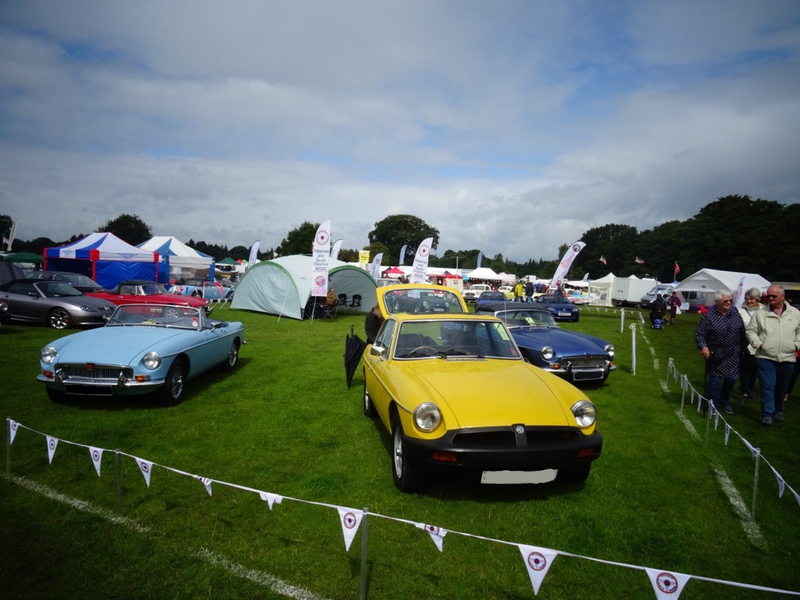 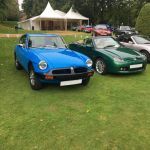 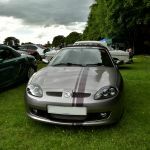 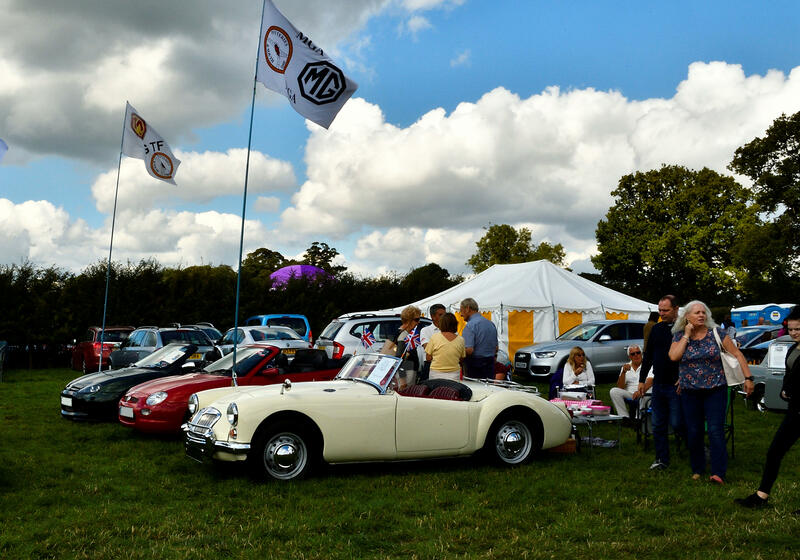 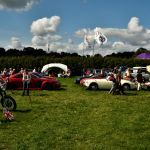 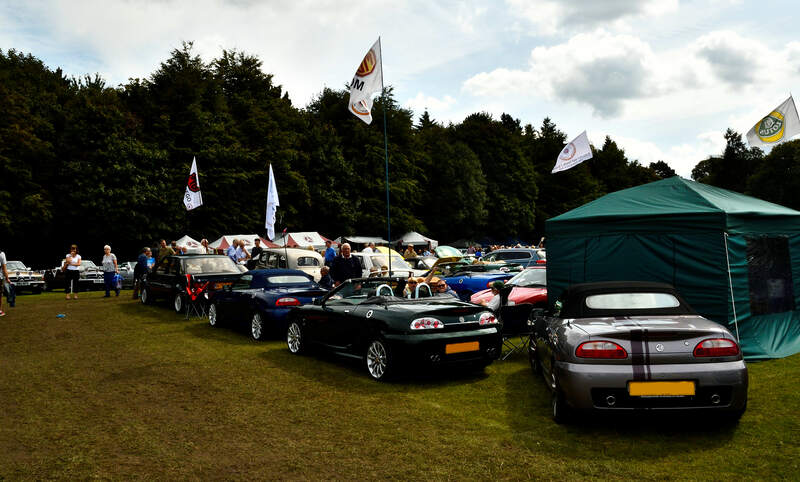 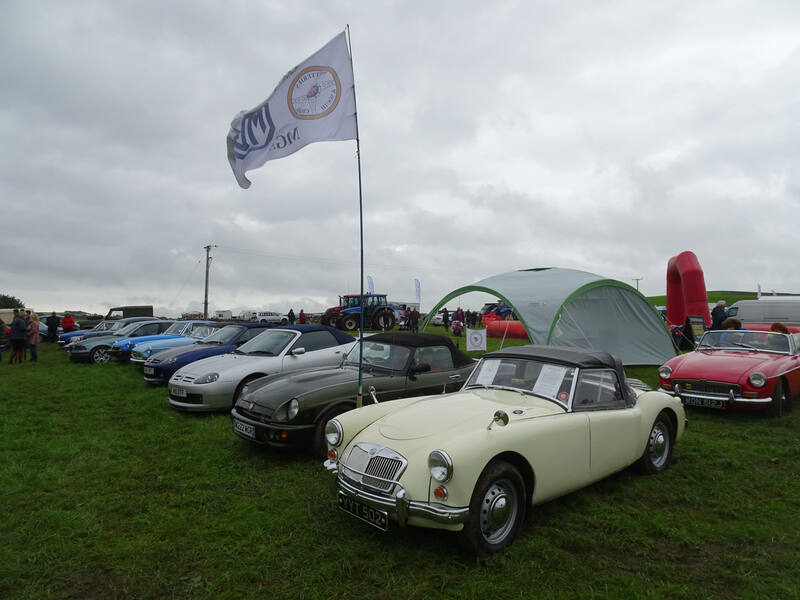 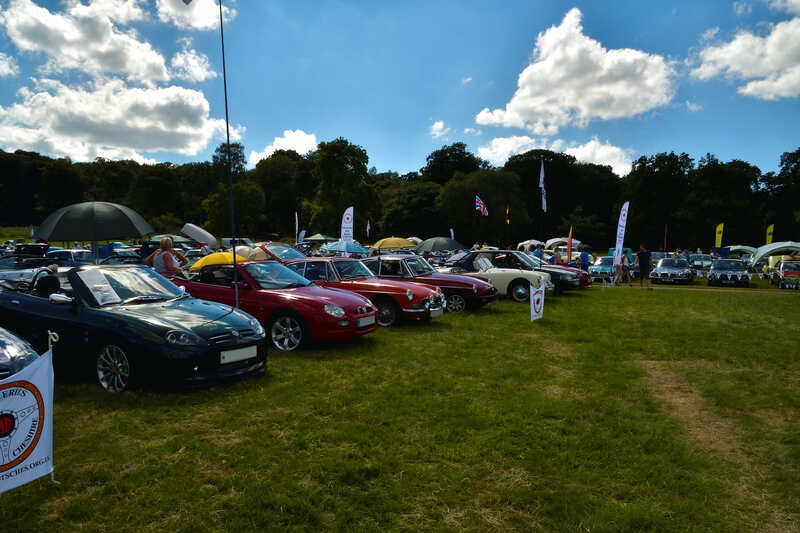 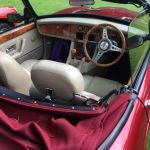 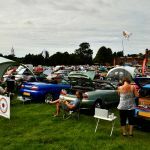 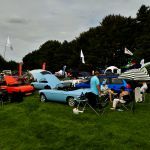 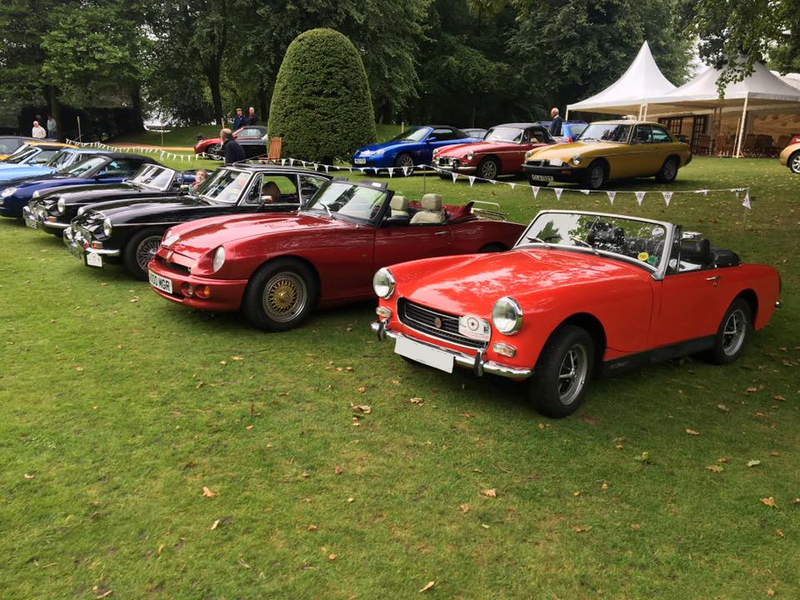 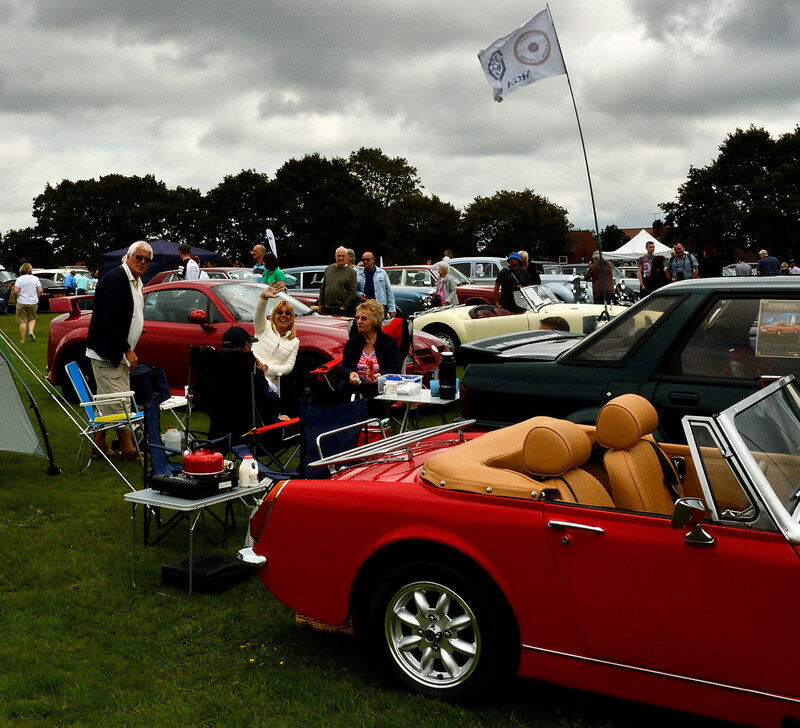 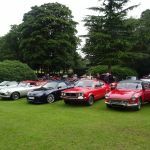 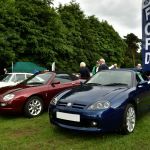 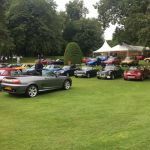 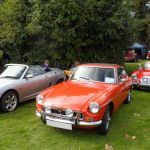 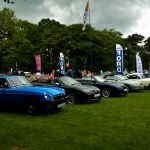 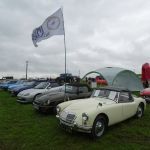 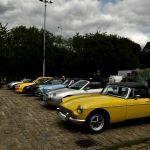 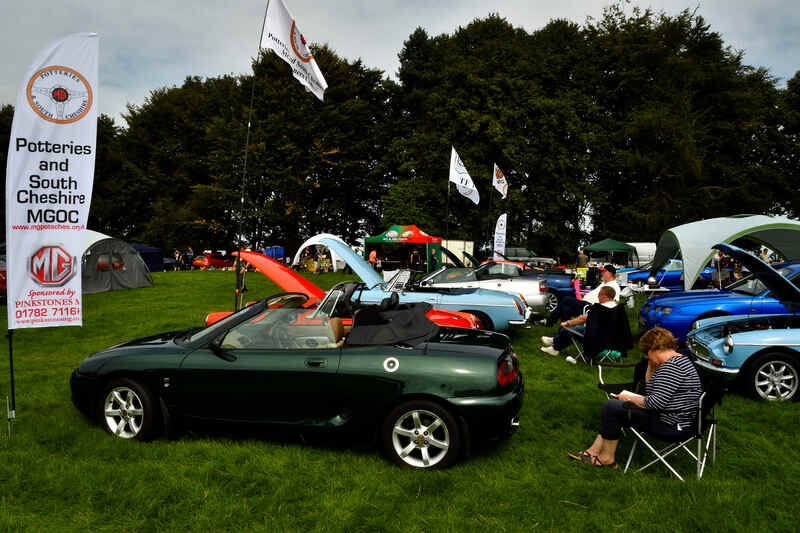 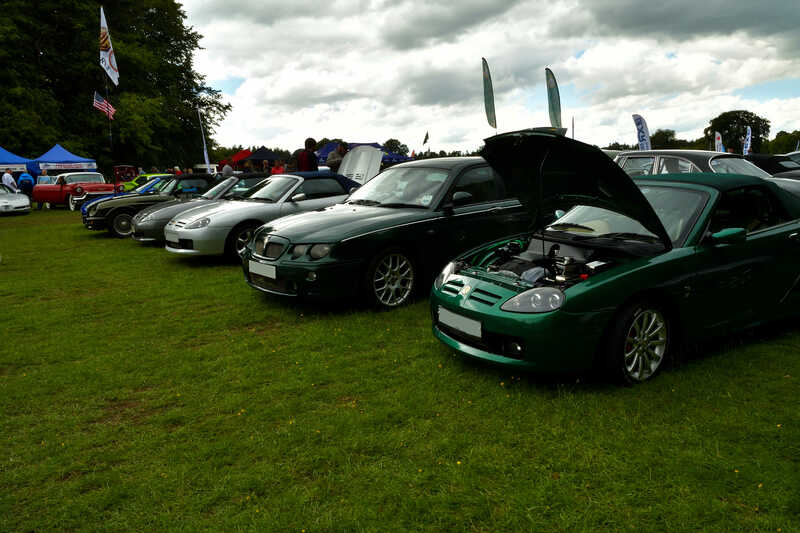 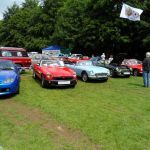 The club attened both days of the August Tatton Park “Passion for Power” Classic Motor Show, unfortunately the Saturday was hit with rain, followed by more rain overnight which left the grounds somewhat soggy and muddy in places on the Sunday. 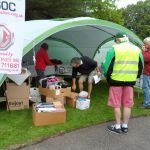 Unfortunately due to the conditions the organisers decided not to allow the clubs to sort their locations out themselves so we ended up with quite a few mixed displays and clubs not where they were meant to be. 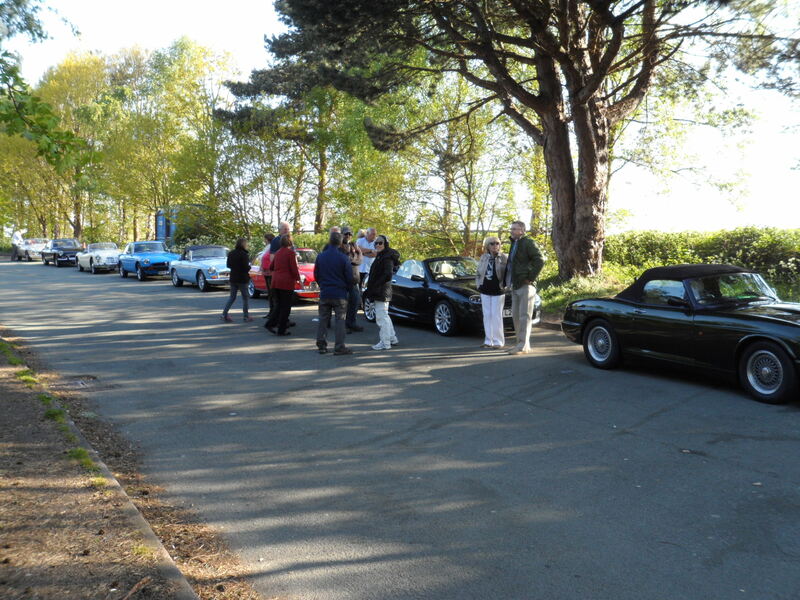 Thankfully we managed to regroup and made the best of it with only a few members in other parts of the field. 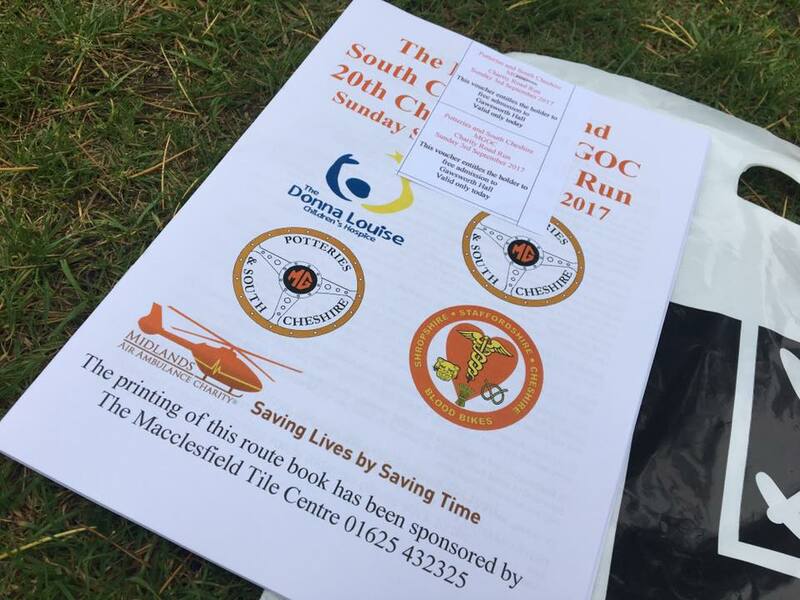 We along with other clubs made the best of the day and thankfully the weather turned out warm and fine with no more rain !!! 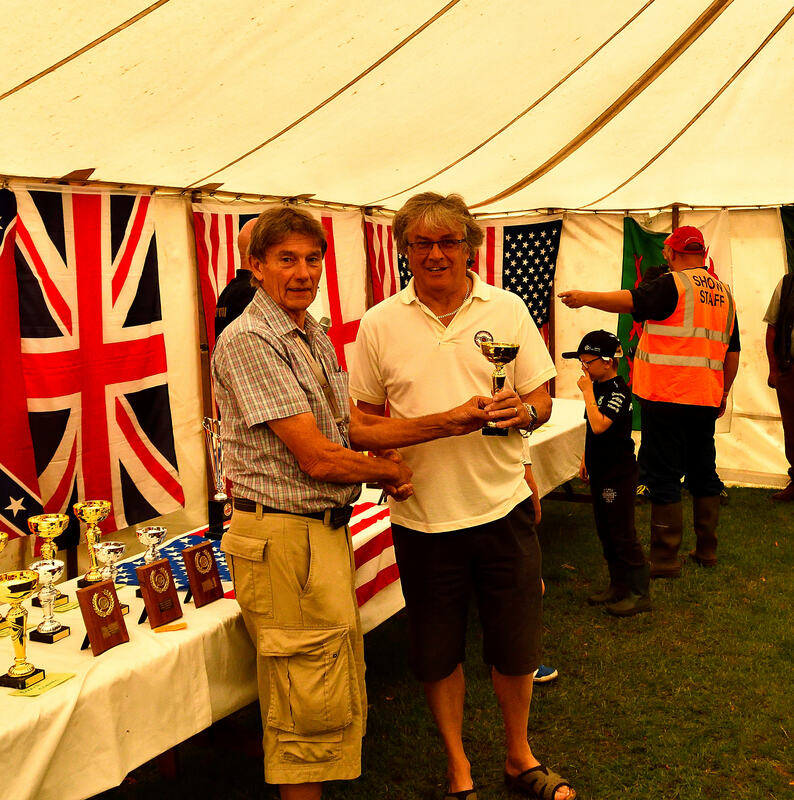 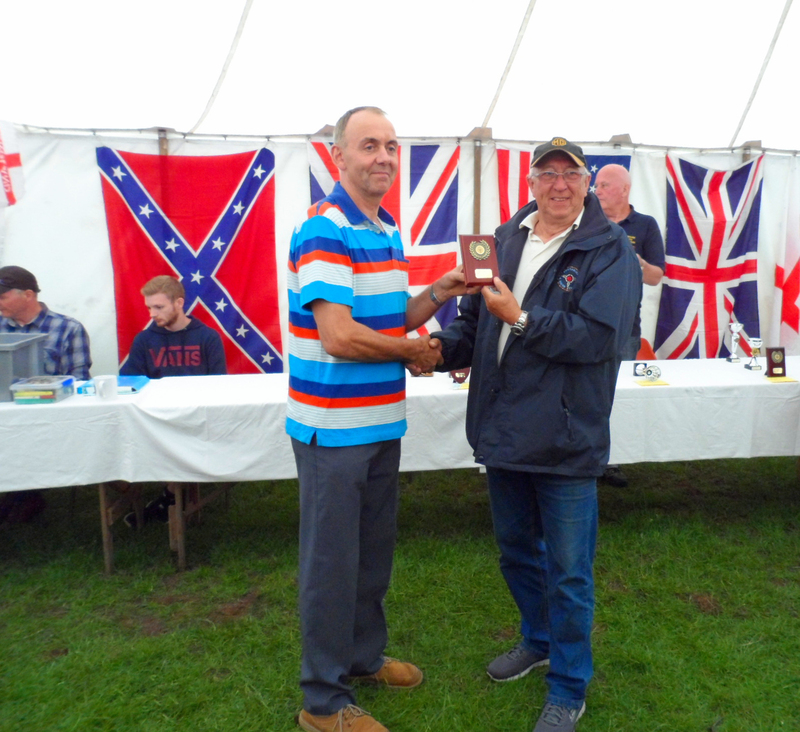 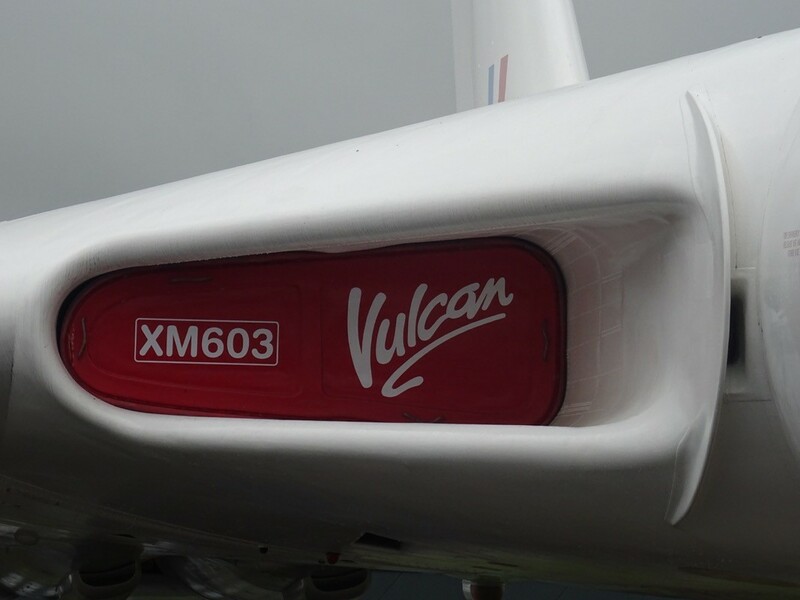 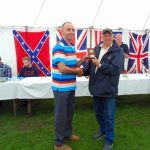 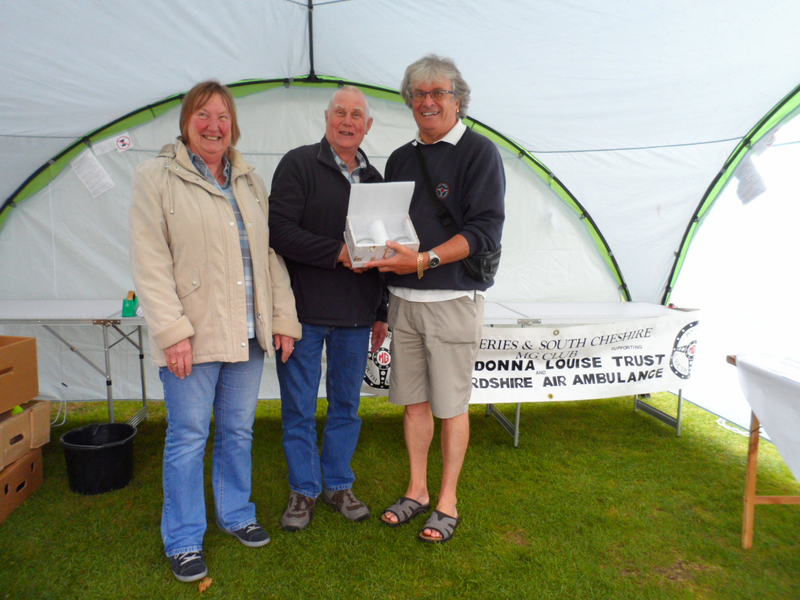 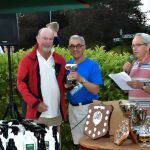 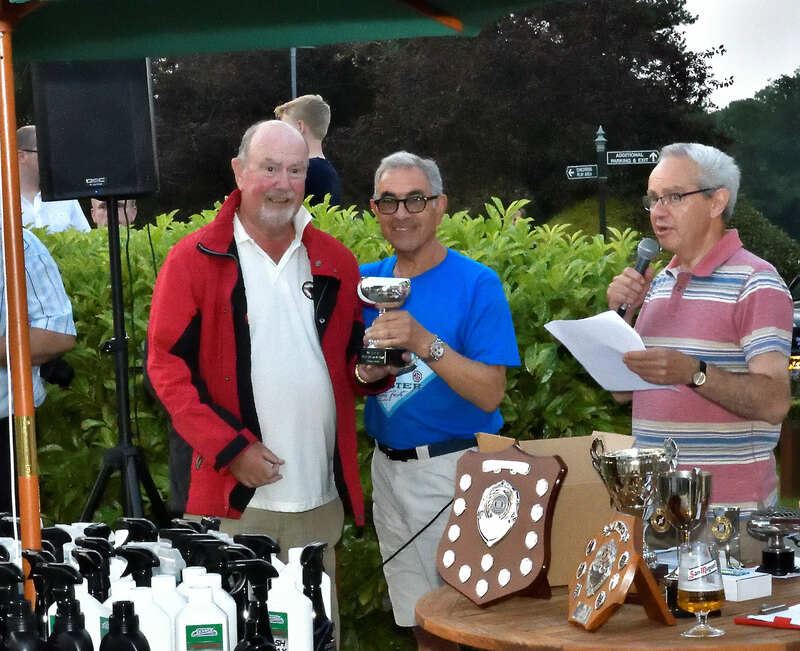 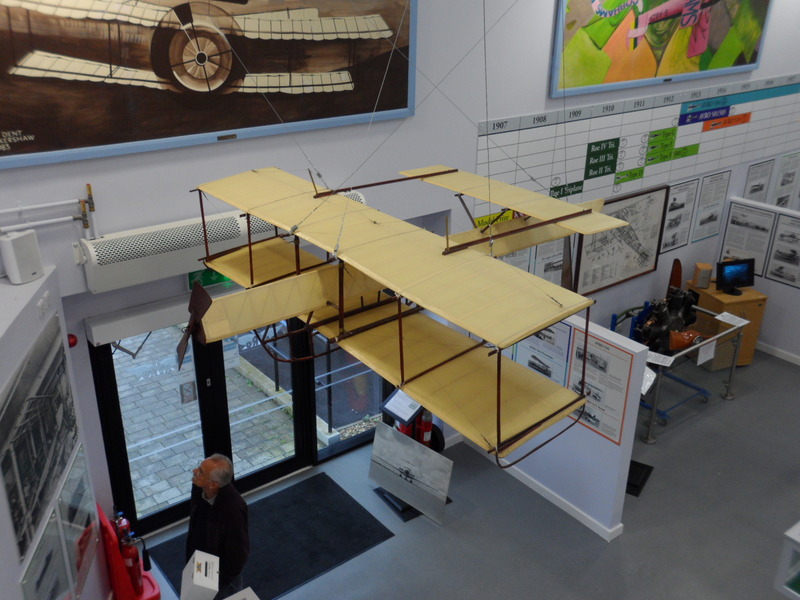 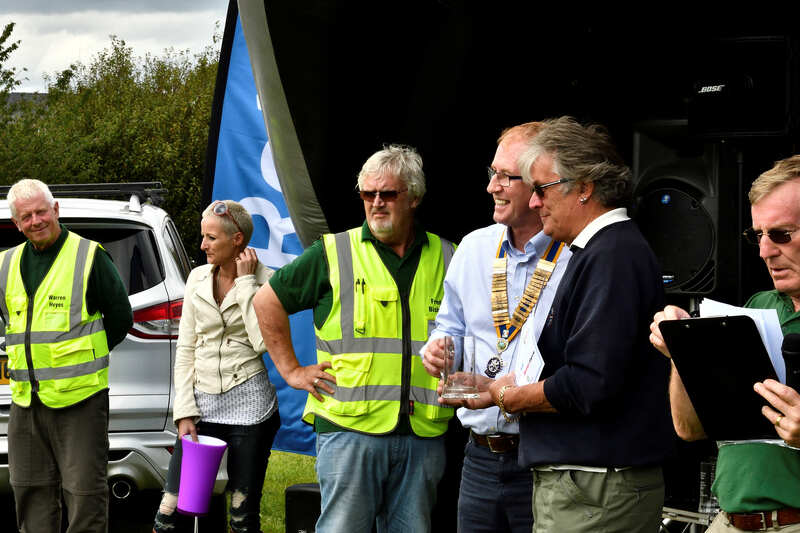 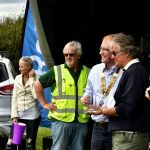 Bob the club secretary won best RV8 in show – well done !! 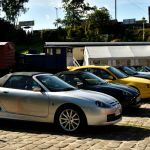 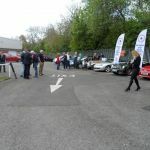 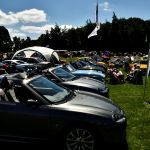 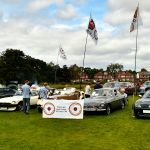 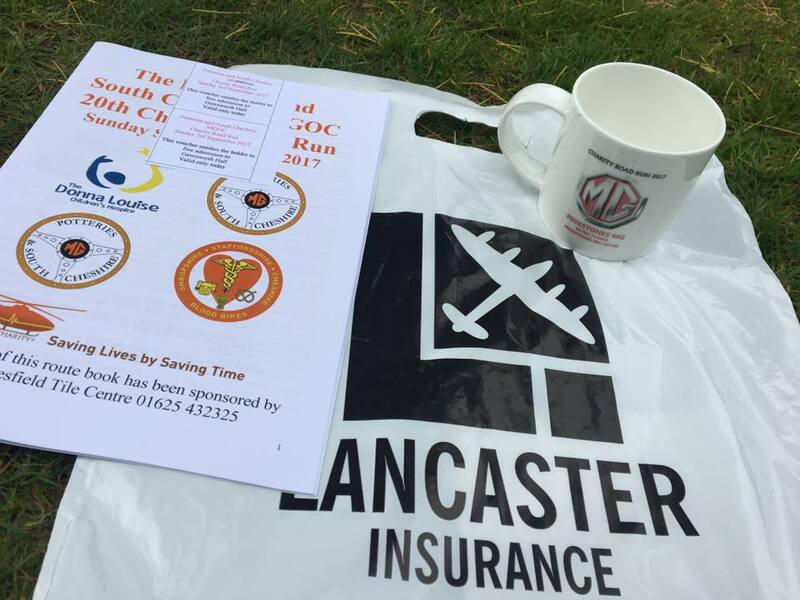 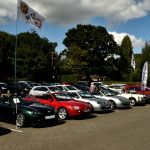 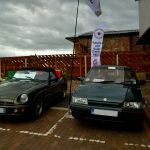 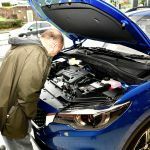 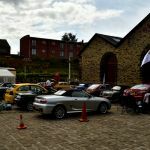 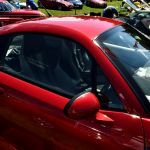 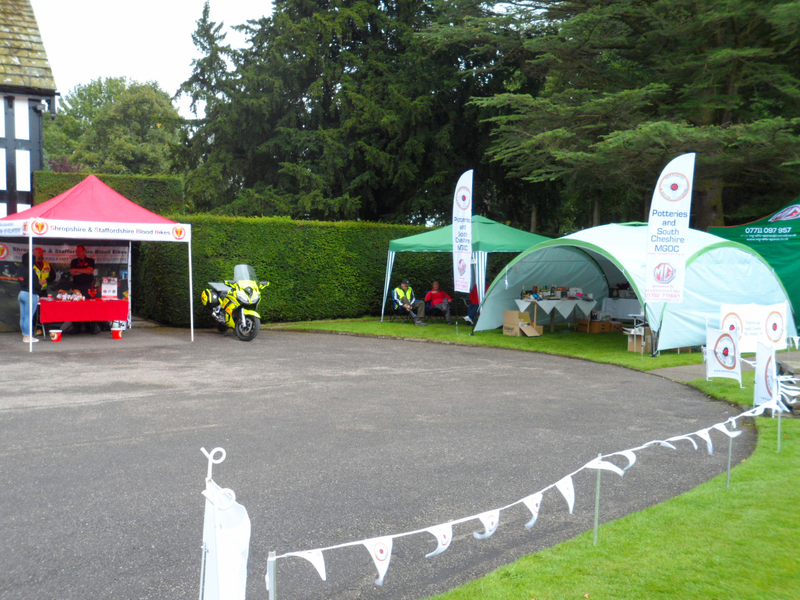 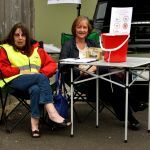 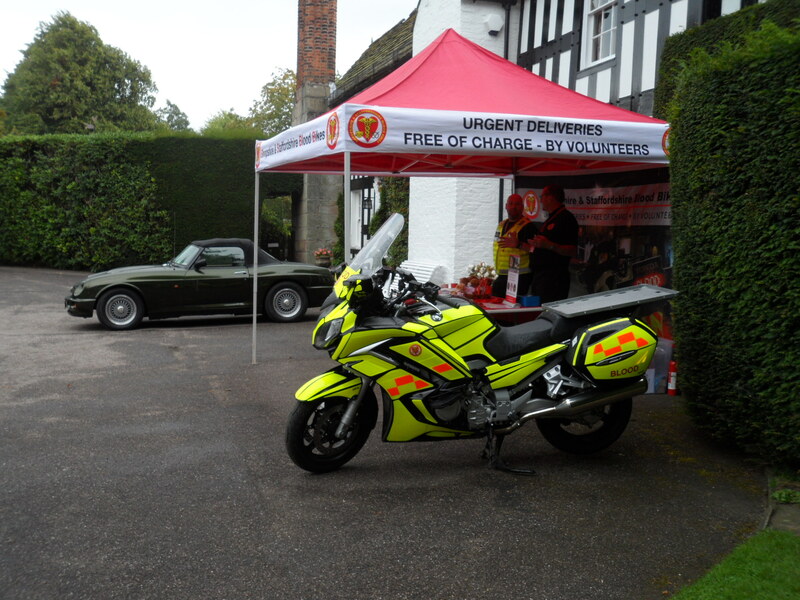 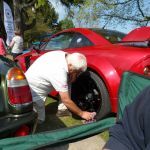 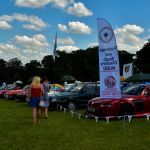 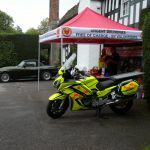 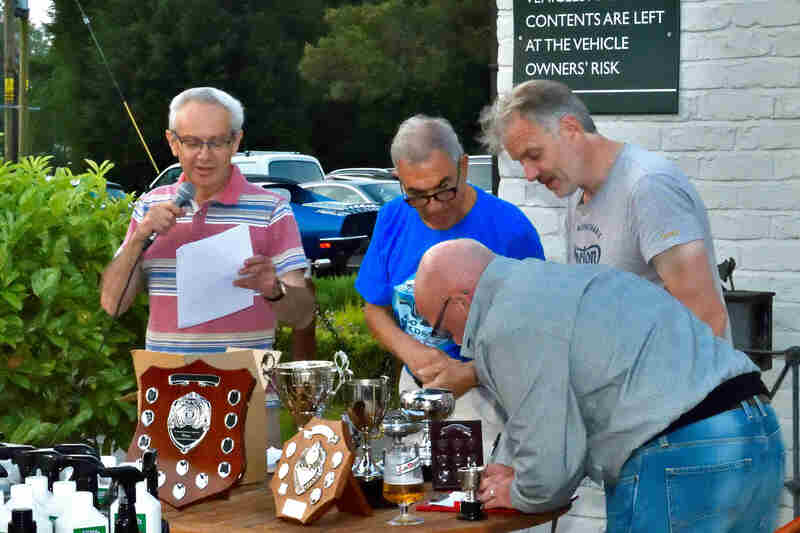 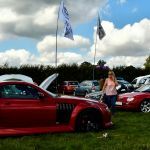 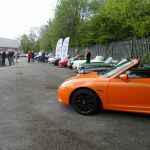 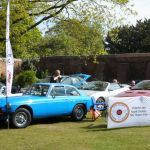 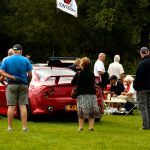 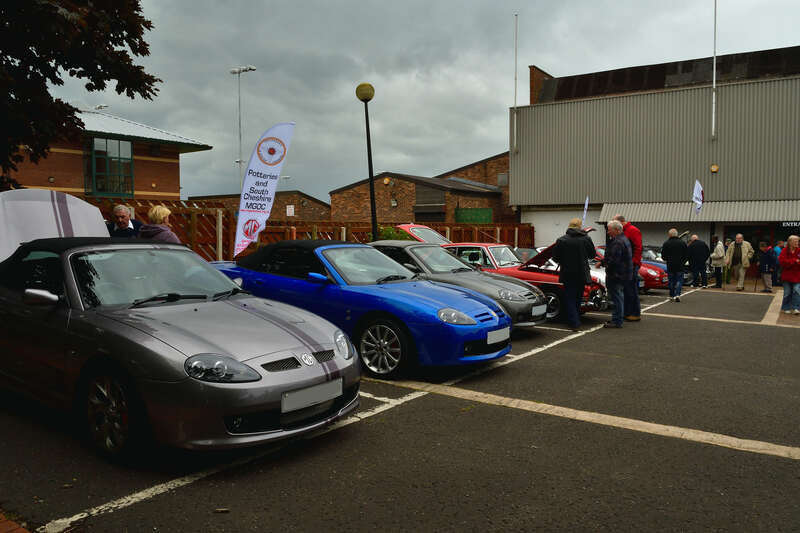 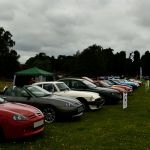 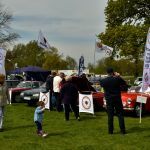 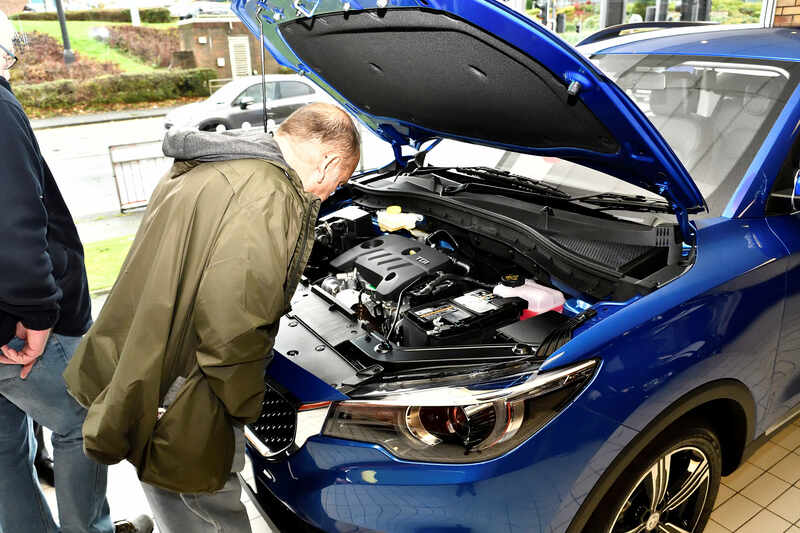 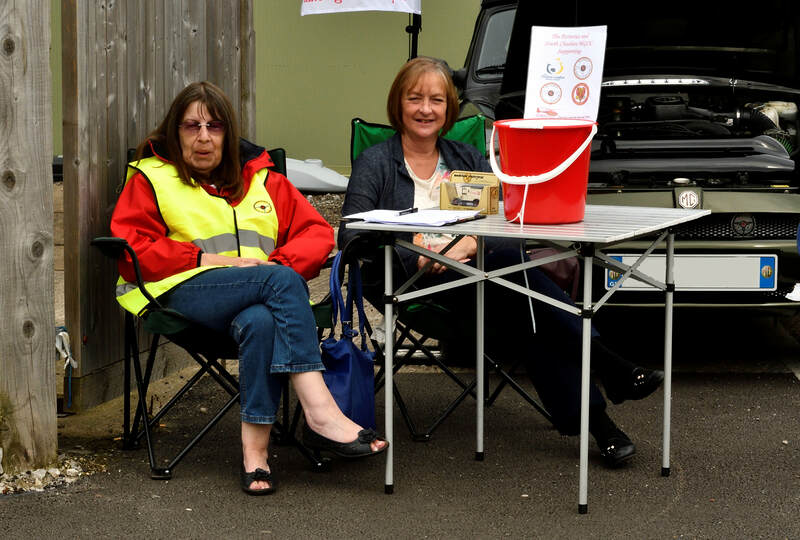 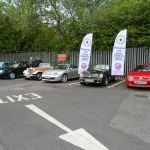 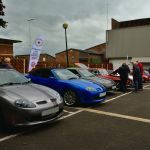 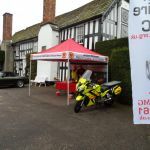 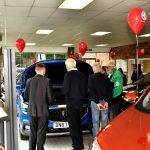 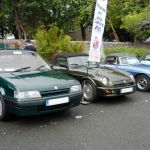 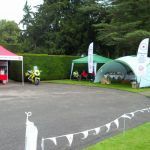 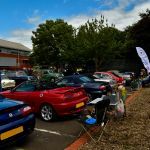 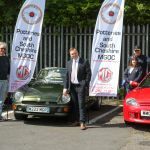 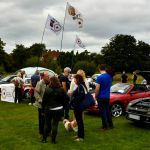 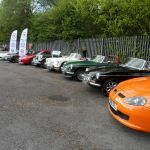 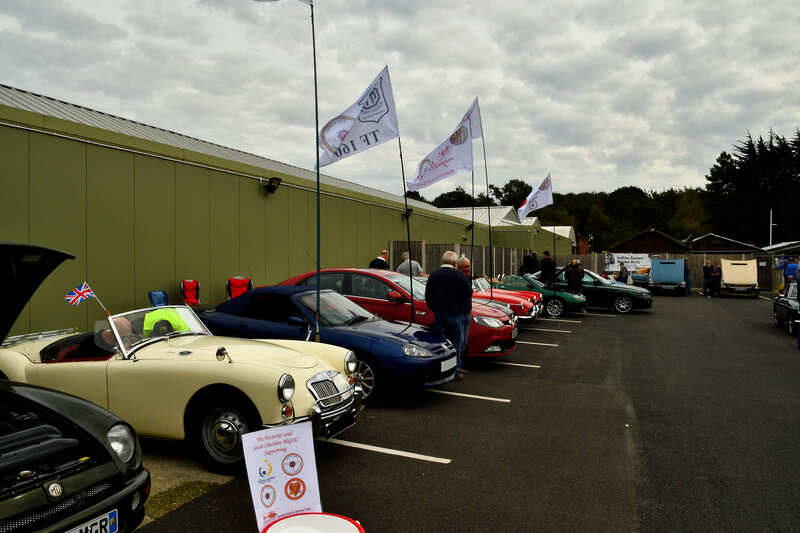 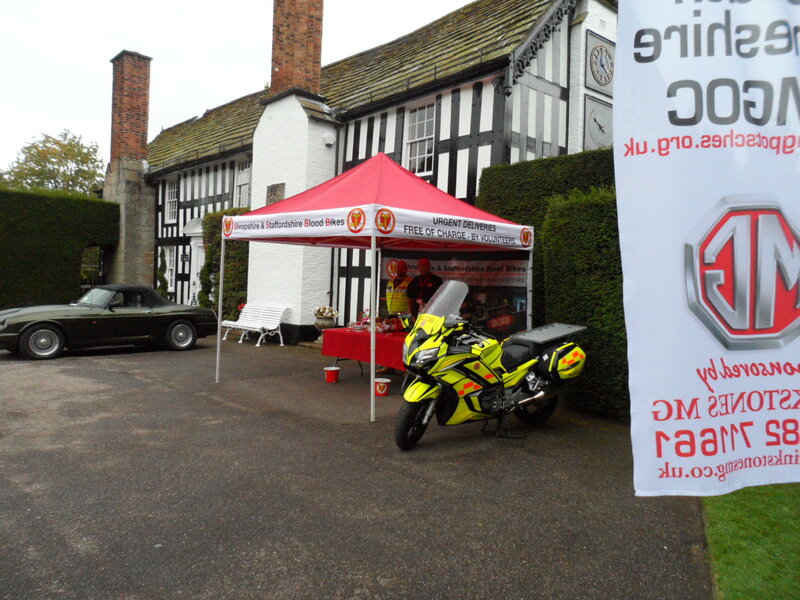 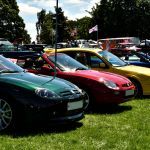 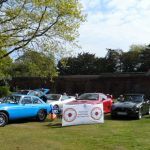 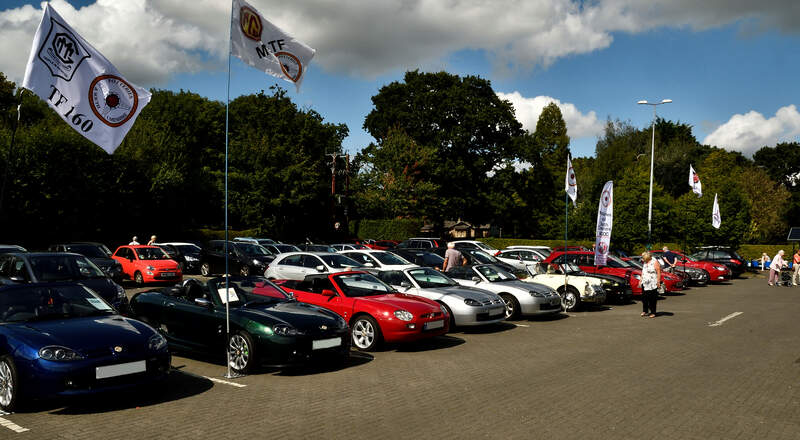 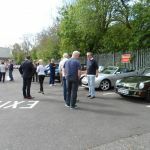 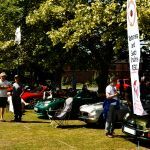 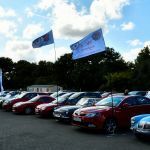 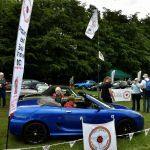 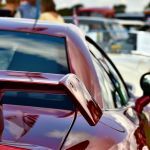 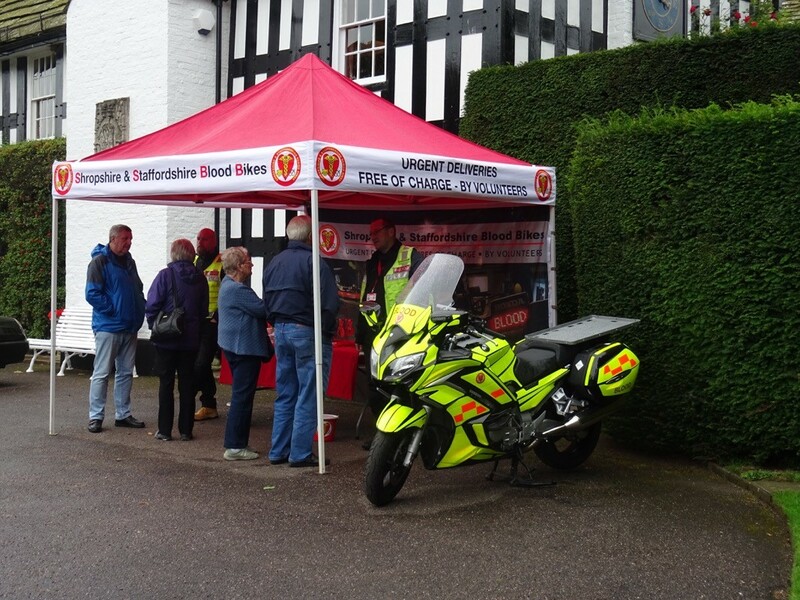 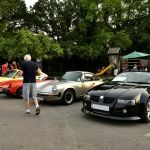 It was a busy Bank Holiday weekend for the club starting on the Saturday when we put on our annual charity car display at the High Legh Garden Centre, Knutsford along with our tombola raffling off prizes to raise money for the Donna Louise Children’s Hospice, Air Ambulance and the Blood Bikers. 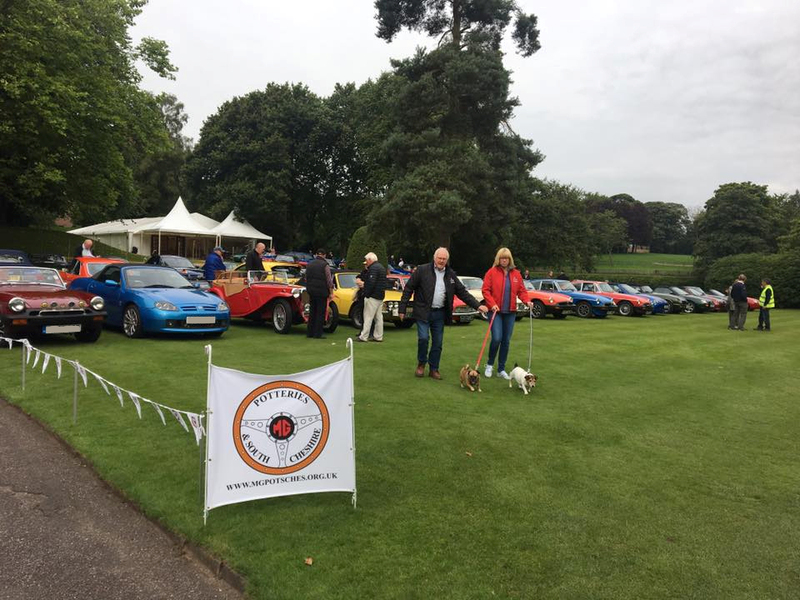 It was a great day with fine weather and we managed to raise a sizeable amount of money for these worthwhile charities (more details to follow later). 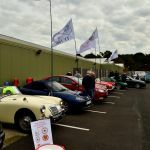 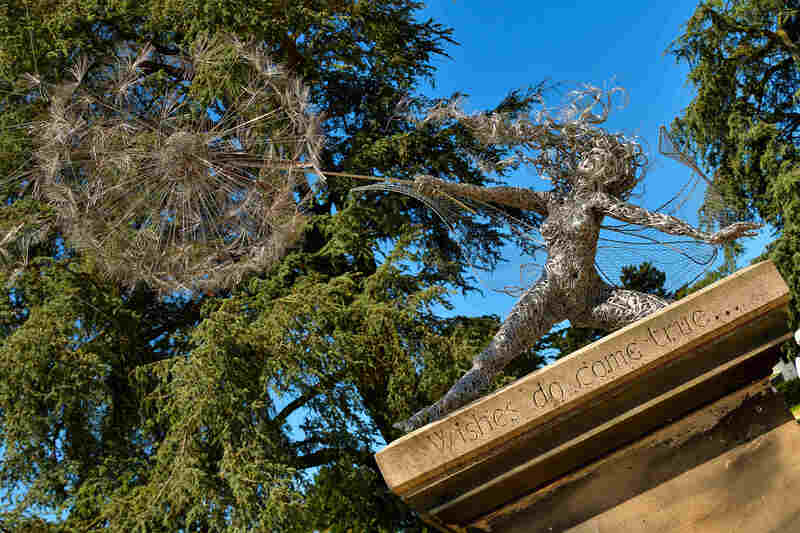 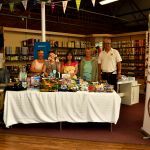 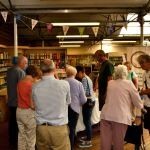 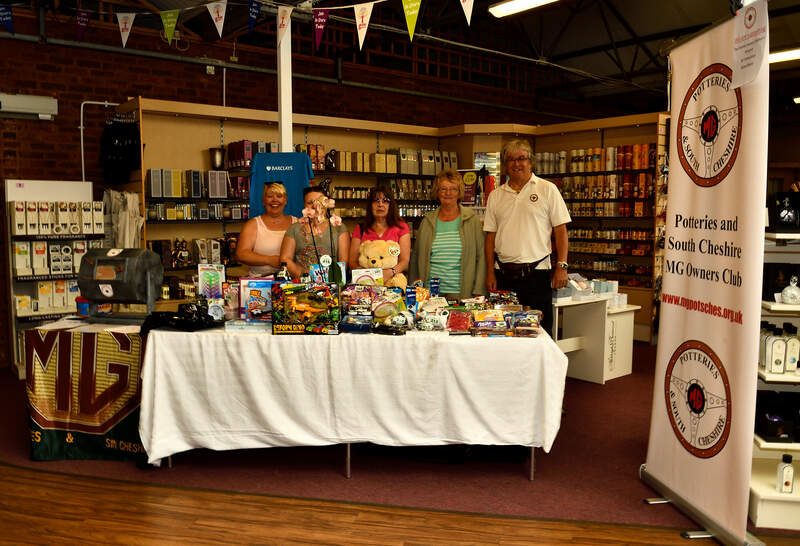 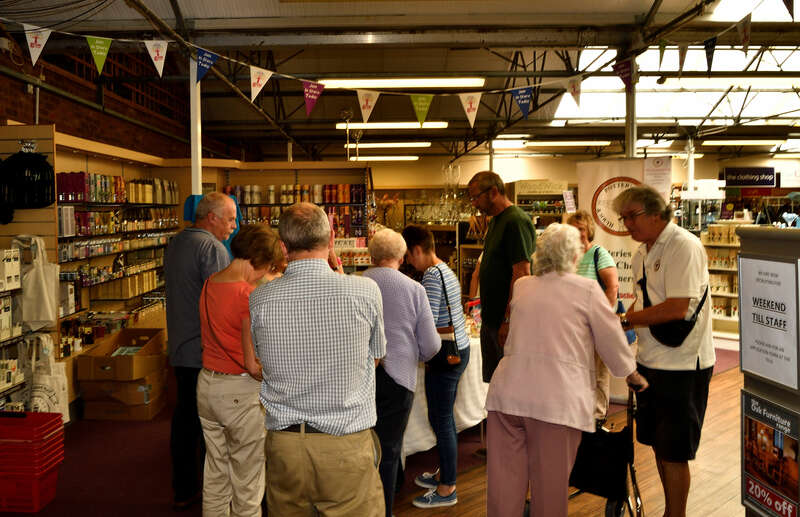 We would like to thank the staff ate the garden centre for making us very welcome and supporting this event along with all the generous visitors to the centre for the donations. 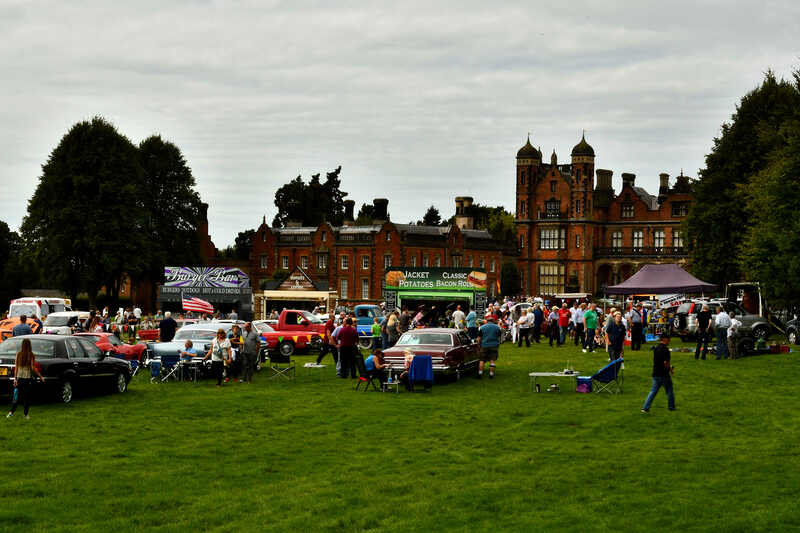 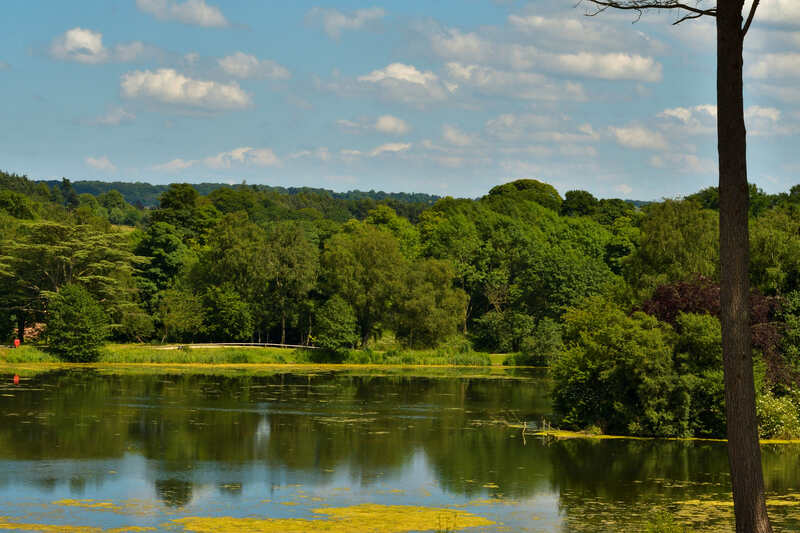 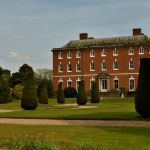 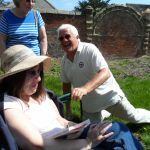 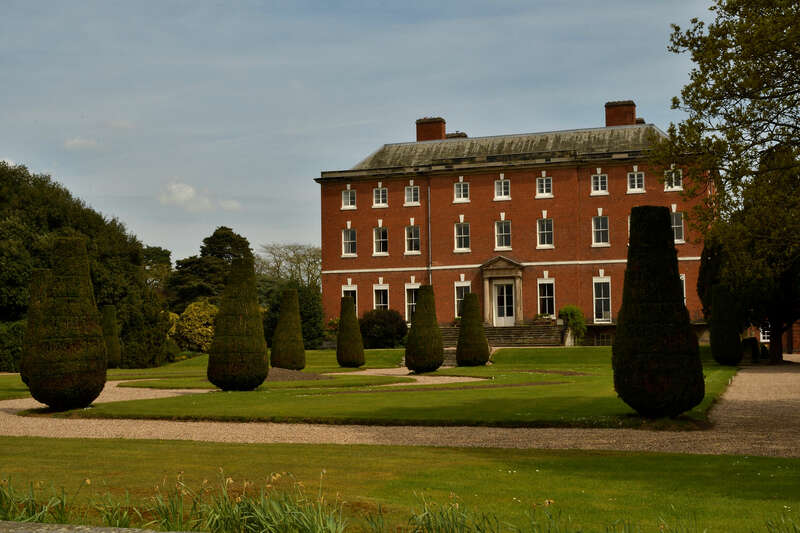 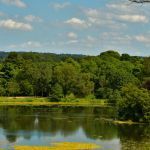 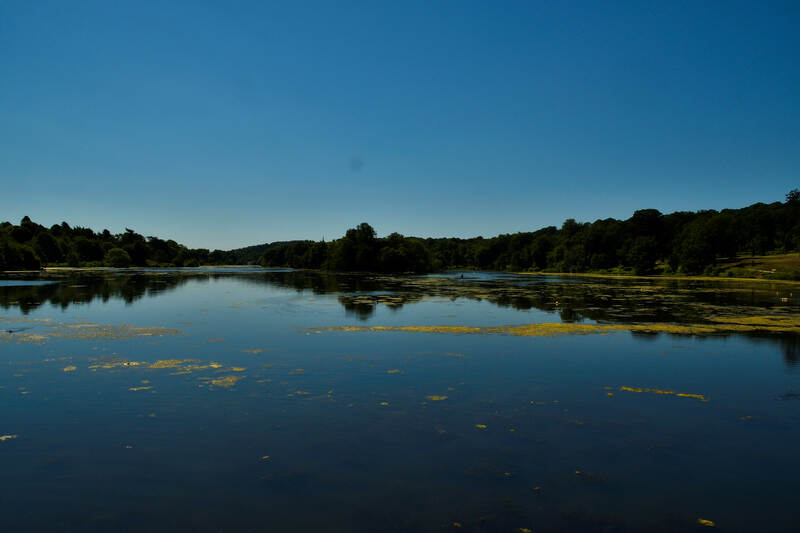 On the Saturday we were at Capesthorne Hall and surprisingly considering the summer we have been having another warm dry day !. 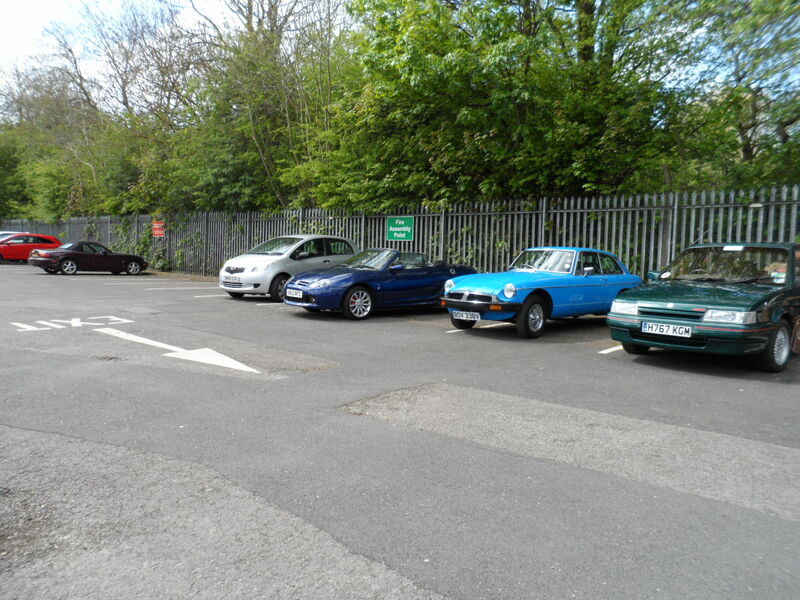 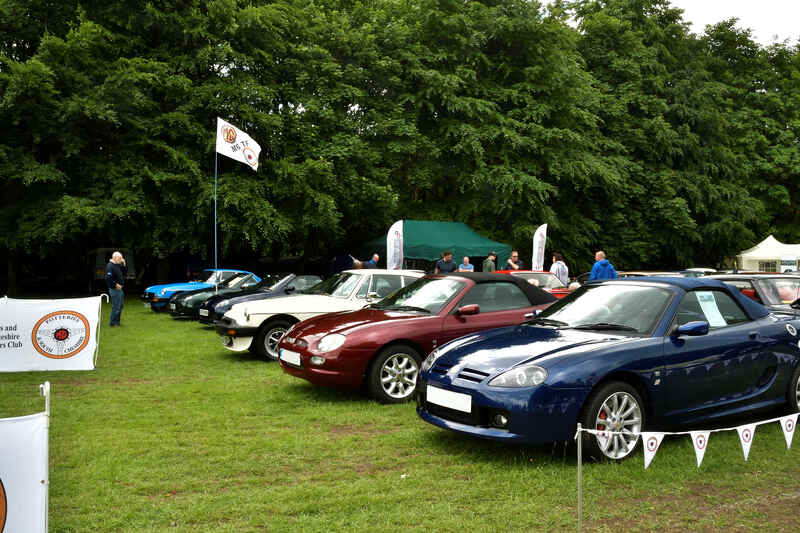 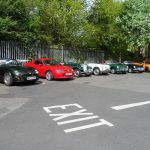 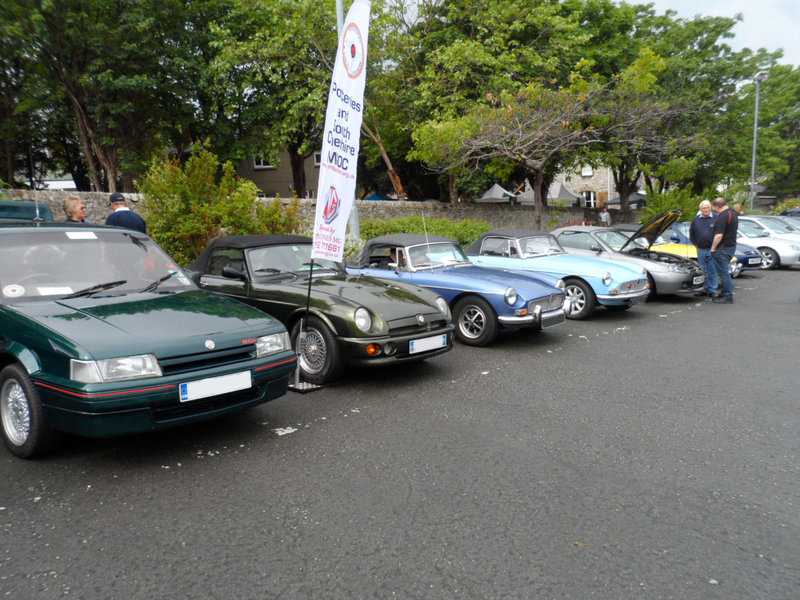 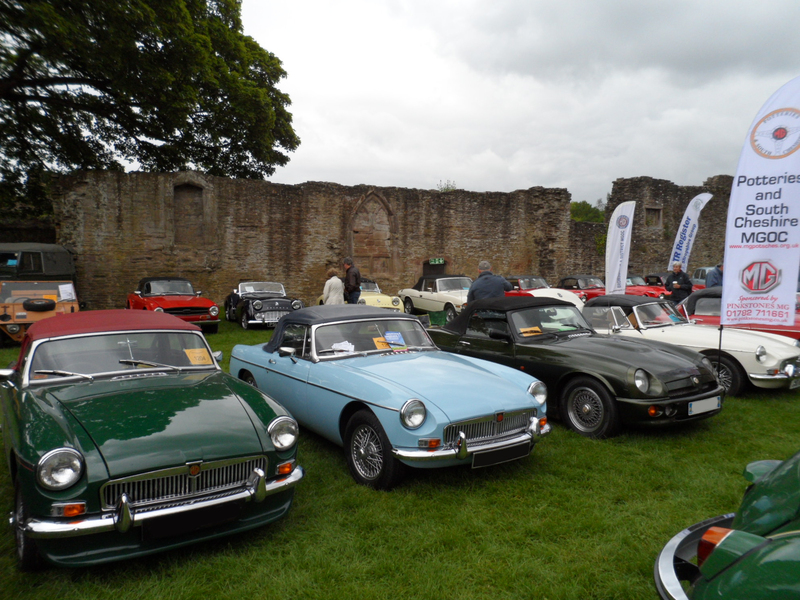 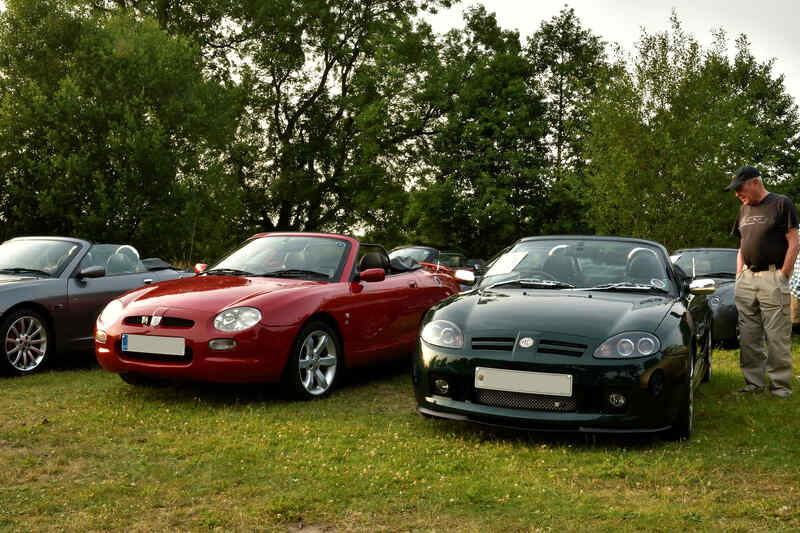 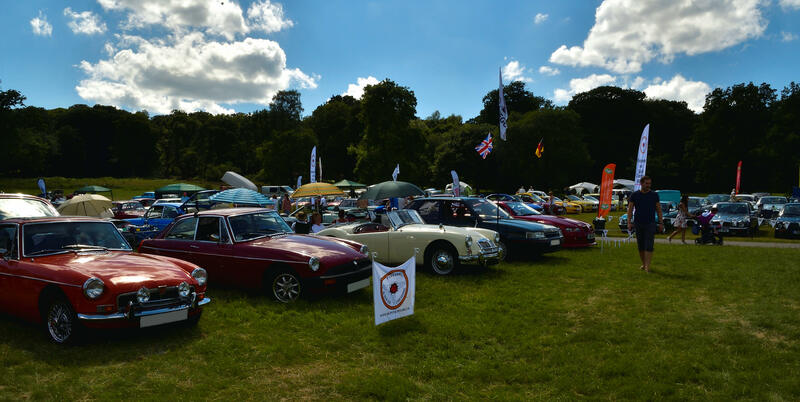 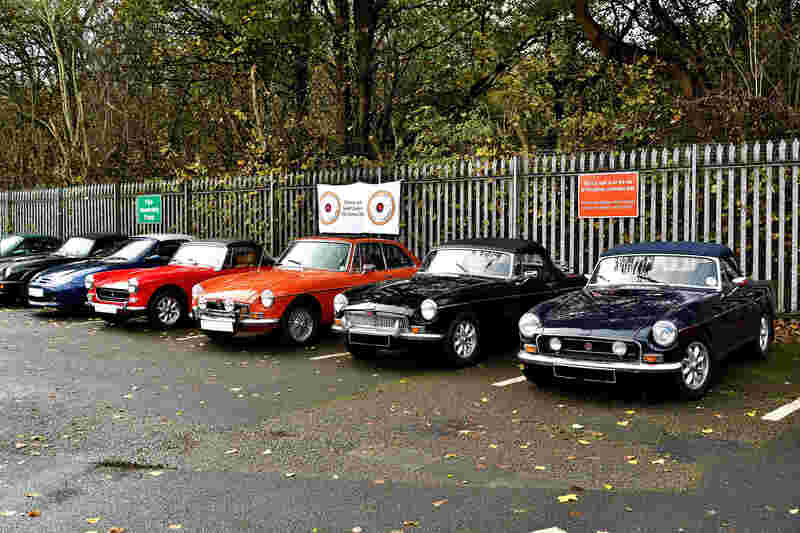 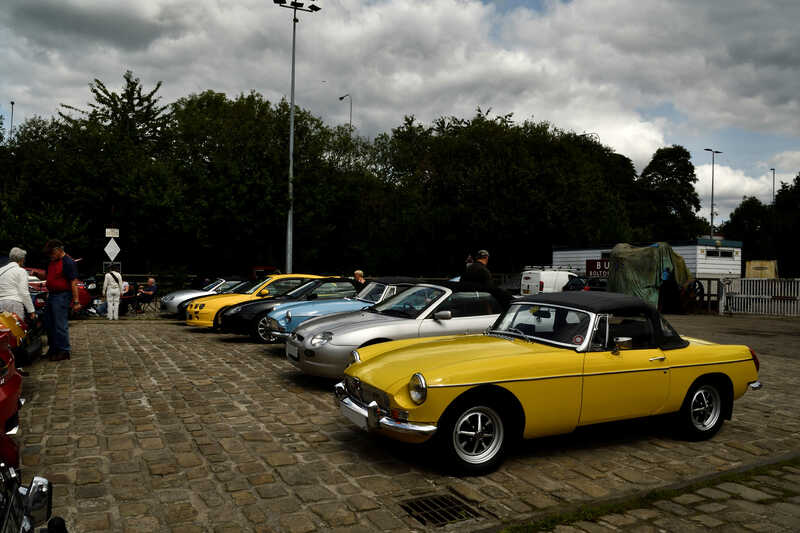 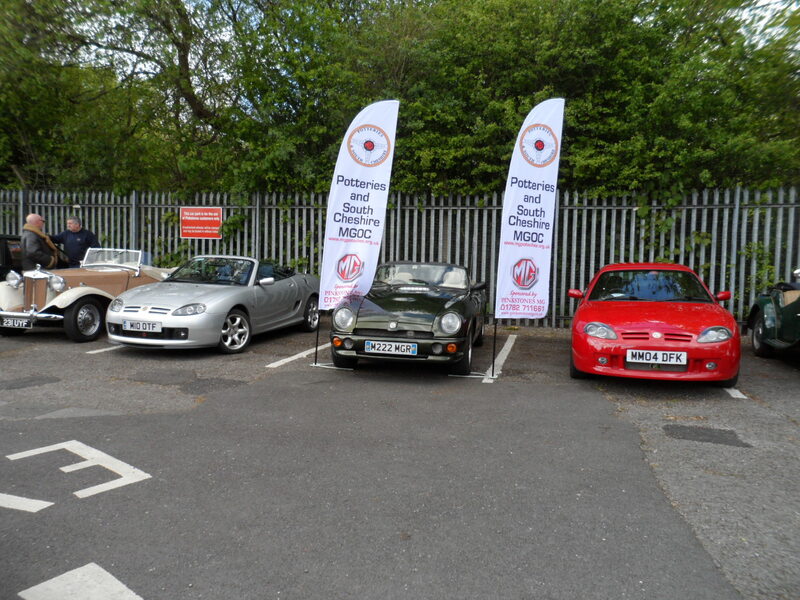 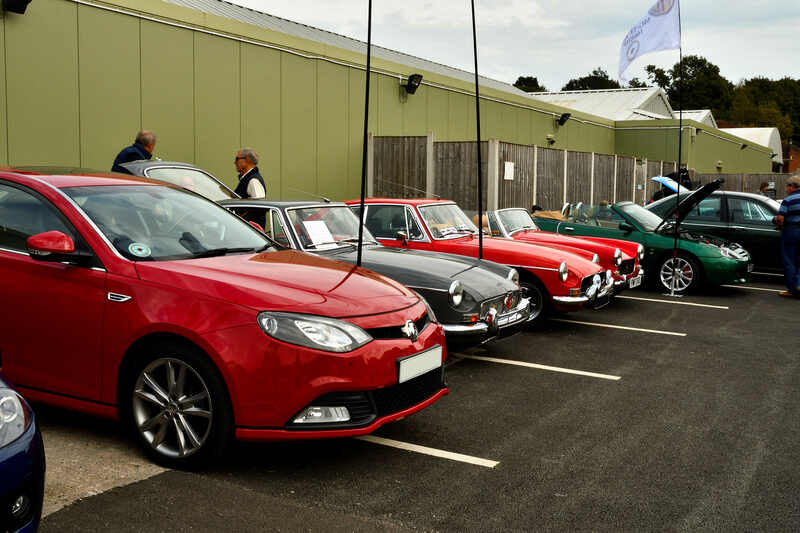 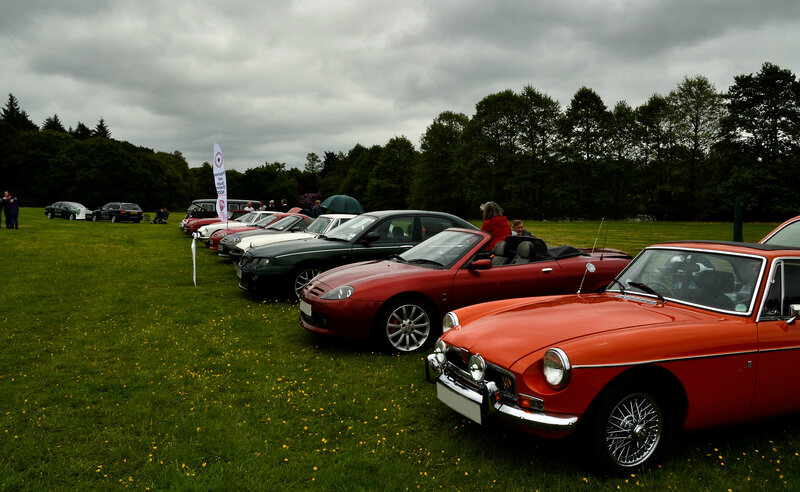 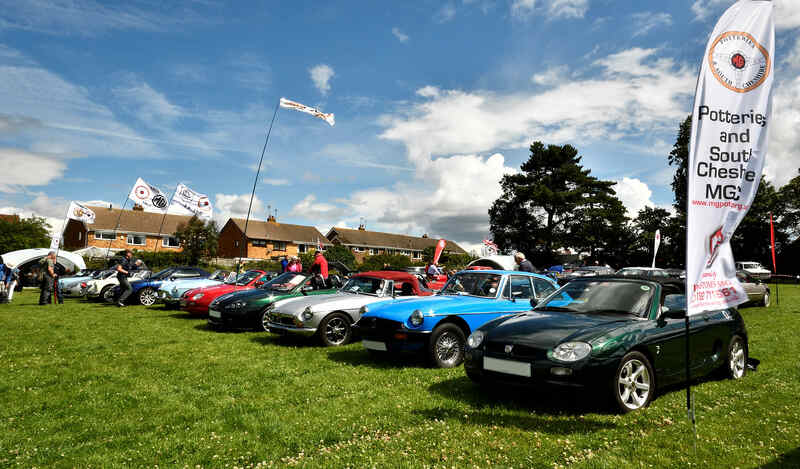 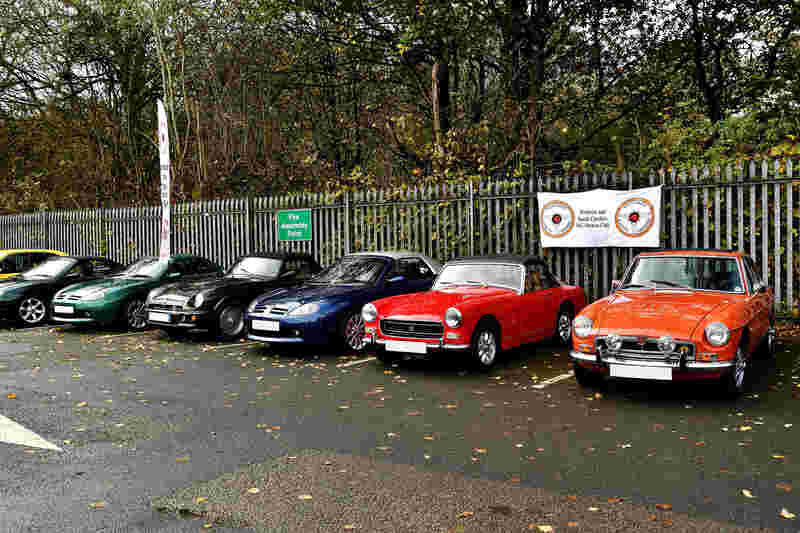 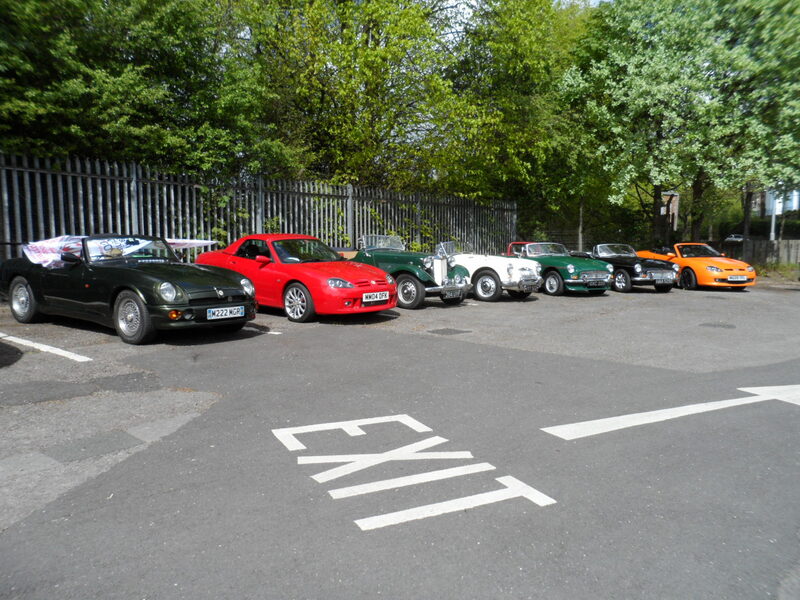 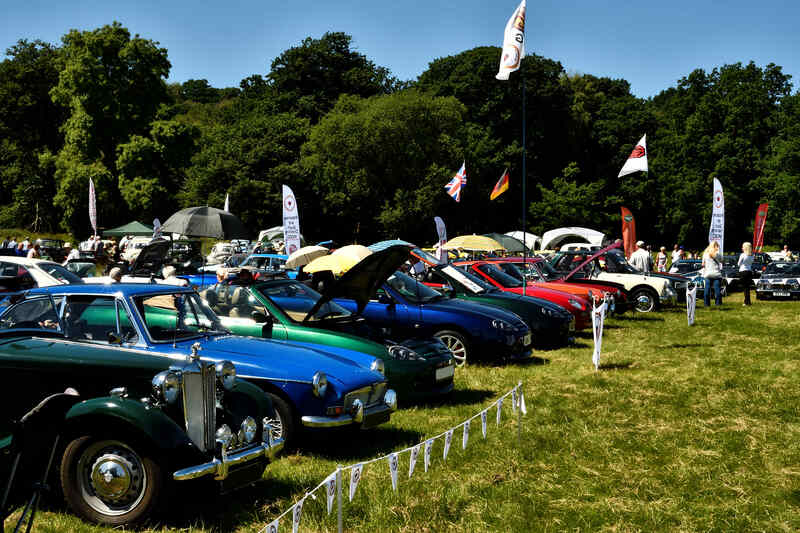 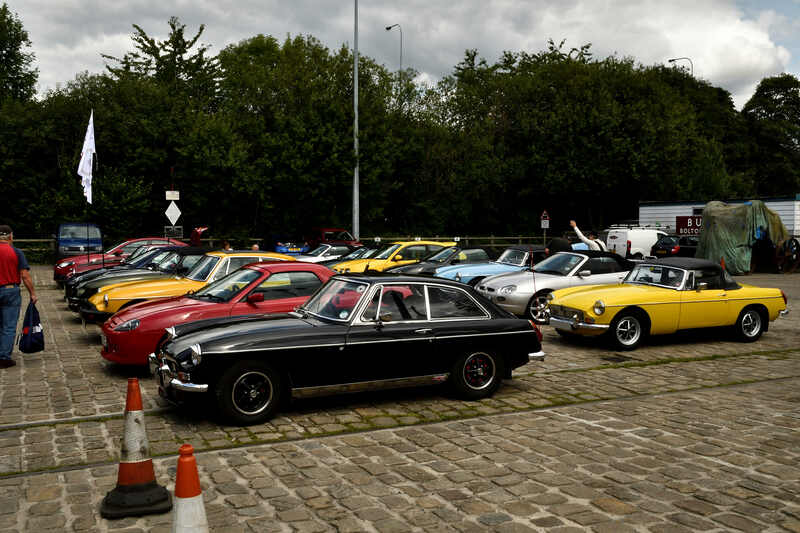 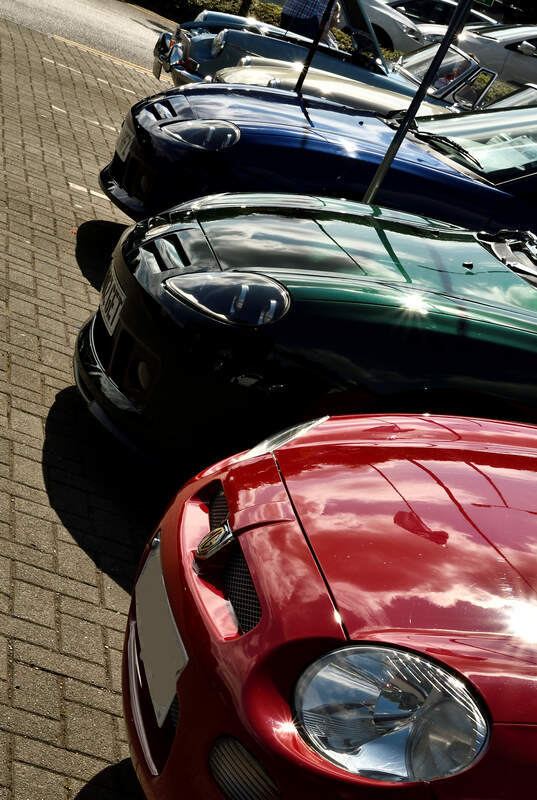 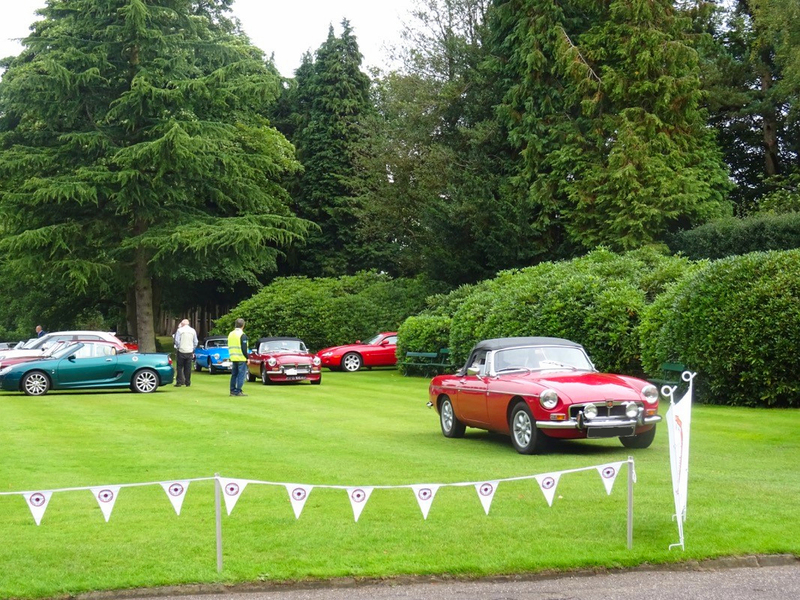 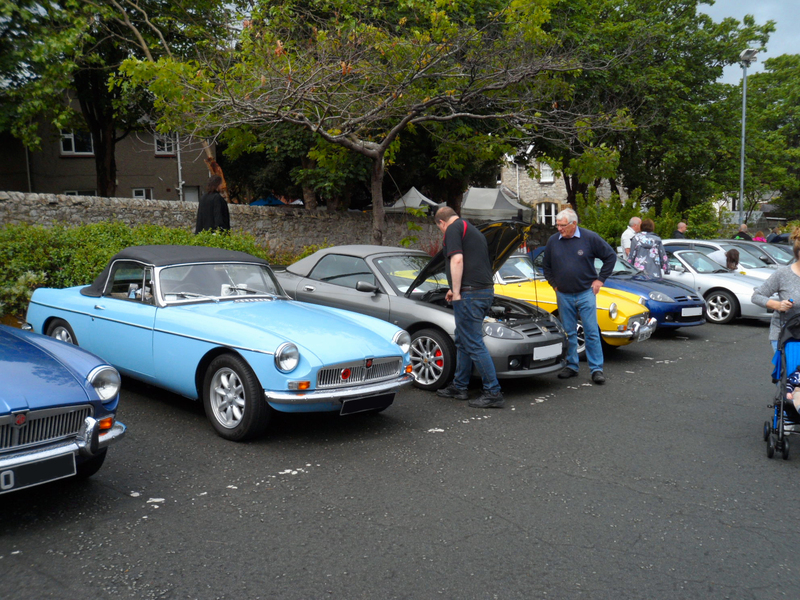 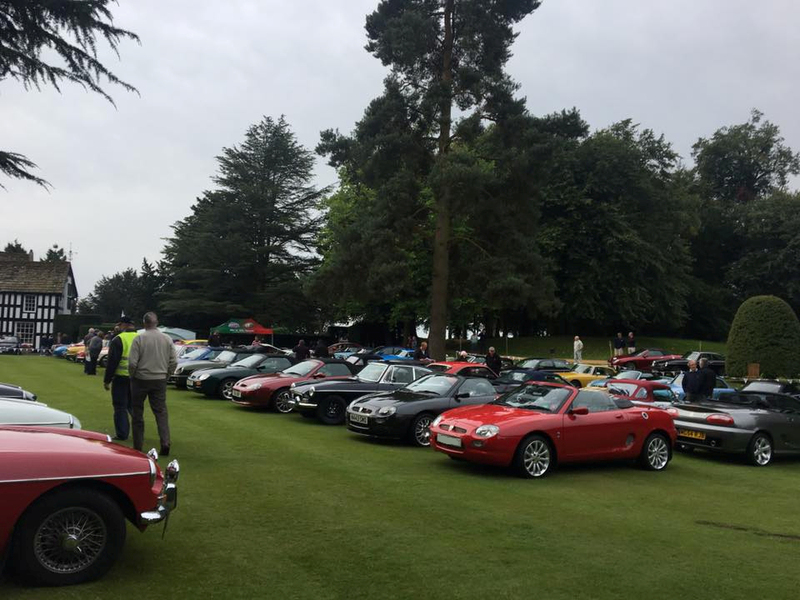 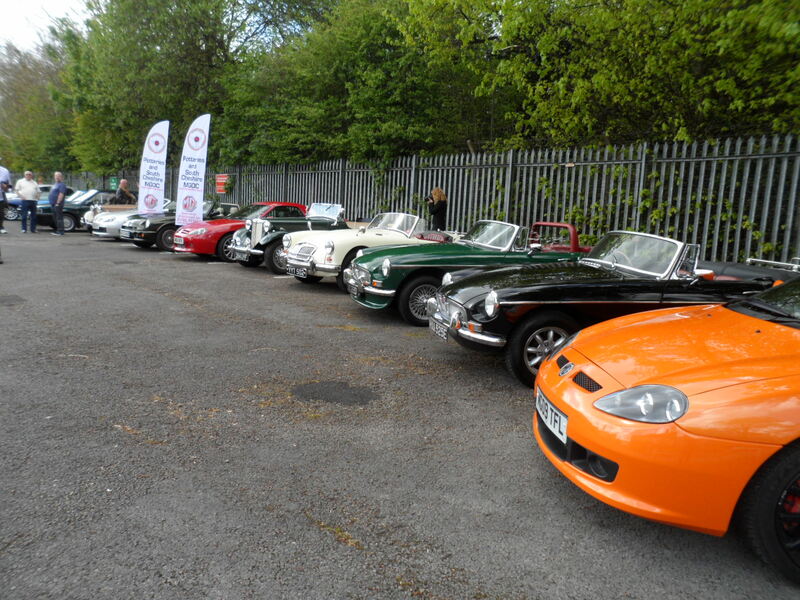 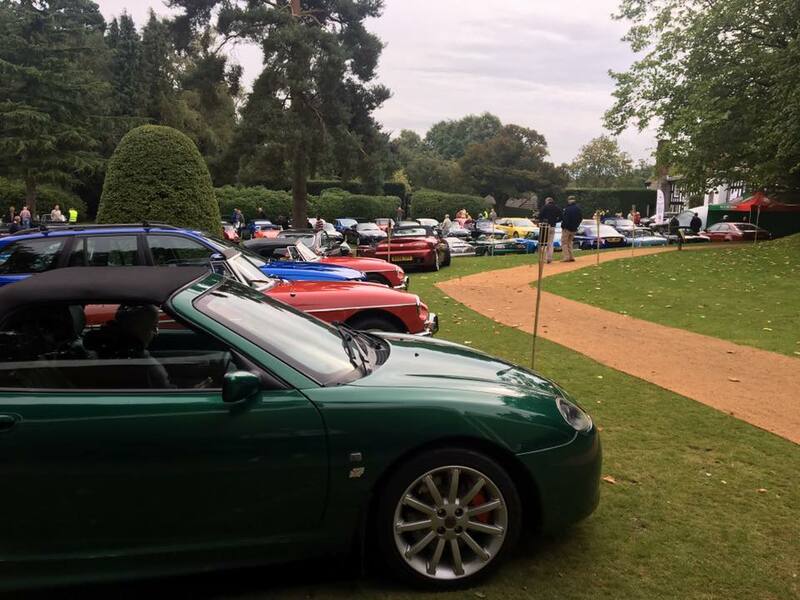 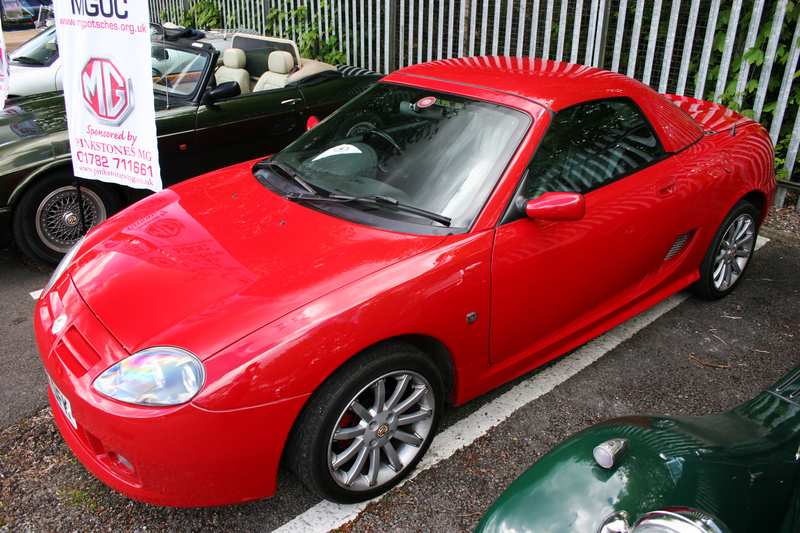 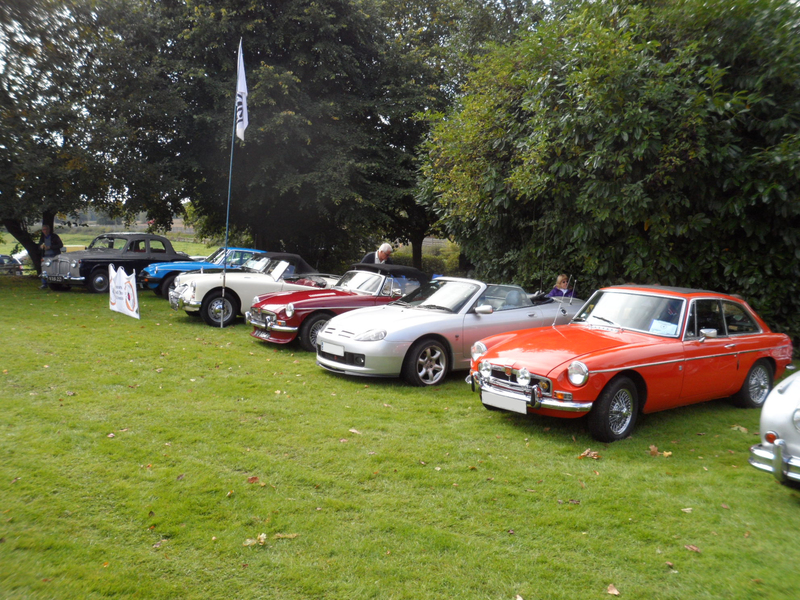 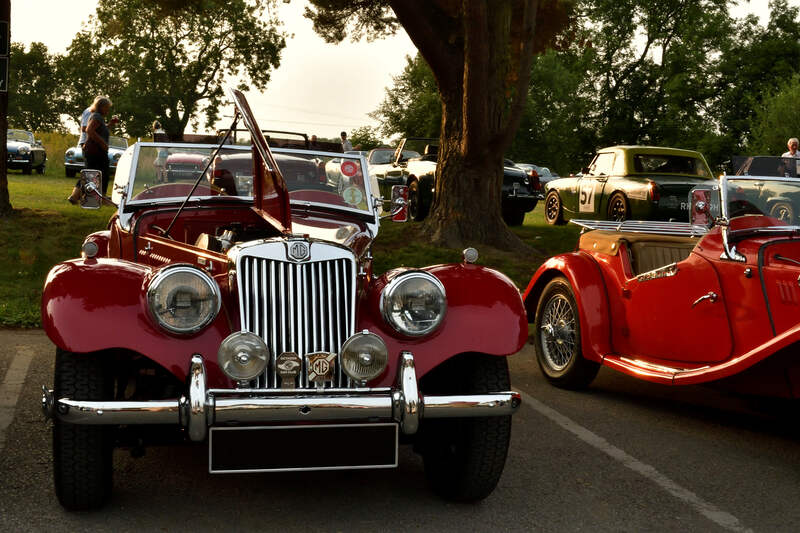 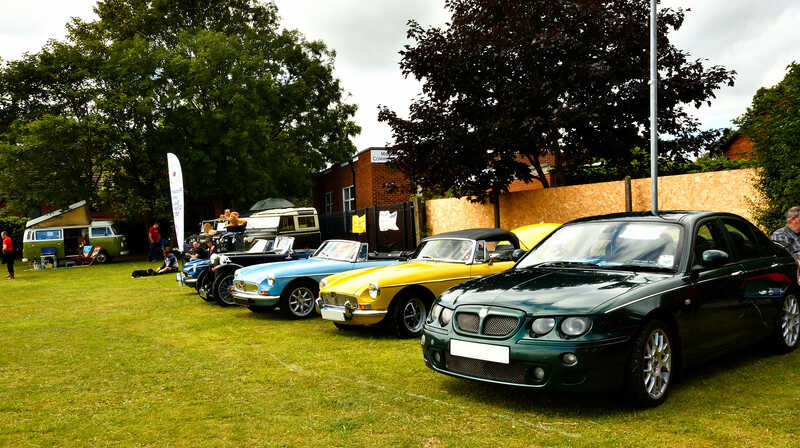 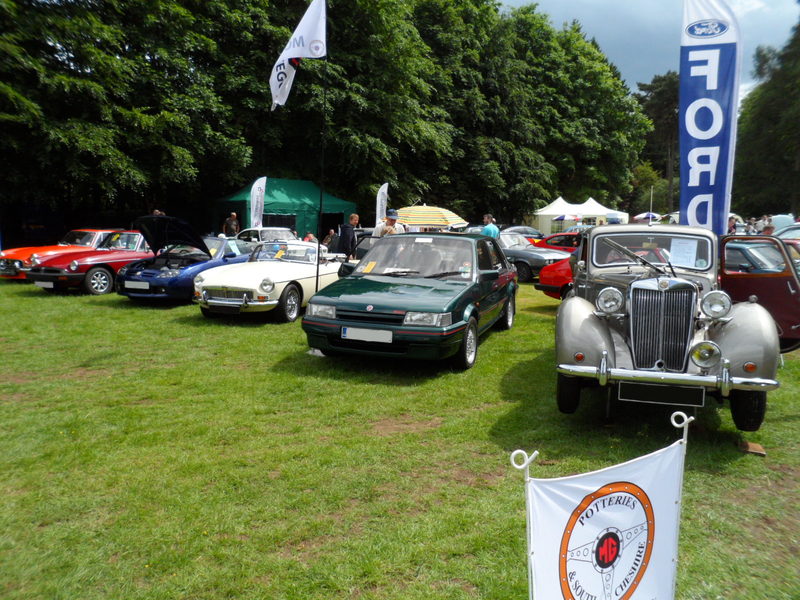 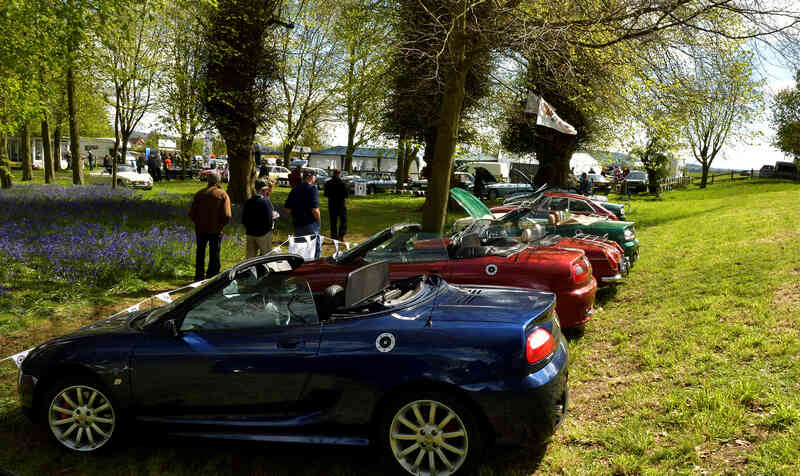 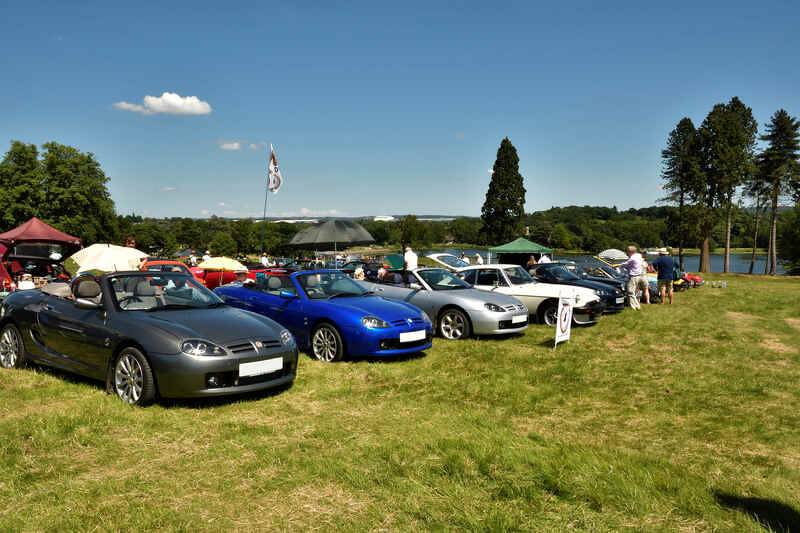 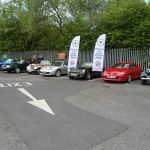 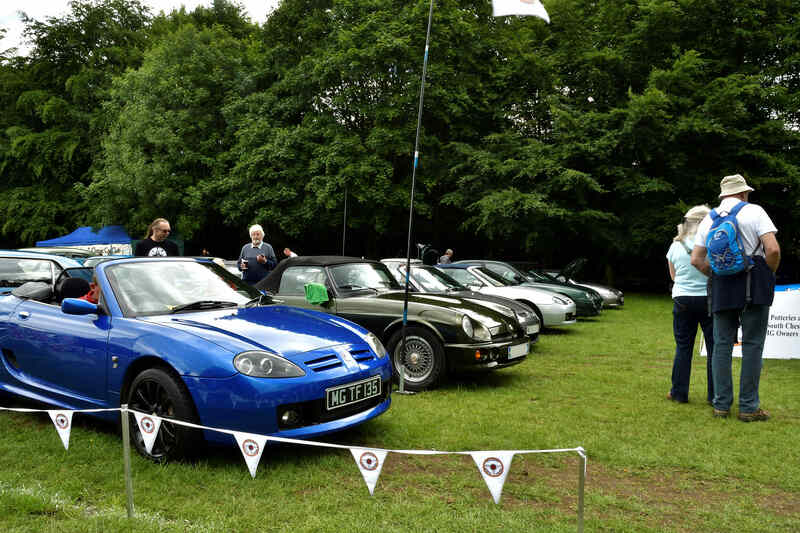 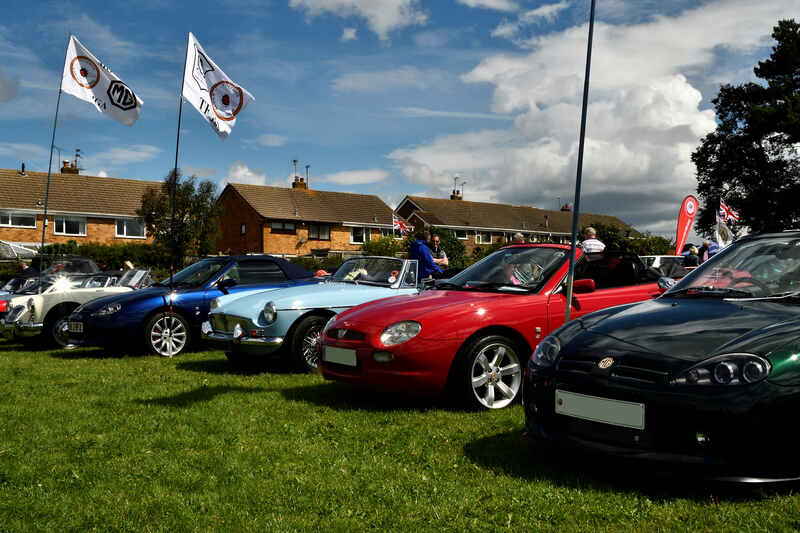 The club turned out in force with a wide display of MG`s from all periods. 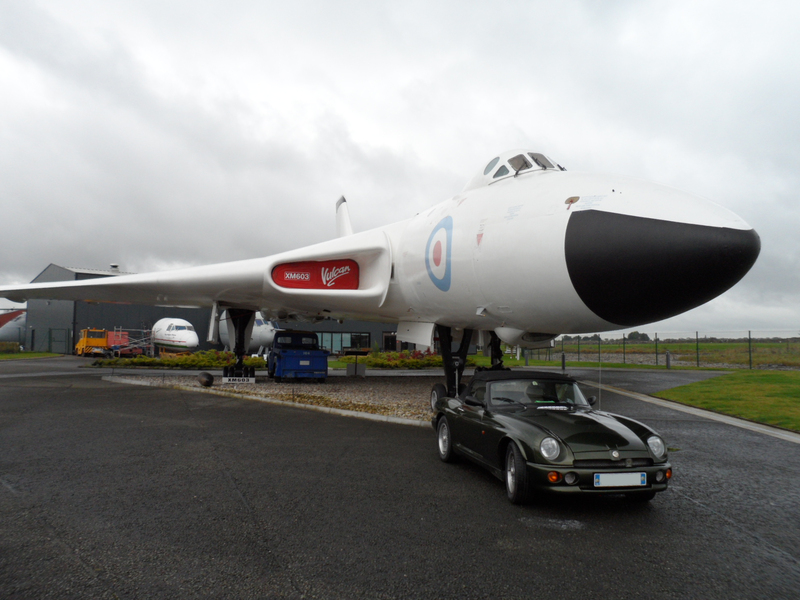 I was a good day with lots to see and do. 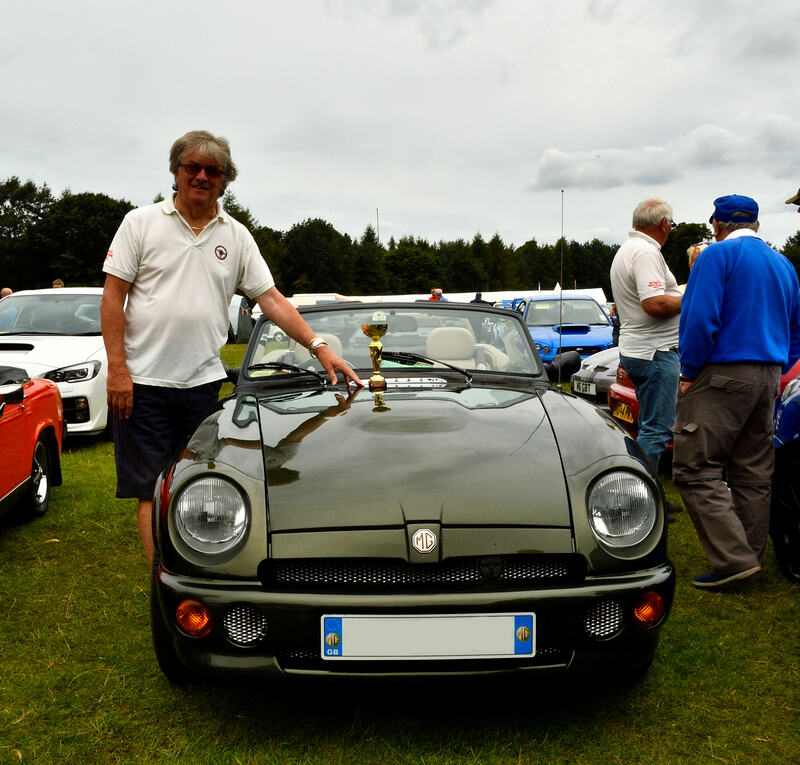 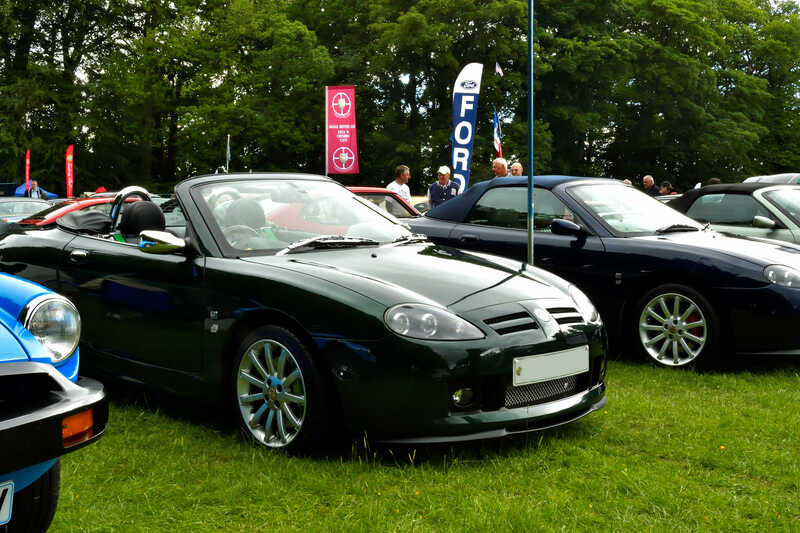 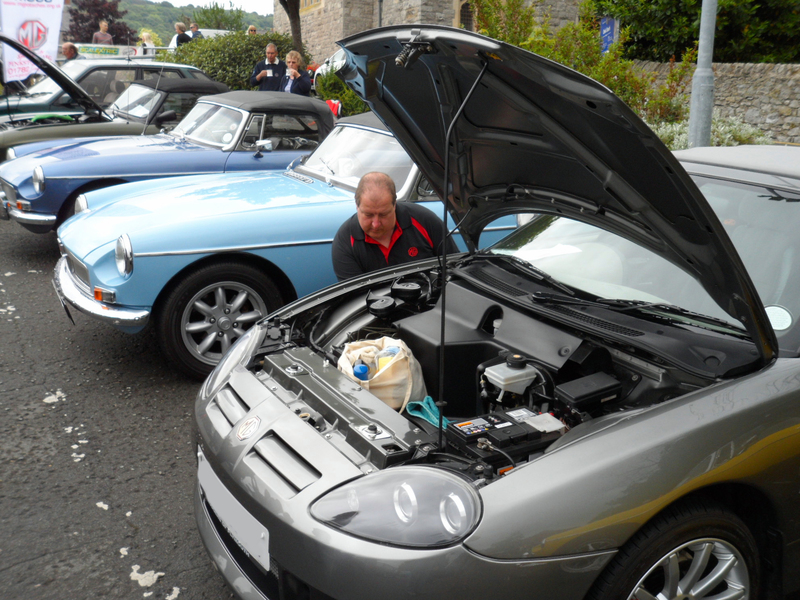 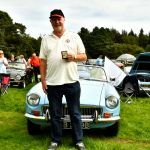 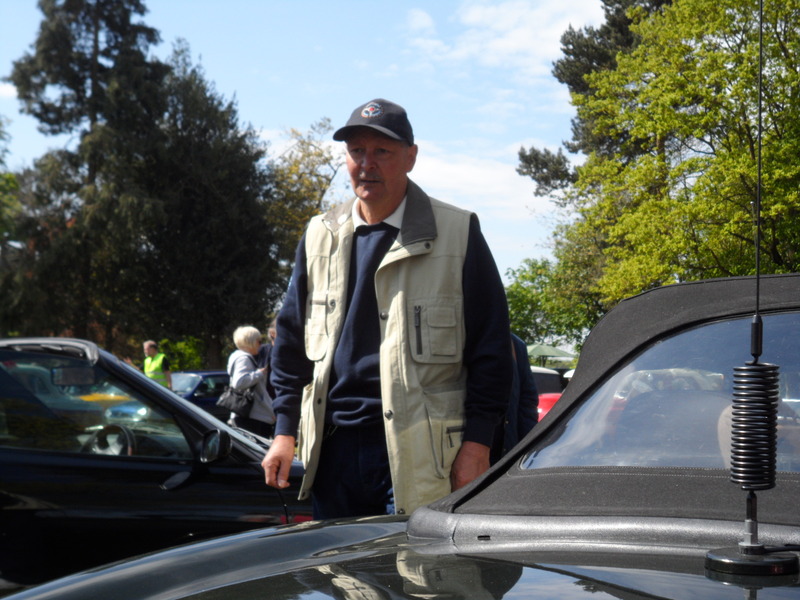 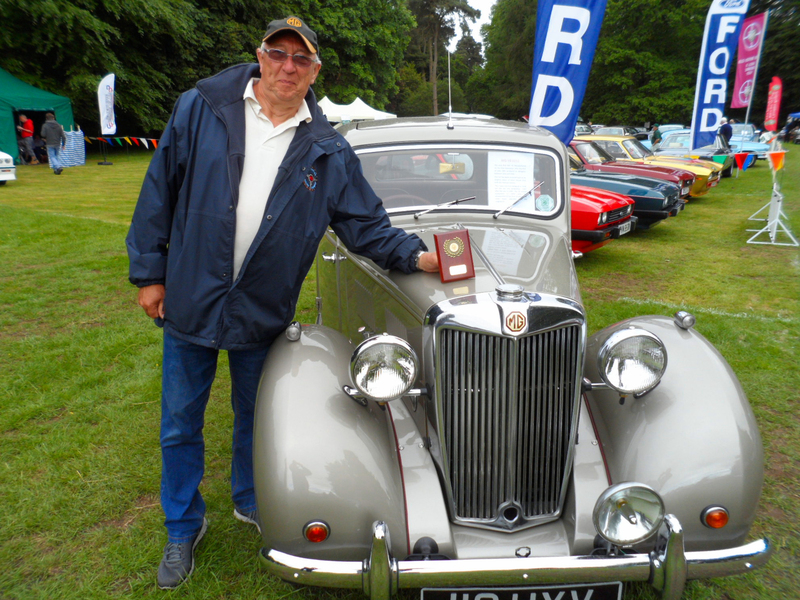 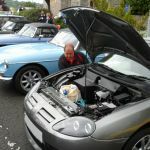 Club member Stephen Dent won runner up in the Sports & Convertible Class with his Iris blue MGB – Well done !! 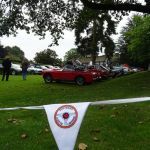 On the Bank Holiday Monday we went to the Woodsmoor Classic Car Show, this was a new venue for the club, the show is a charity event in support of Tommy`s and St Ann`s Hospice. 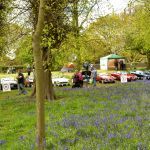 It was a fantastic day, very well organised and friendly with a superb range of cars on display, in addition there was also a nice craft fair and fresh handmade pizza if you were peckish (they were very busy !). 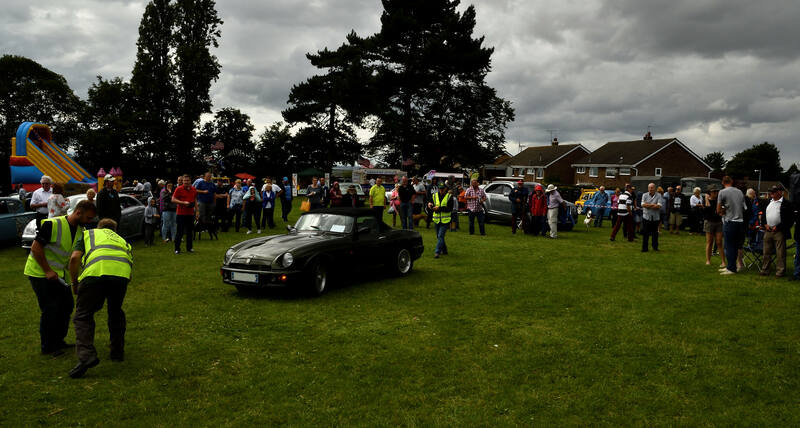 The crowds certainly turned out for the event and amazingly it stayed dry !!. 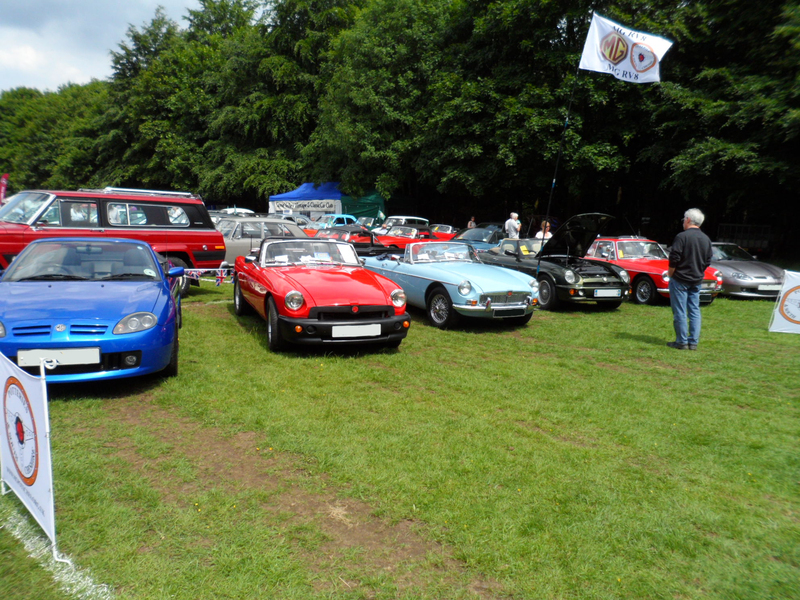 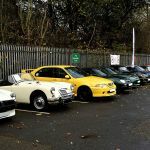 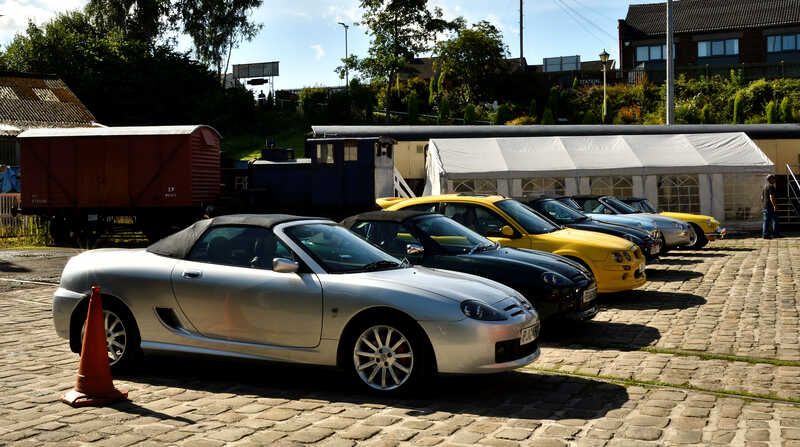 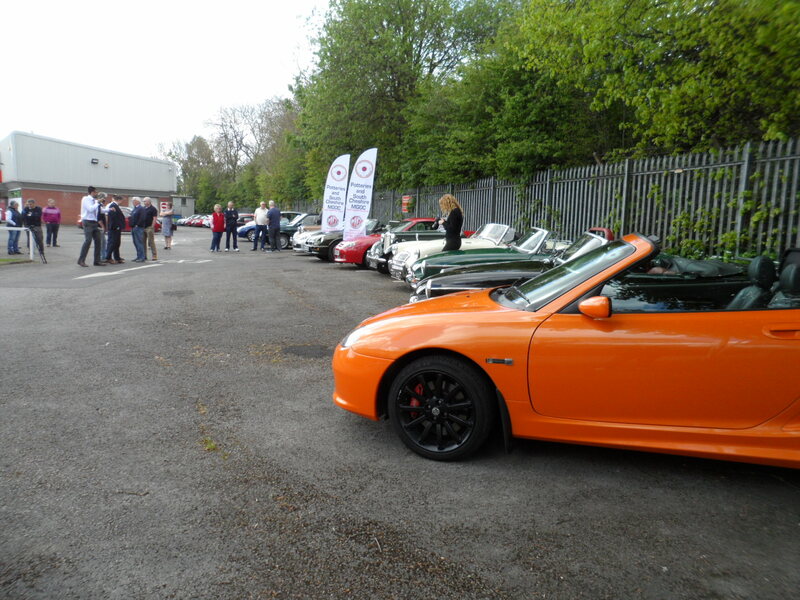 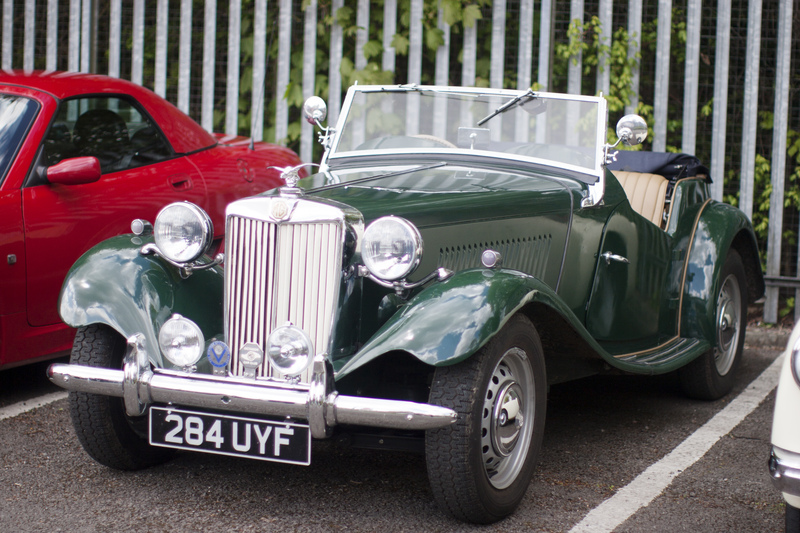 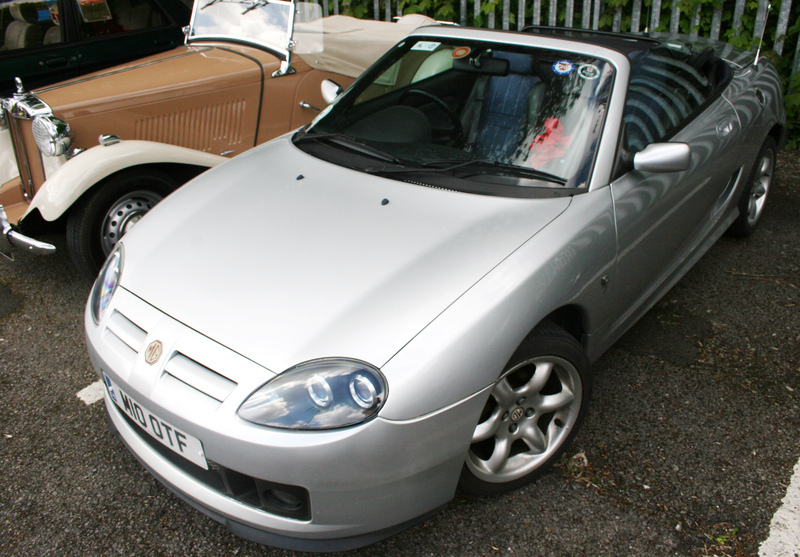 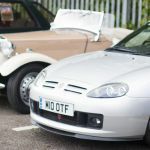 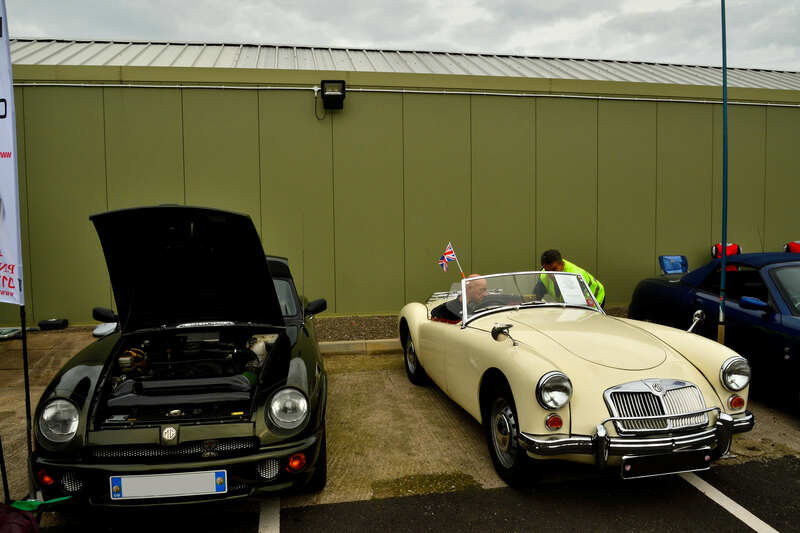 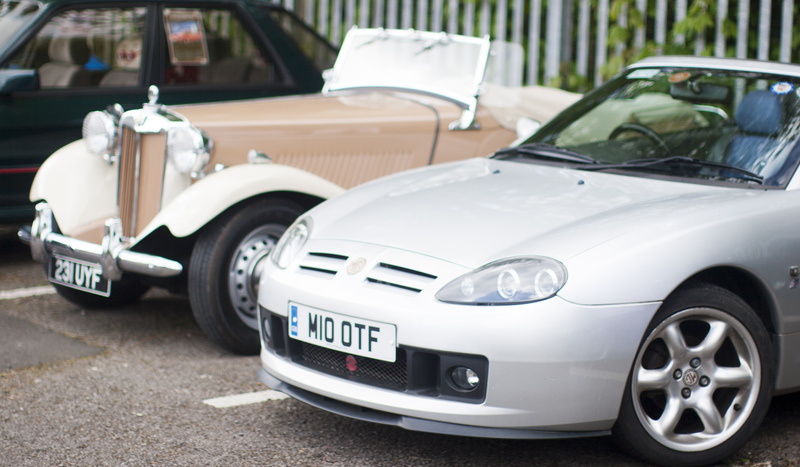 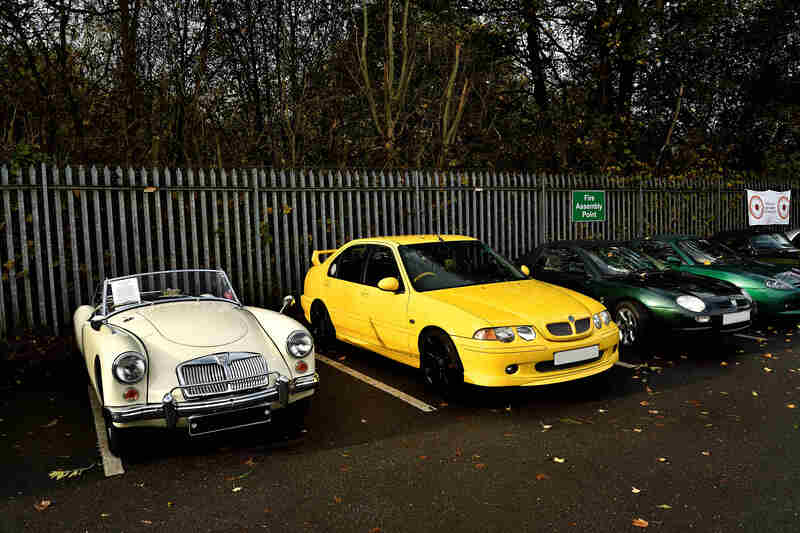 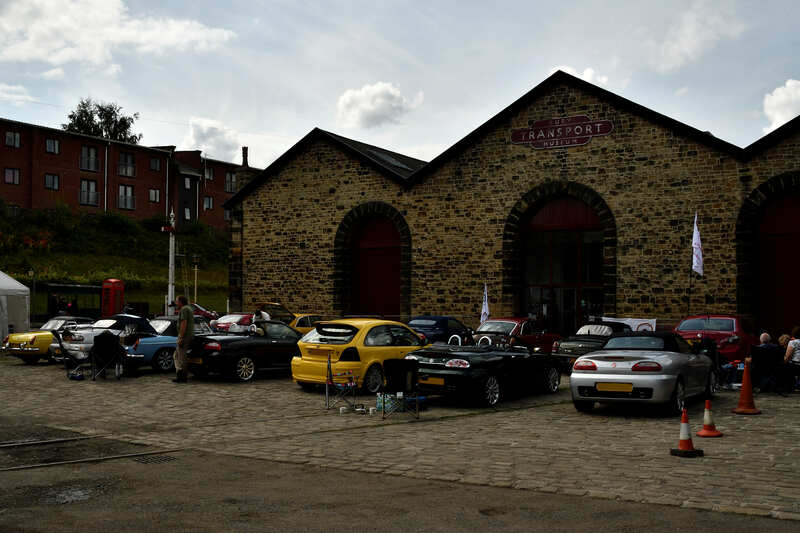 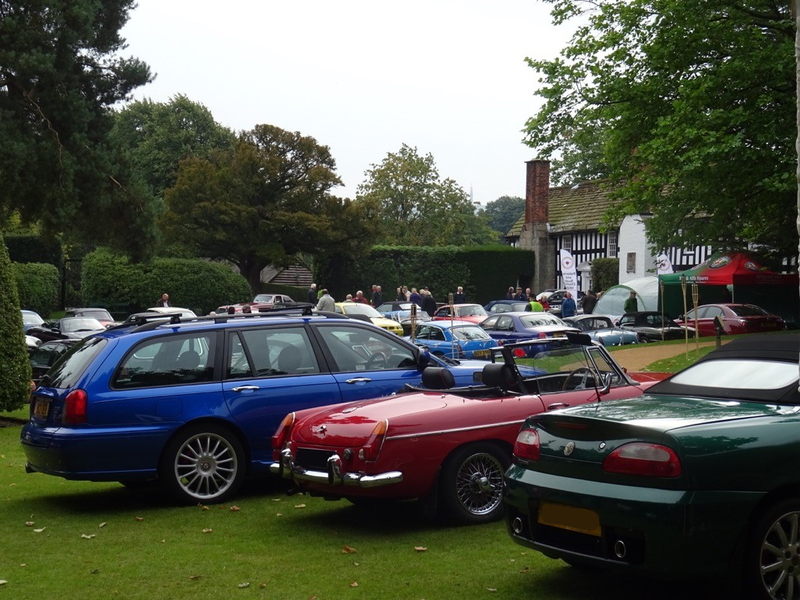 We had a good turnout of cars spanning the MG history and a great day was had by all. 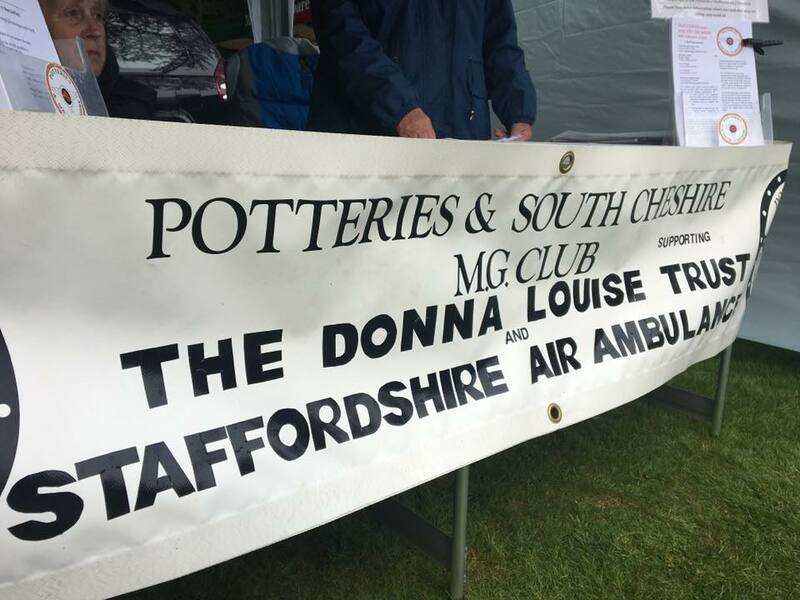 Thanks also to Katie from the Air Ambulance, Nigel from the Staffordshire Blood Bikers, Jason with MG & Alfa spares and to the members of this club that worked very hard today in helping and making it happen, and to those that supported the run. 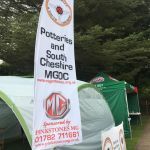 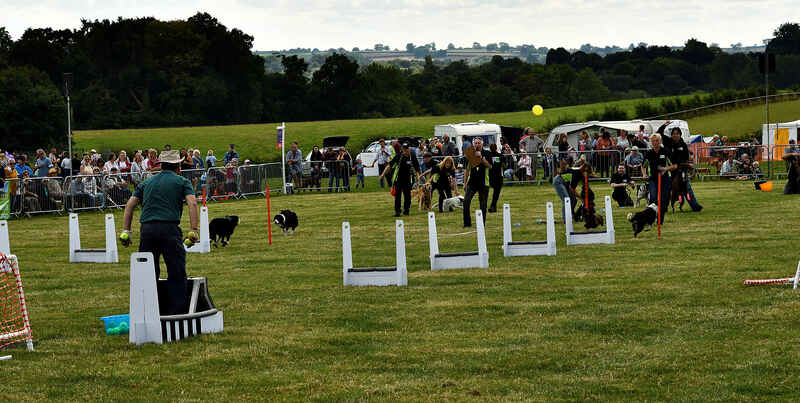 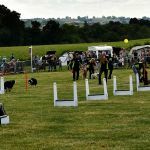 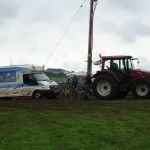 Bit of a let down this year with the weather, which is normally great for this show, its was a tad cold and soggy underfoot but still a great show and the club made the best of the day, plus as always there was a lot to see and do with some great country food to sample. 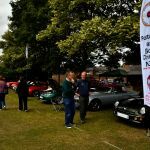 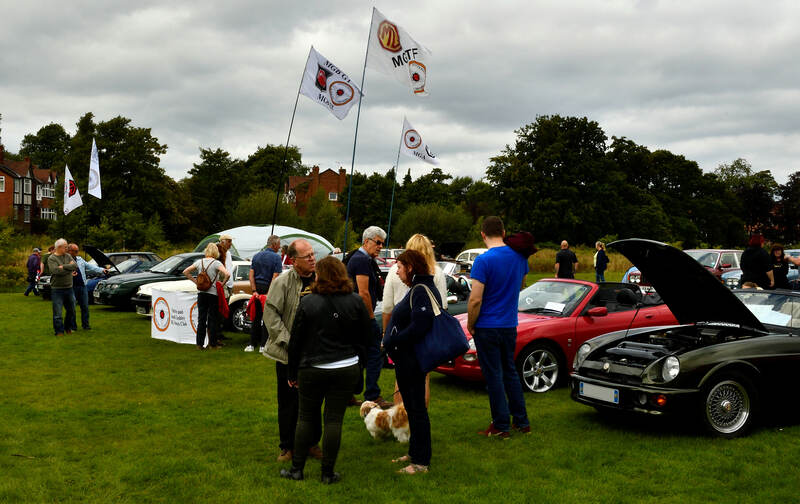 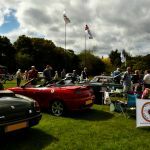 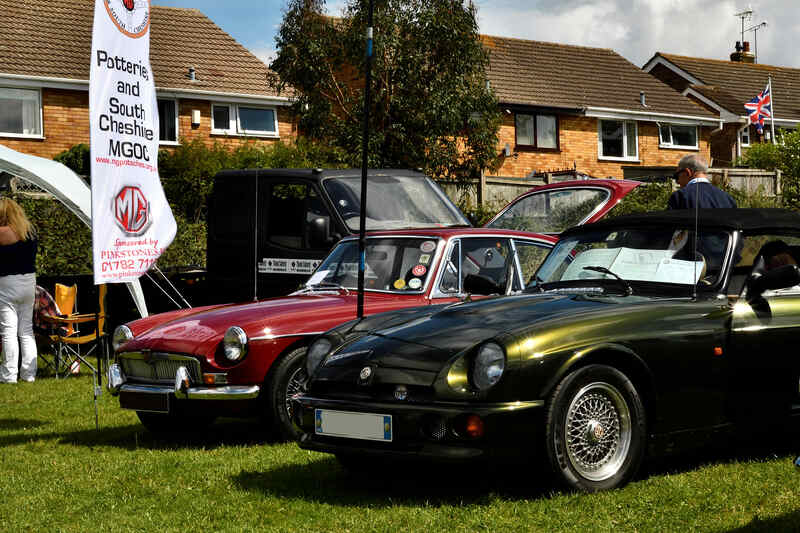 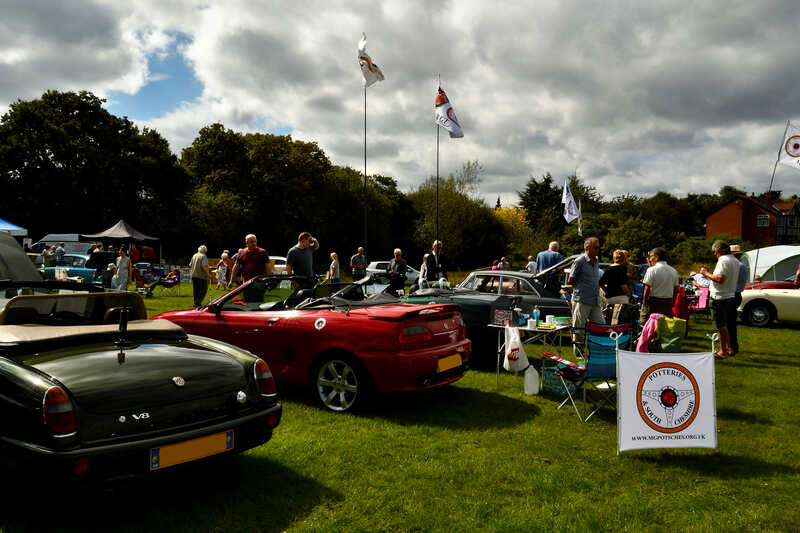 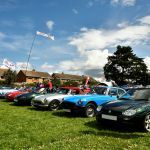 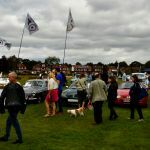 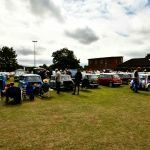 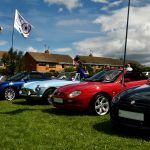 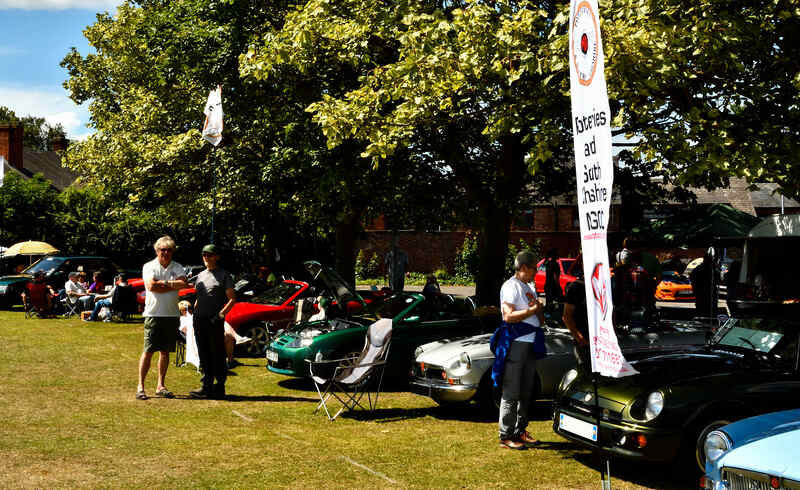 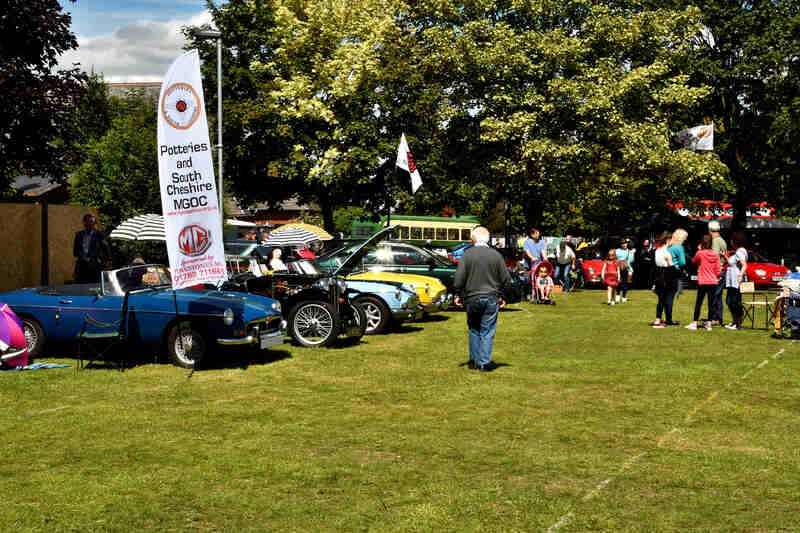 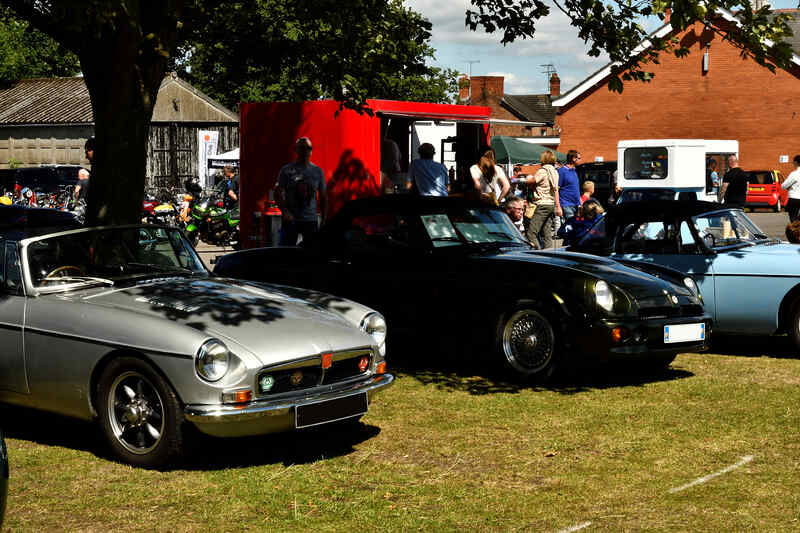 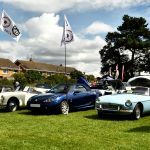 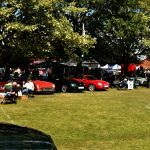 On Sunday 17th September the club attended the Great at Mill Reece car show , weather was fine and a great day was had by all at a superb little show. 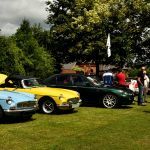 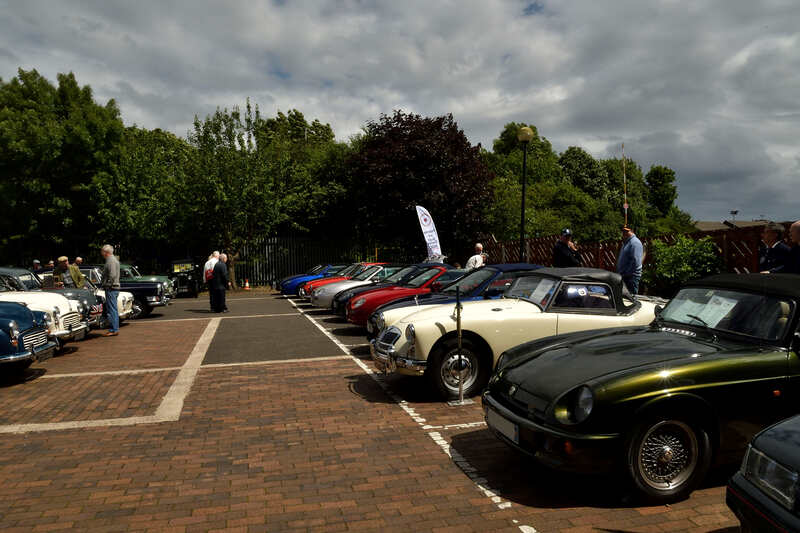 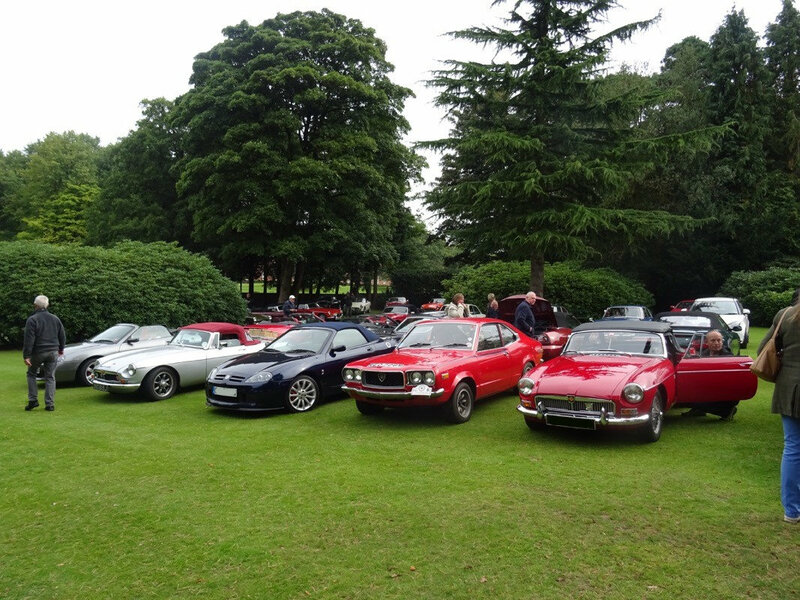 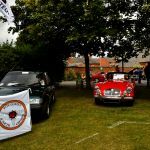 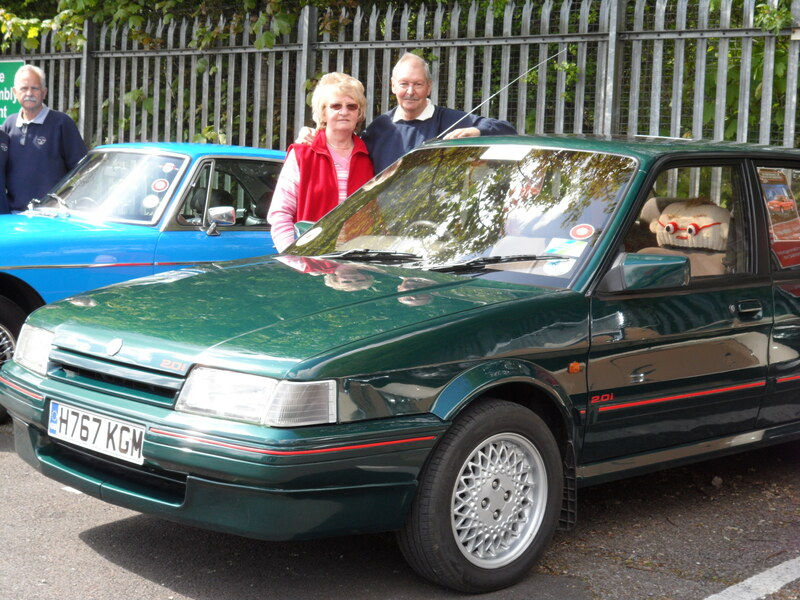 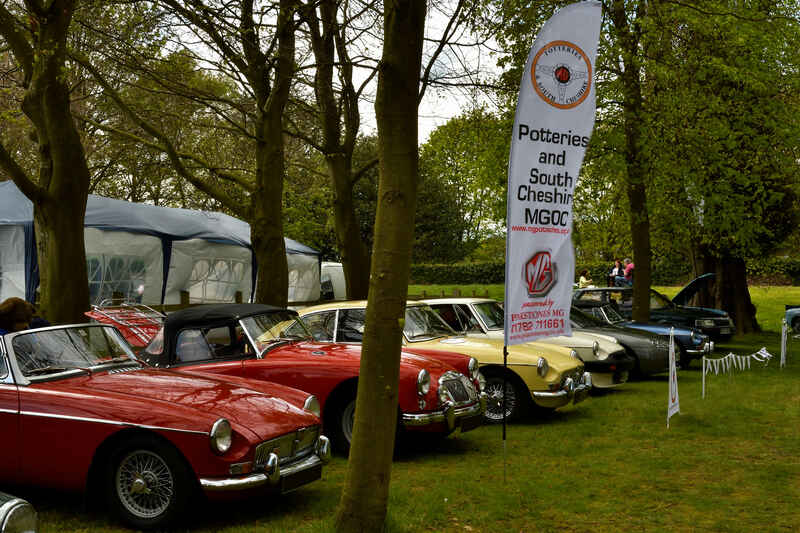 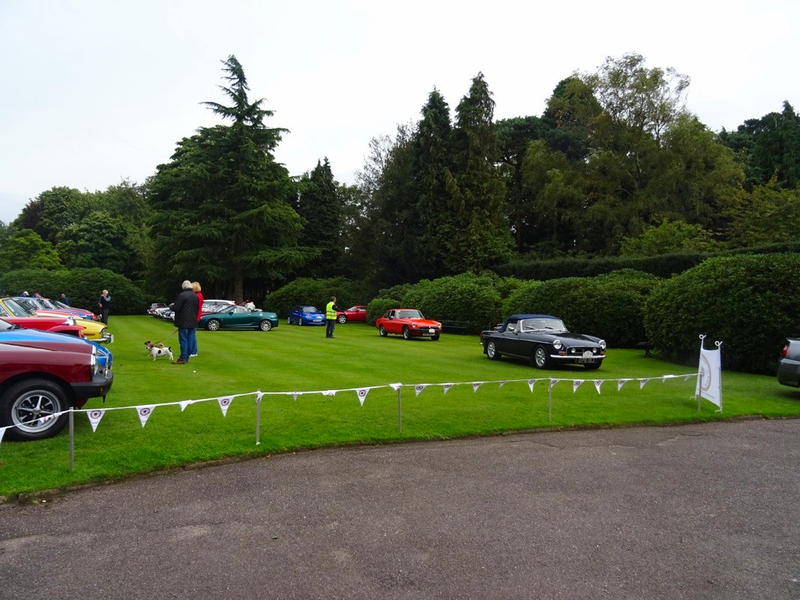 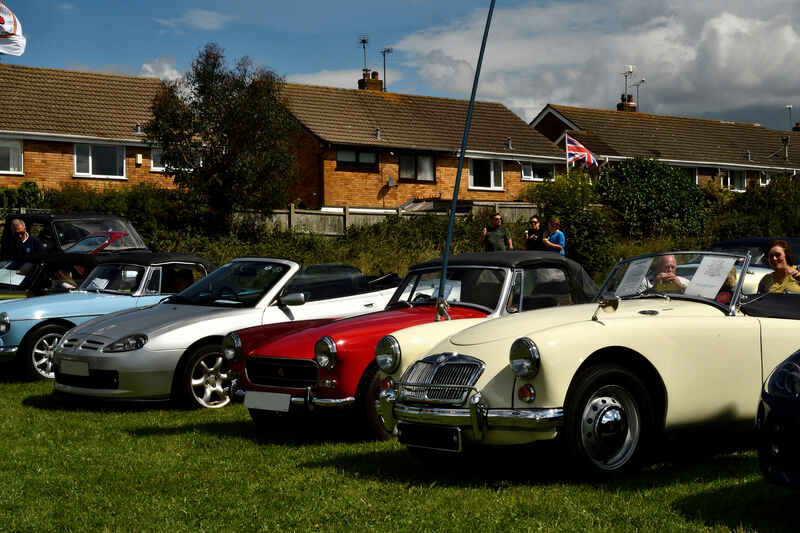 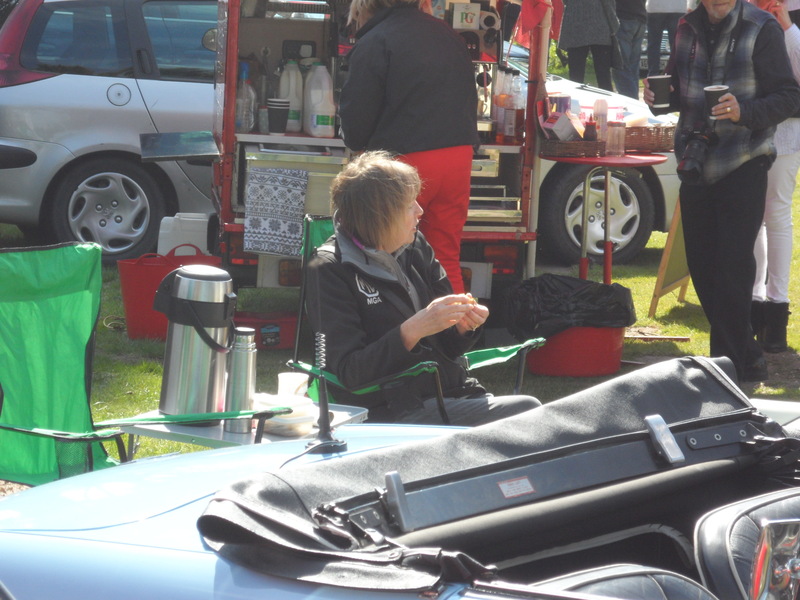 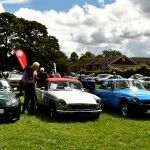 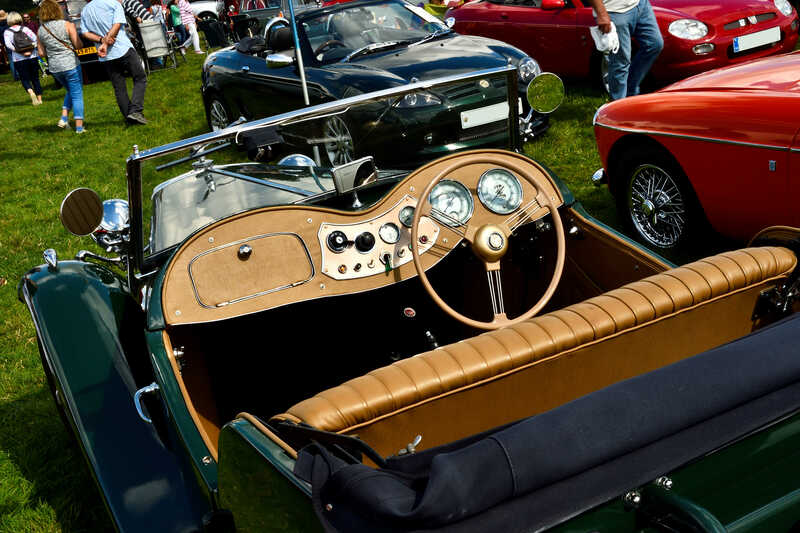 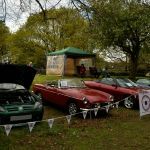 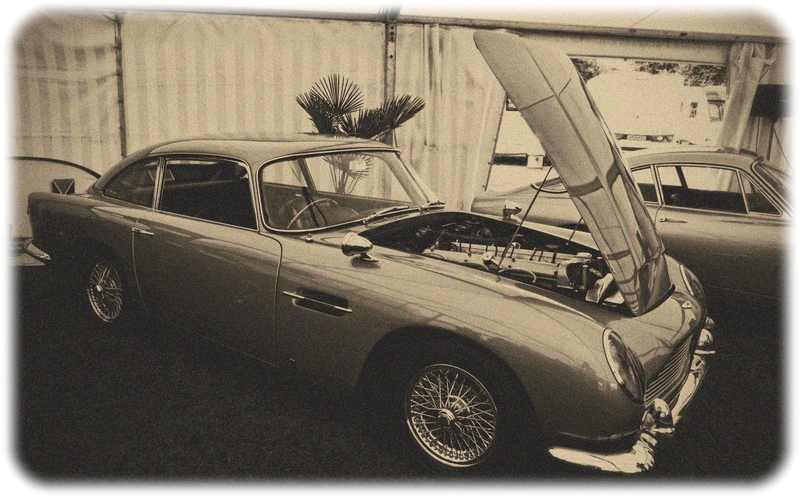 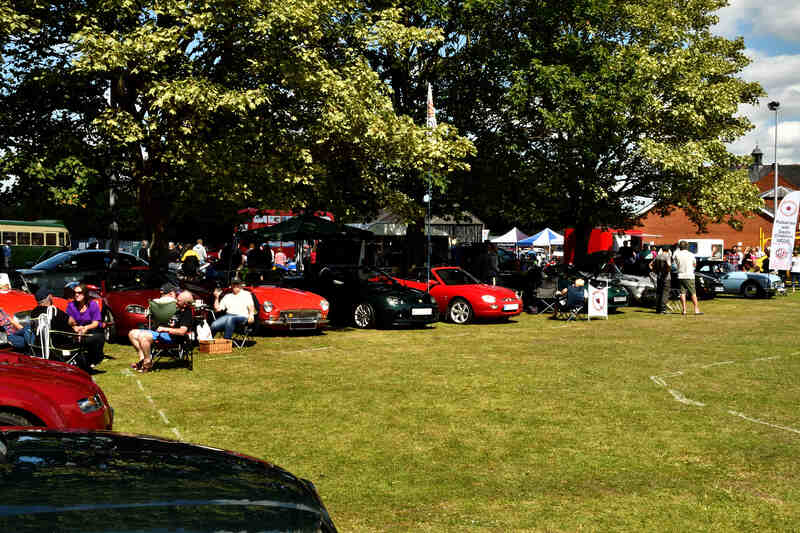 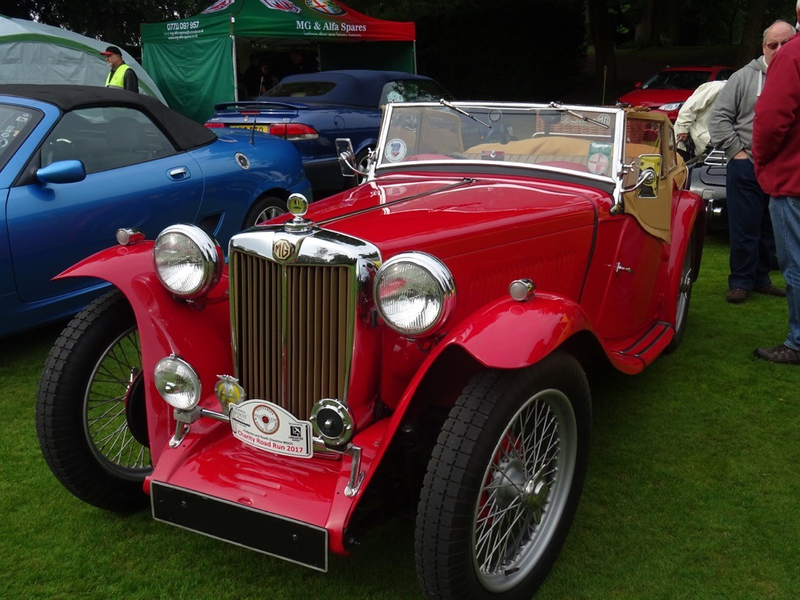 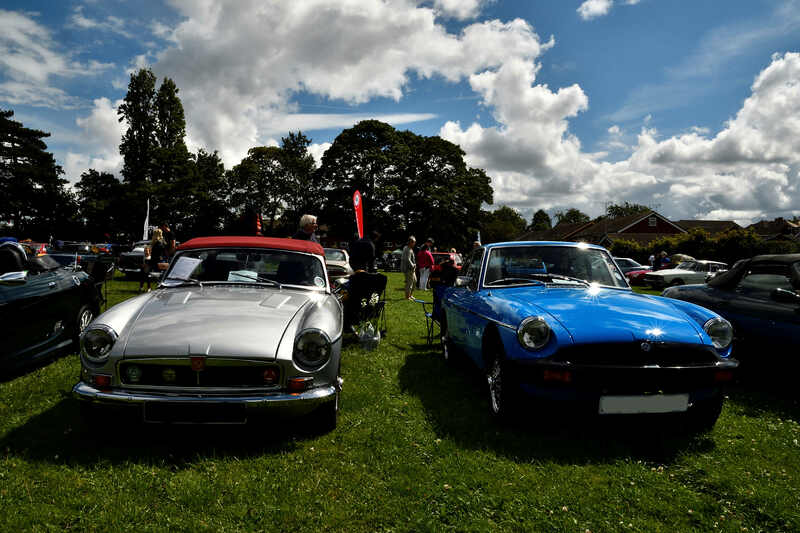 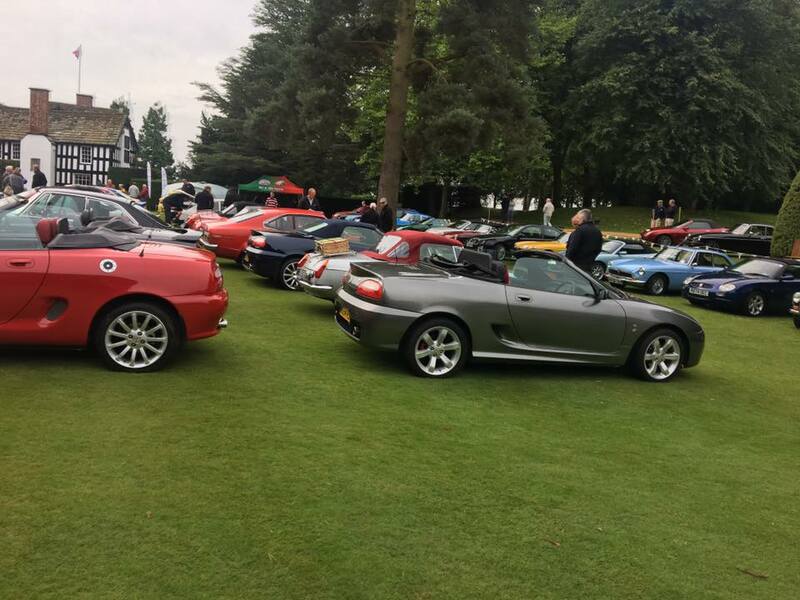 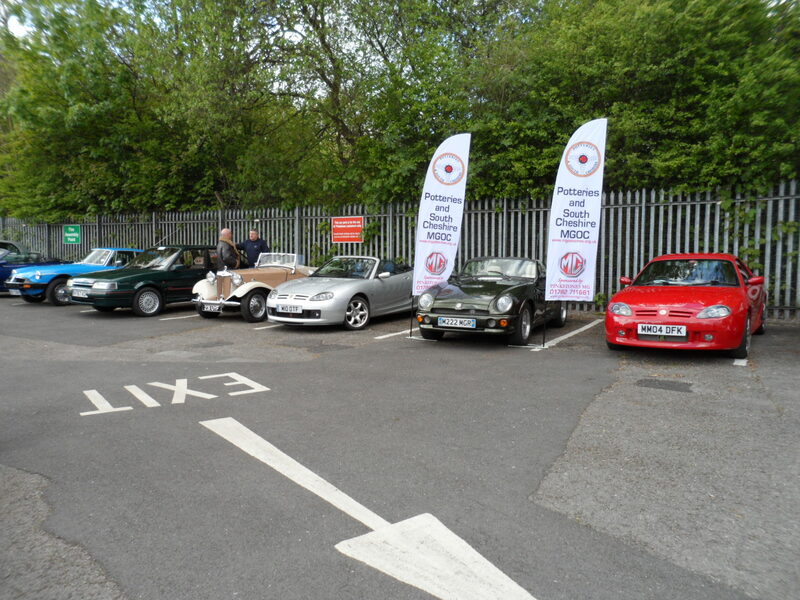 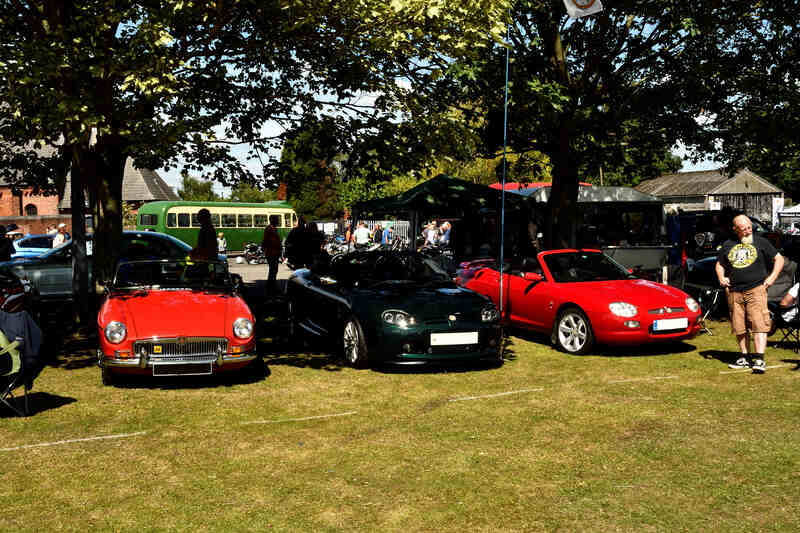 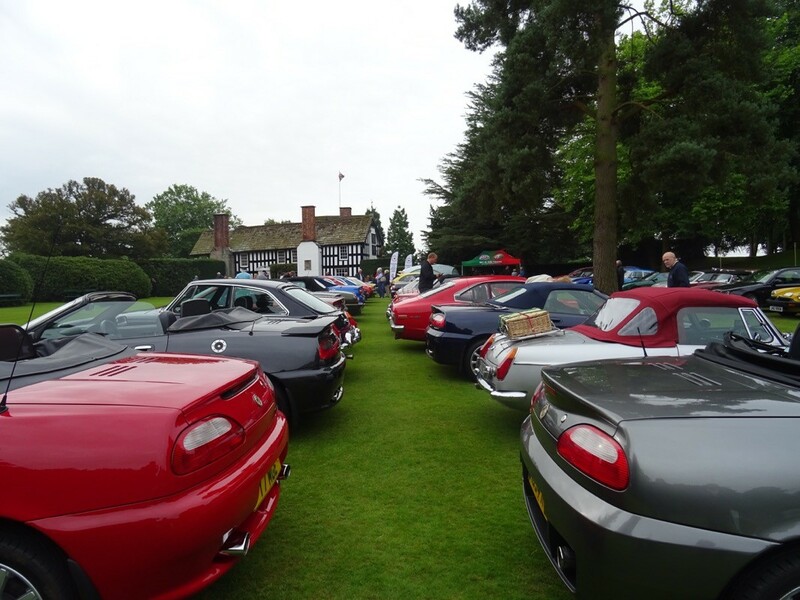 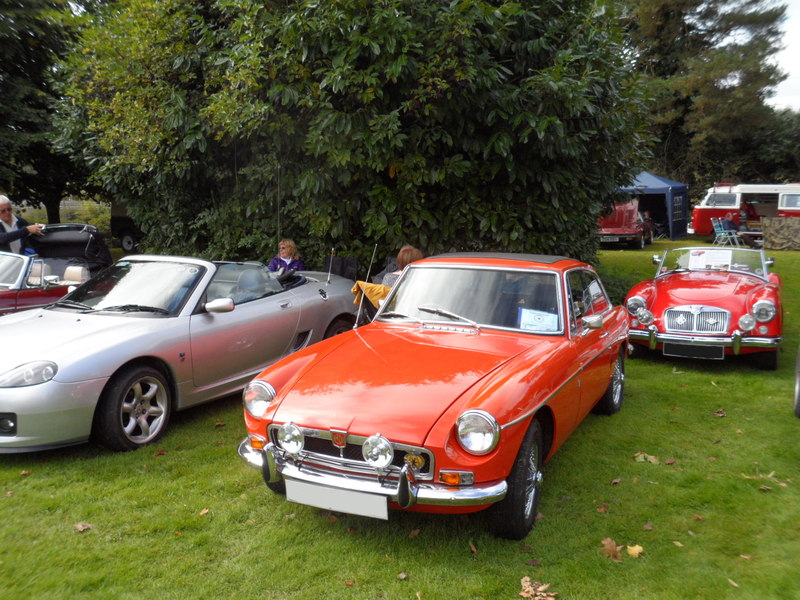 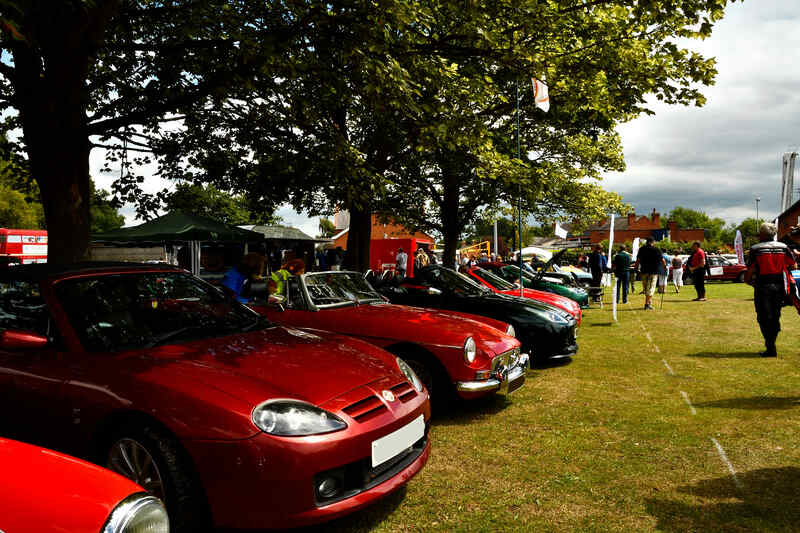 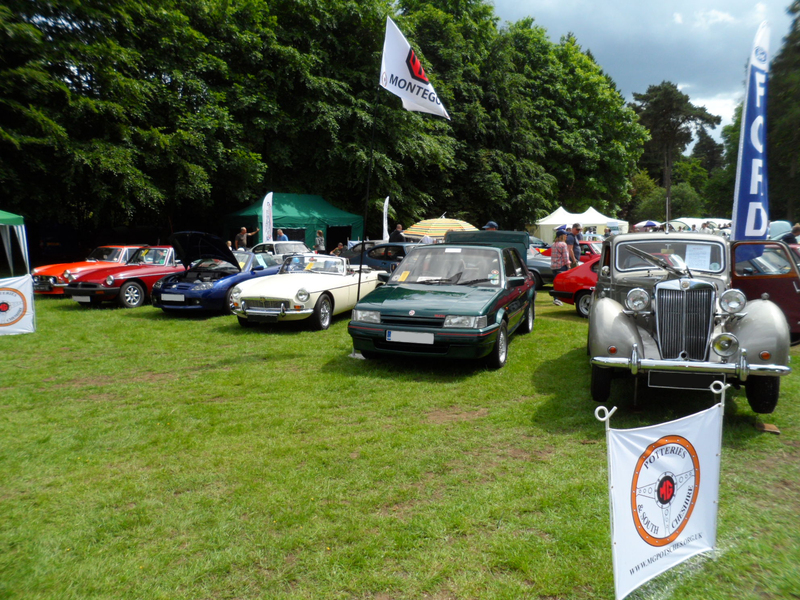 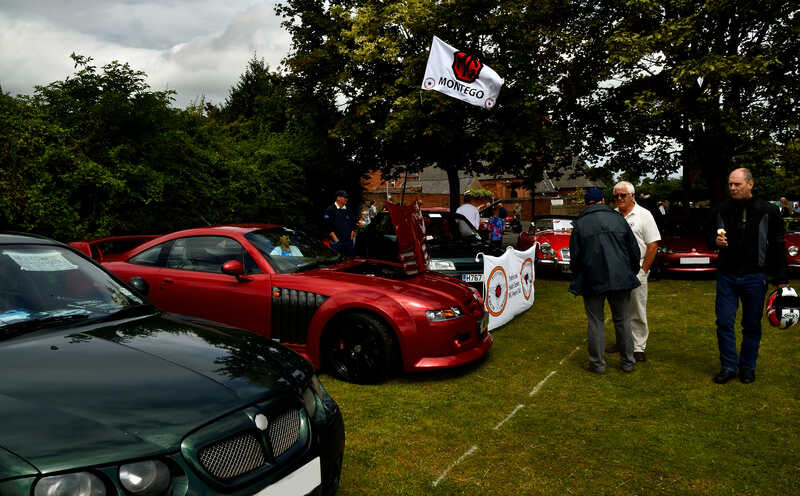 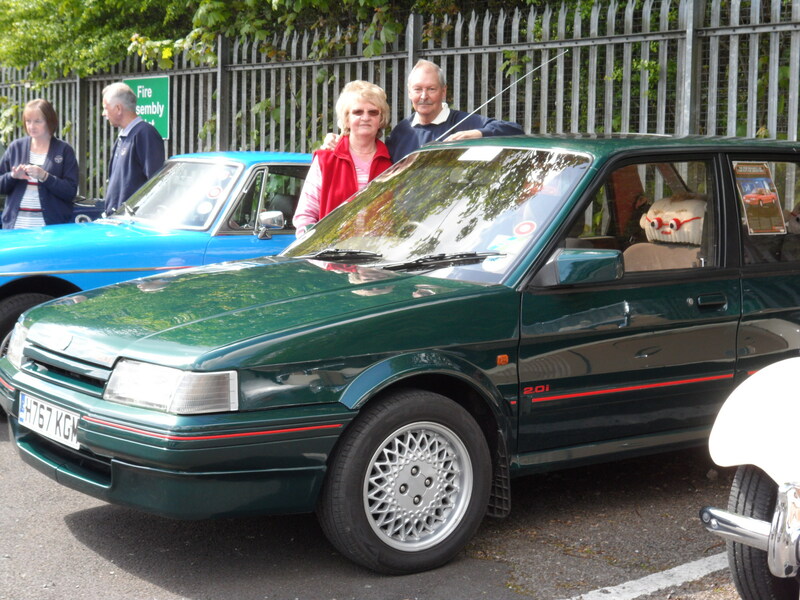 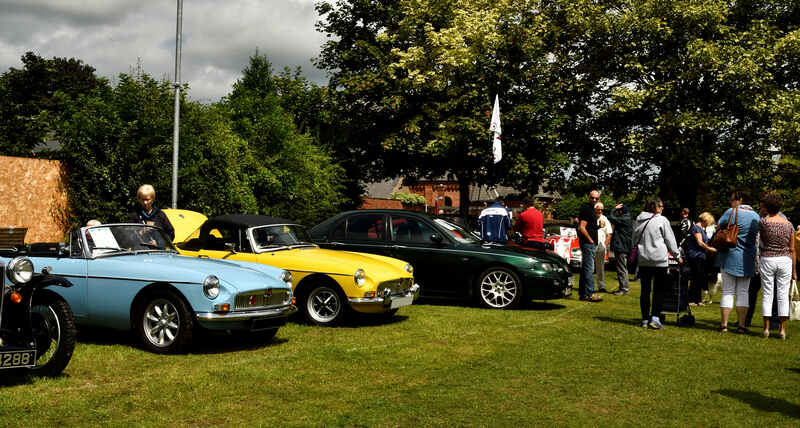 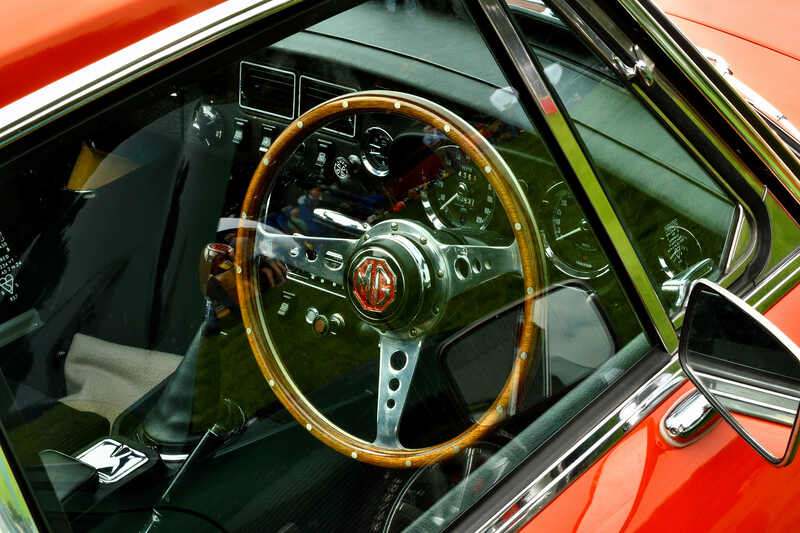 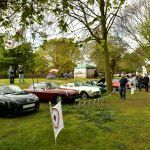 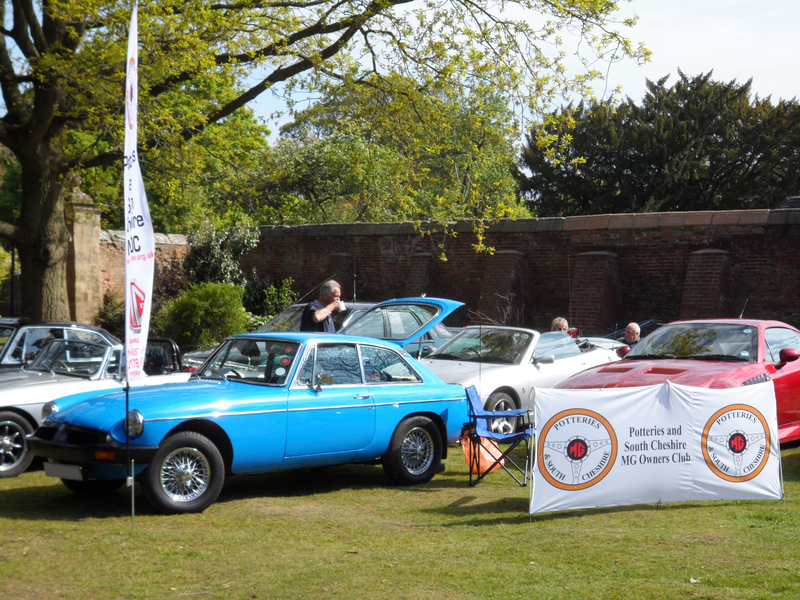 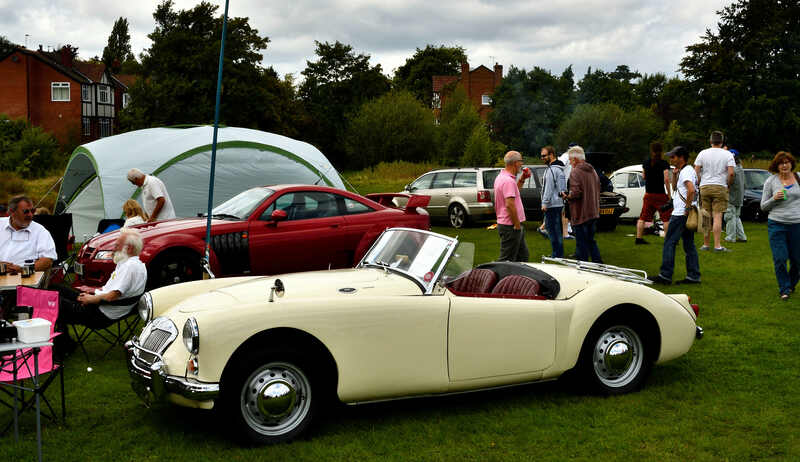 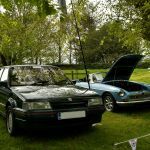 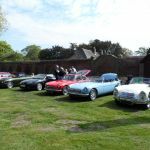 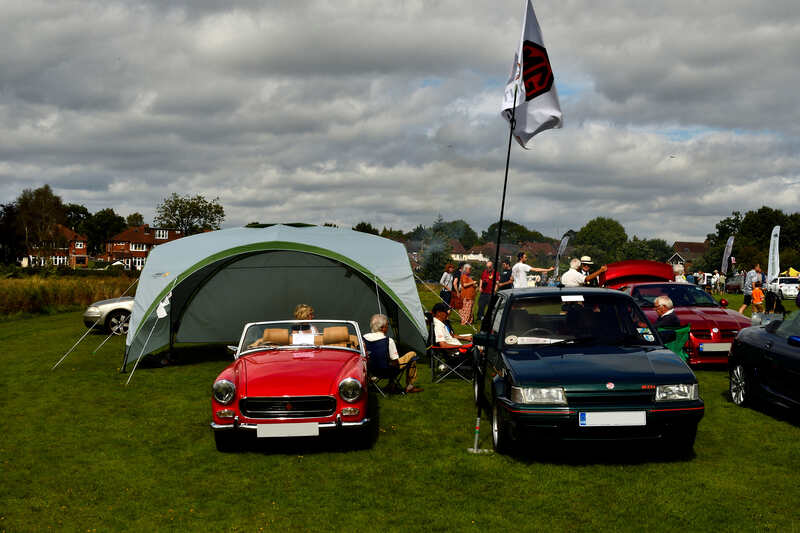 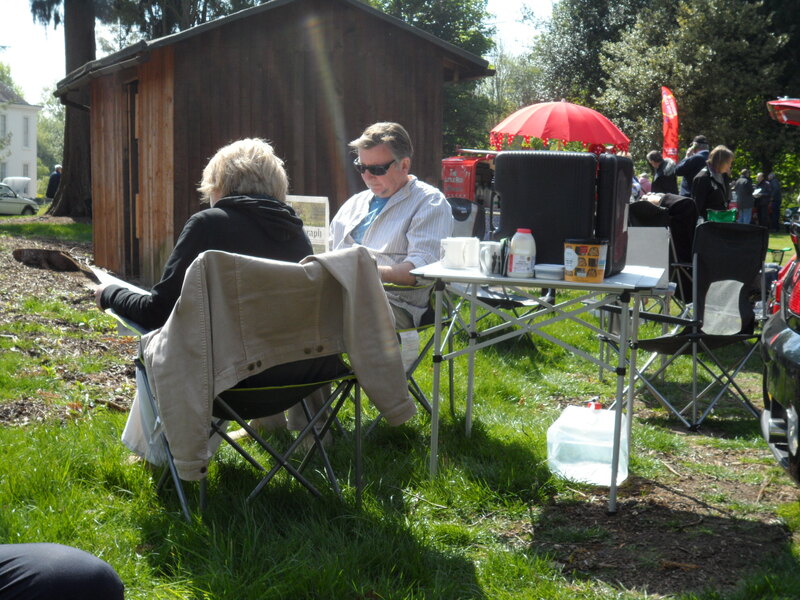 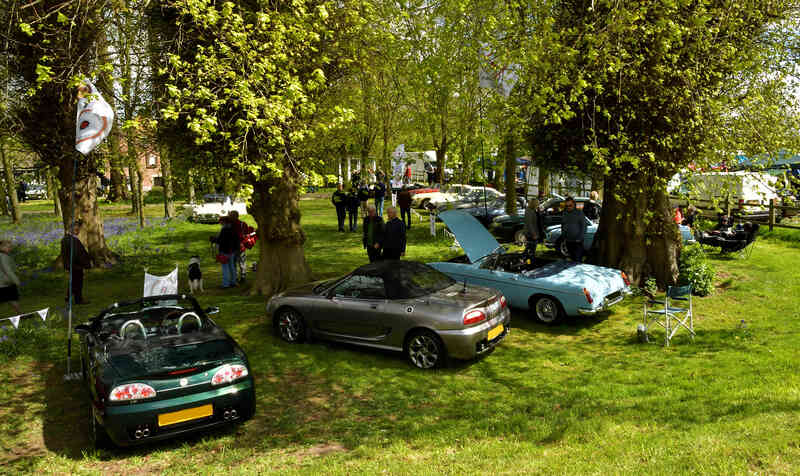 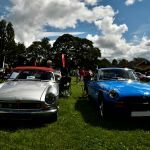 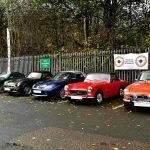 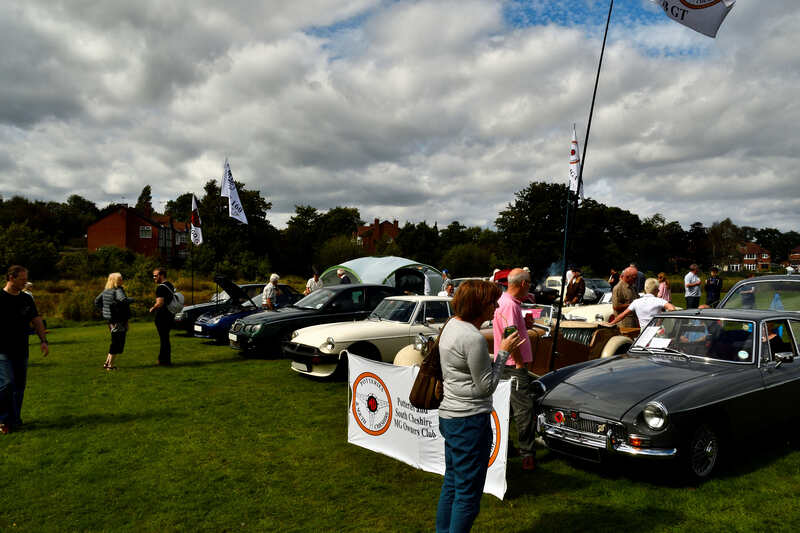 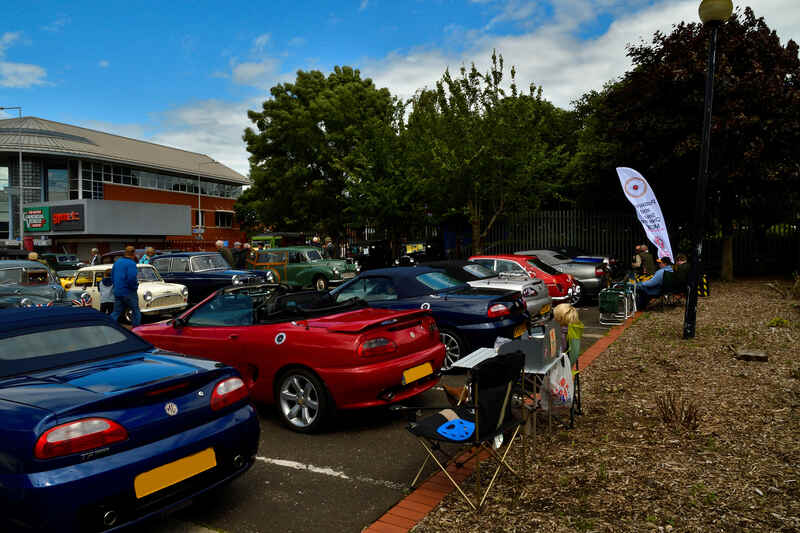 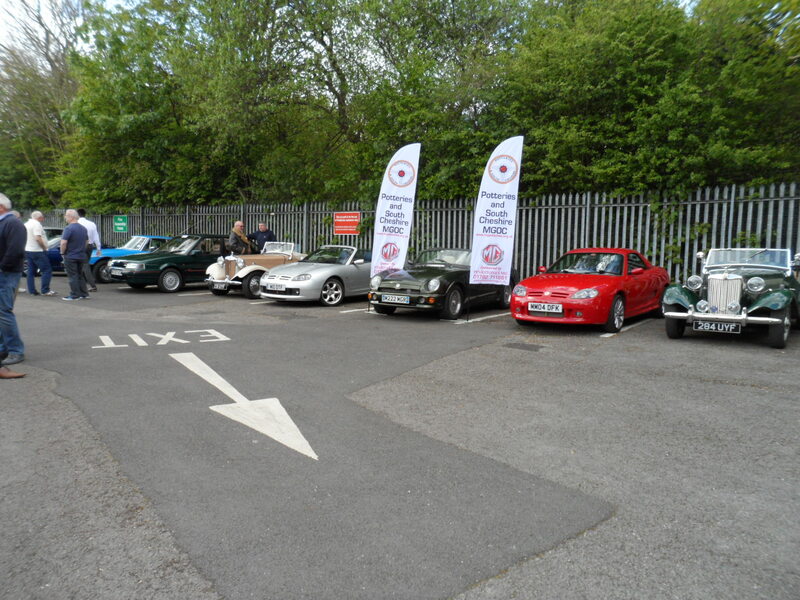 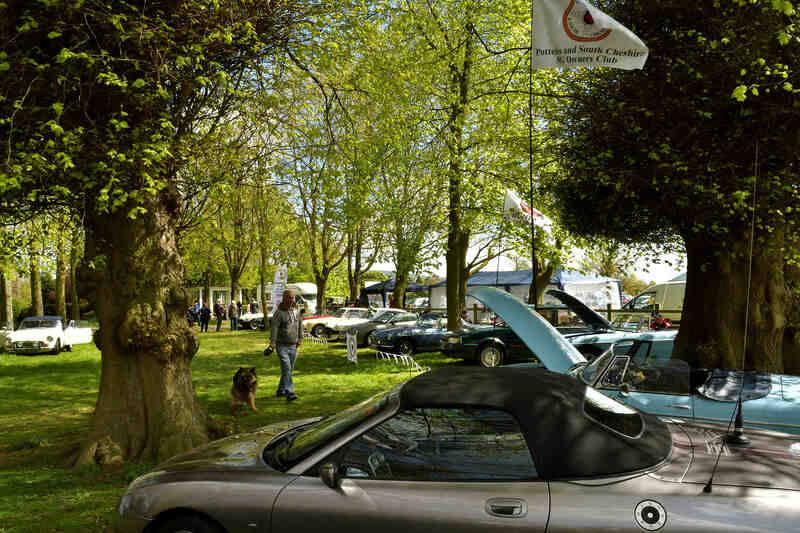 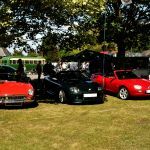 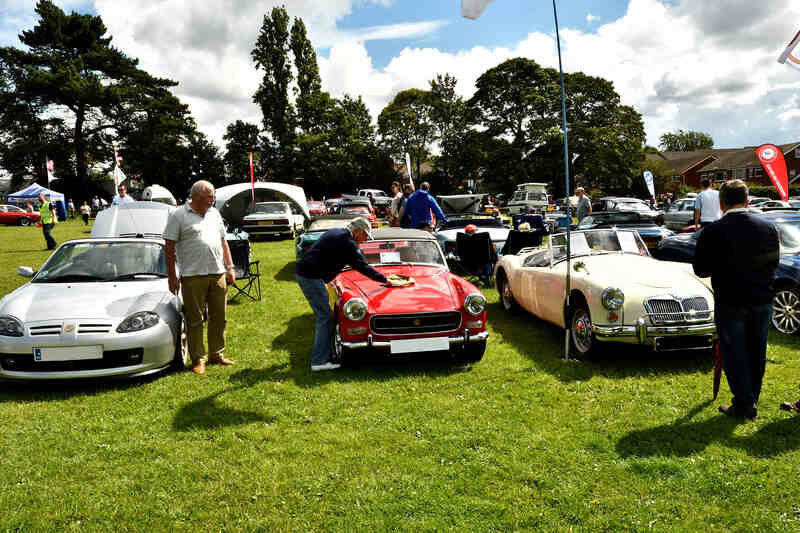 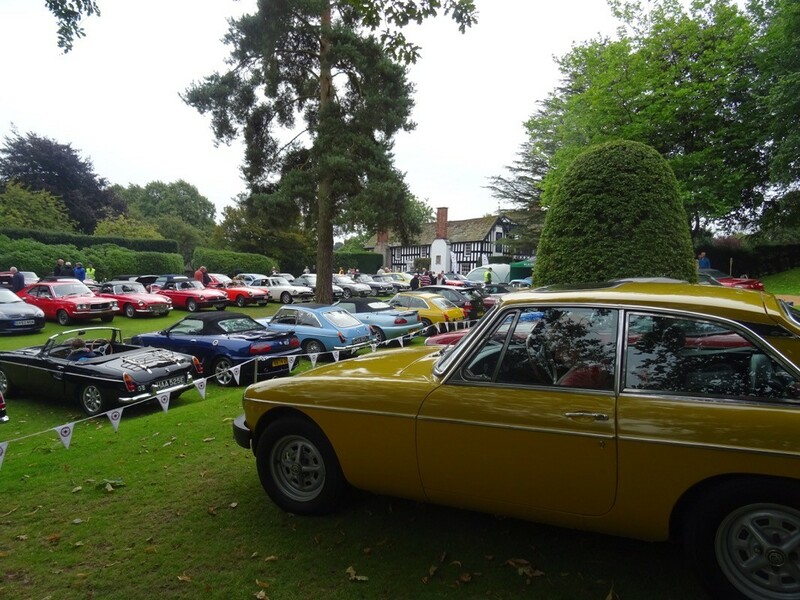 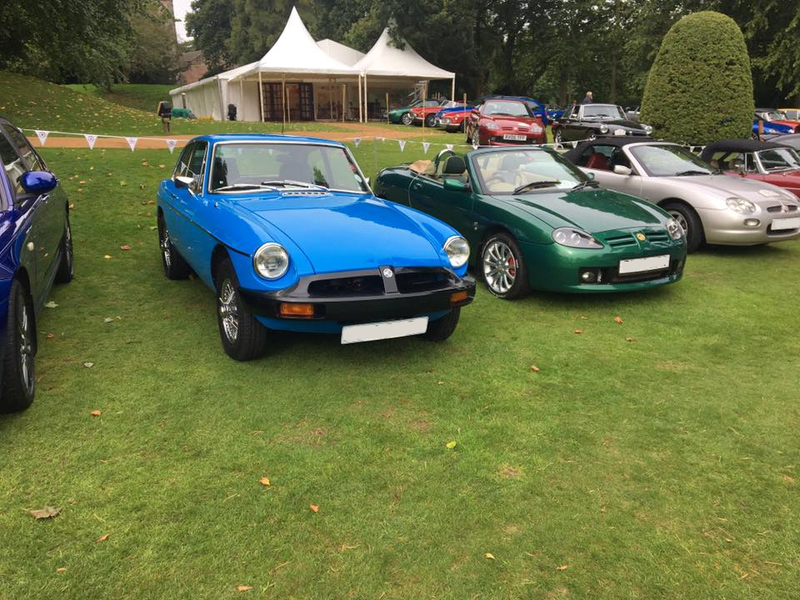 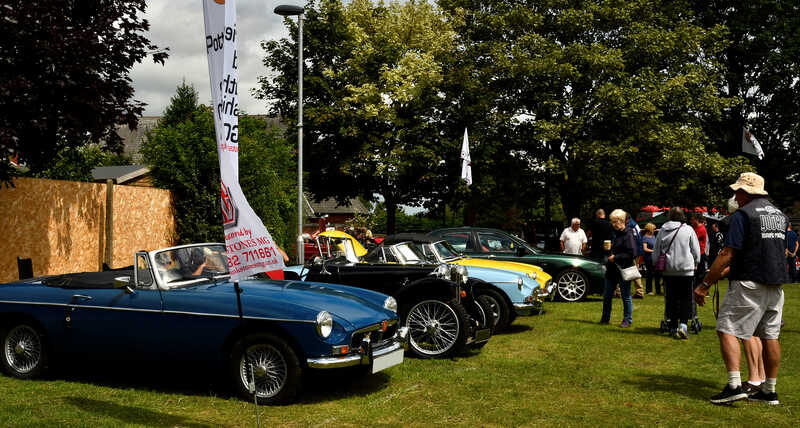 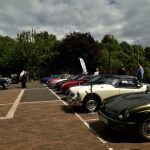 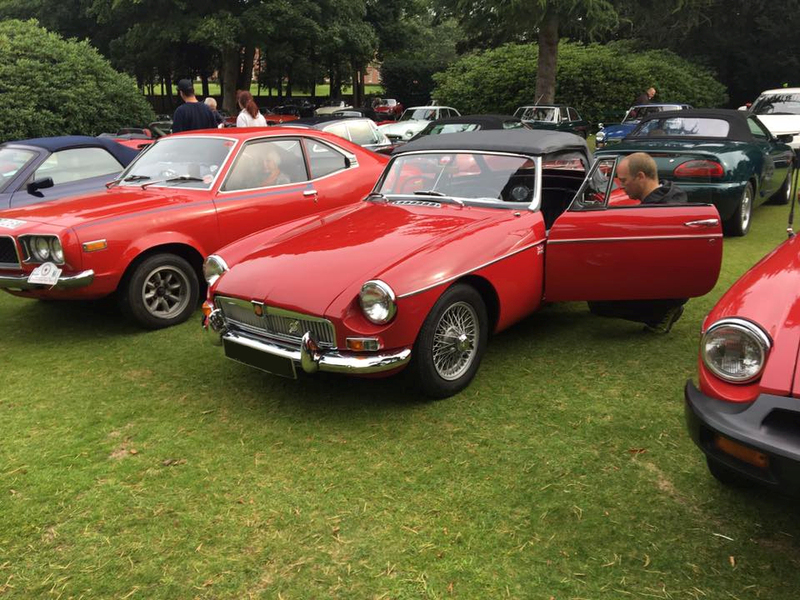 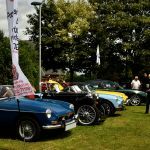 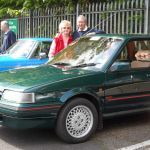 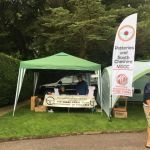 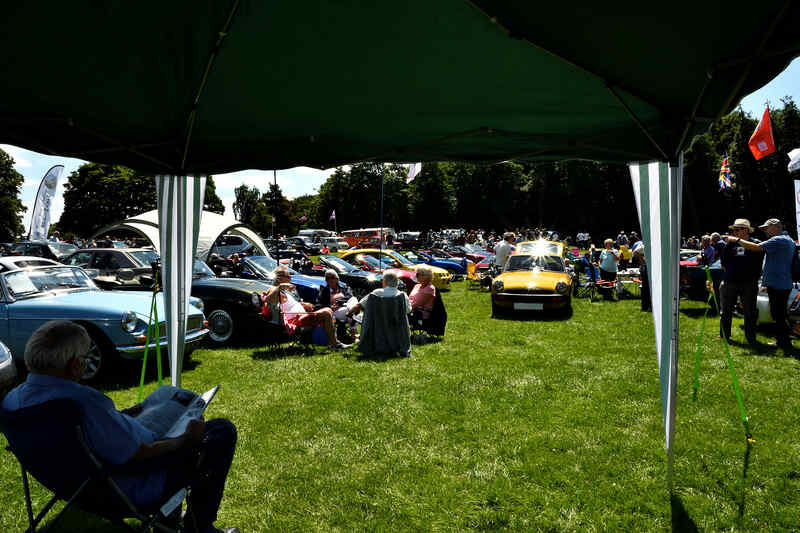 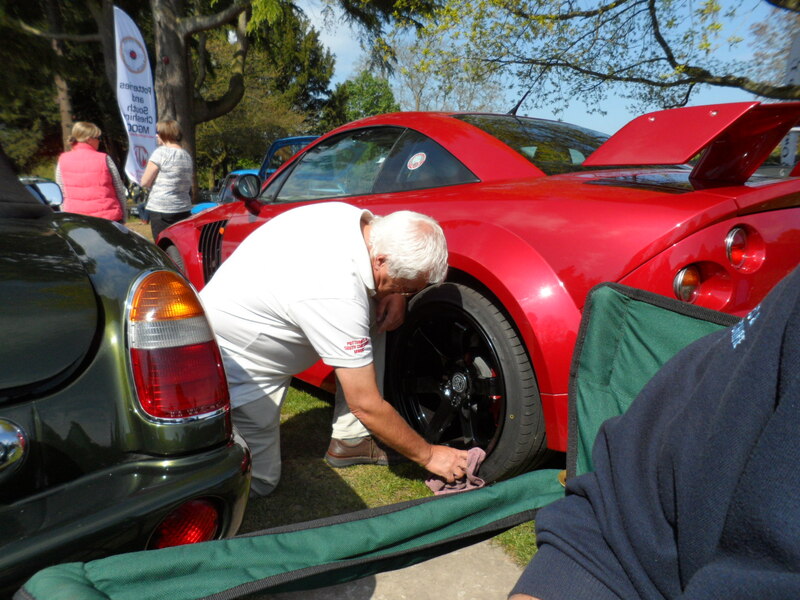 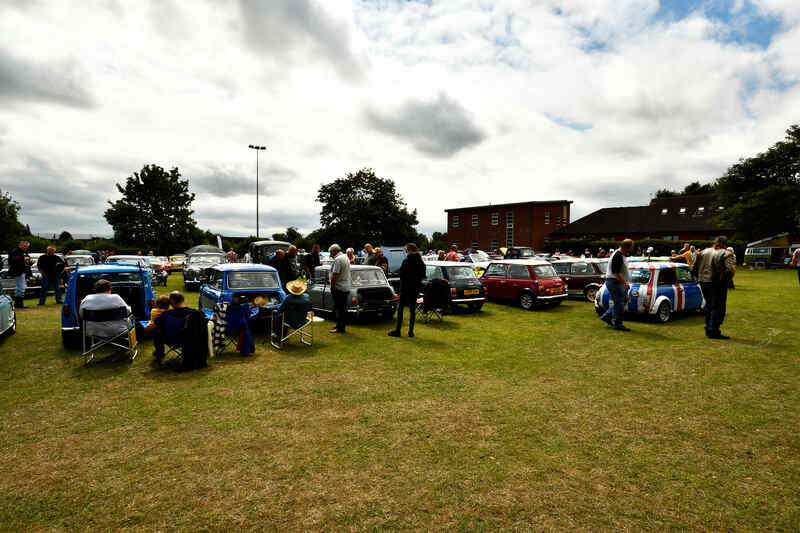 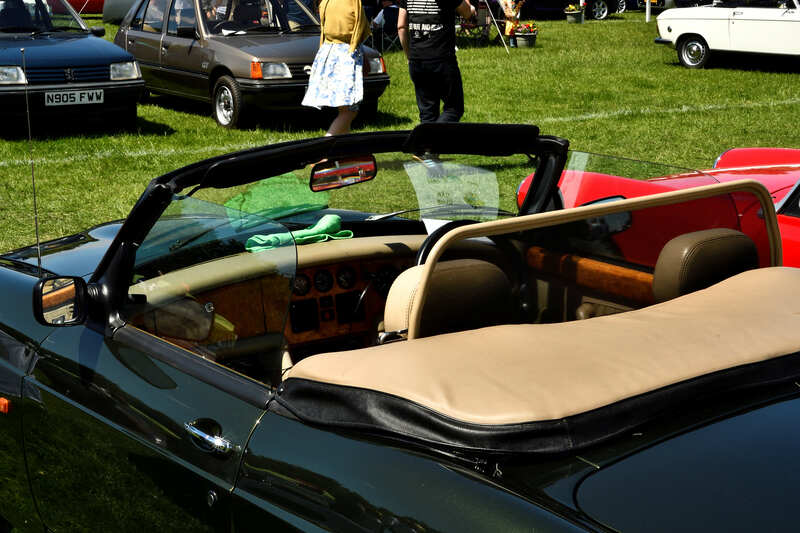 The club attended both the Saturday and Sunday of the High Legh Garden Centre Classic Car show. 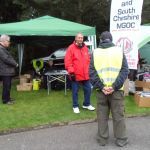 We also marshalled both days of the event and it’s fair to say some of our members looked quite stylish in their high viz tabards !!. 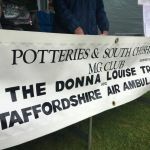 This free show is held by the Garden Centre for the benefit of Donna Louise Children’s Hospice, Staffordshire Air Ambulance and Blood Bikers charities donations for which were collected. 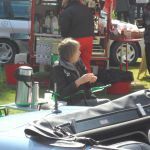 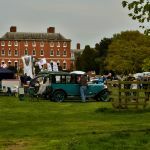 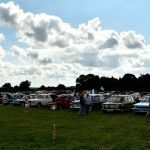 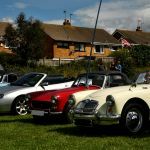 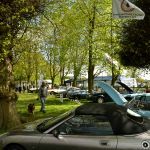 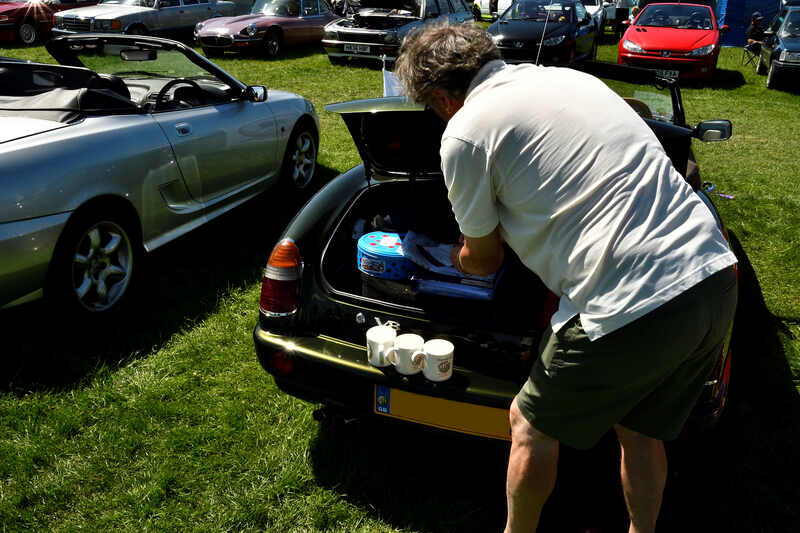 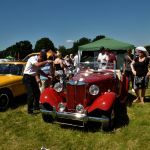 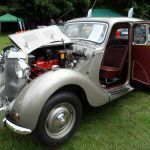 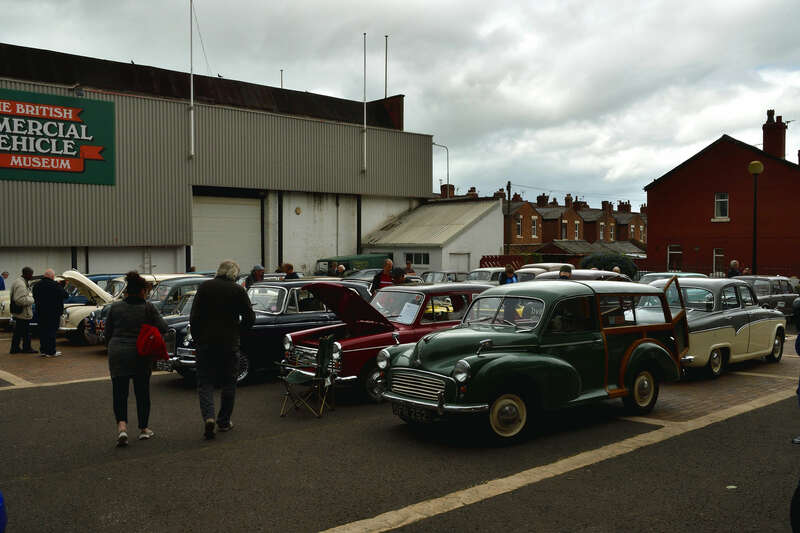 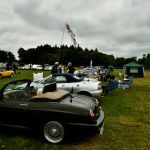 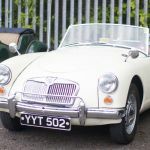 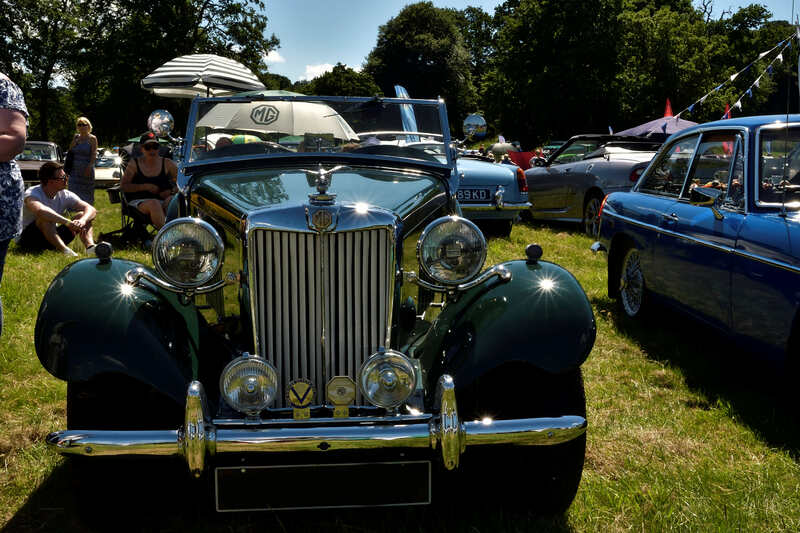 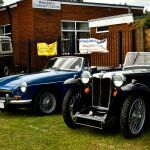 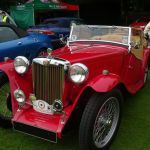 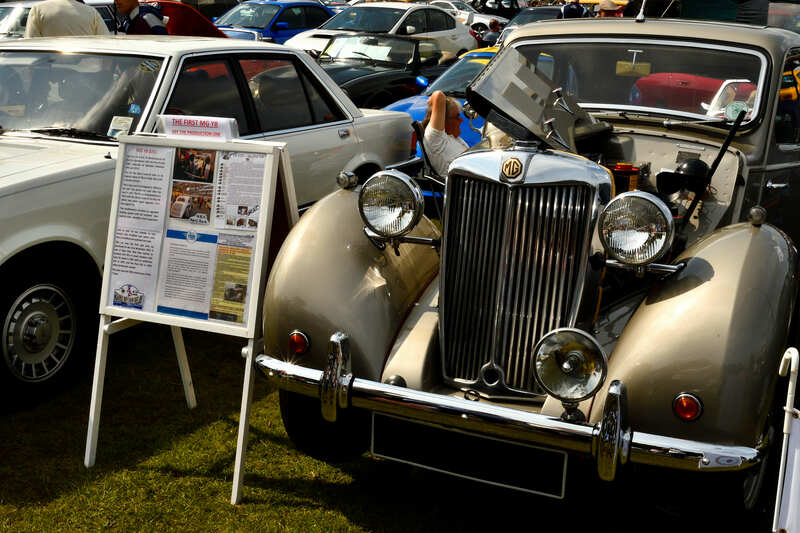 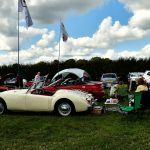 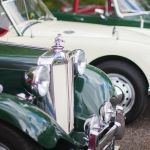 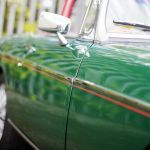 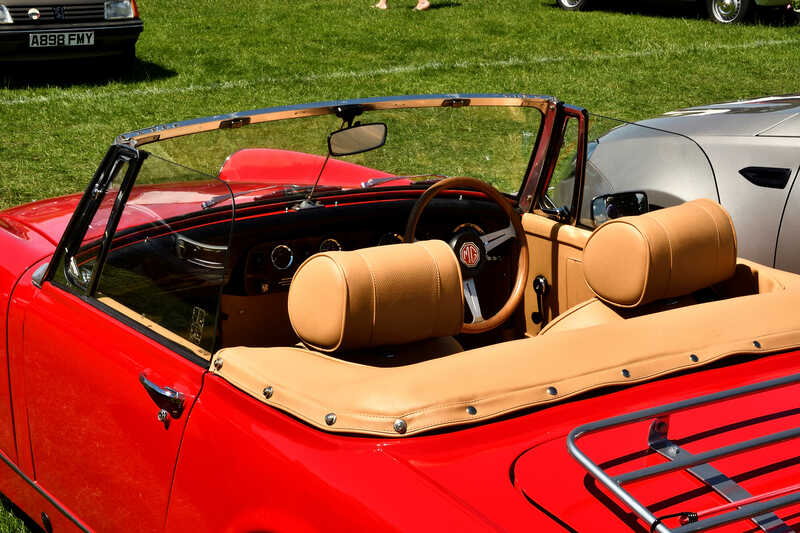 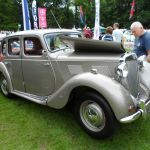 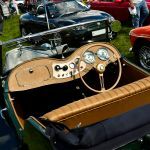 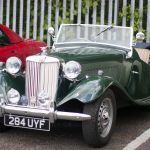 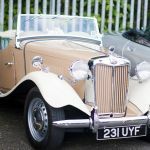 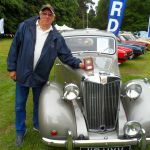 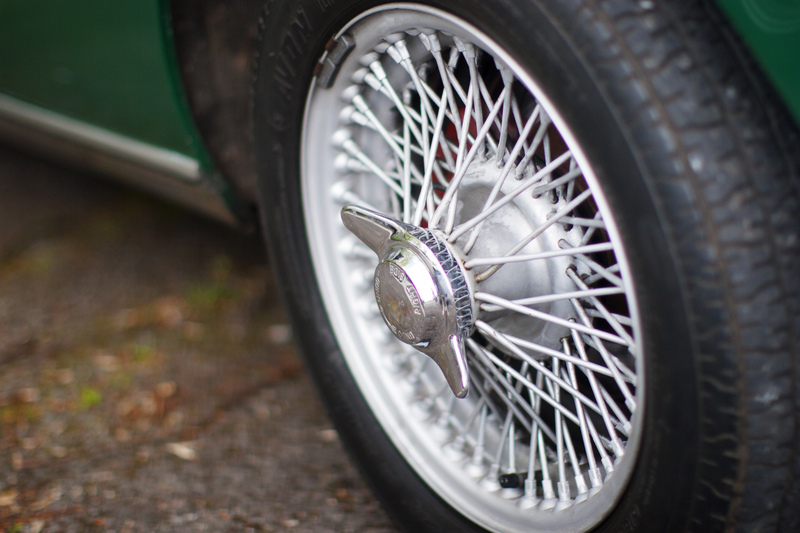 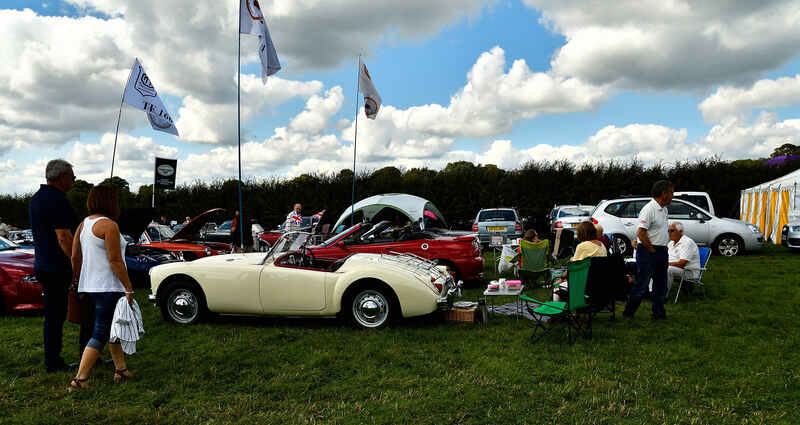 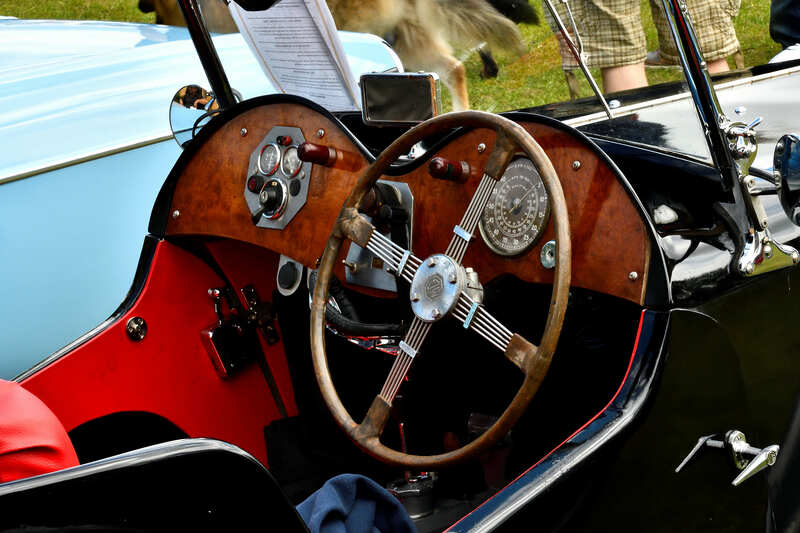 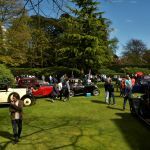 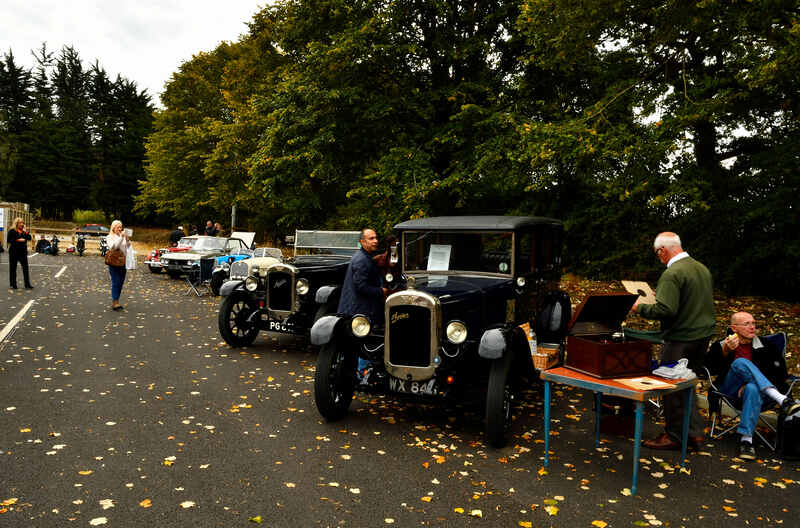 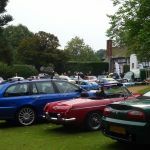 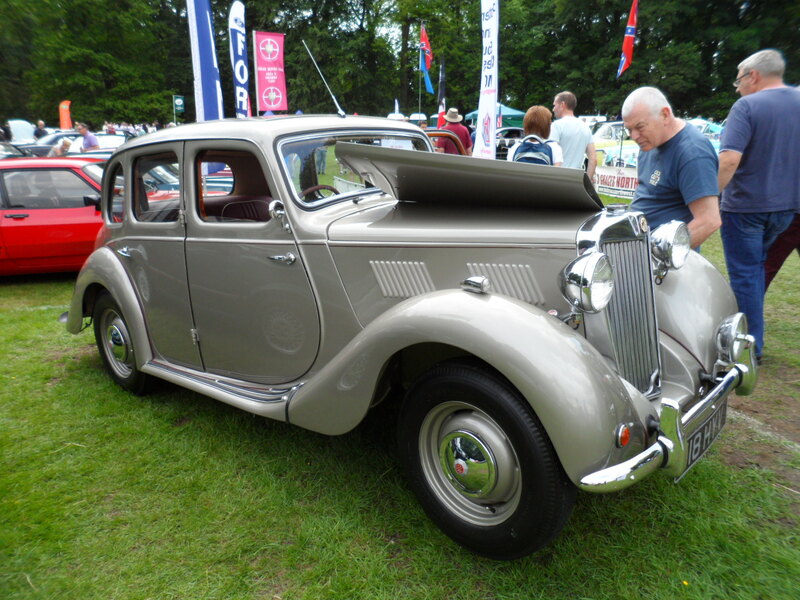 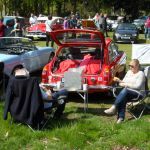 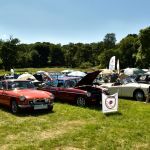 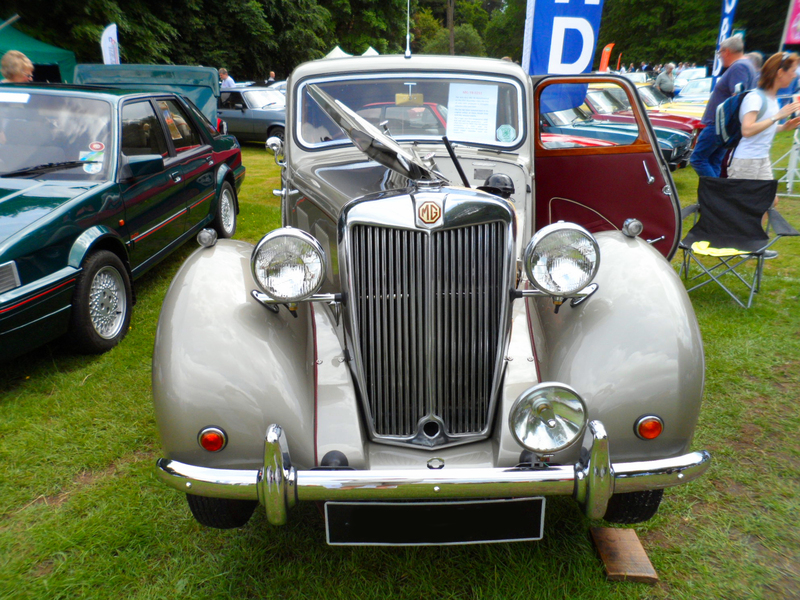 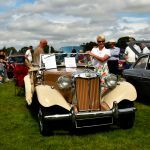 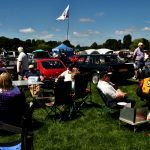 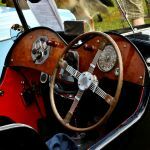 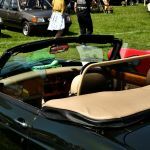 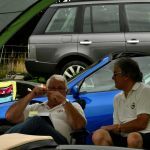 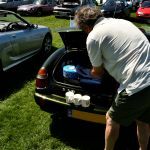 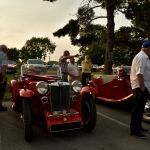 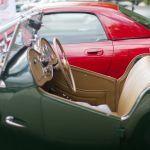 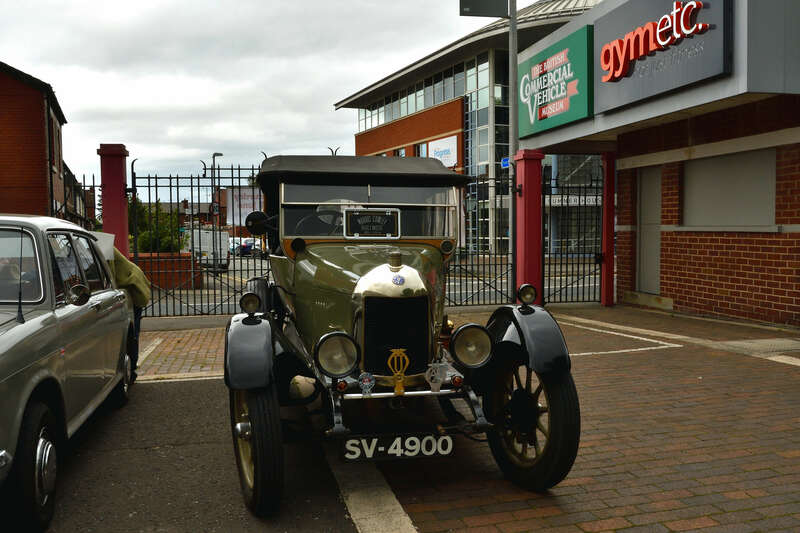 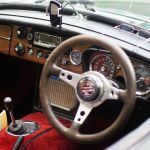 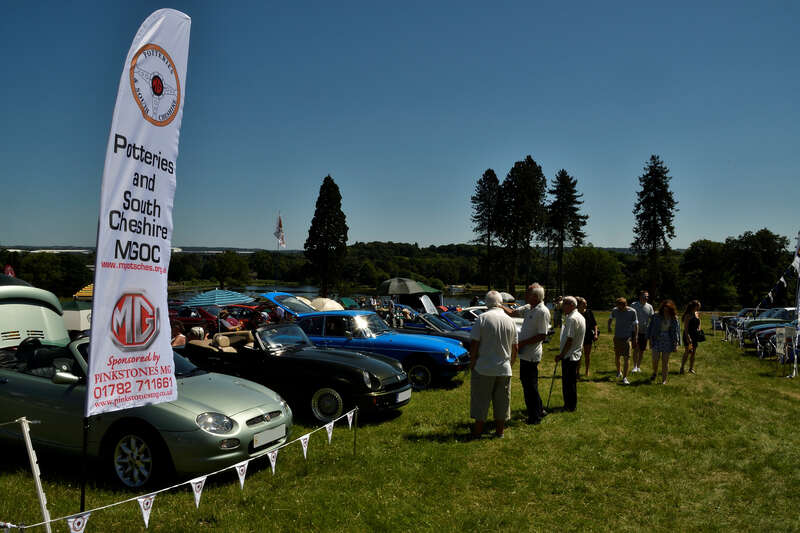 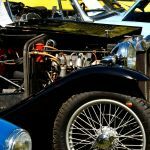 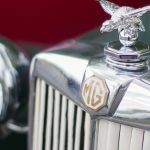 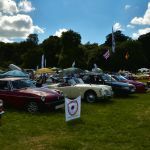 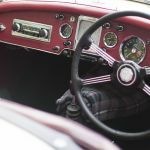 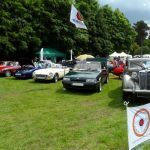 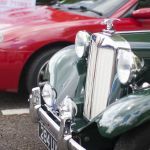 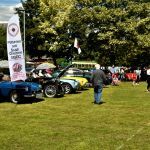 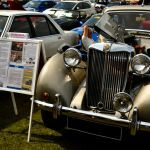 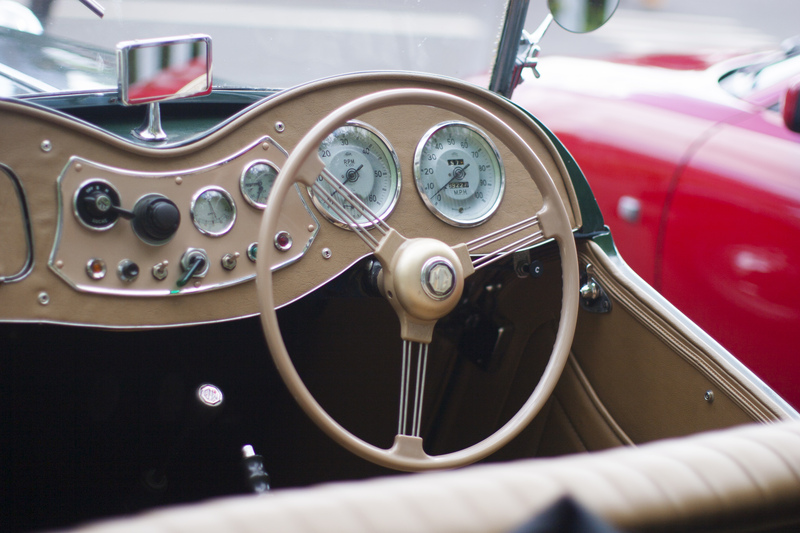 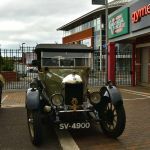 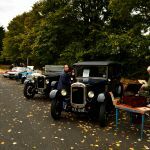 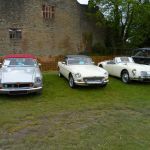 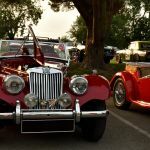 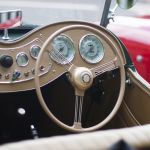 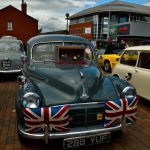 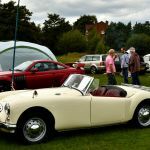 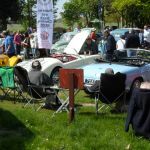 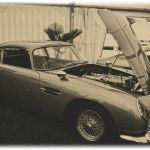 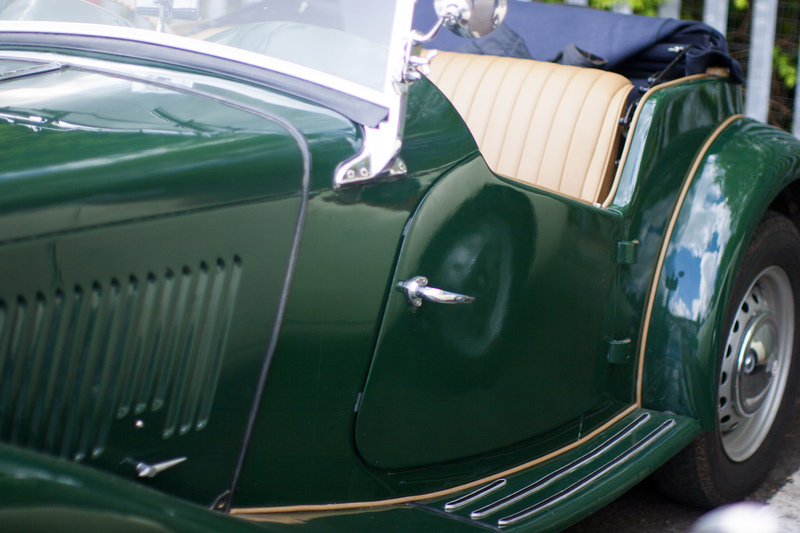 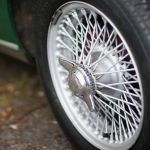 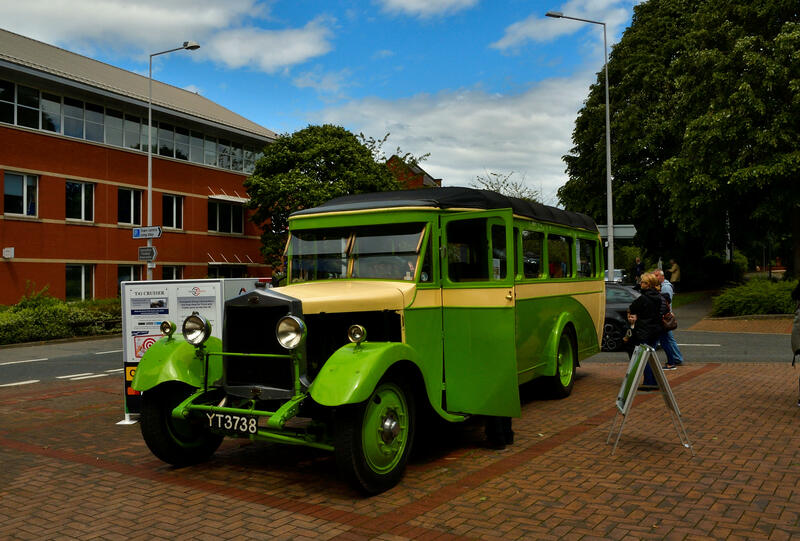 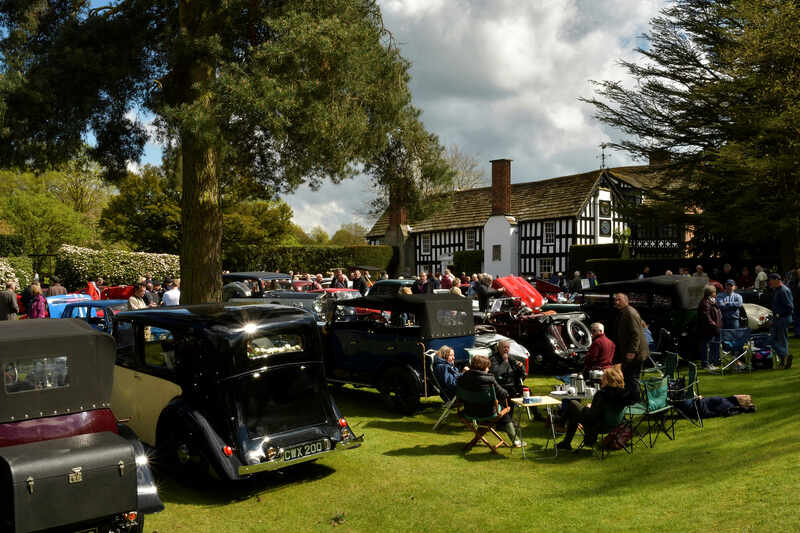 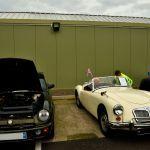 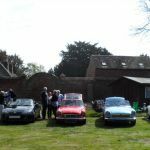 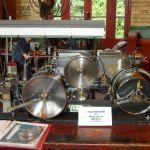 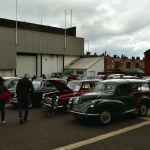 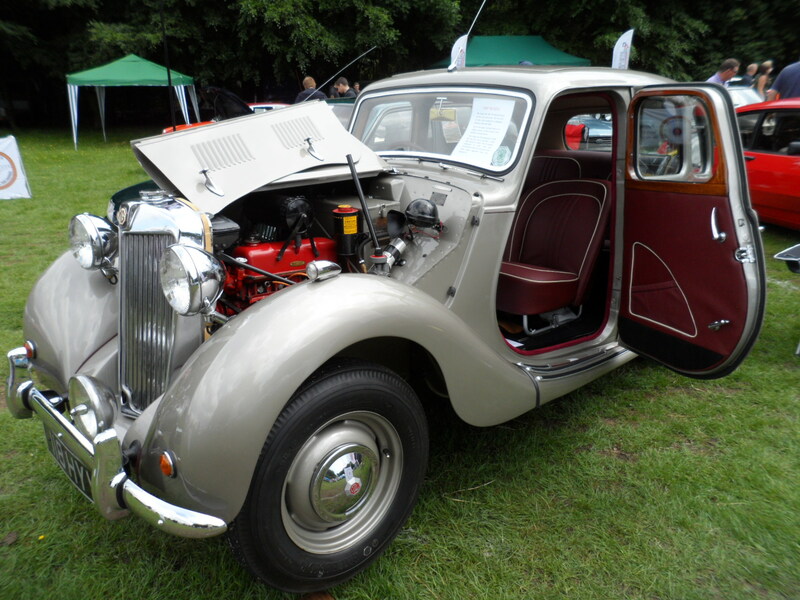 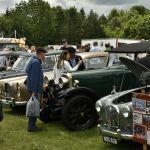 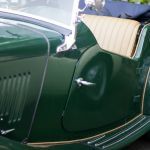 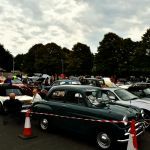 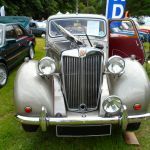 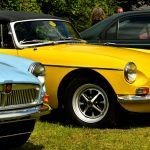 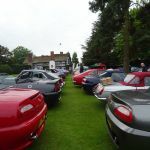 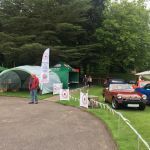 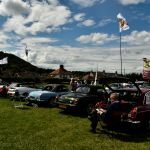 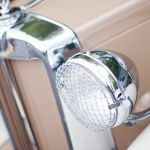 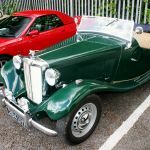 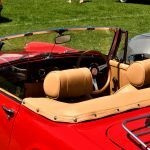 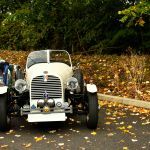 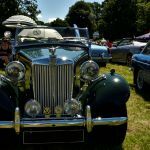 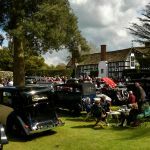 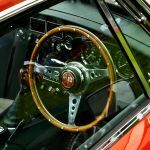 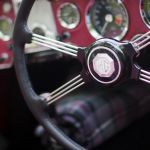 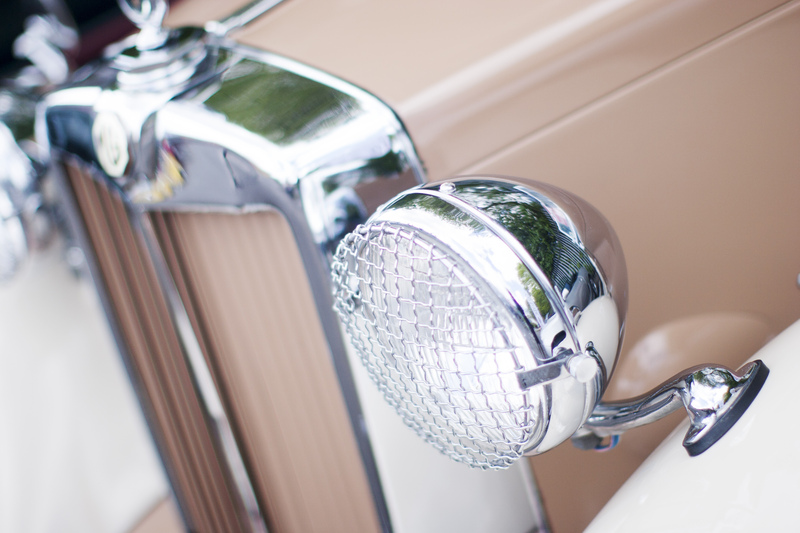 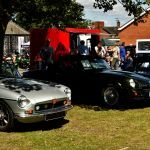 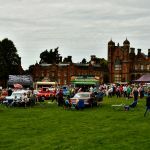 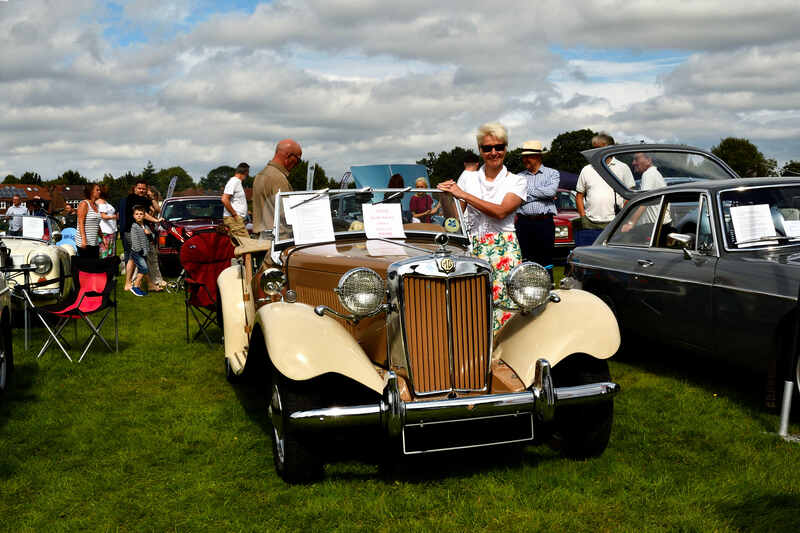 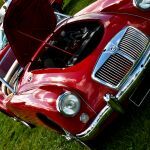 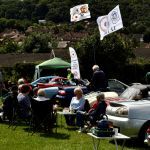 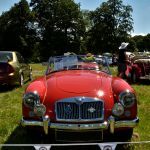 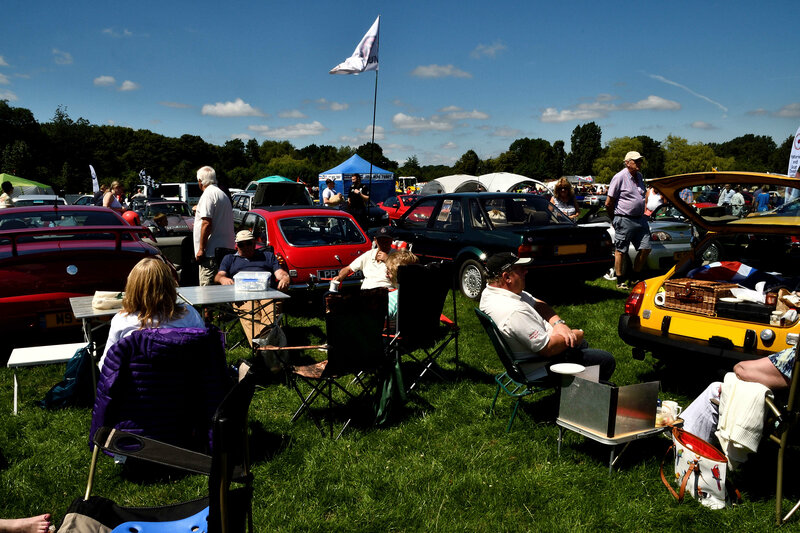 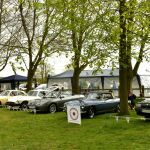 There was a superb range of classic cars on display, including some very rare vintage vehicles and a couple of the owners even had old style gramophone players to add to the atmosphere. 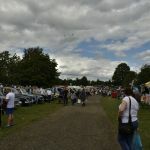 The weather was fine and warm over both days and It was very busy with visitors over both the days, in particular the Sunday, with people being very generous with donations to the charities. 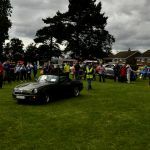 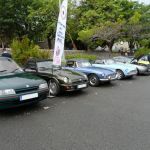 It was also fantastic to see so many enthusiasts turning out in their pride and joys for this charitable event with over ninety vehicles on display in fact so many turned up additional parking areas had to be found. 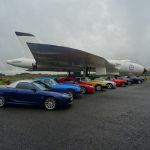 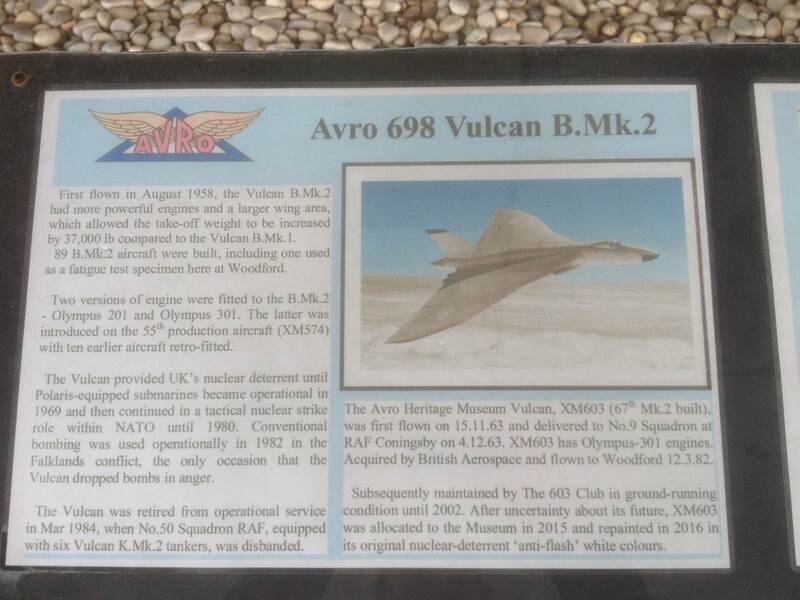 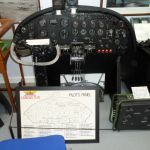 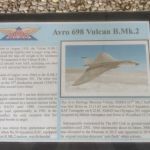 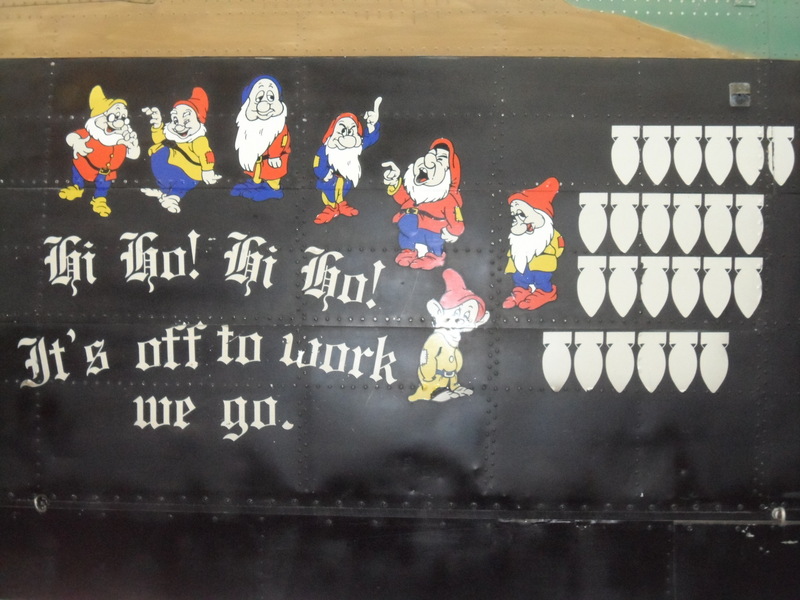 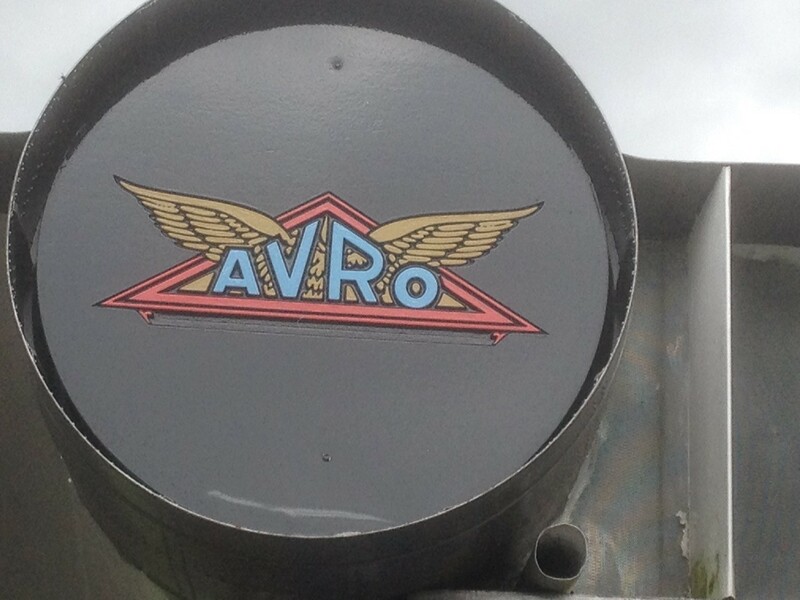 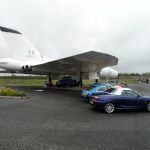 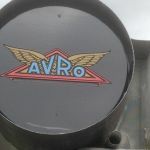 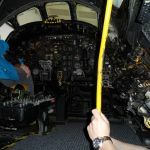 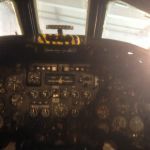 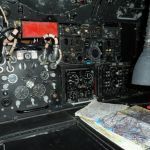 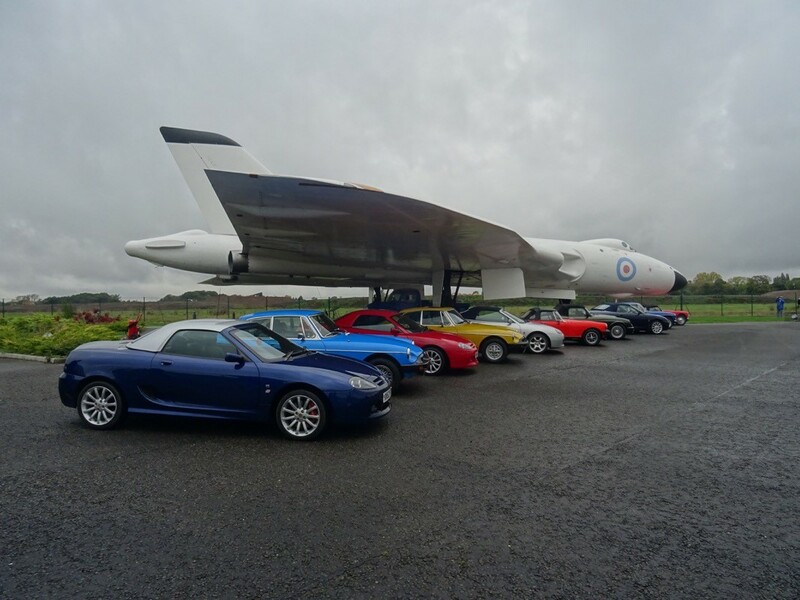 The Avro museum has been going for 3 – 4 years, one of the places that is on your doorstep that you don’t hear of – but we have now – not perhaps one of the biggest places but absolutely packed with memorabilia – and of course the crowning glory, parked outside a whopping great AVRO Vulcan, which we were allowed to park under the wing for a photo shoot. 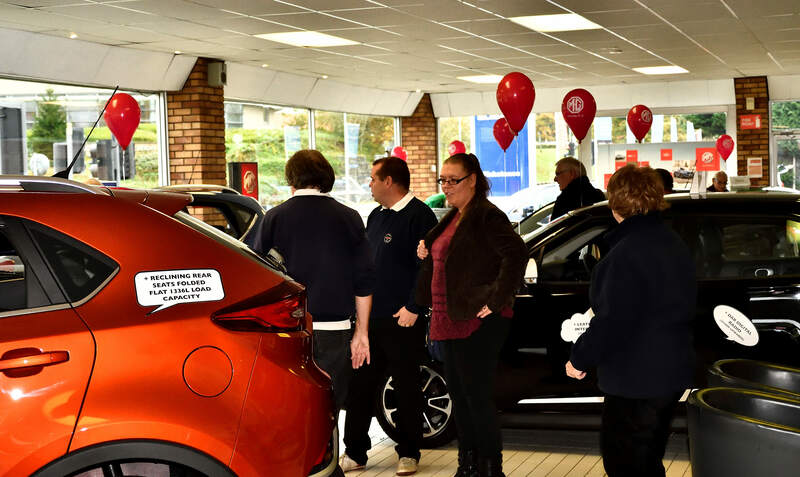 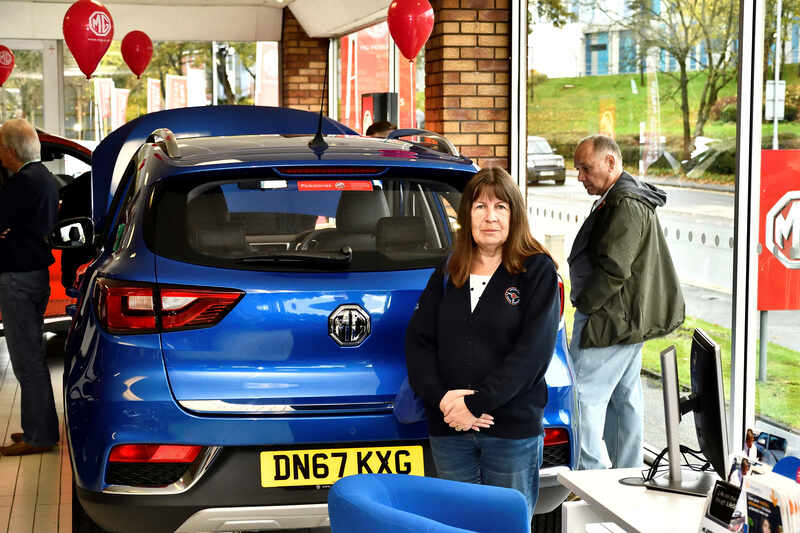 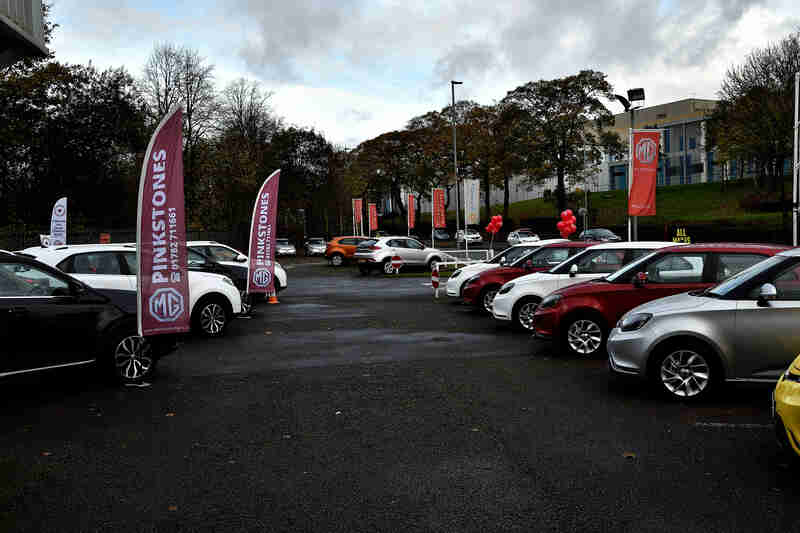 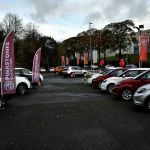 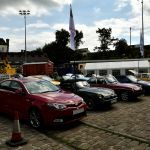 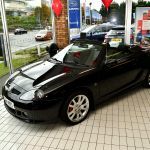 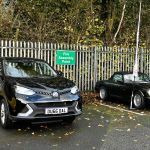 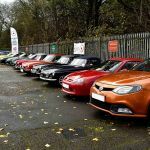 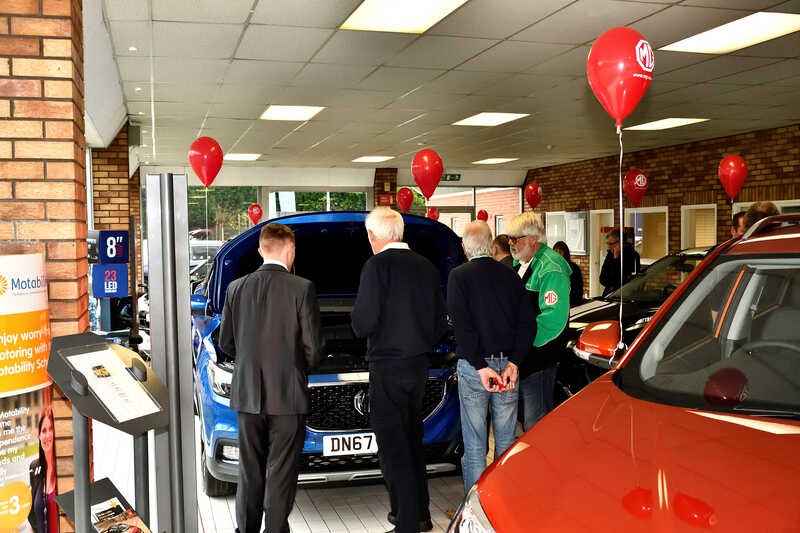 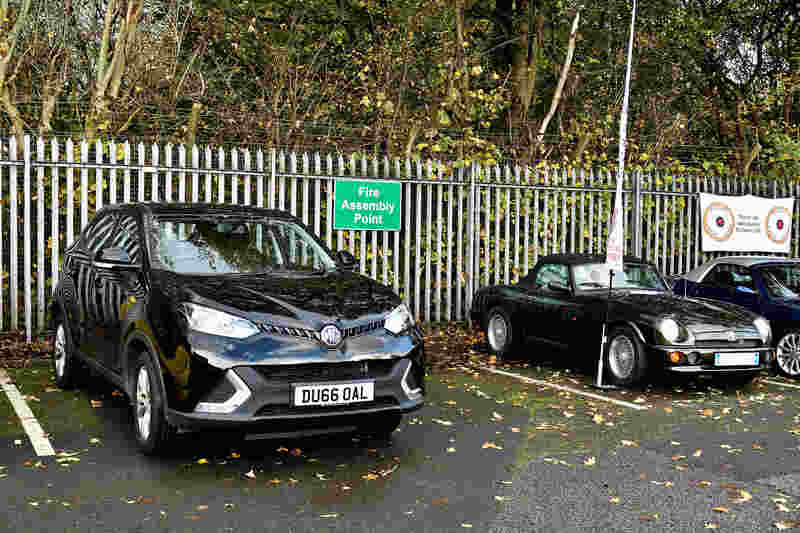 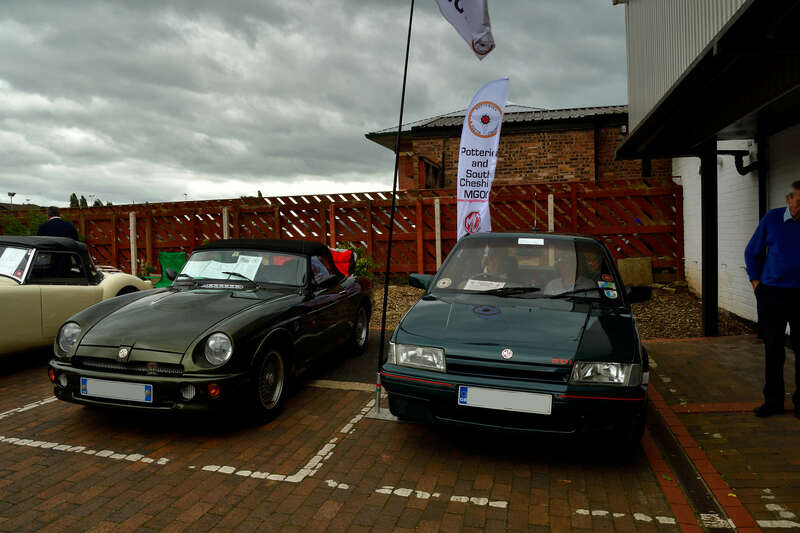 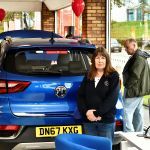 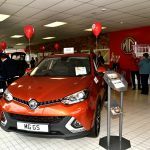 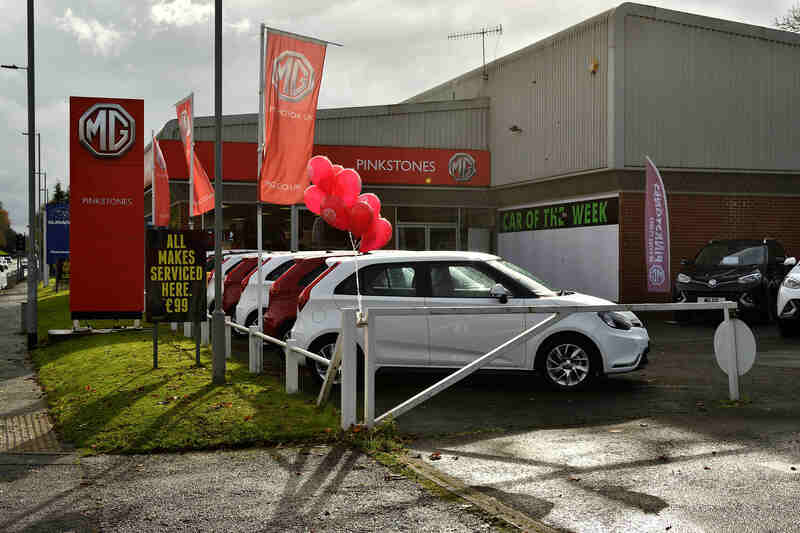 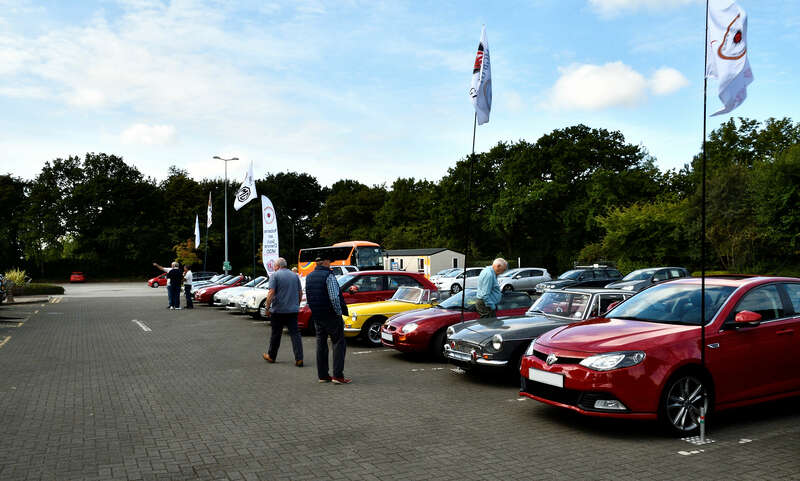 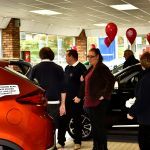 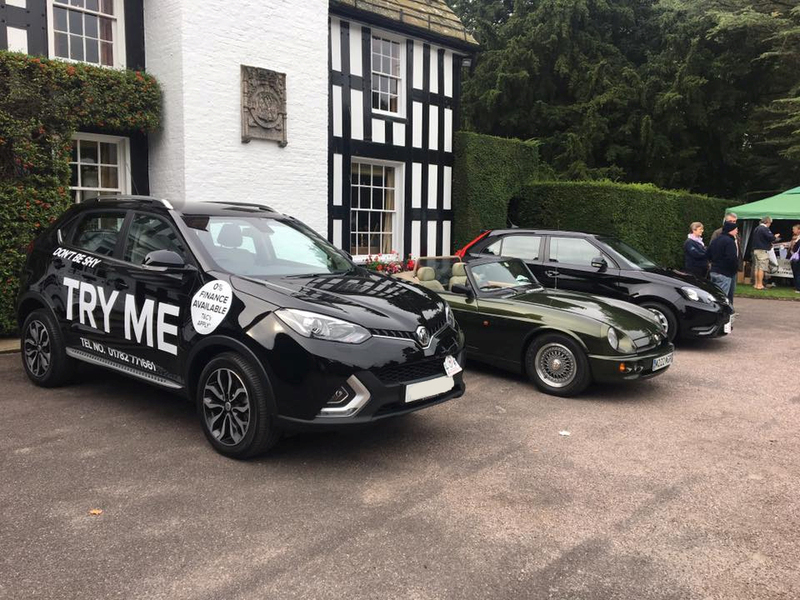 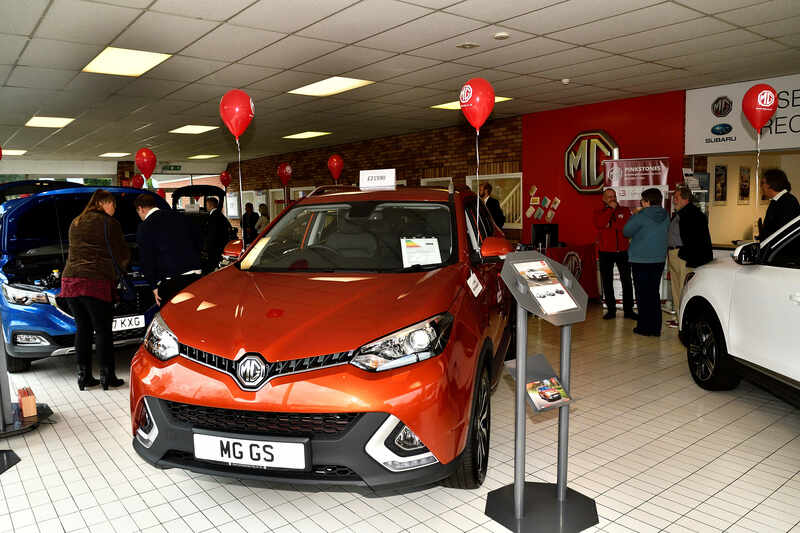 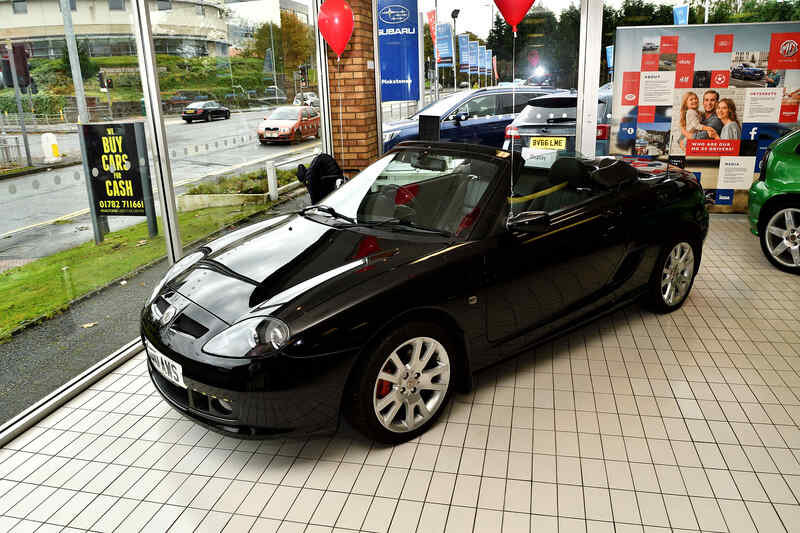 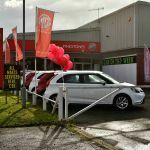 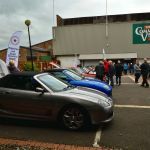 The club put on a small display at Pinkstones in Stoke on Trent on Saturday 4th November to celebrate the launch of the impressive new MG XS , it was also a great social event to meet potential customers and look over the new MG models. 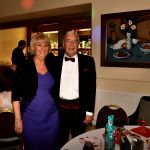 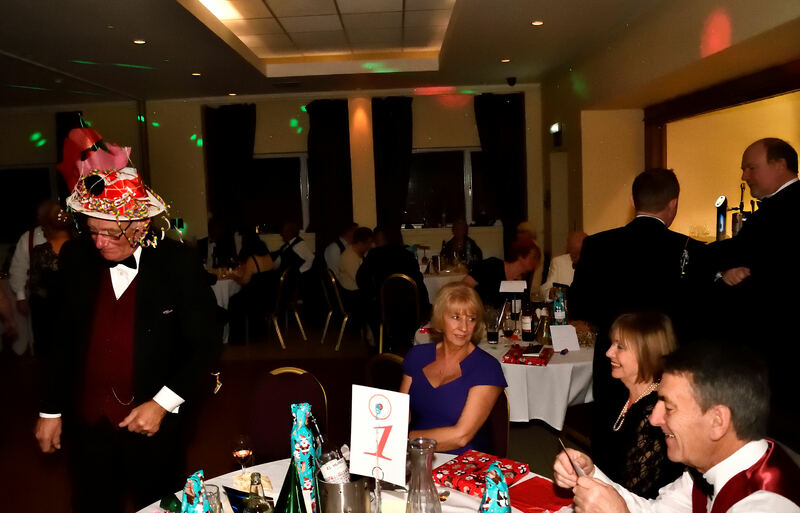 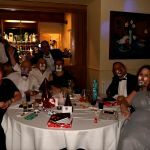 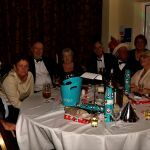 Once again we celebrated Christmas and the end of another great season with our annual Christmas Party at the Chimney House Hotel, it was a good night with great food, music and an opportunity for everybody to relax and enjoy themselves. 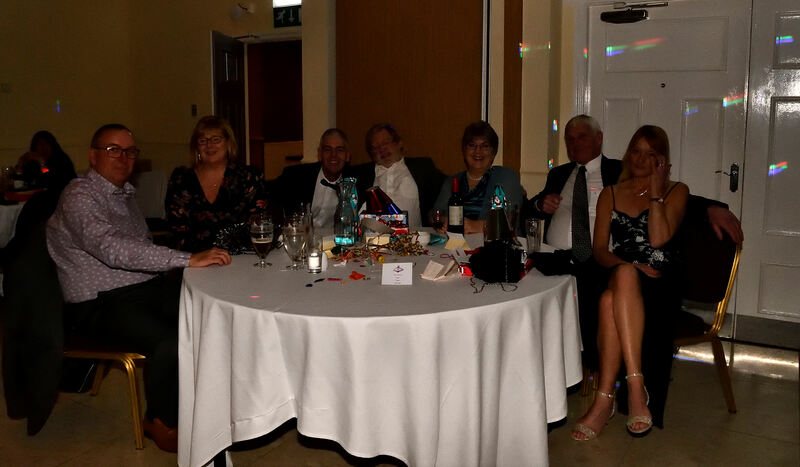 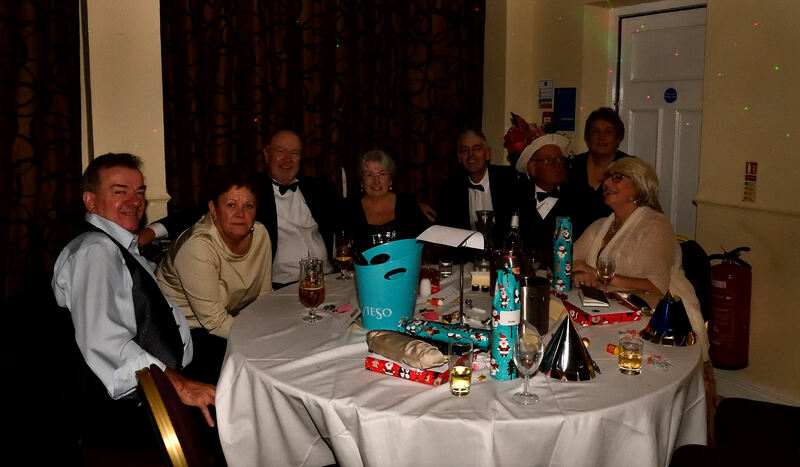 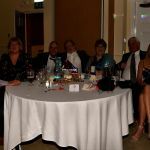 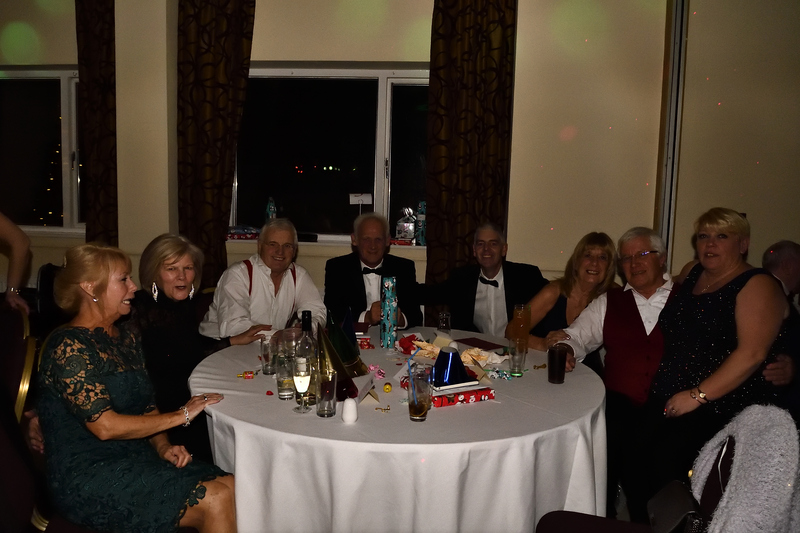 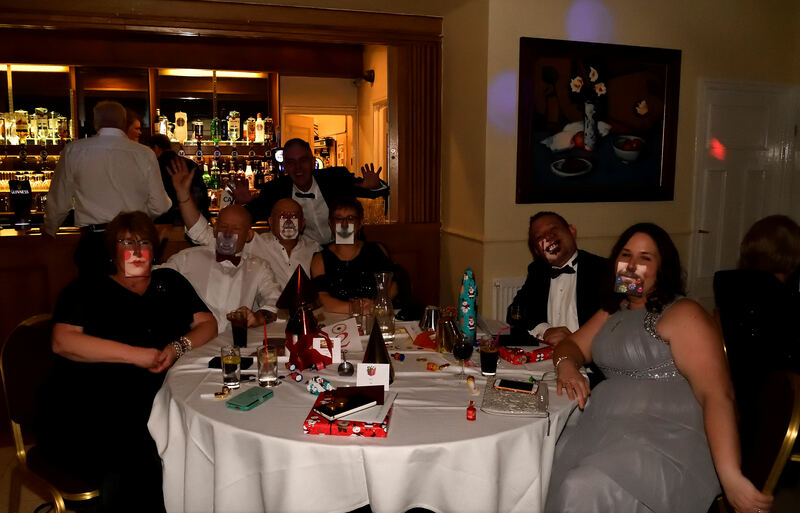 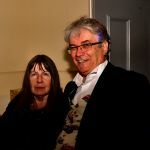 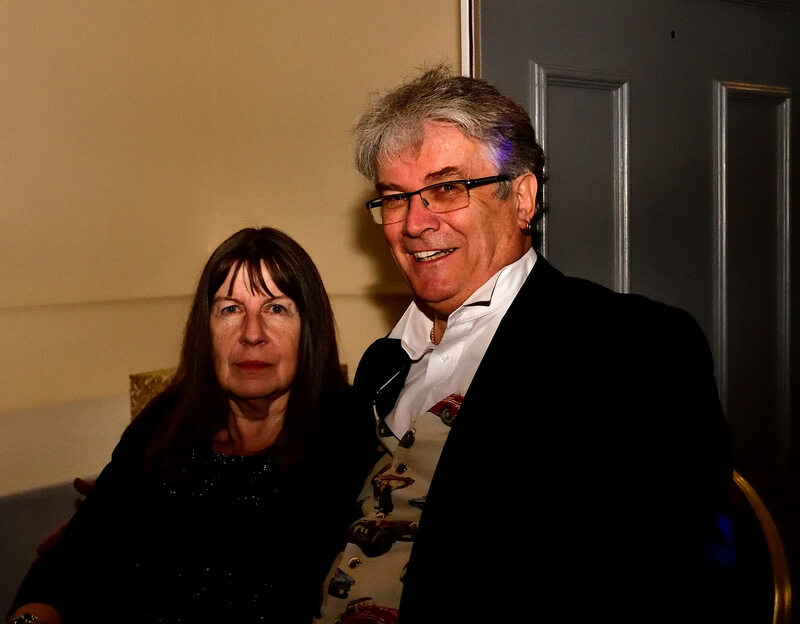 As the ` webmaster ` who runs the club website I would to on behalf of myself and all the club members thank Bob, Maggs and all of the steering club both for the Christmas Party and all the effort they put into the club and events which goes to making it such a great club. 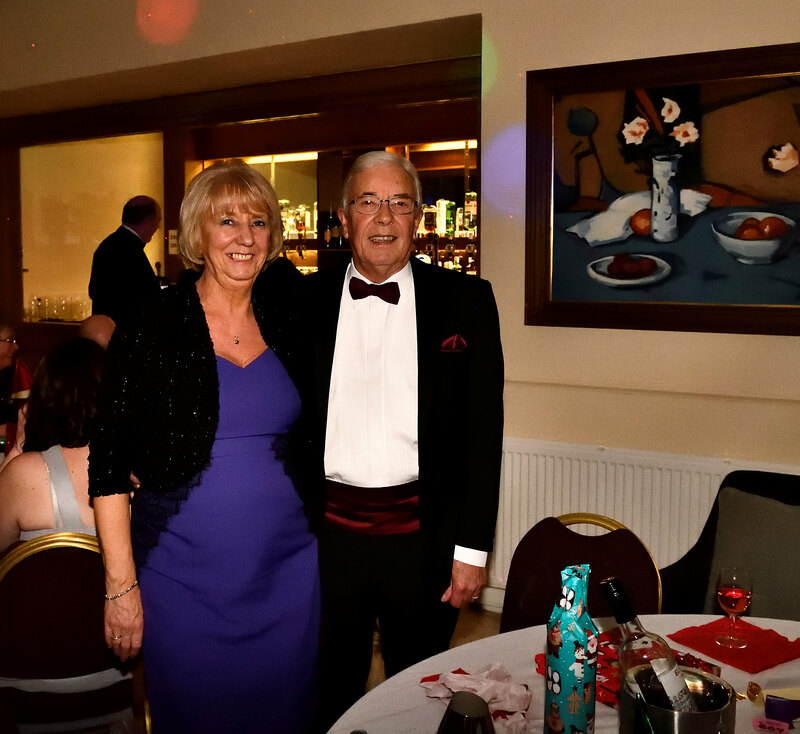 I would also like to wish everyone and Merry Christmas and a Happy New Year.